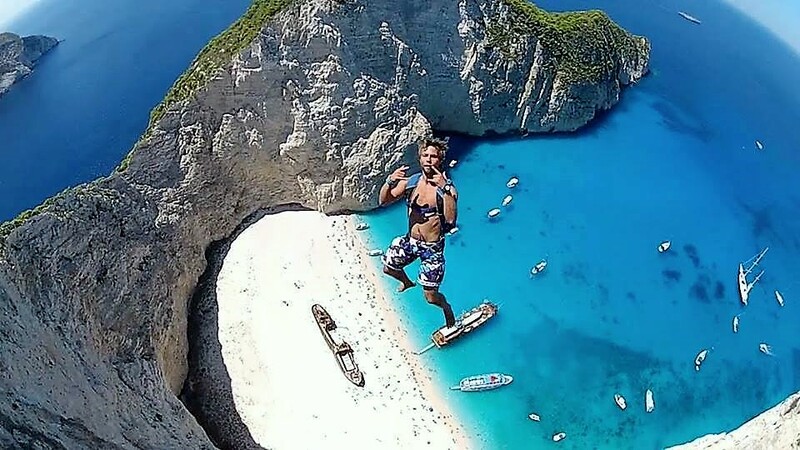 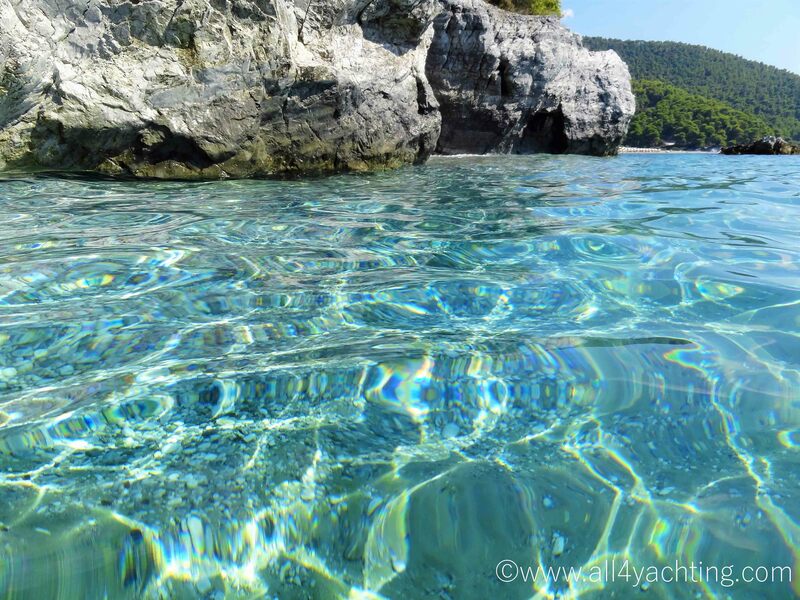 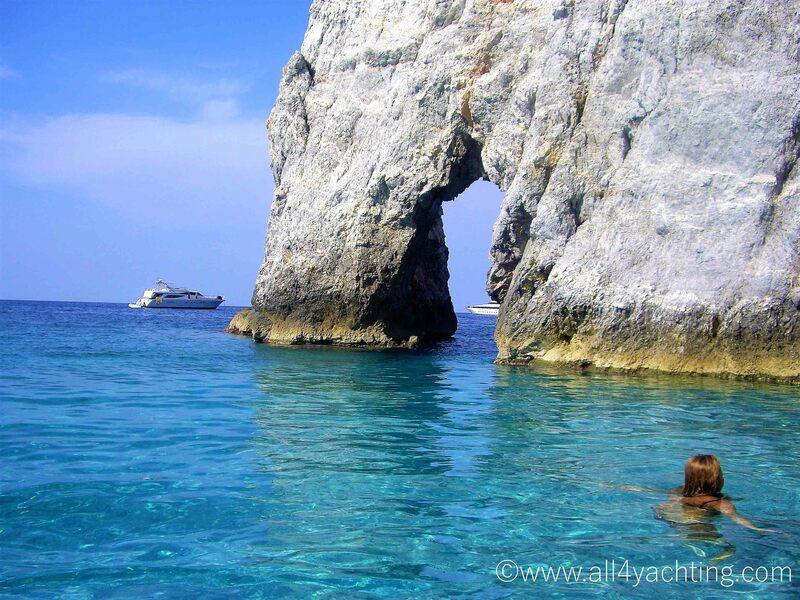 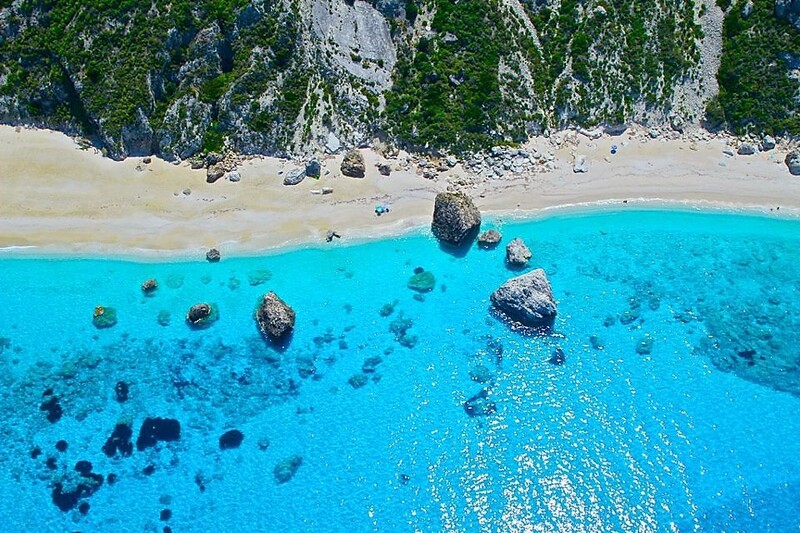 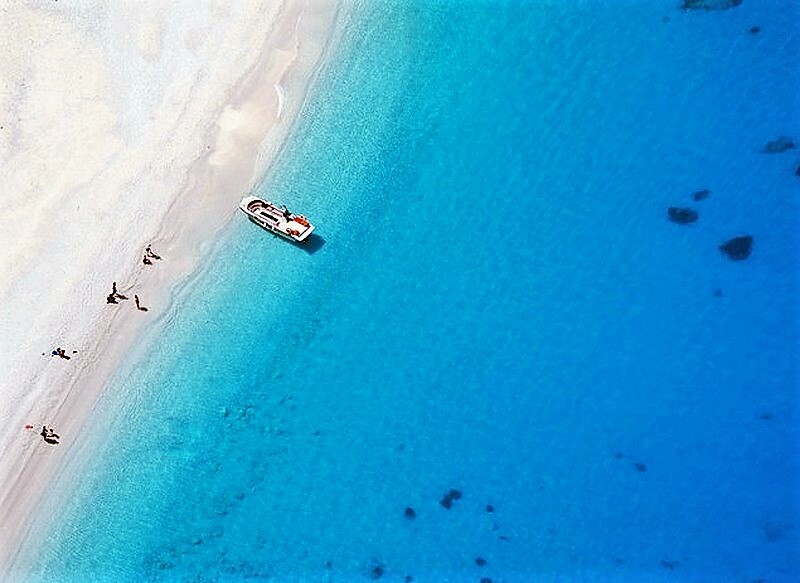 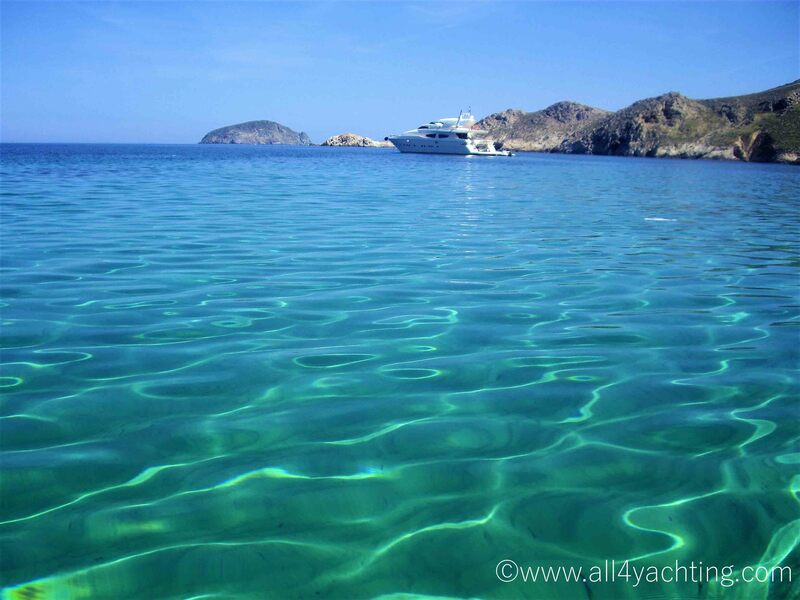 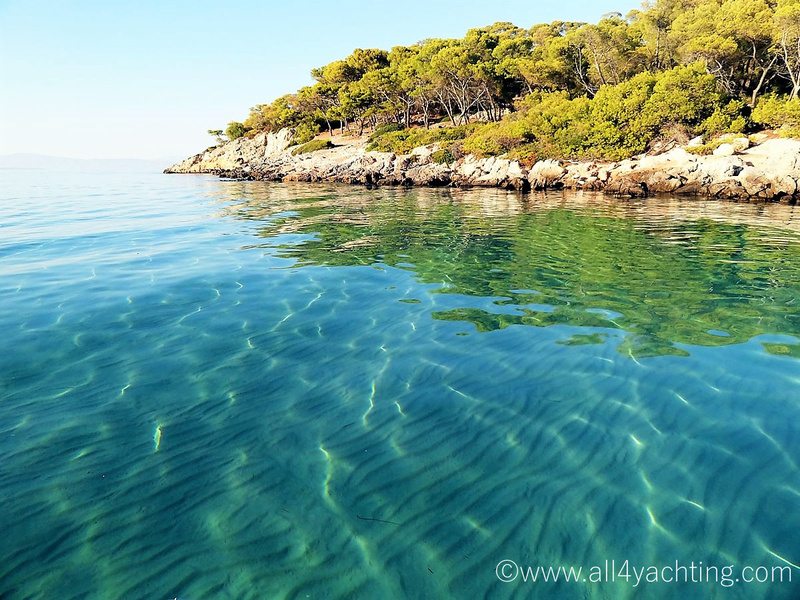 Greece is the ultimate destination for Yachting Holidays due it’s countless unique characteristics like the extensive coastline of 16.500 km, the 6.000 islands, the unique weather conditions, the amazing culture and history, the Mediterranean Cuisine and many more. 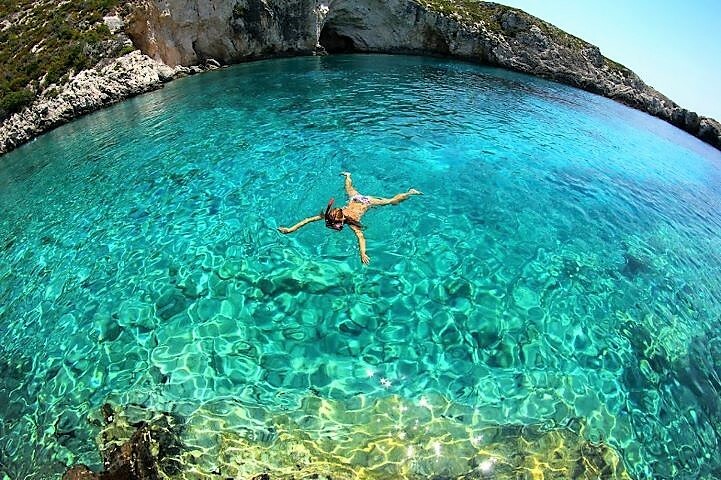 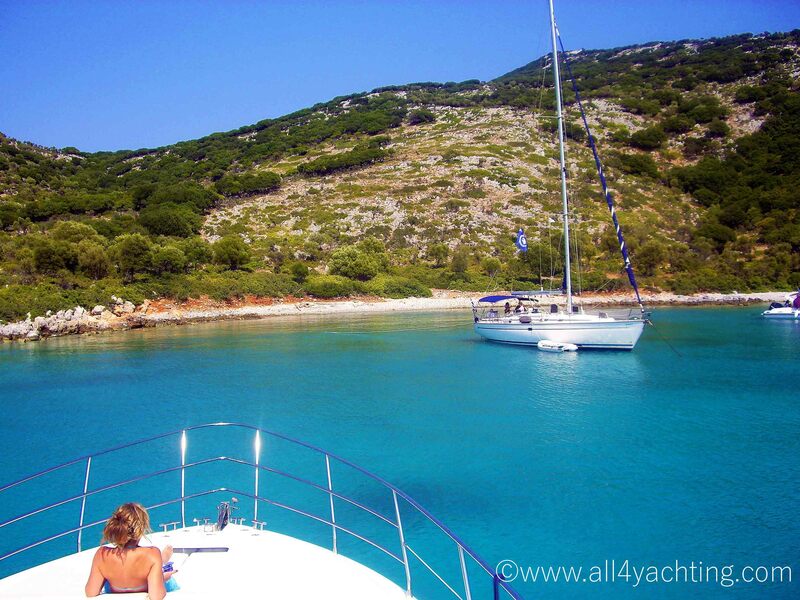 Yacht charter in Greece is a prime choice in the Mediterranean not only due to its profusion of islands but also for other reasons like. 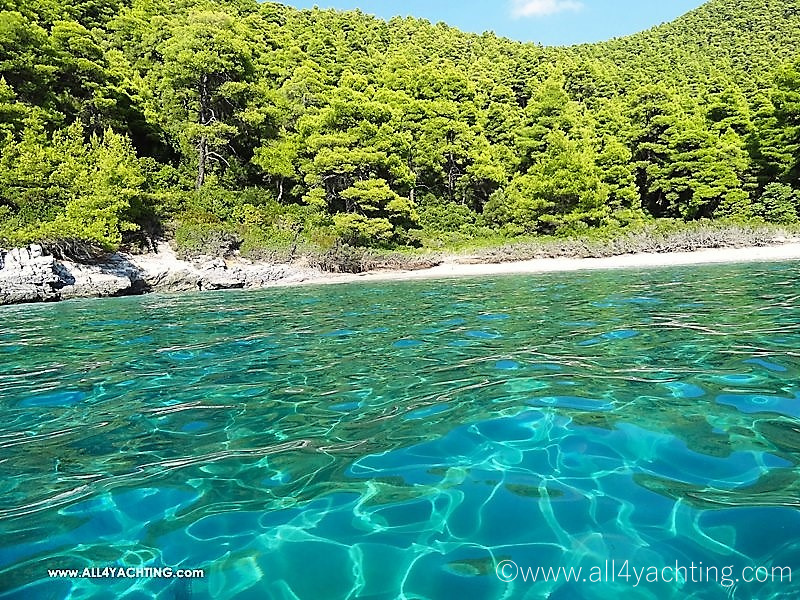 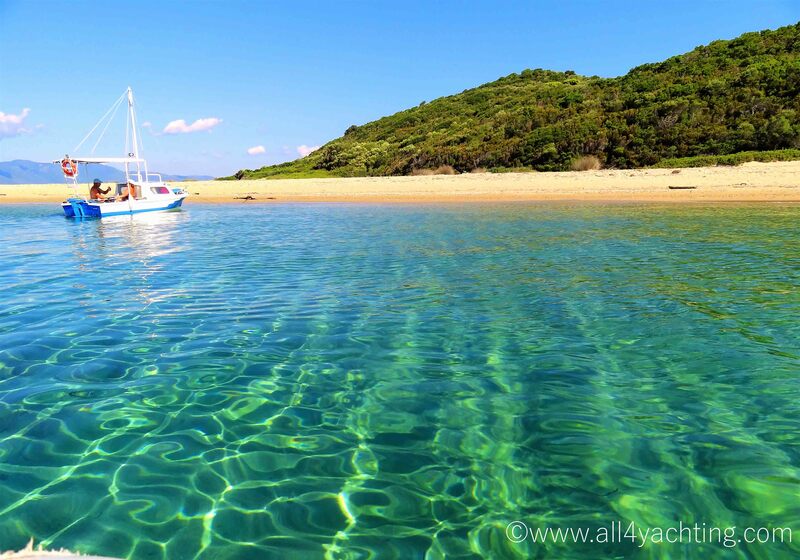 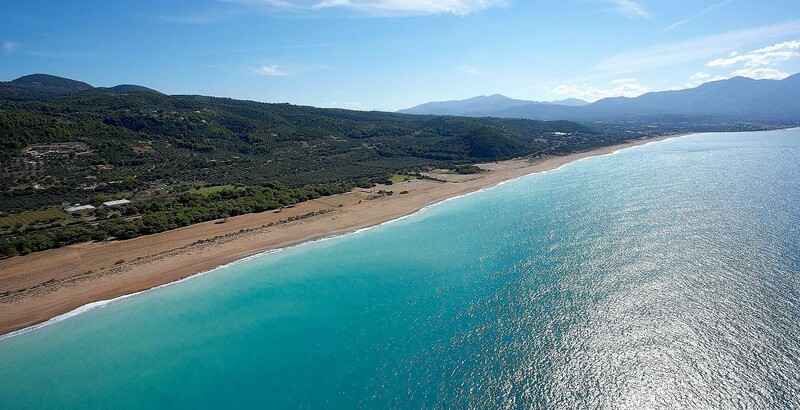 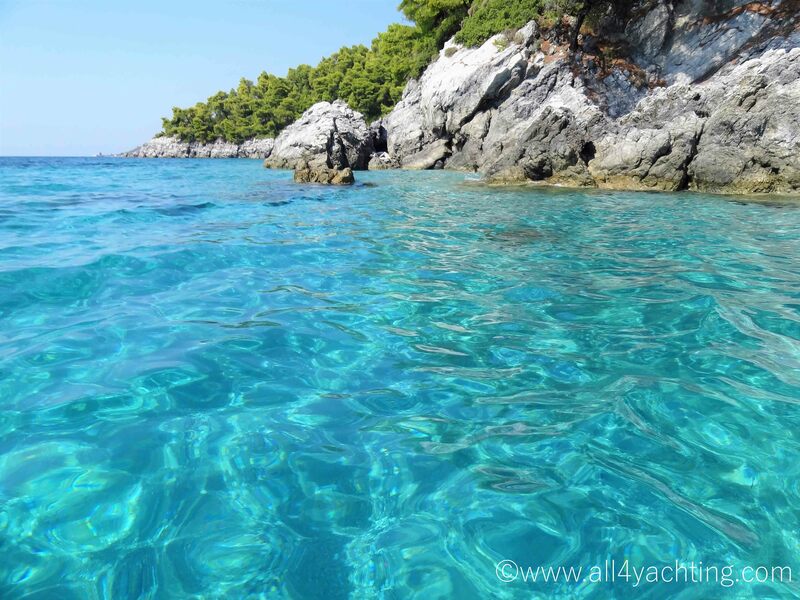 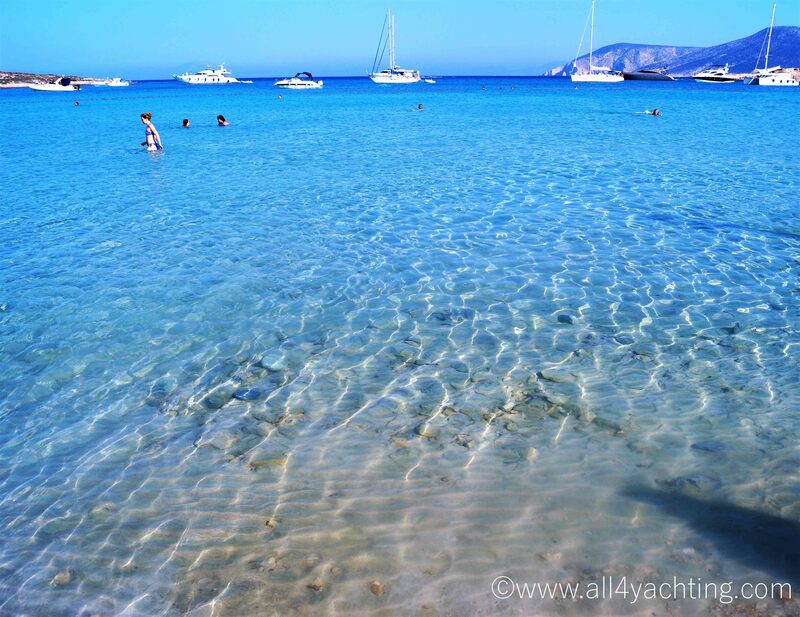 Sailing conditions One of the great things about Greece is that its waters offer a variety of sailing conditions, with steady, gentle breezes that are ideal for those seeking a quite and relaxing vacation and stronger winds that will challenge intermediate and advanced sailors. 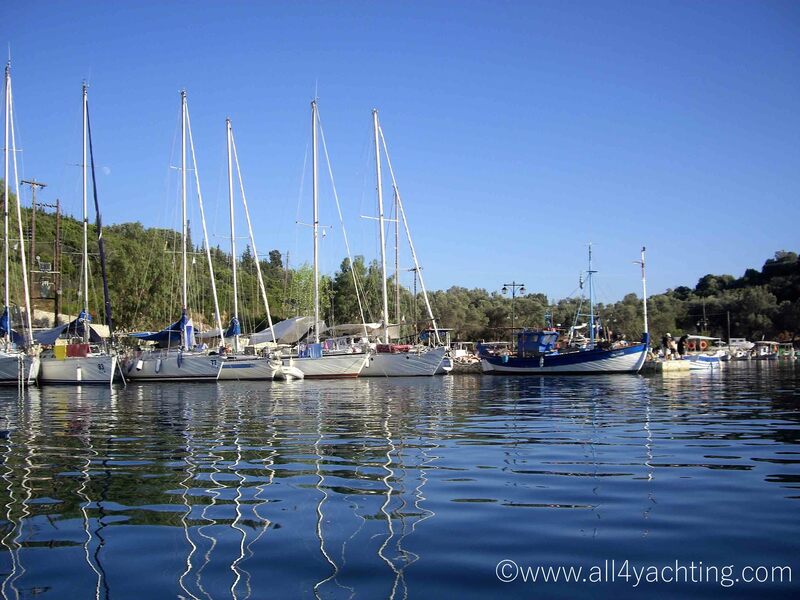 Weather Just as important as the sailing conditions is the weather, with reliable winds obviously essential. 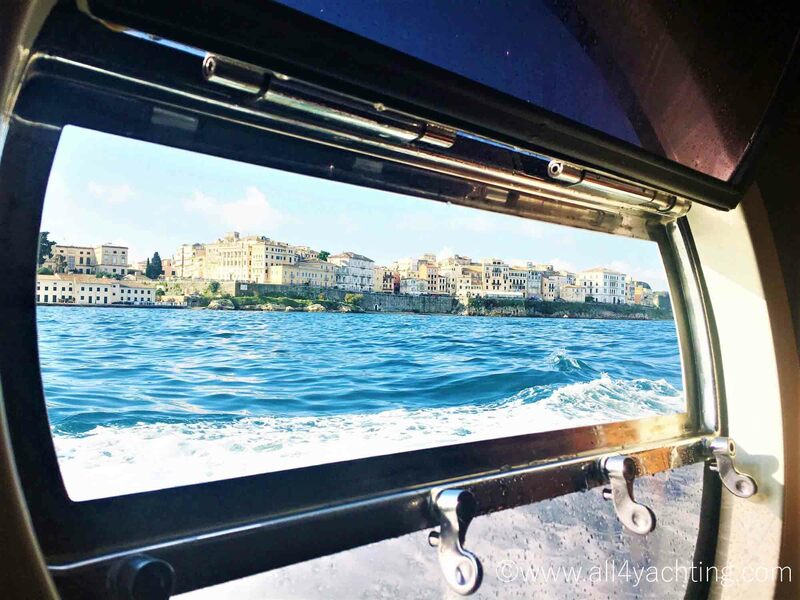 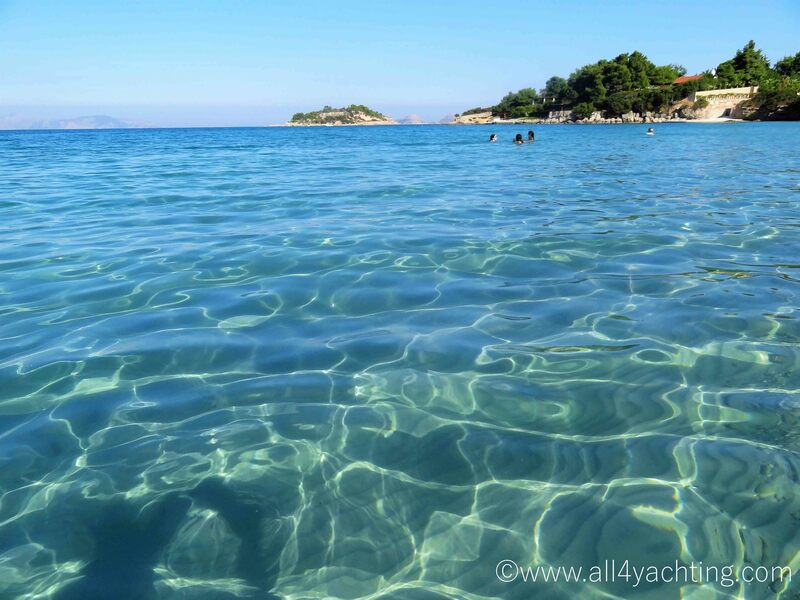 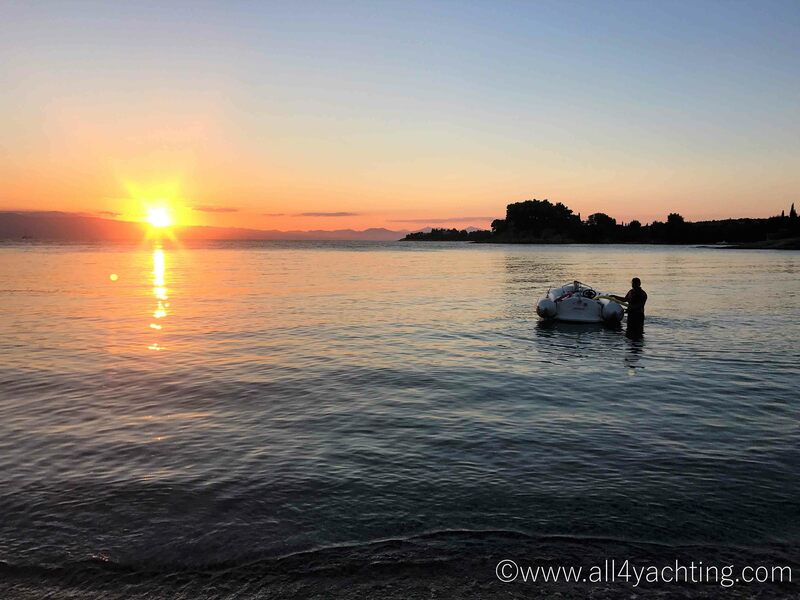 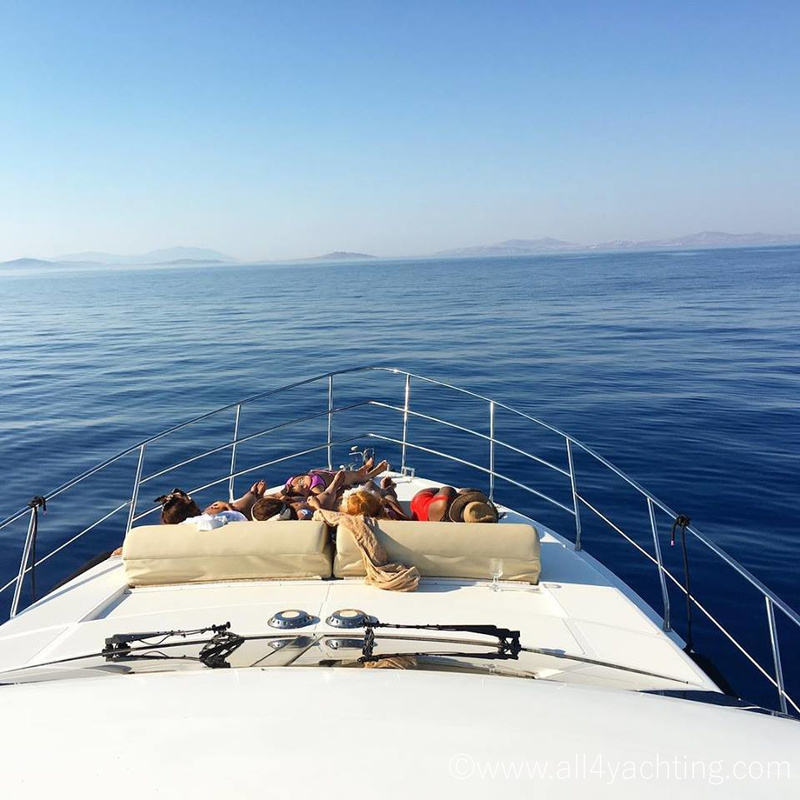 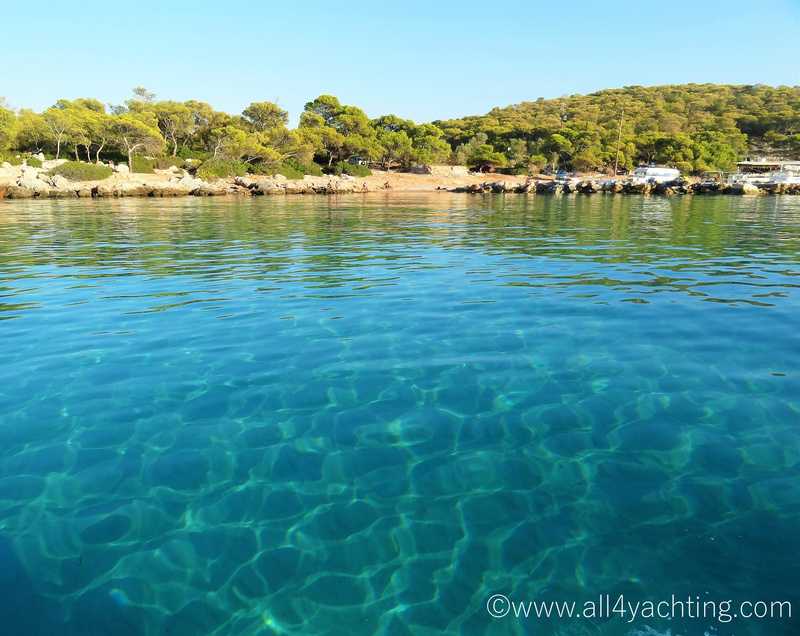 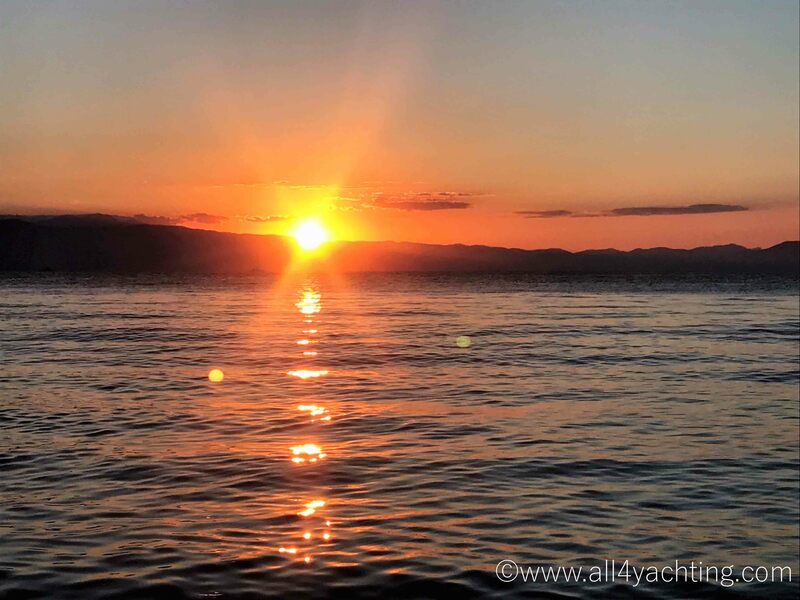 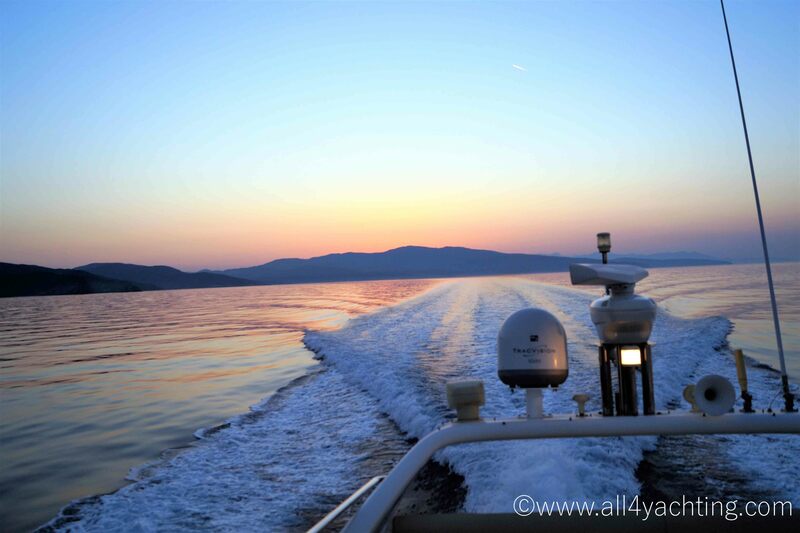 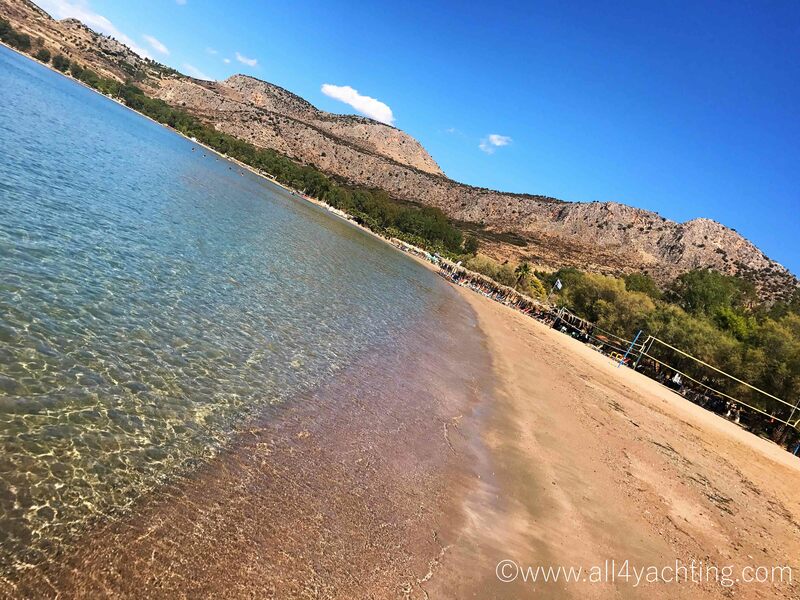 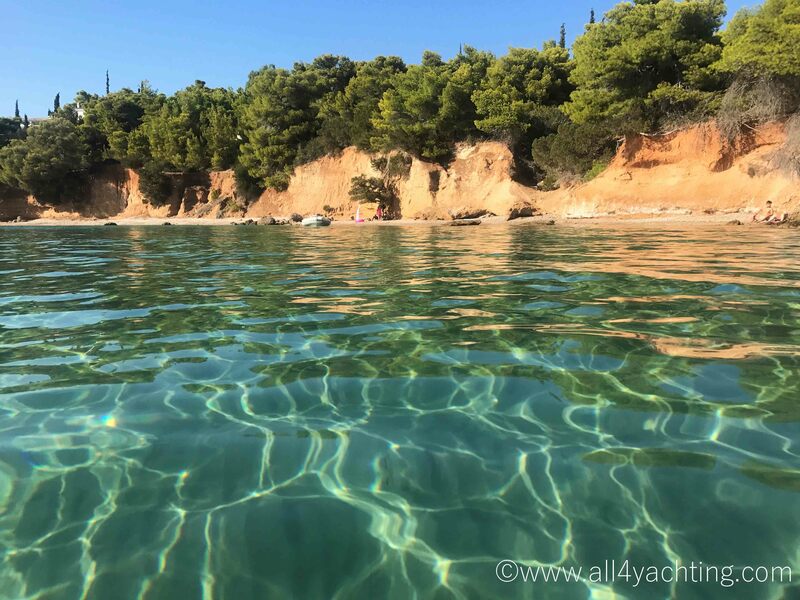 However, when you’re on a yachting break you’ll want to look forward to clear, sunny skies as well as good wind to take you where you need to go. 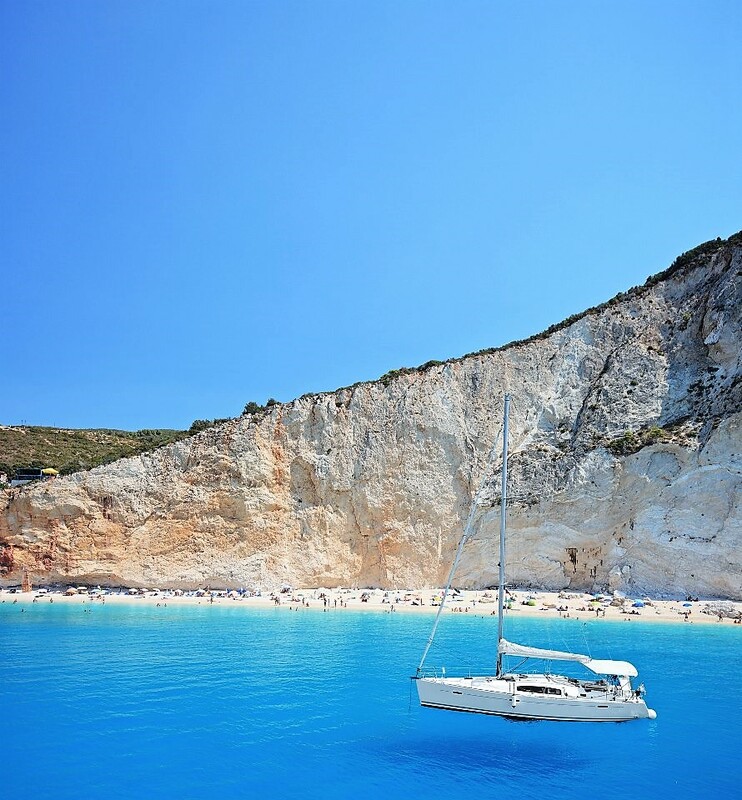 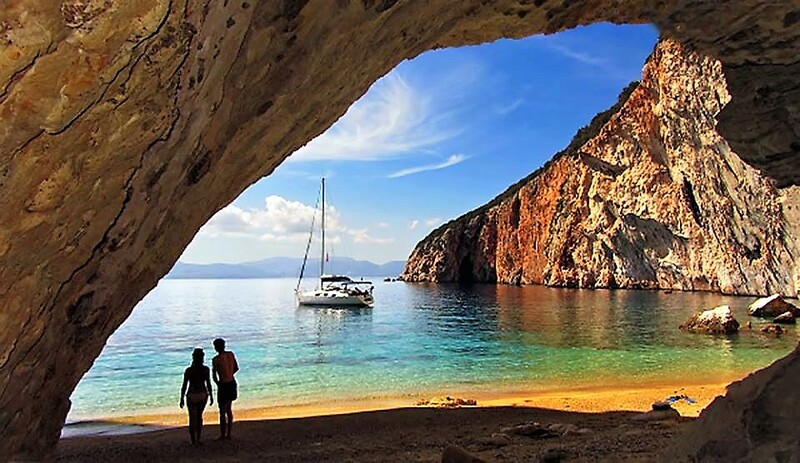 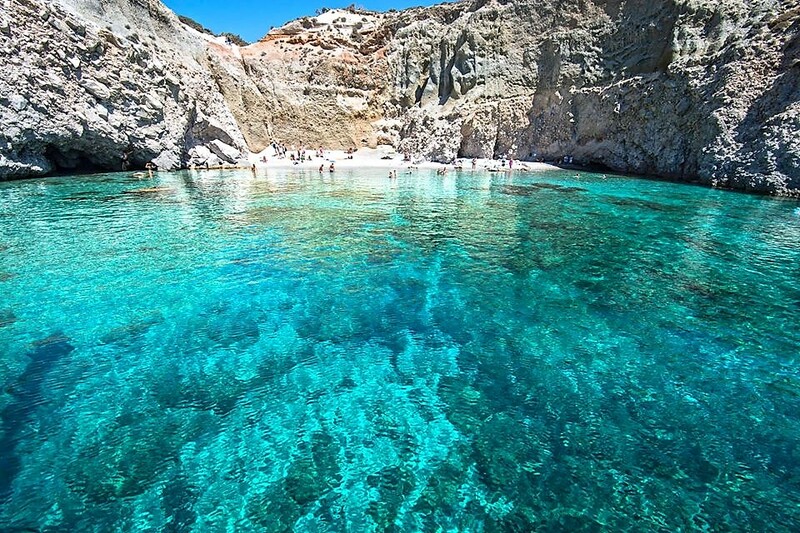 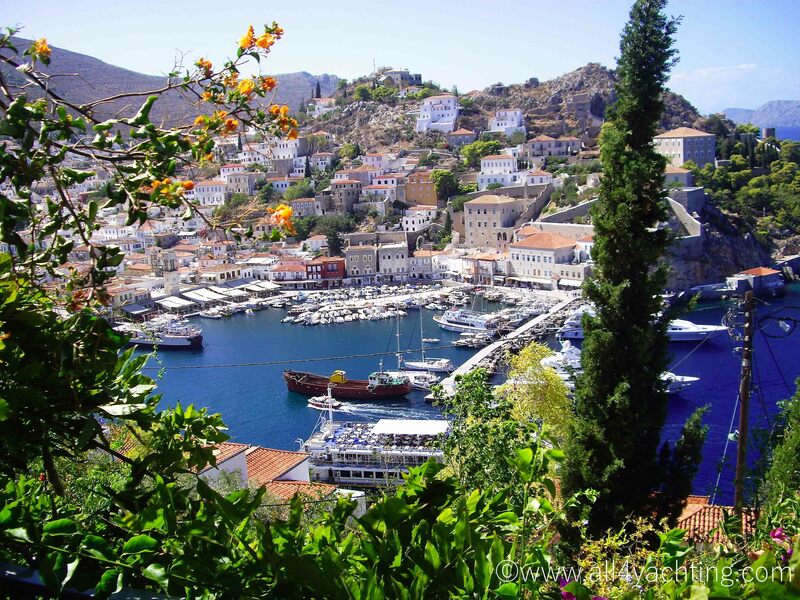 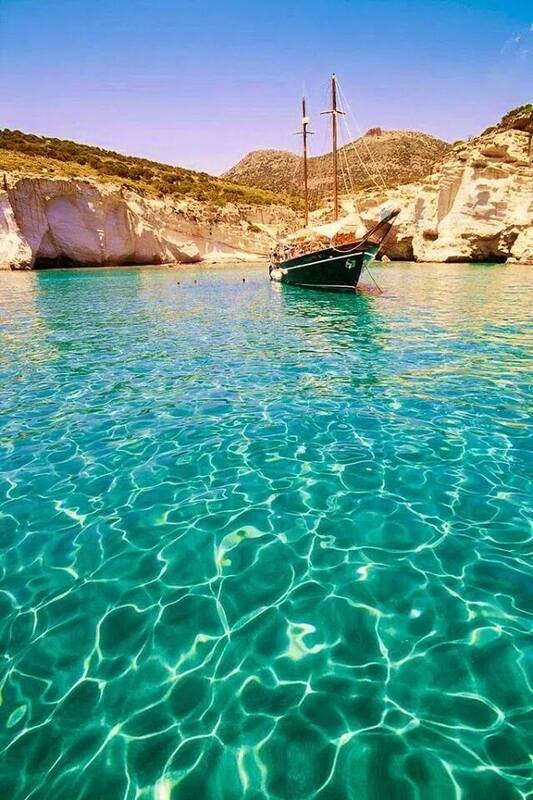 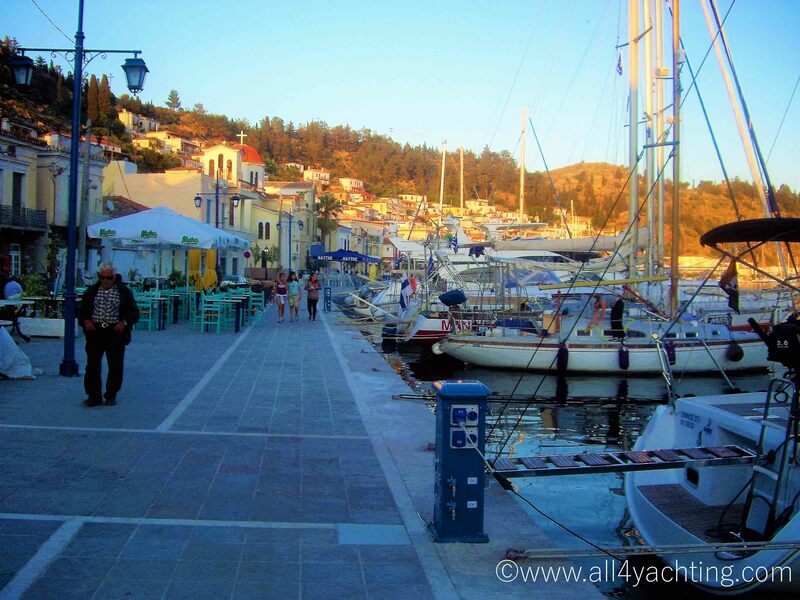 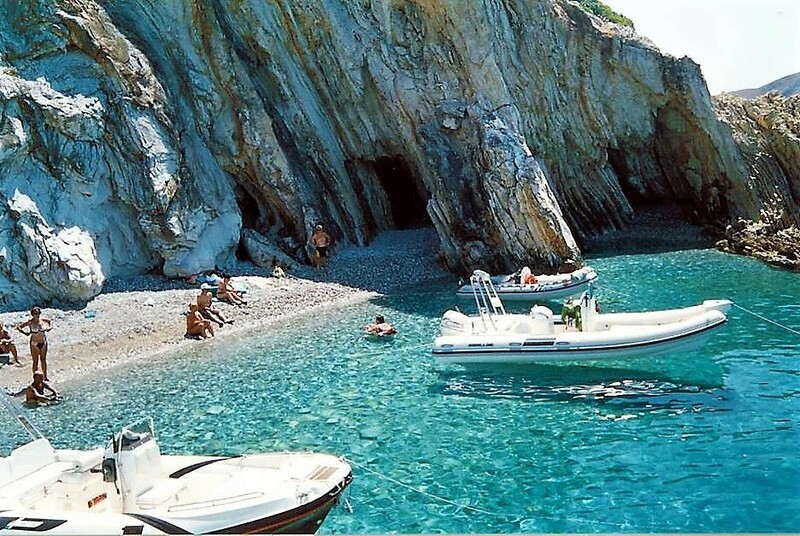 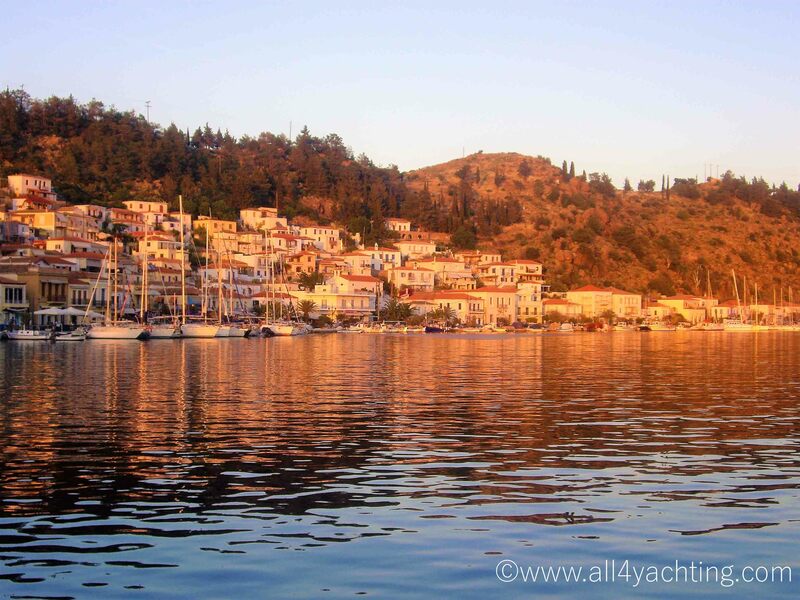 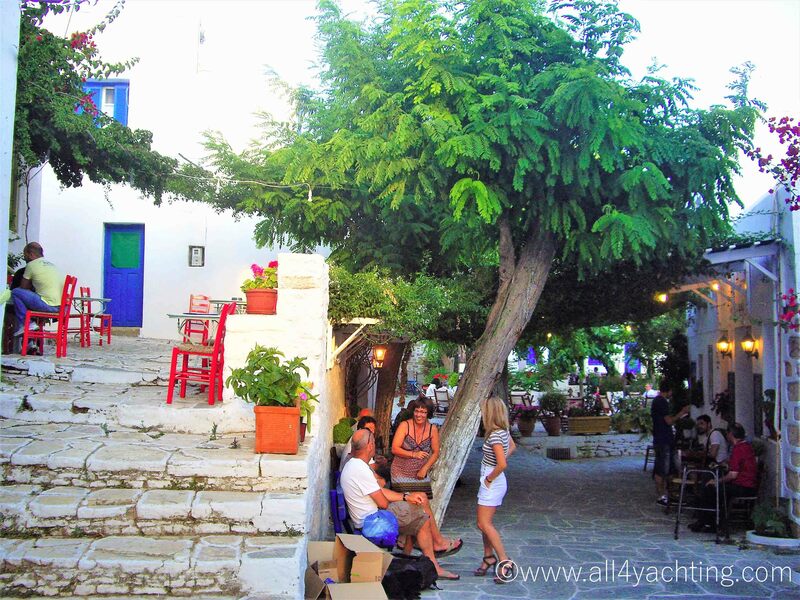 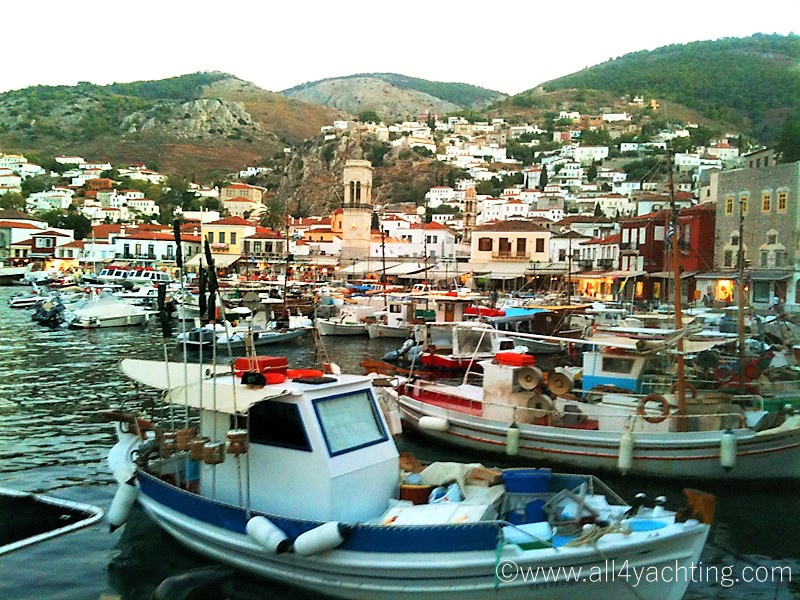 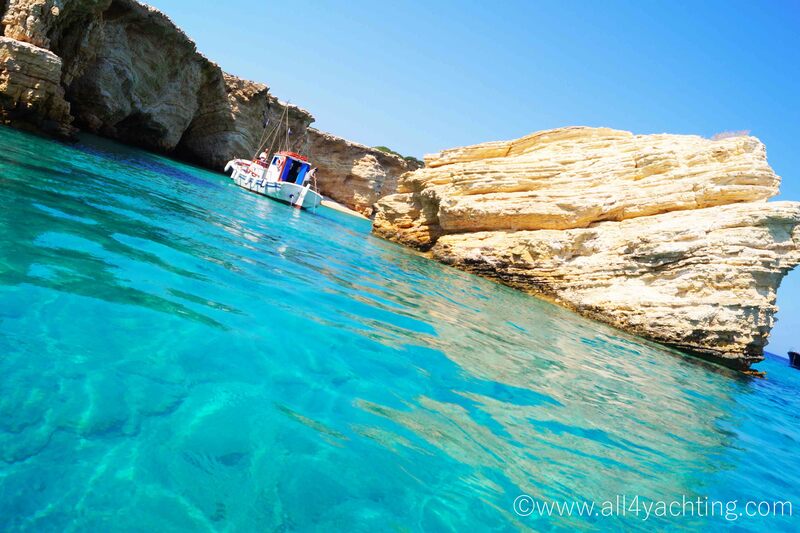 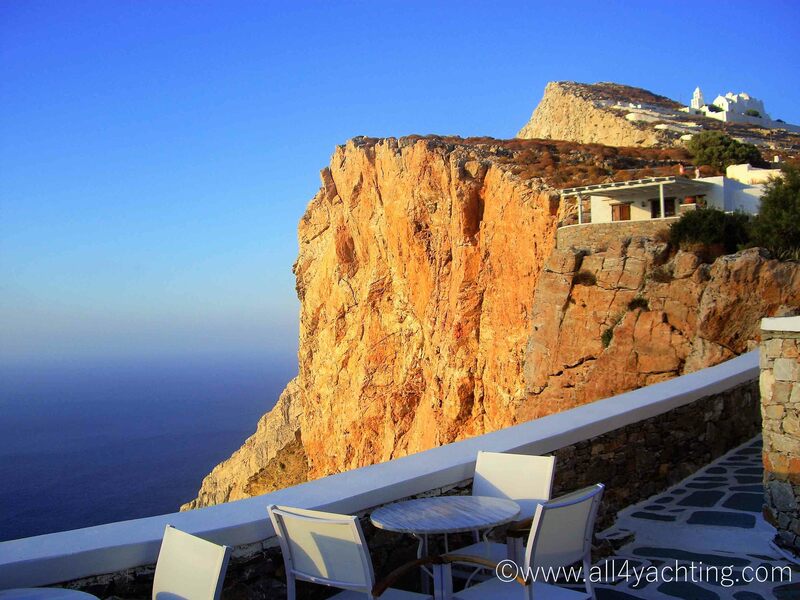 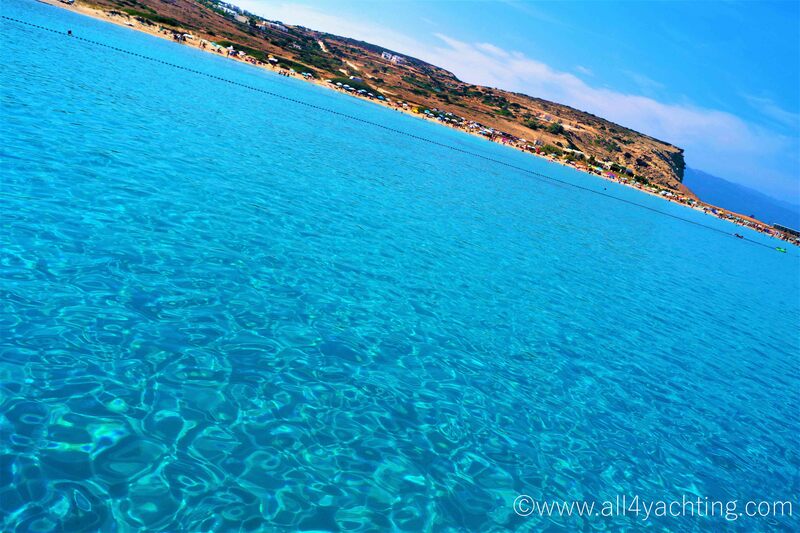 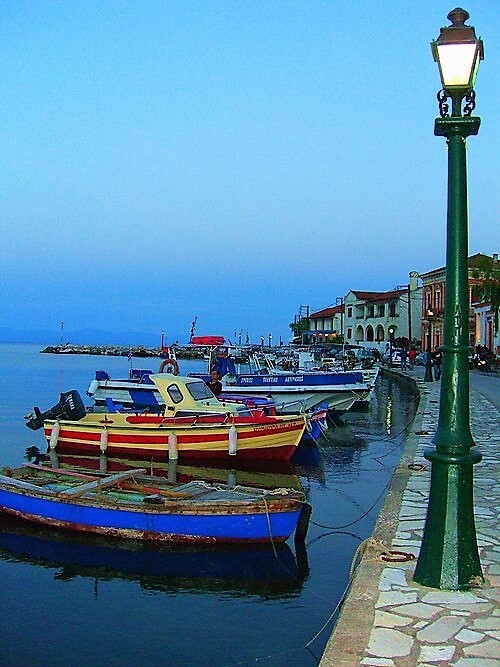 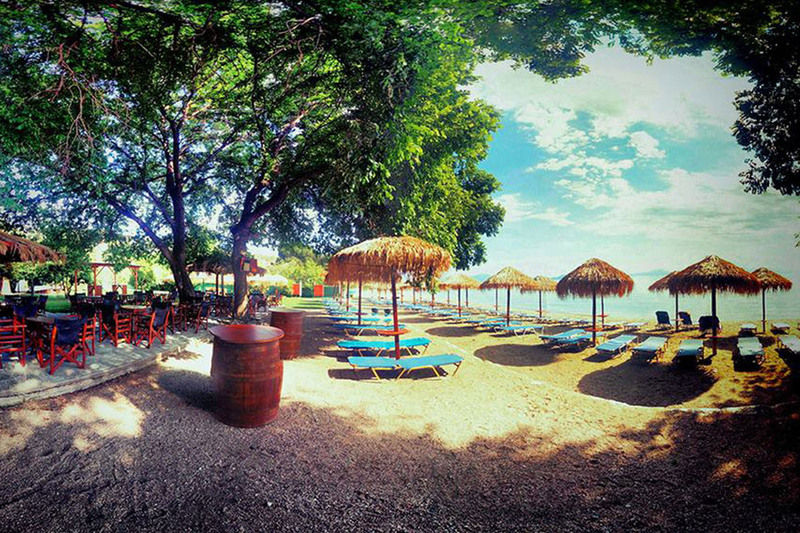 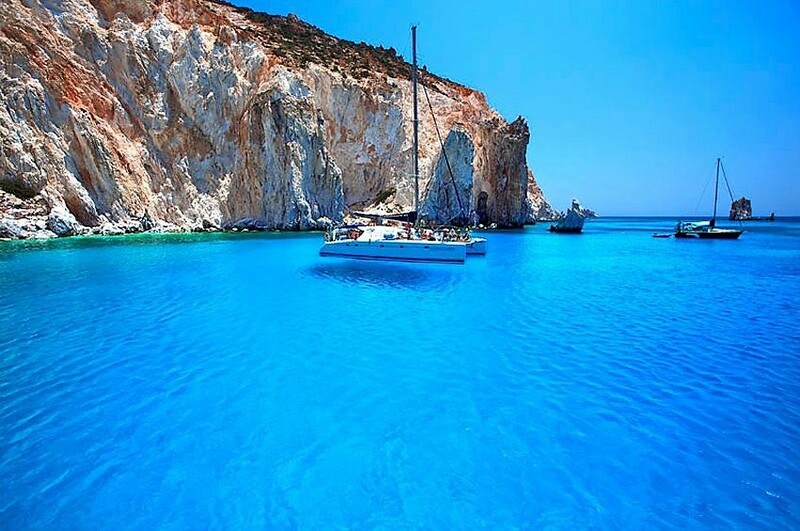 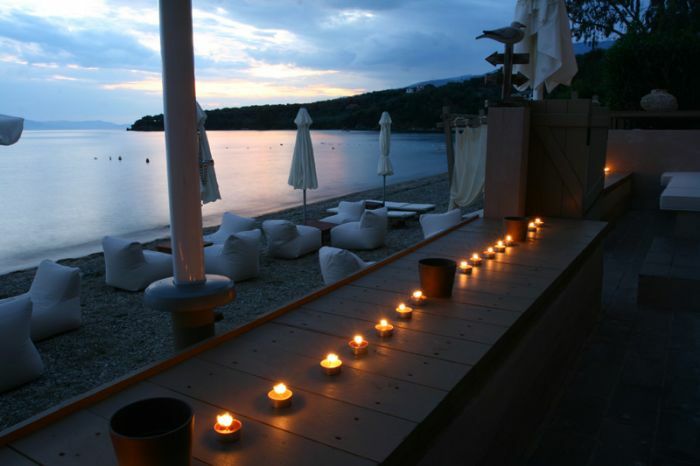 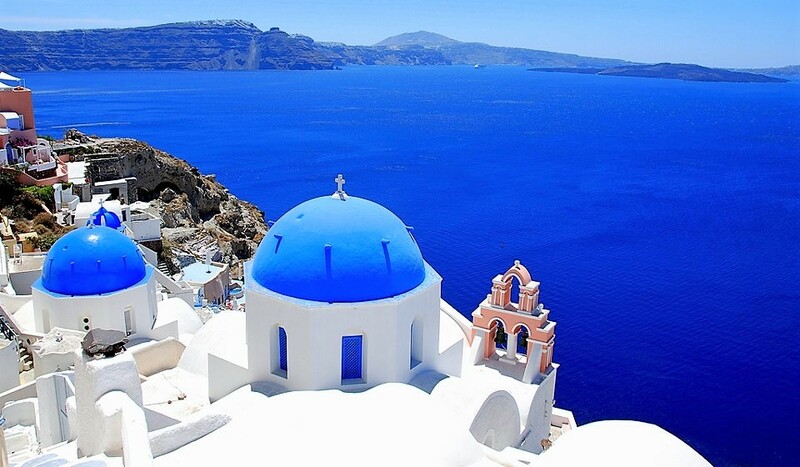 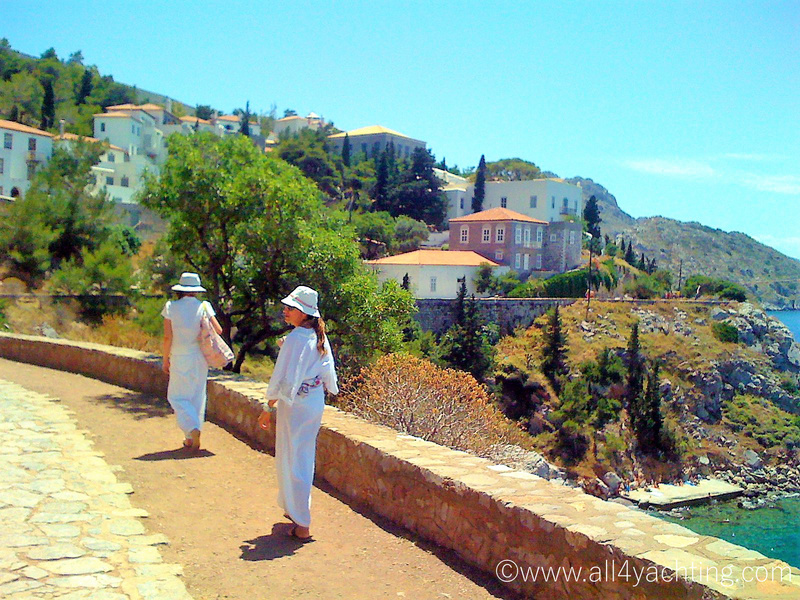 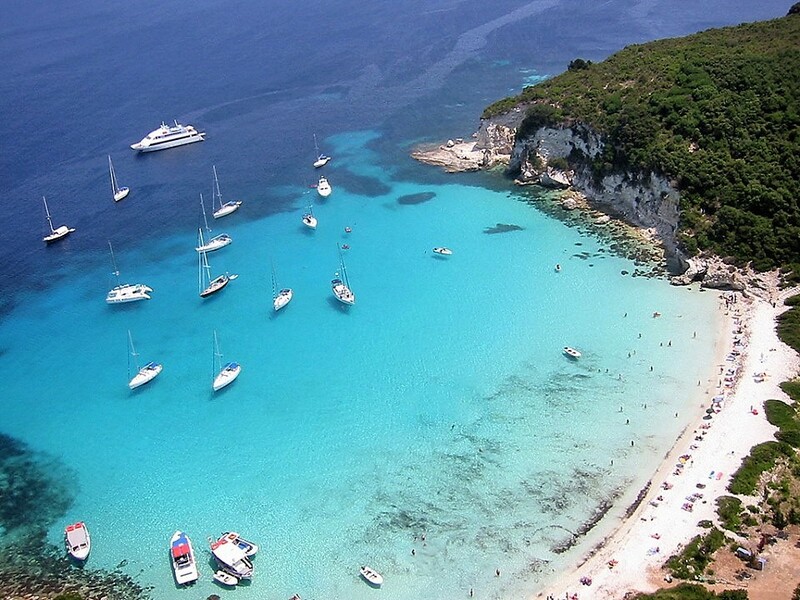 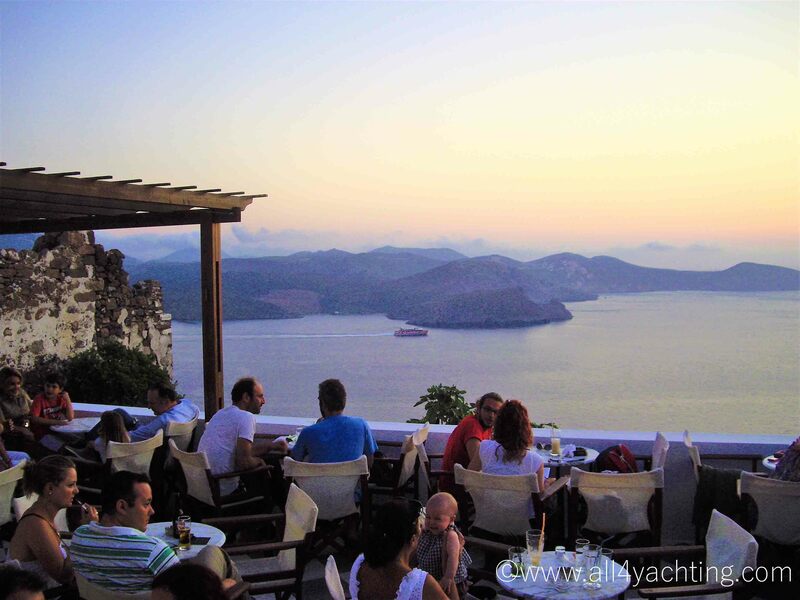 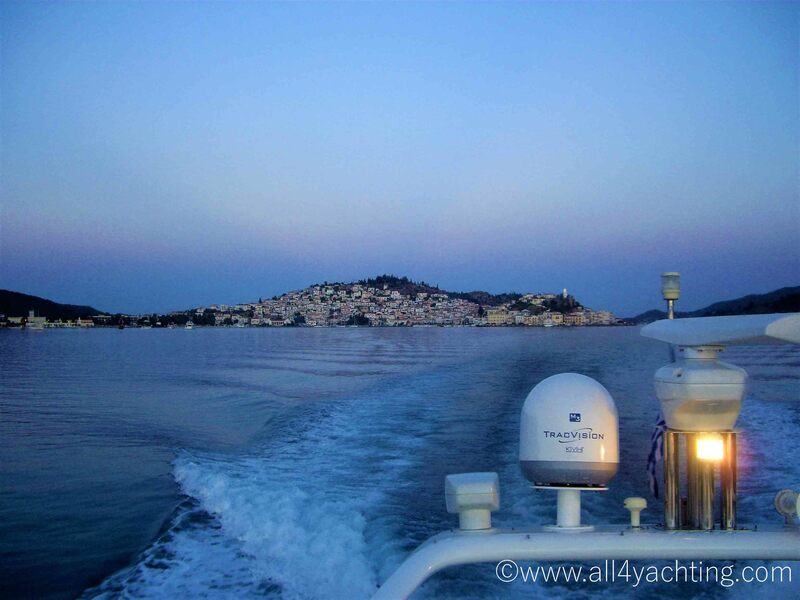 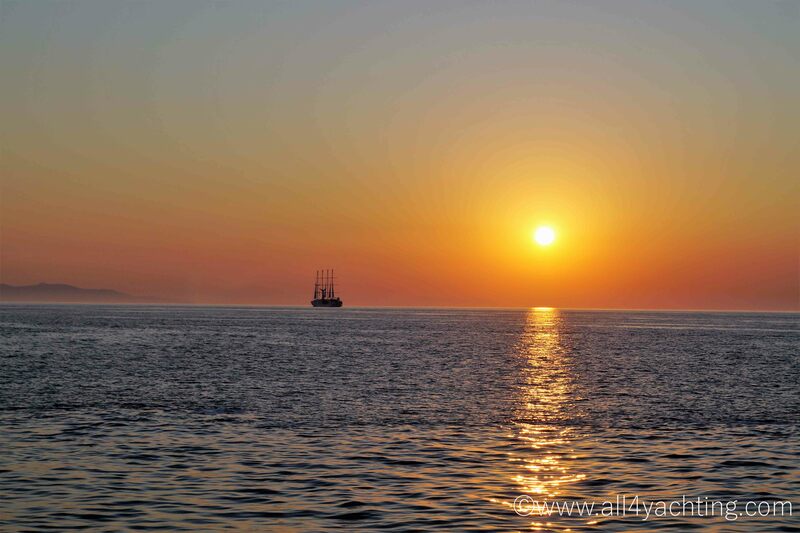 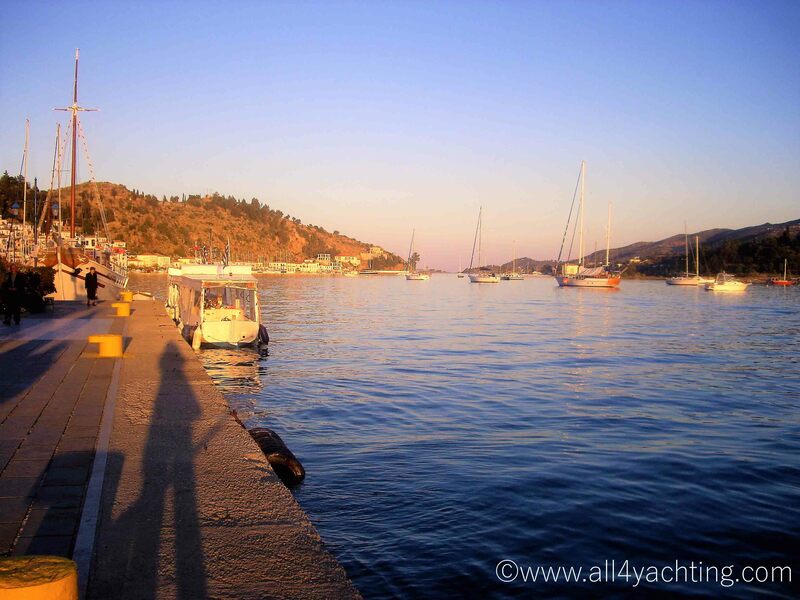 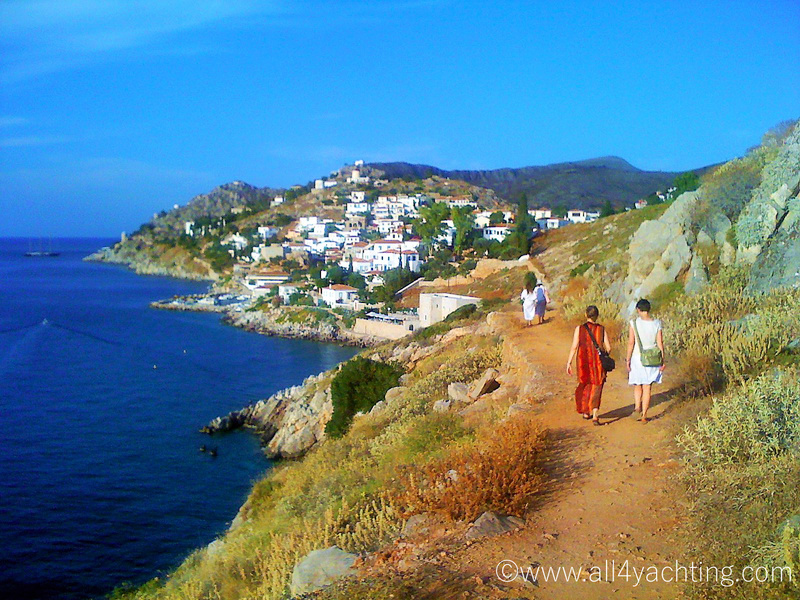 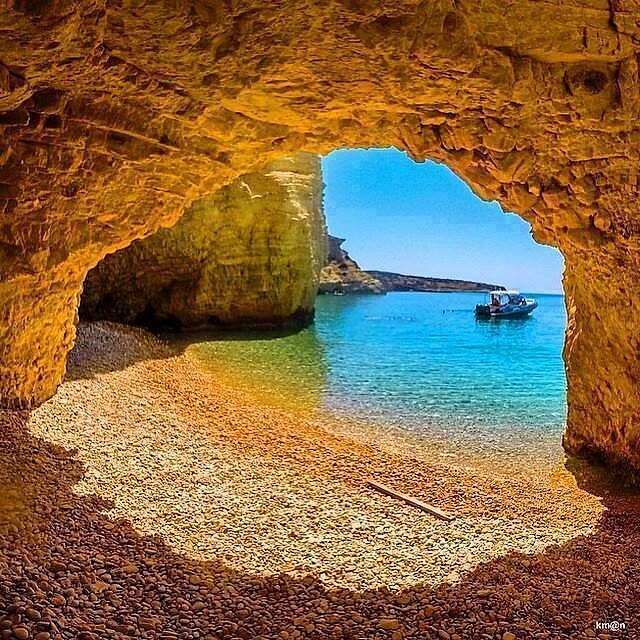 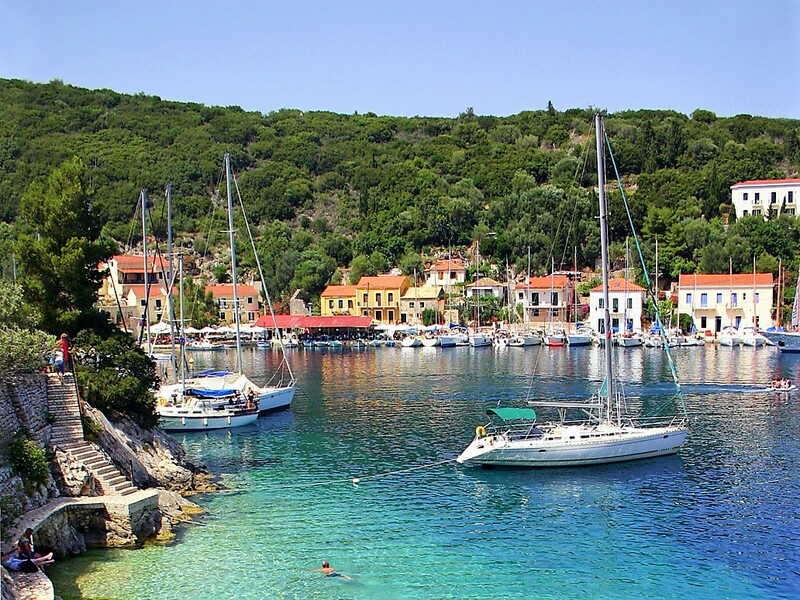 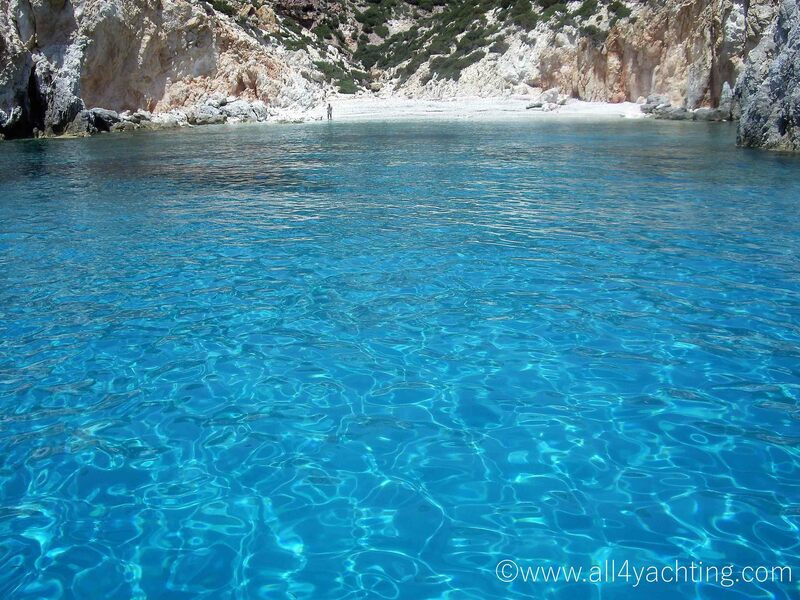 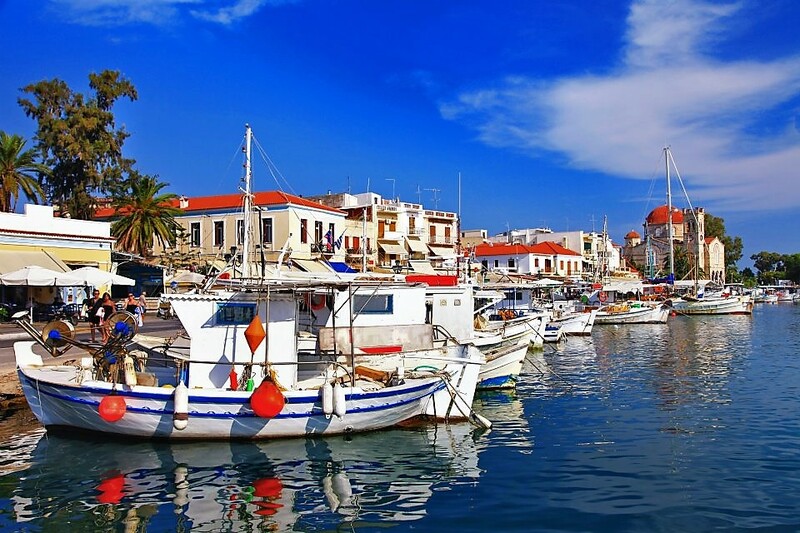 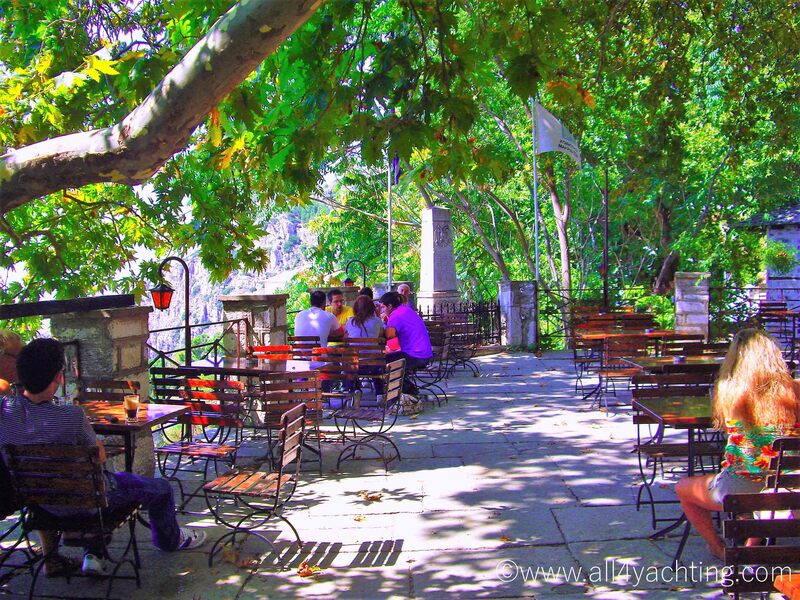 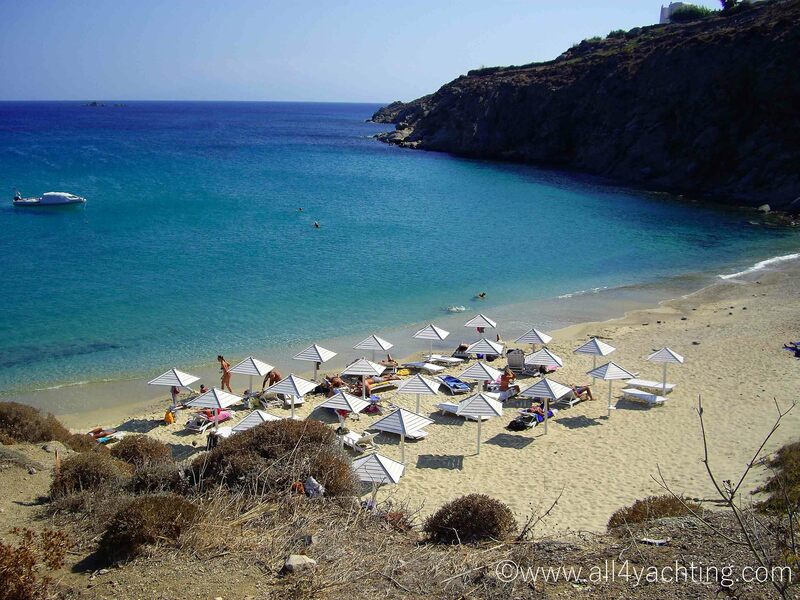 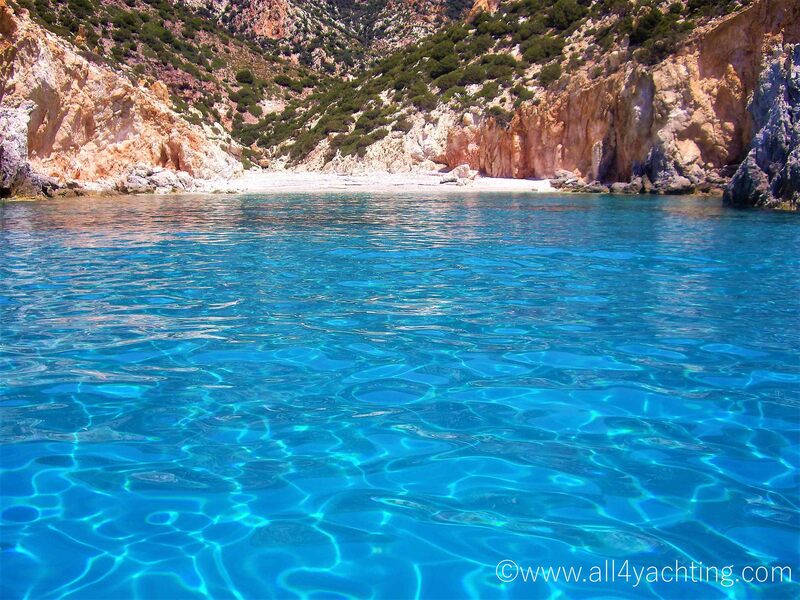 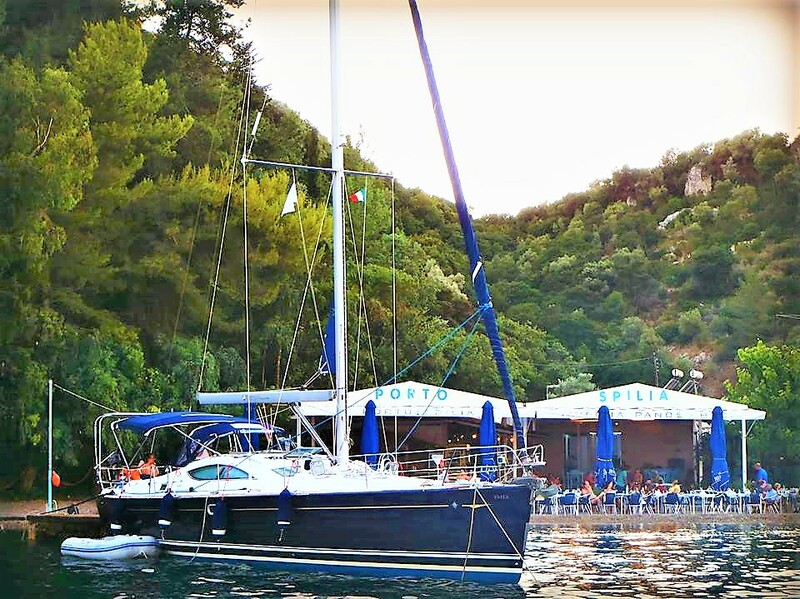 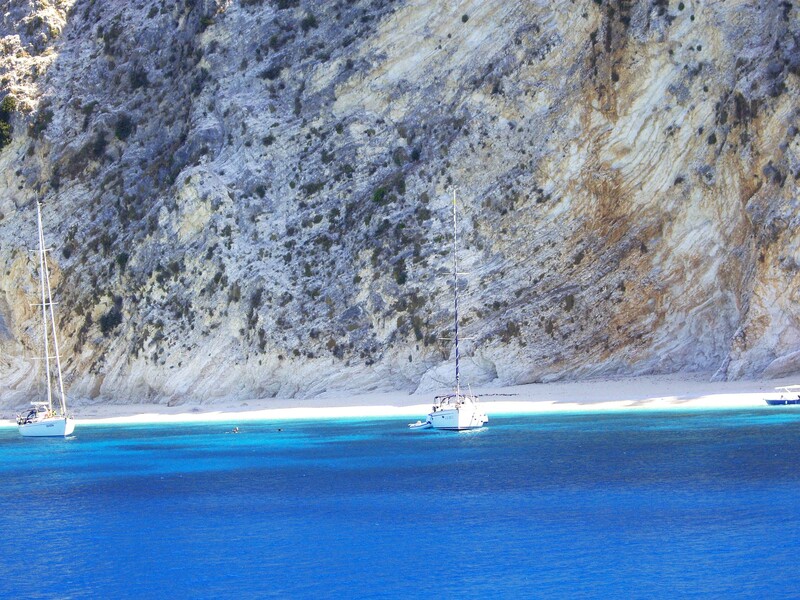 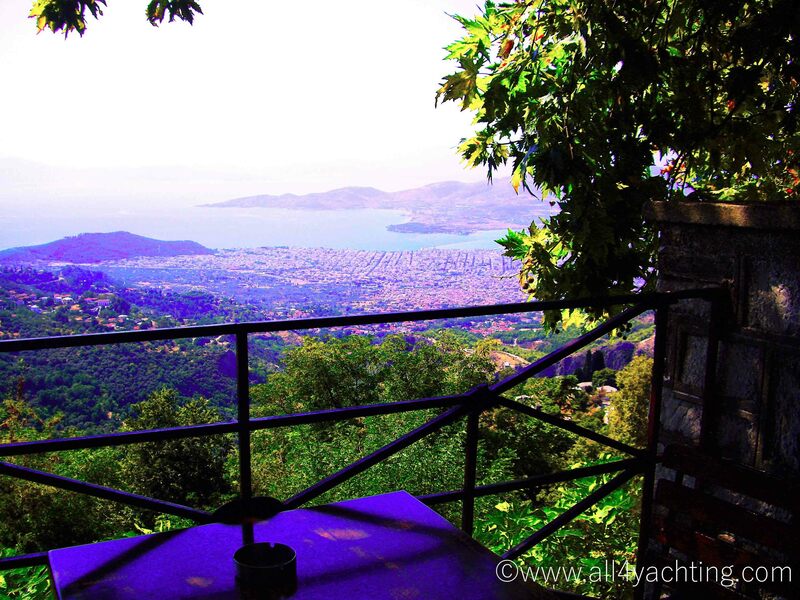 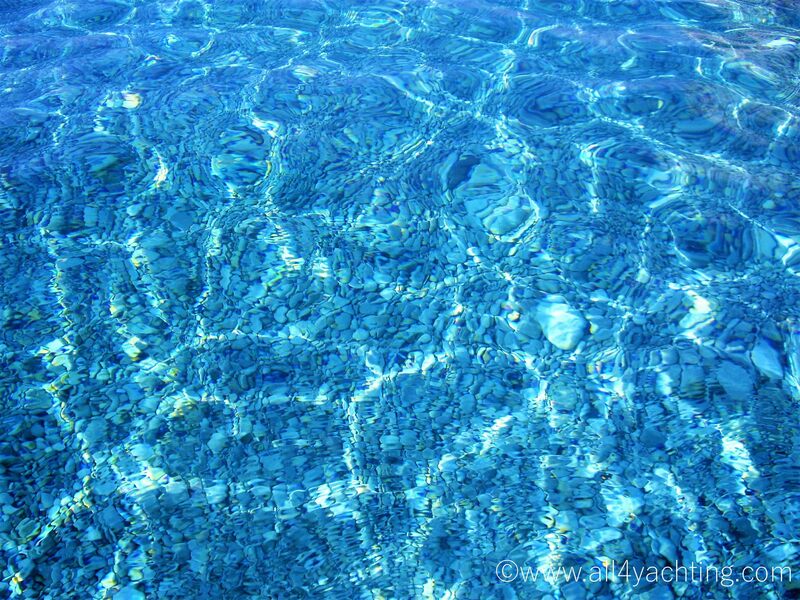 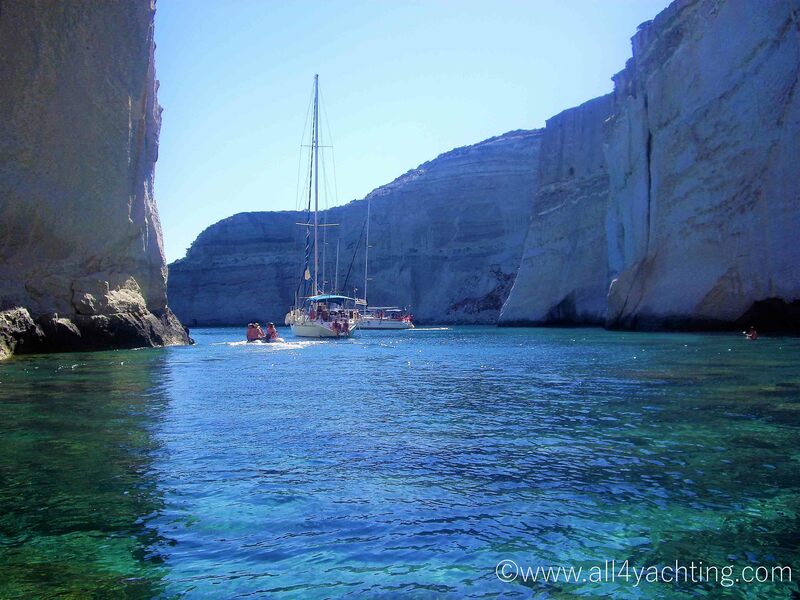 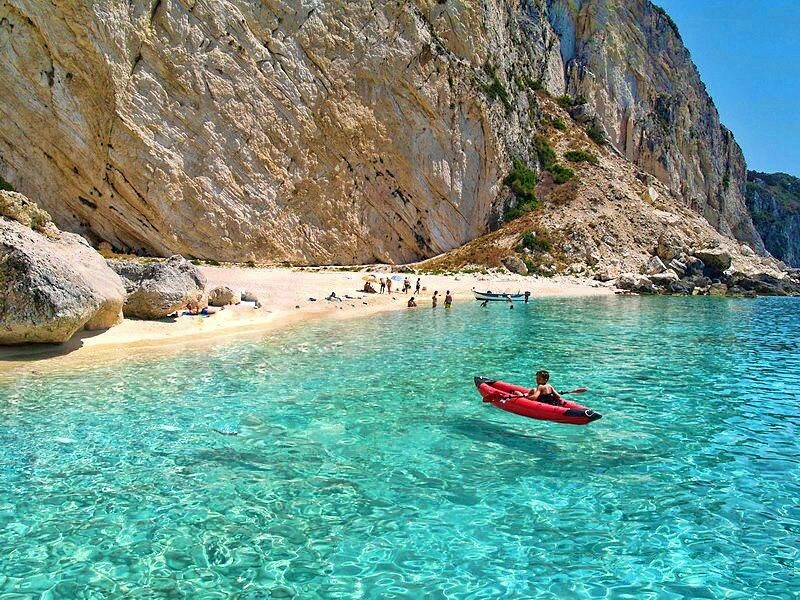 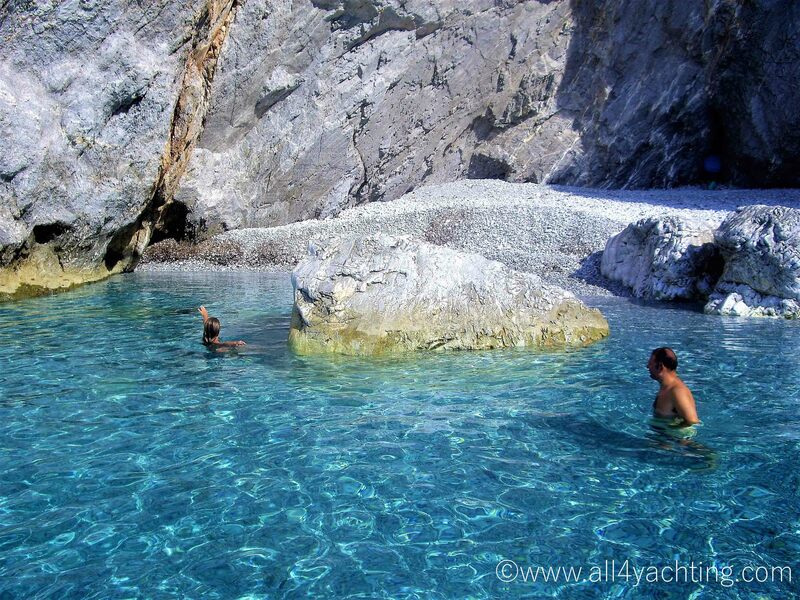 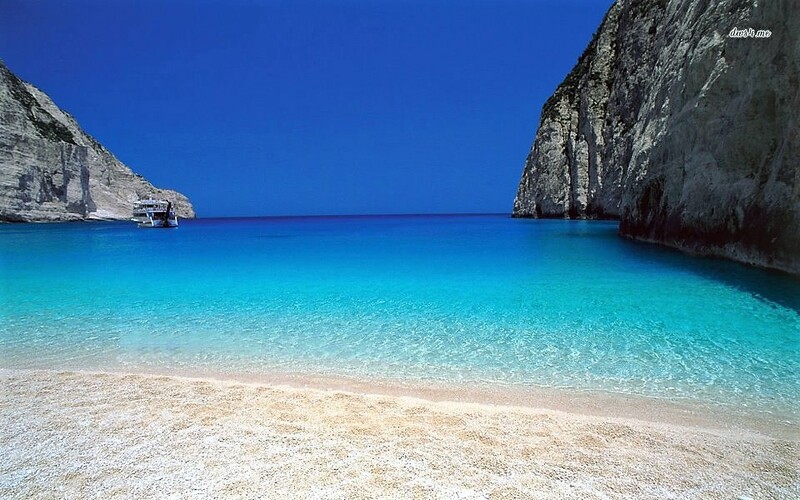 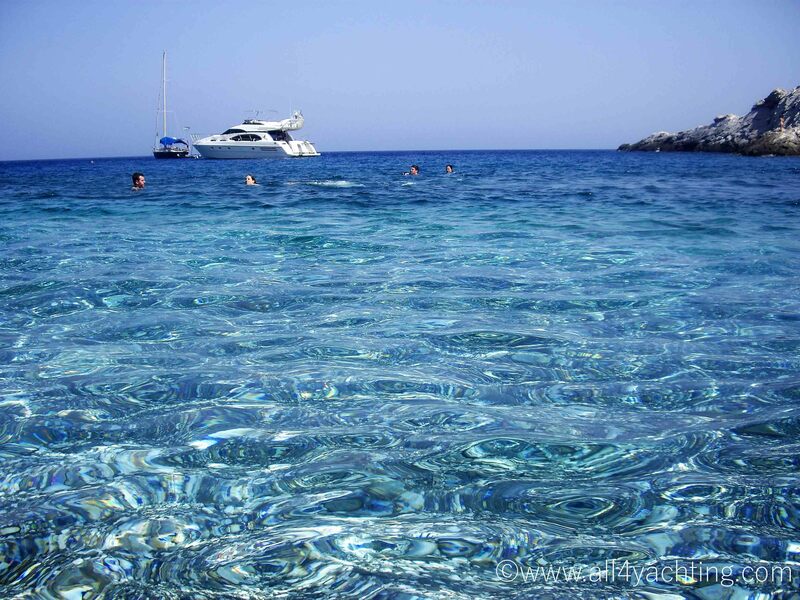 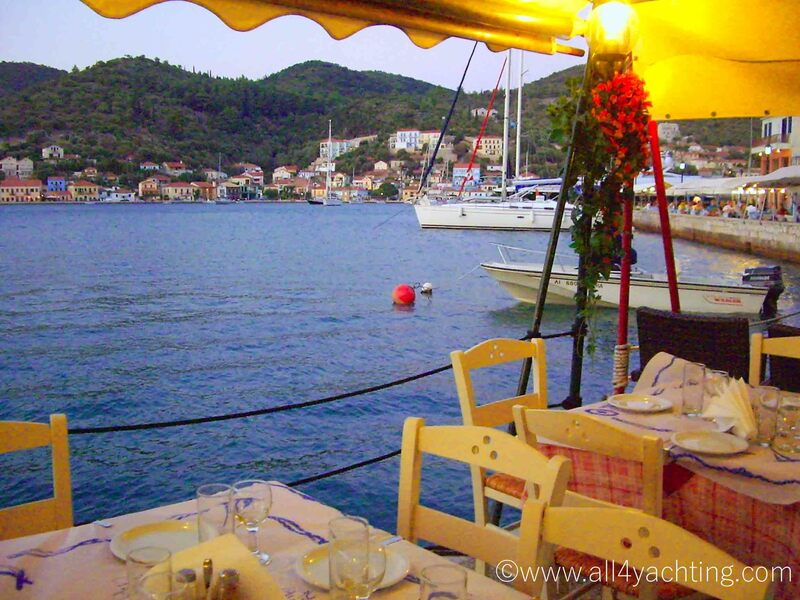 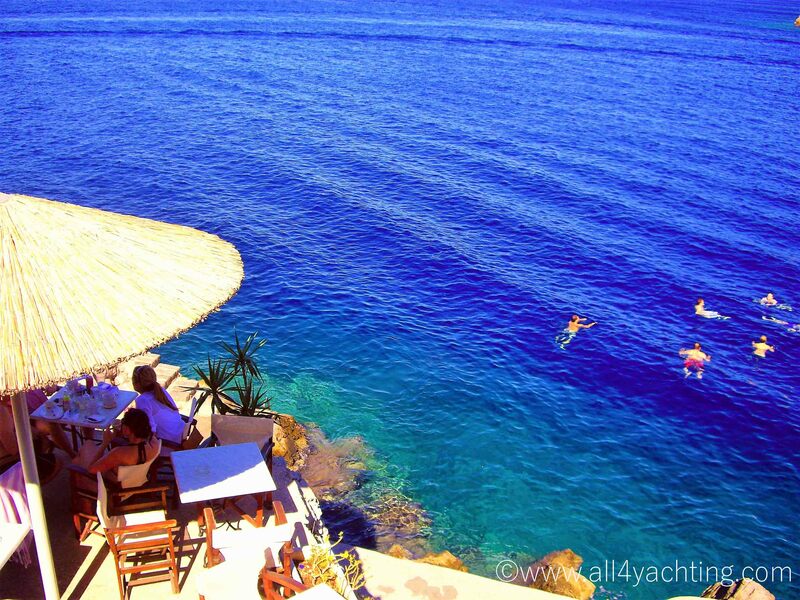 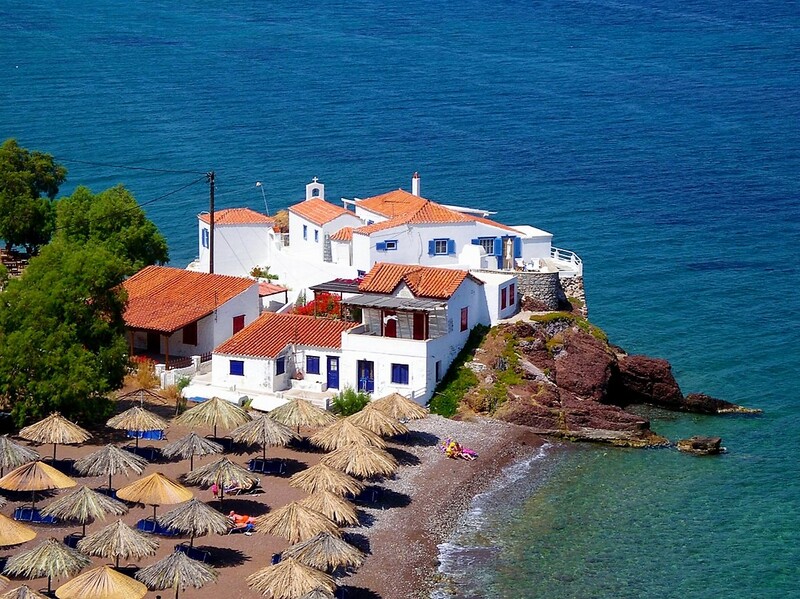 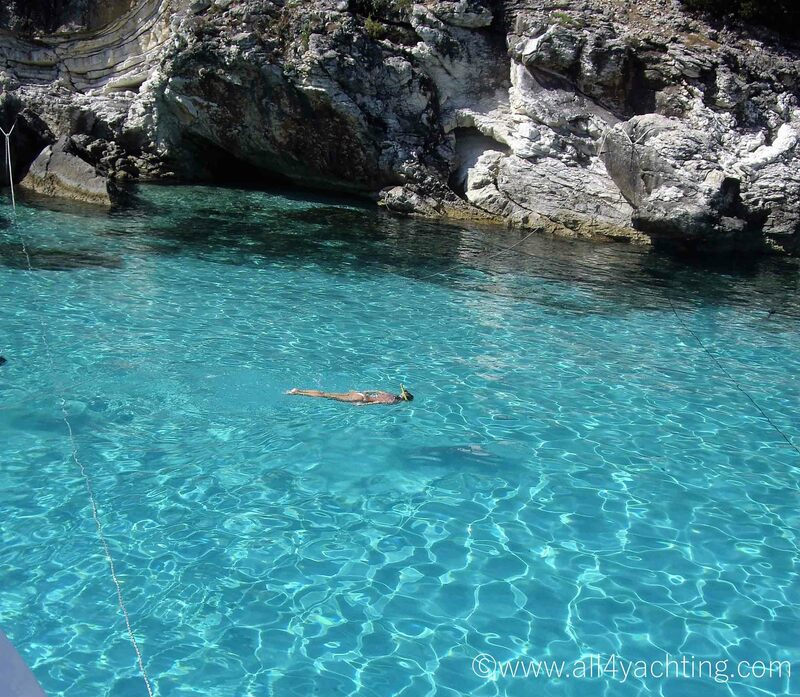 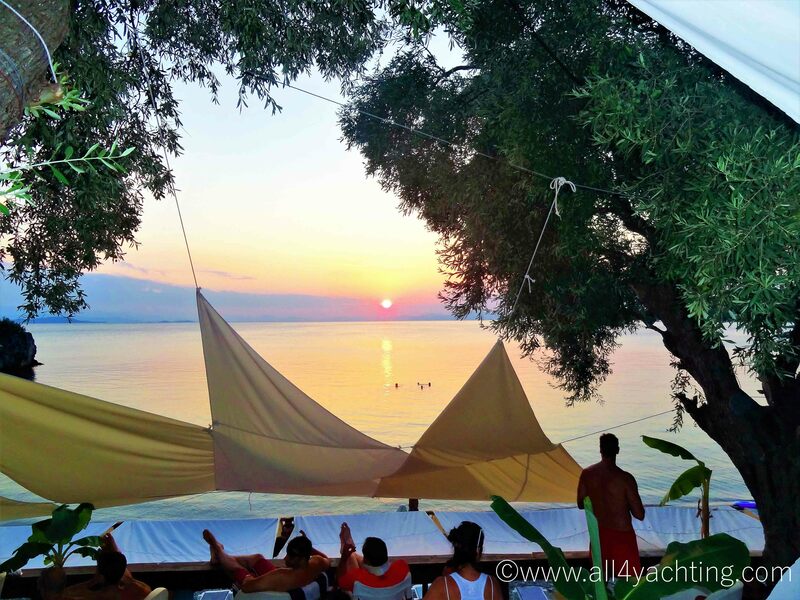 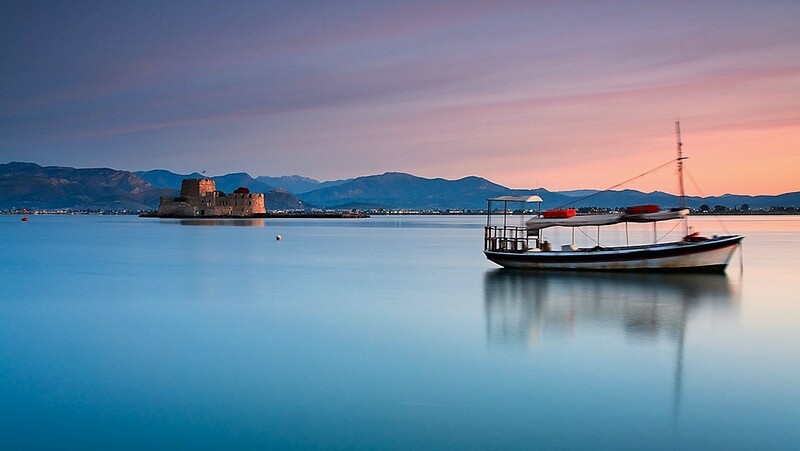 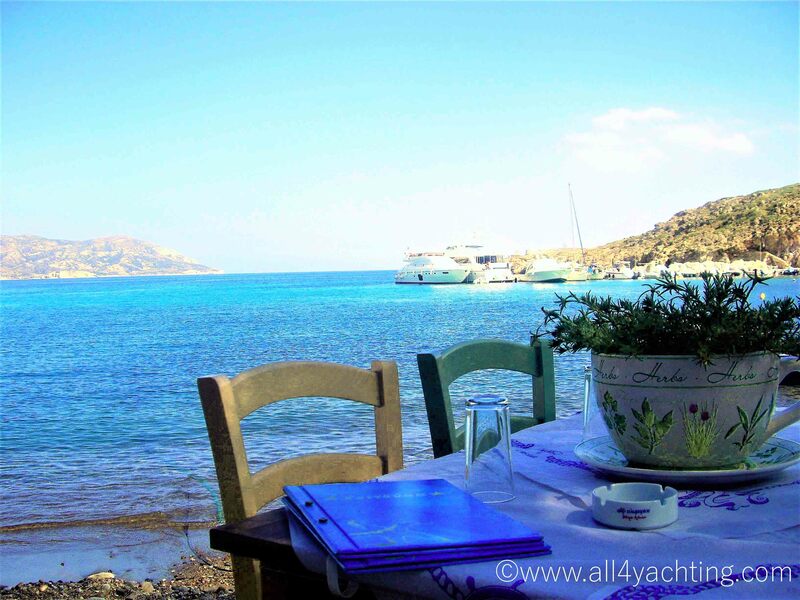 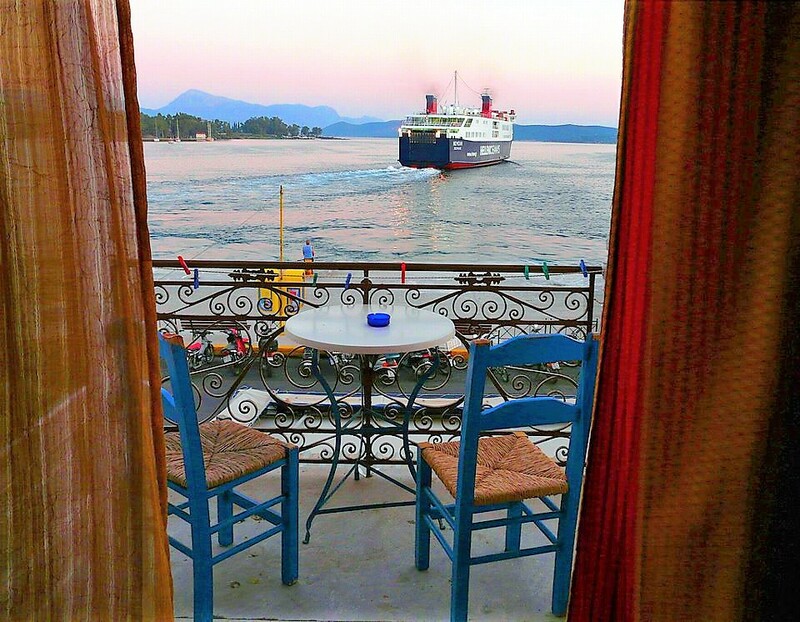 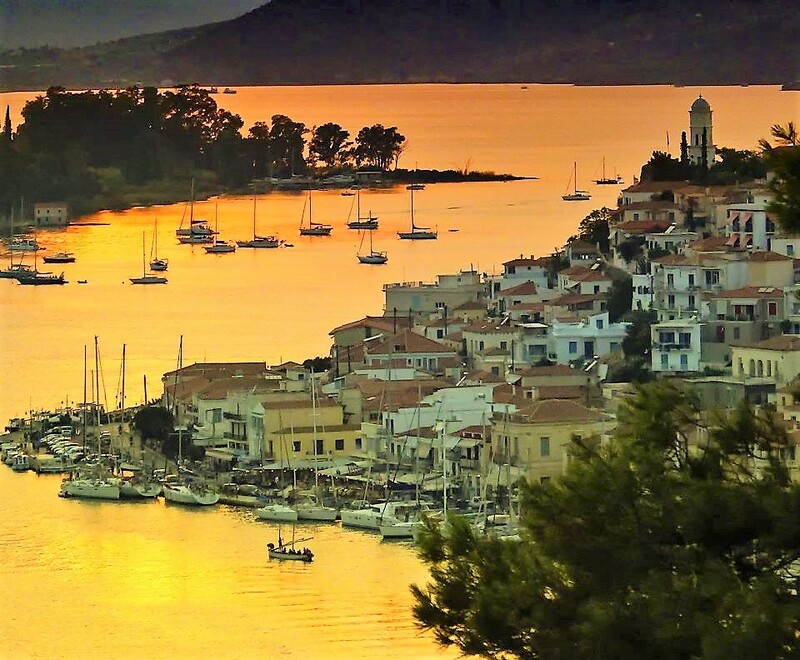 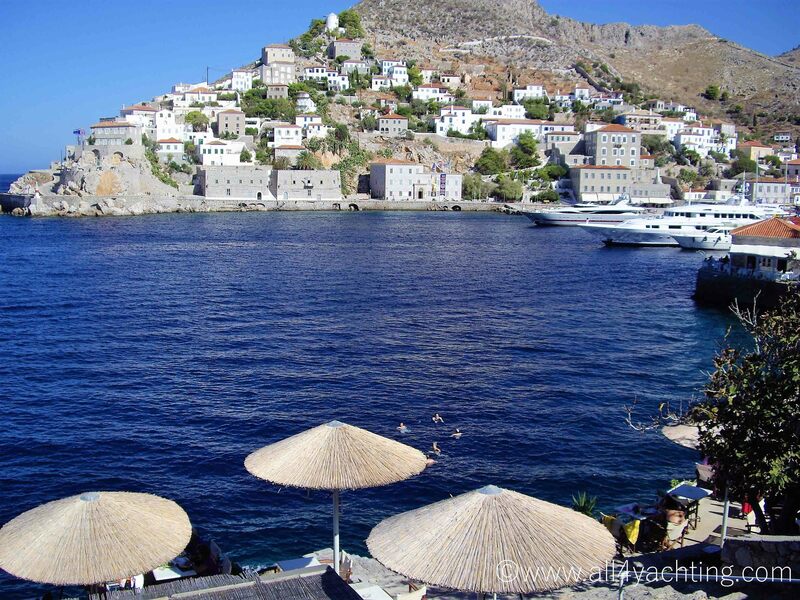 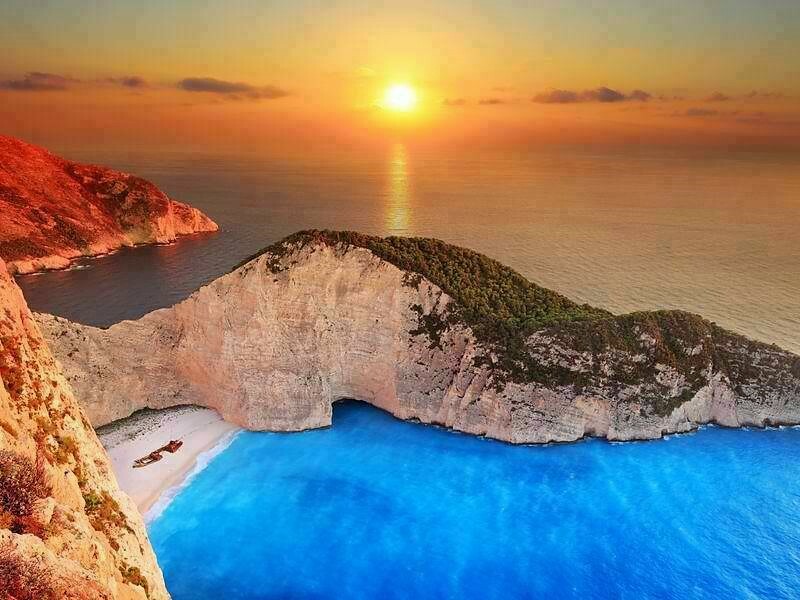 Greece has a long sailing season, with the destination typically busy from early April through to late November. 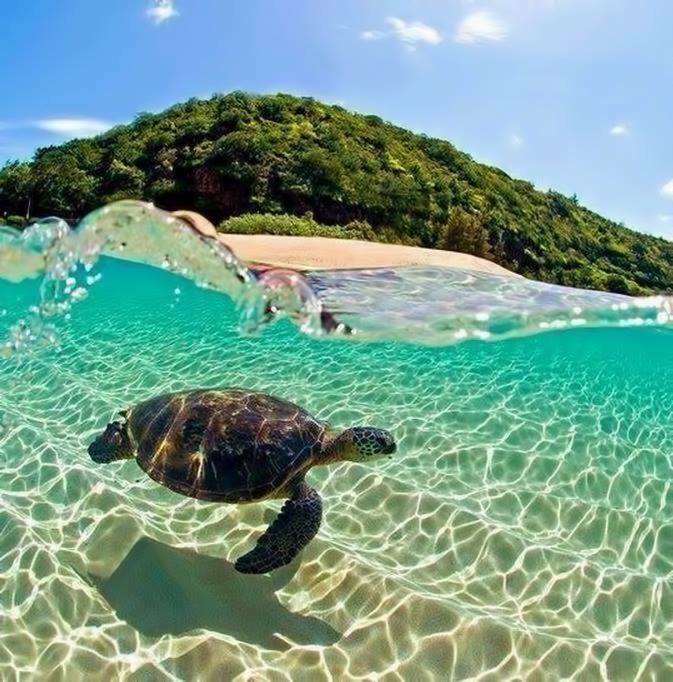 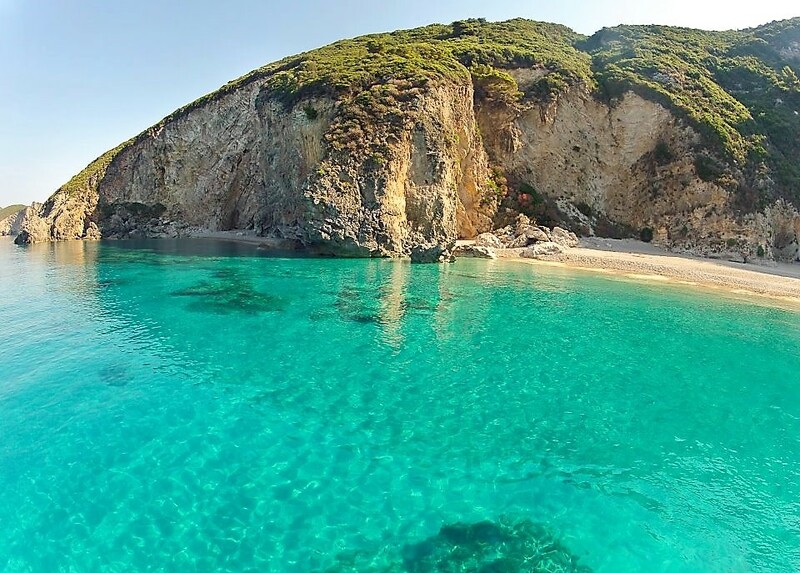 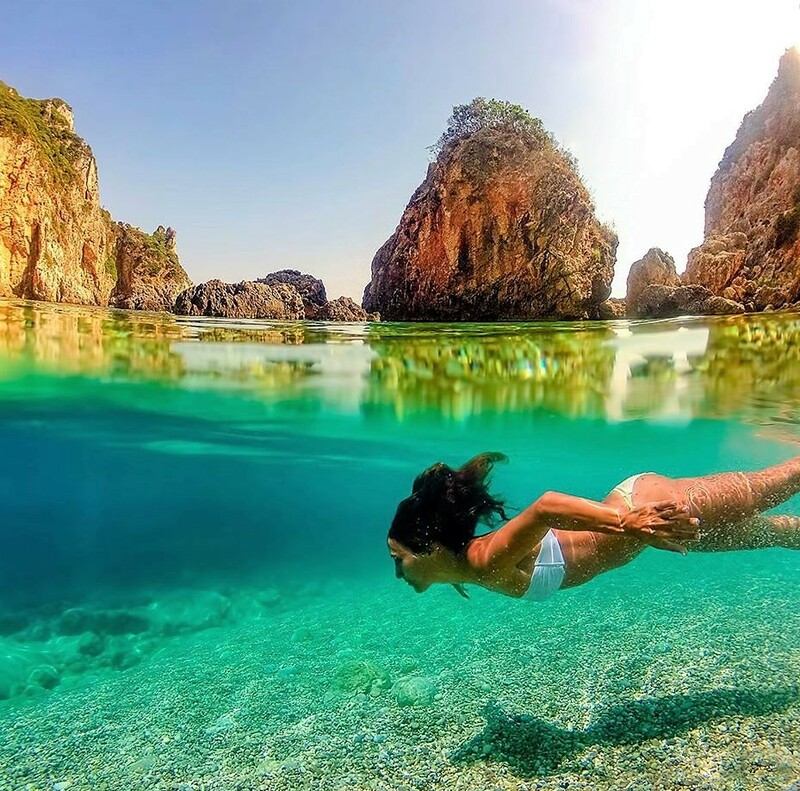 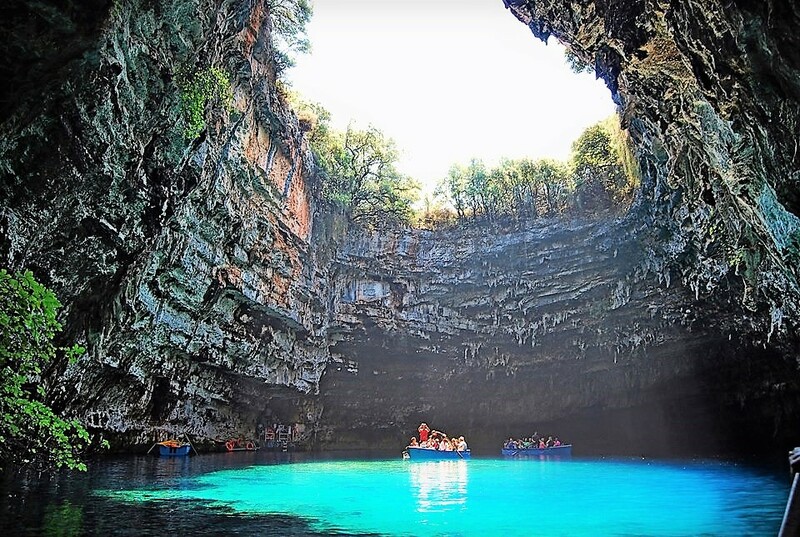 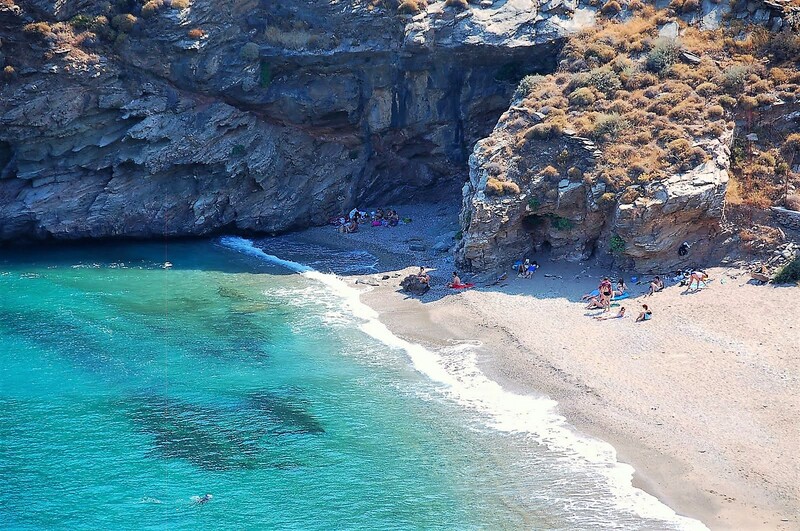 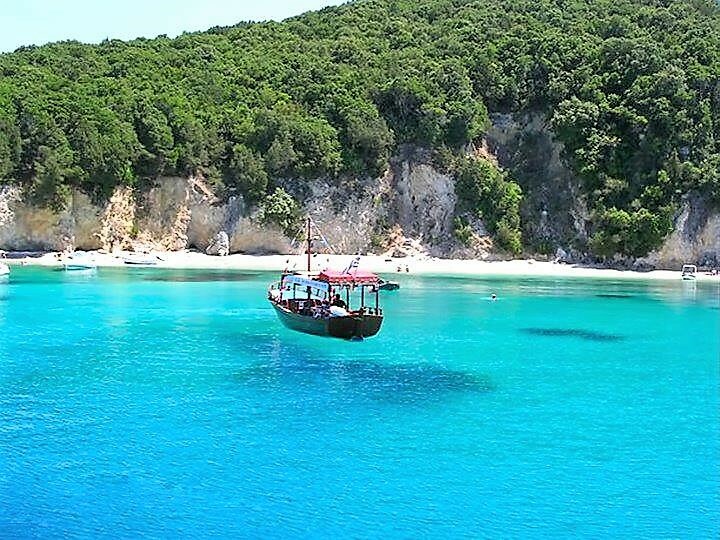 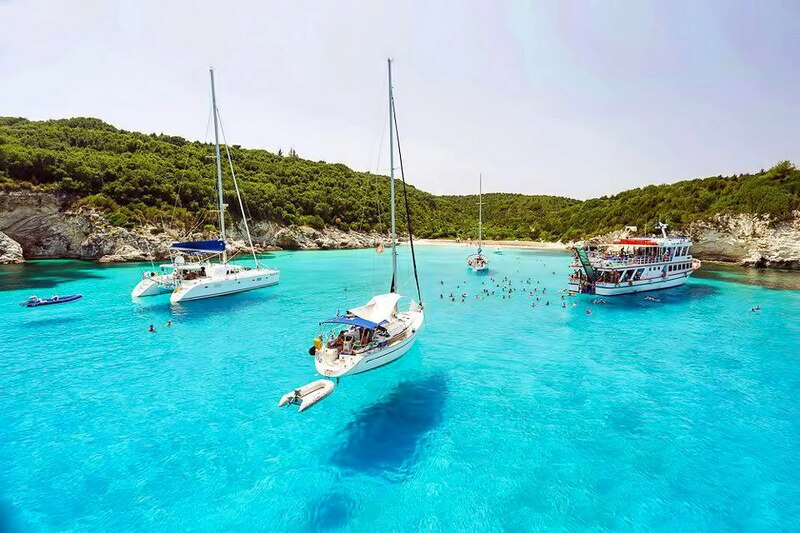 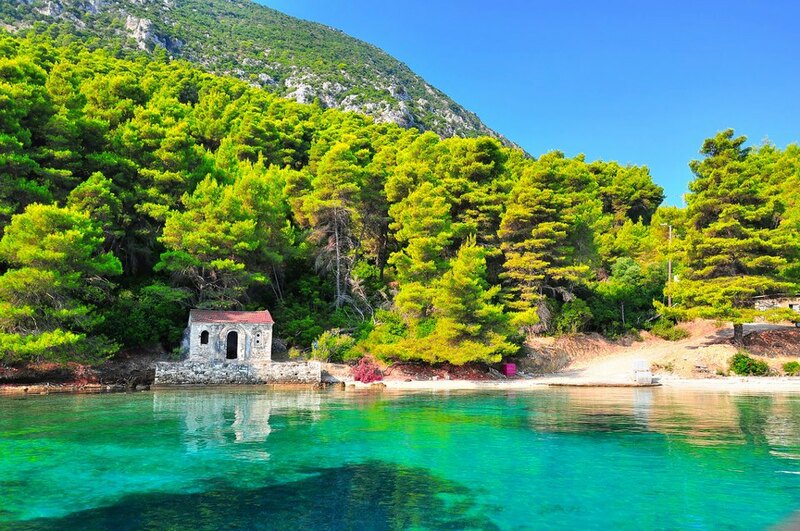 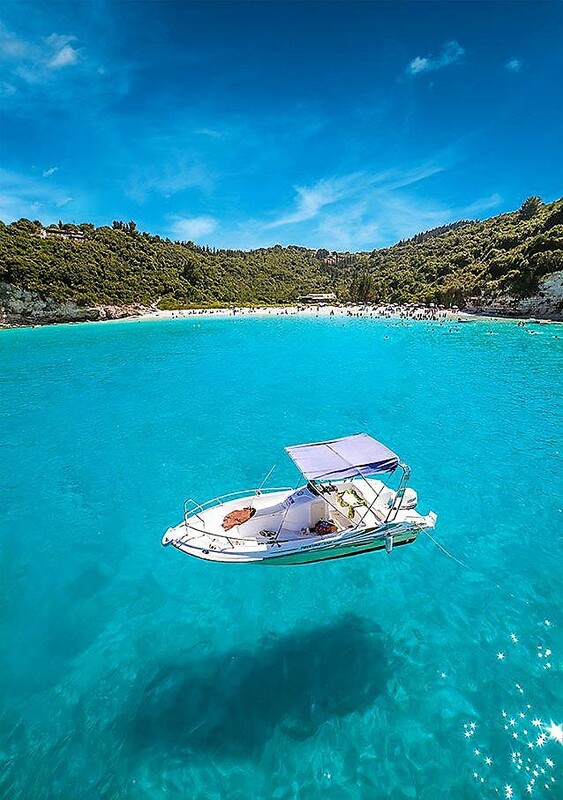 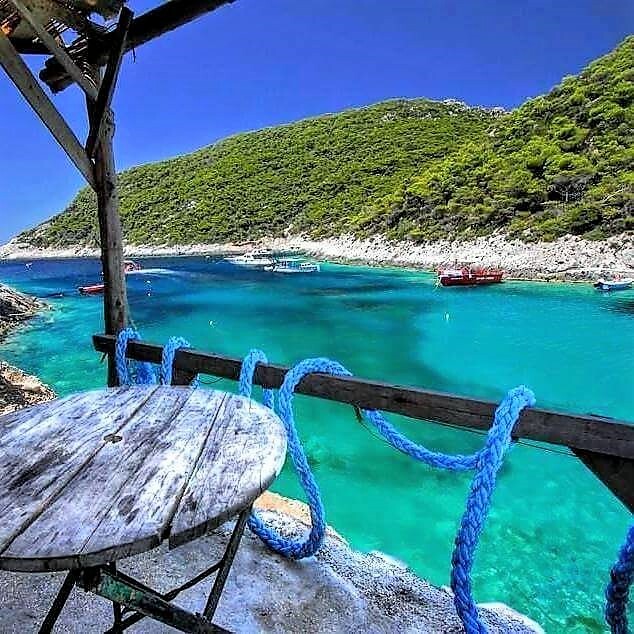 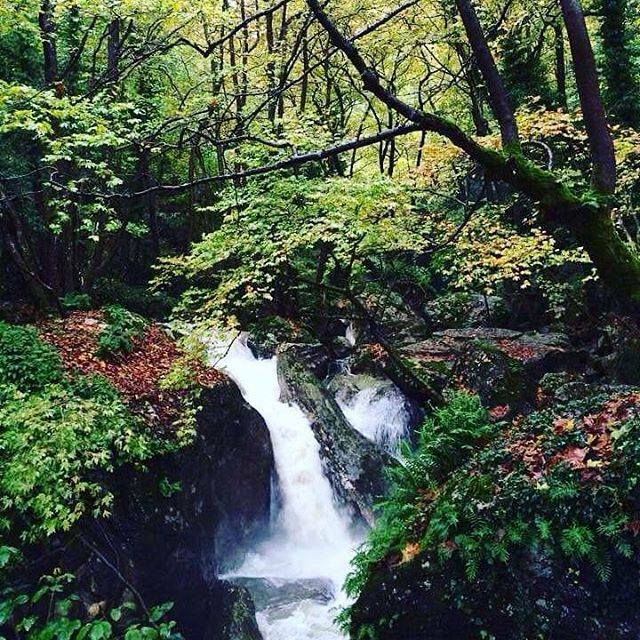 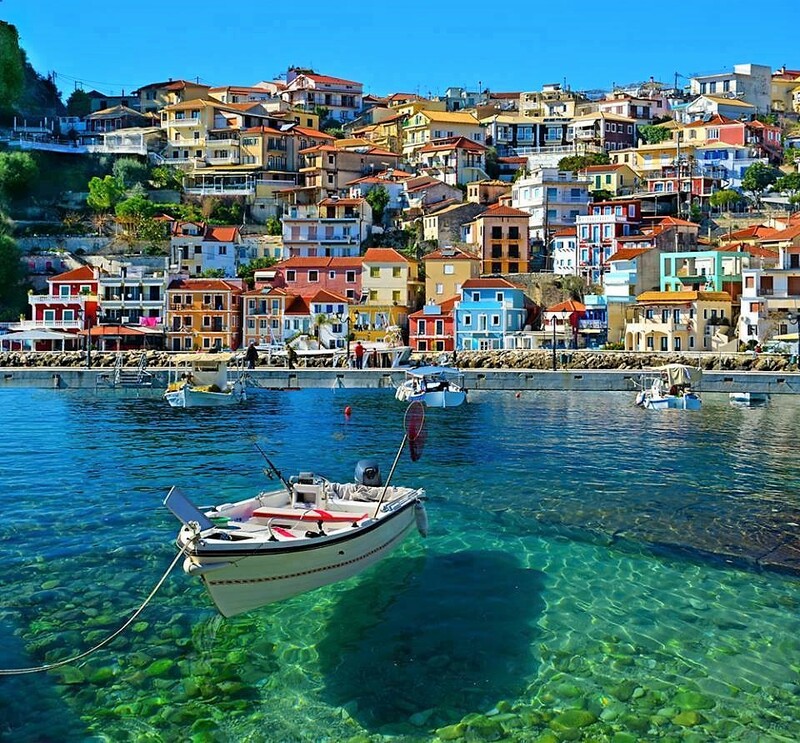 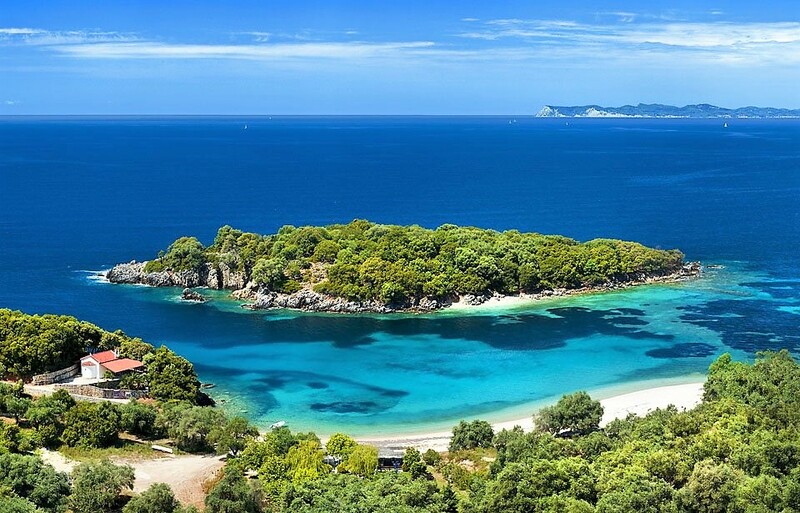 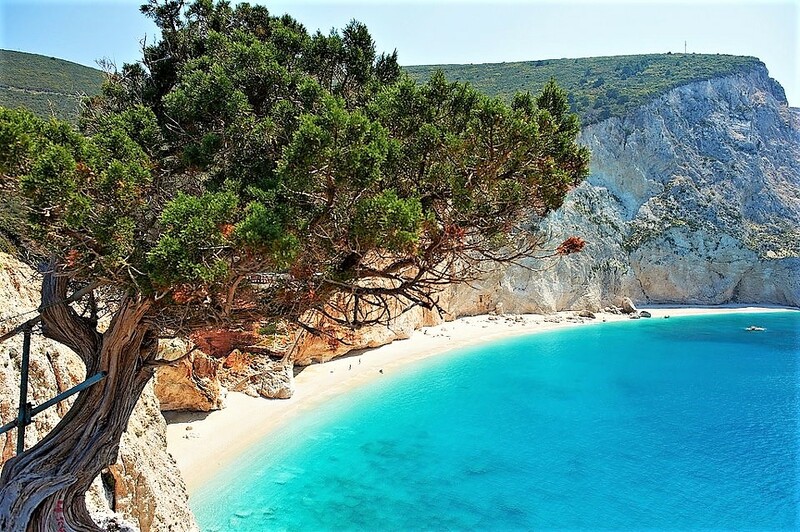 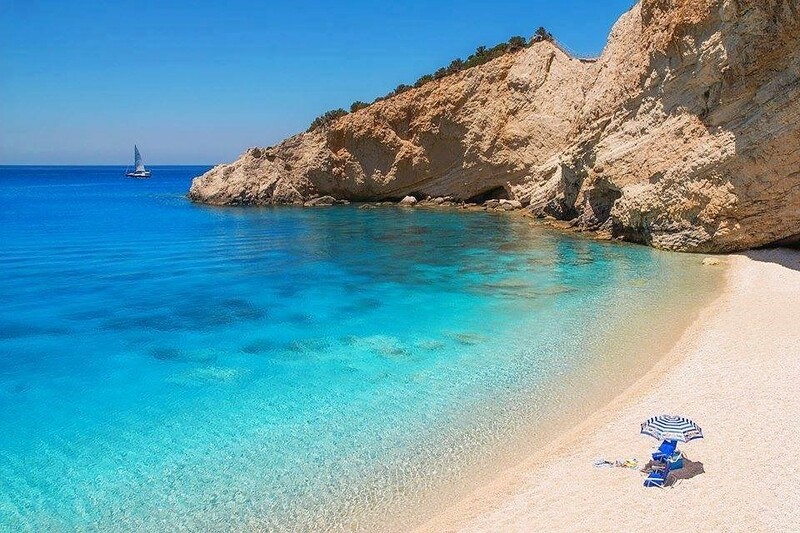 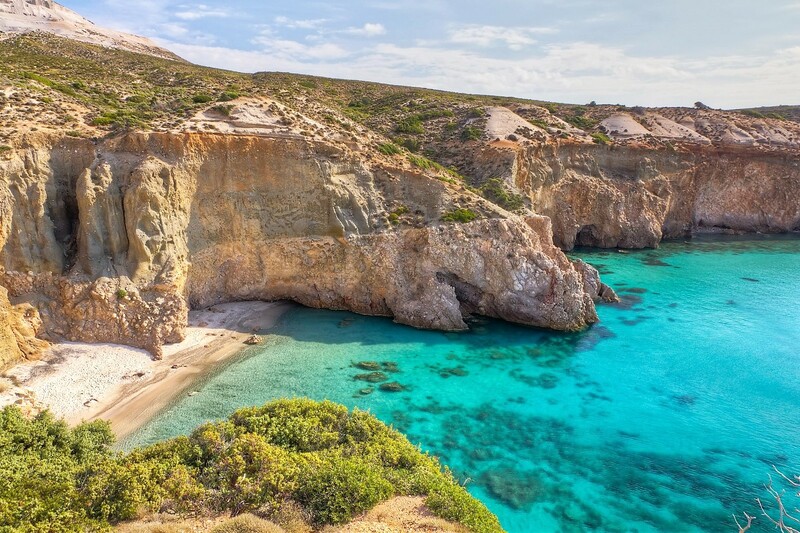 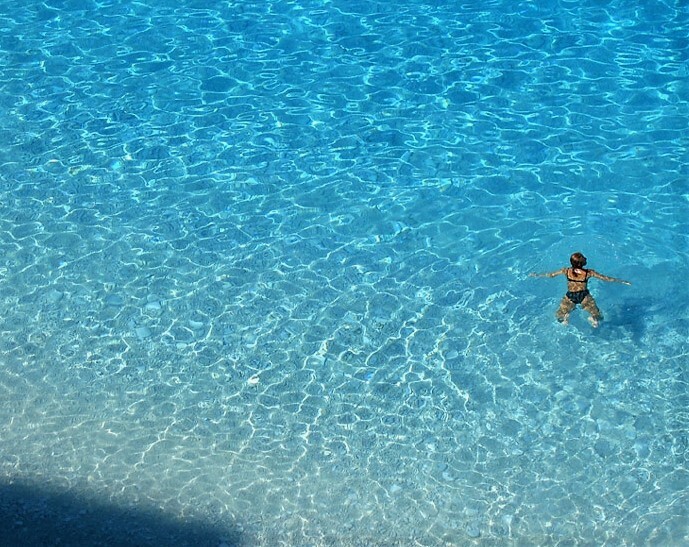 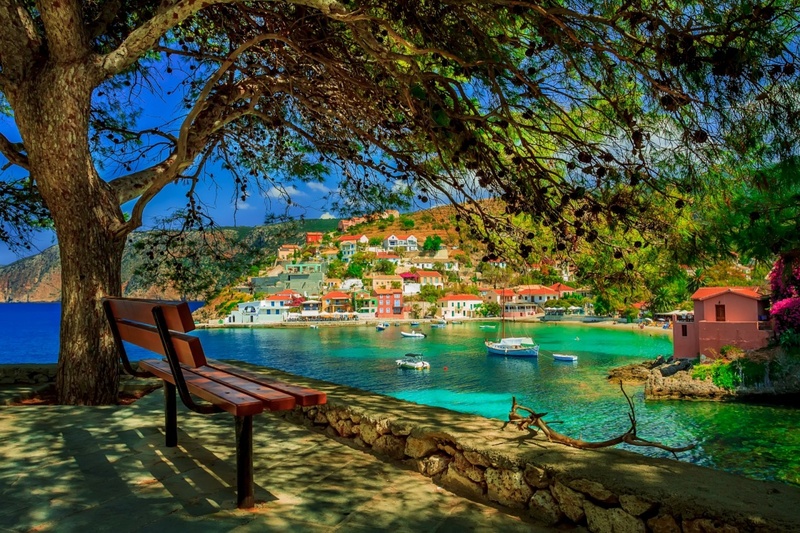 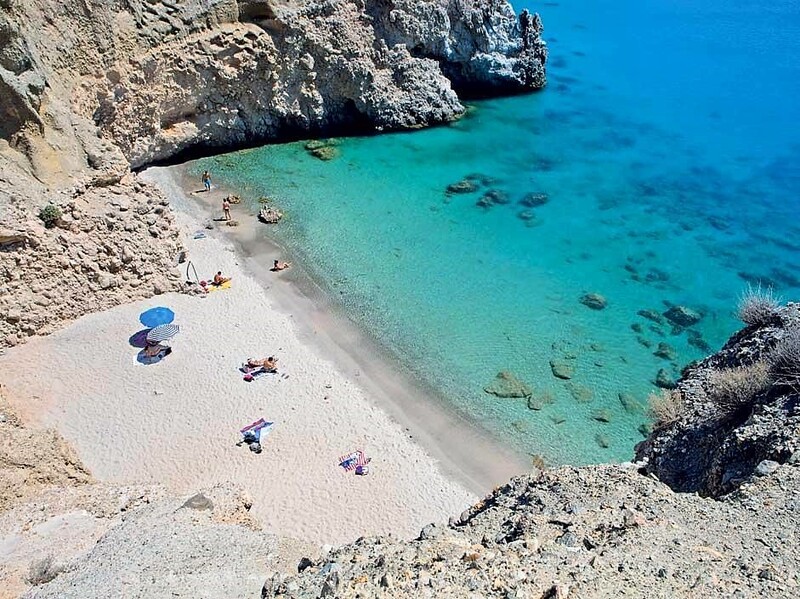 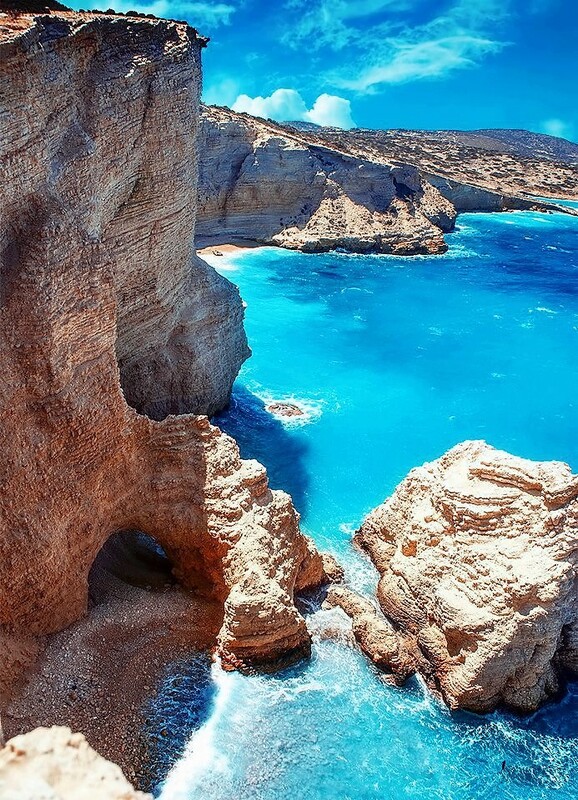 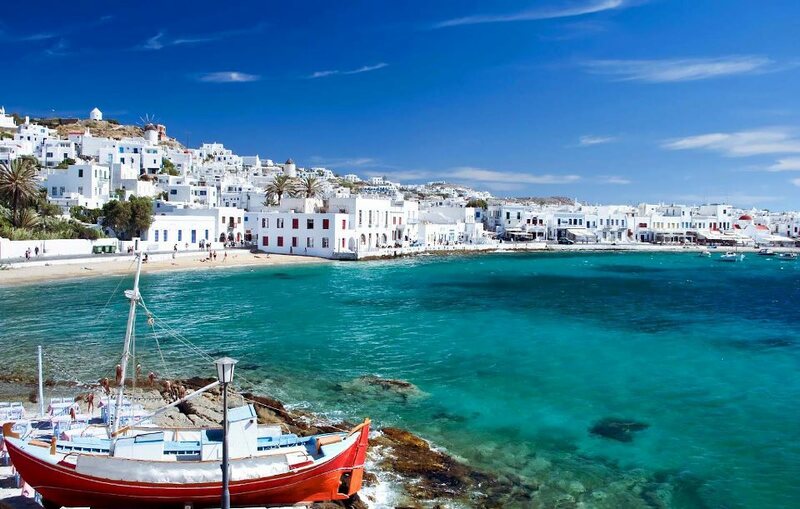 Although the country and its islands do experience rain, they also get a lot of sunshine, which is one of many reasons why Greece is such a popular holiday destination. 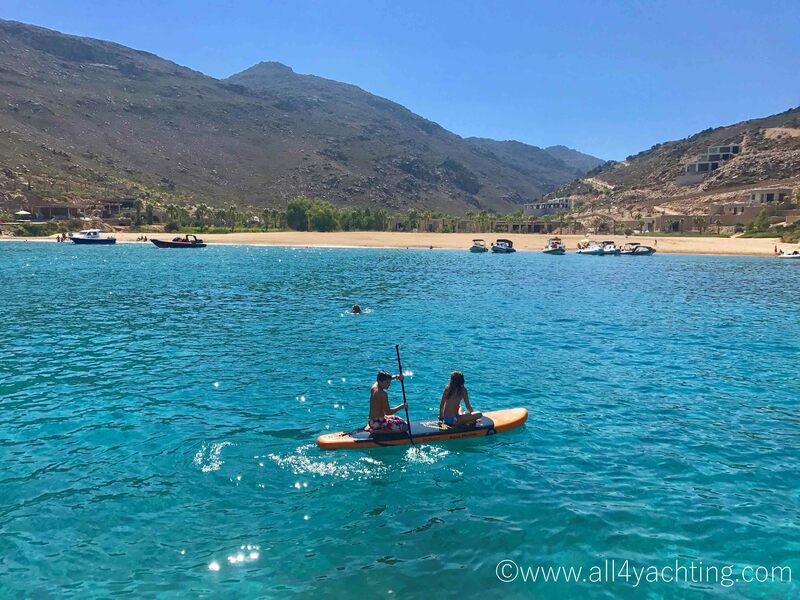 You will have ample opportunities to soak up the sun on one of the many beautiful beaches you come across as you sail around the islands, or you can simply stretch out on the deck of your yacht and top up your tan while you’re cruising from one spot to the next. 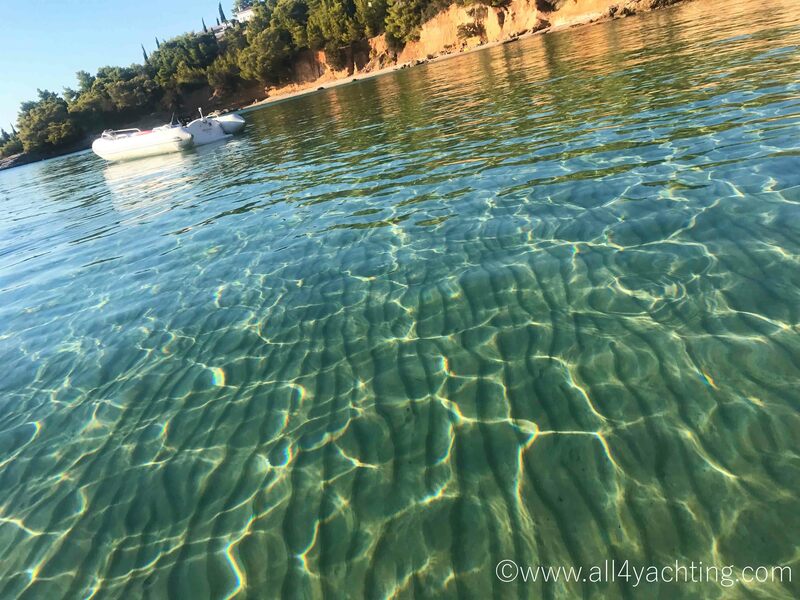 The winter months are when the majority of the rain falls, and as many sailing centres don’t operate at this time of the year, it’s easy to avoid the worst of the weather and look forward to sunshine on your holiday. 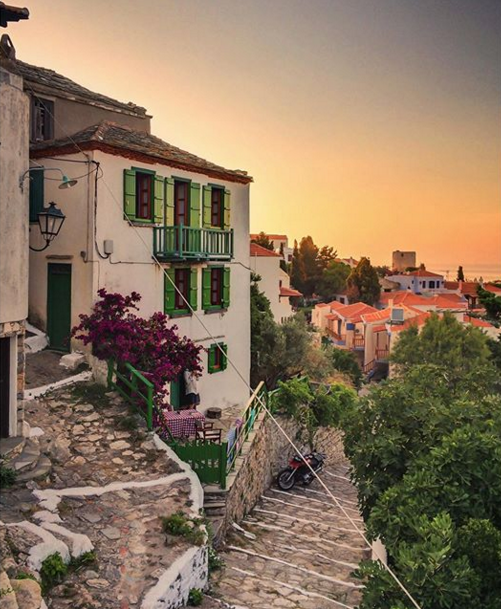 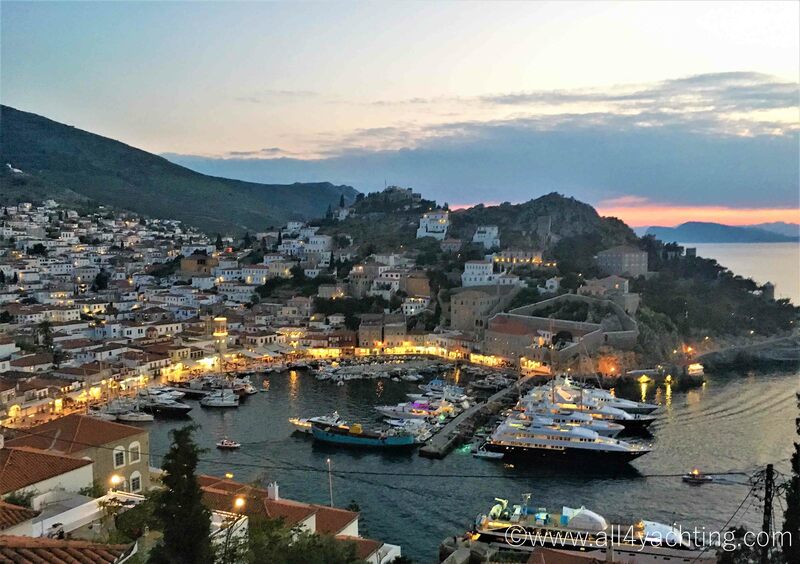 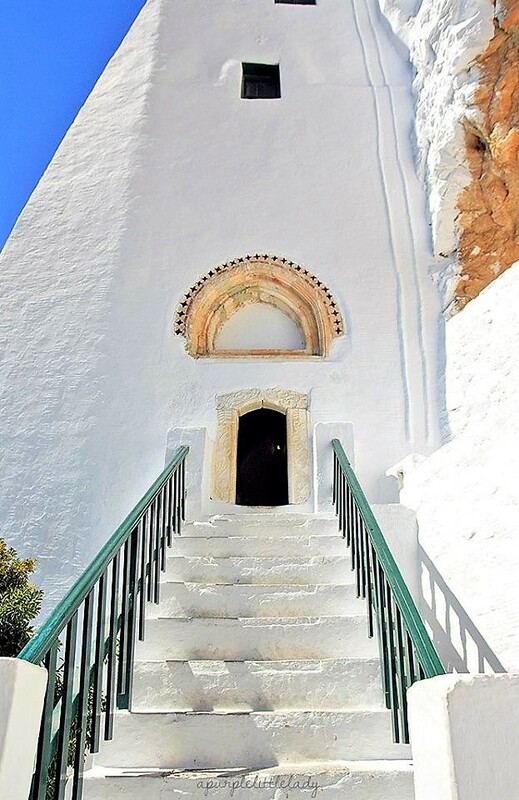 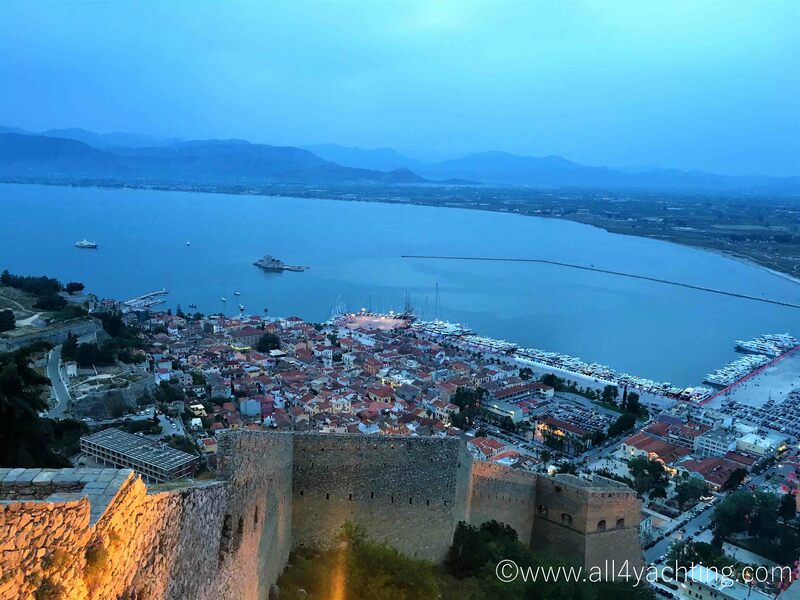 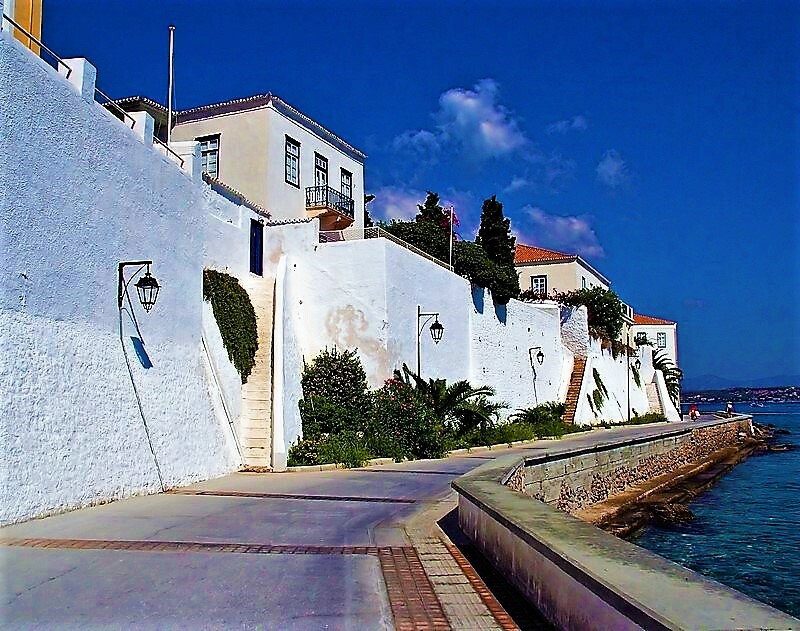 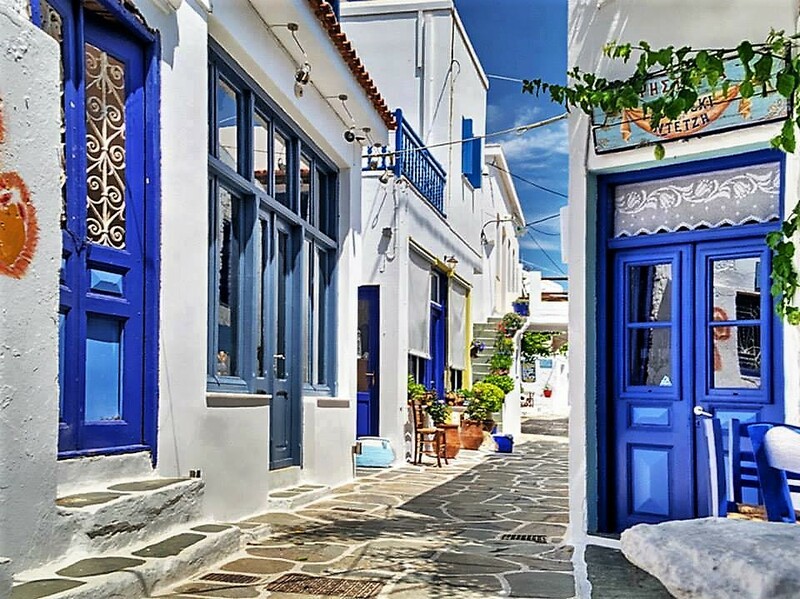 While many people flock to Athens each year to see its famous monuments, there are many more cultural and historical sites to be discovered on Greece’s islands. 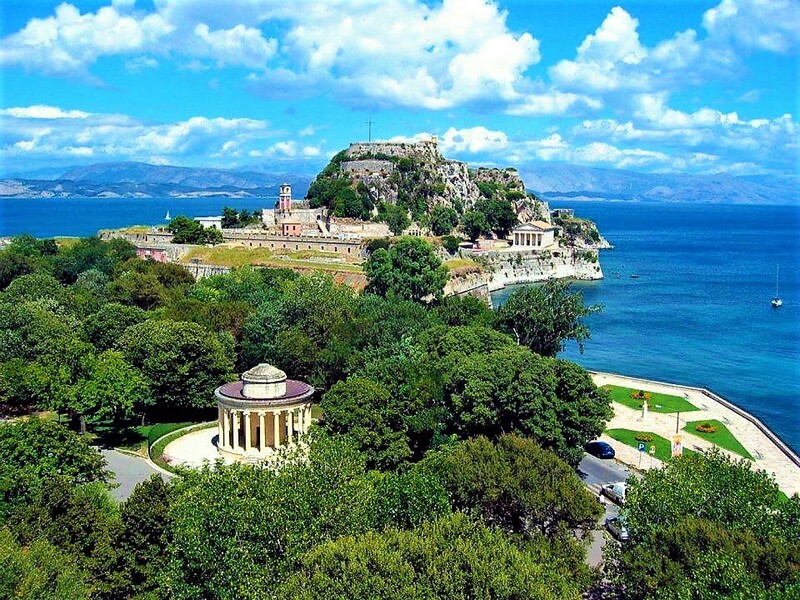 Some of these, such as Corfu, have retained many of their heritage sites and have an interesting story to tell about the powers who used to control the region. 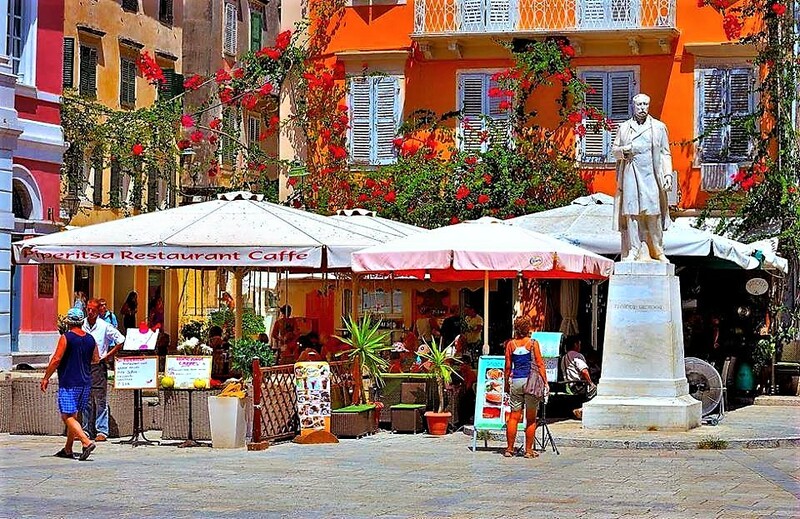 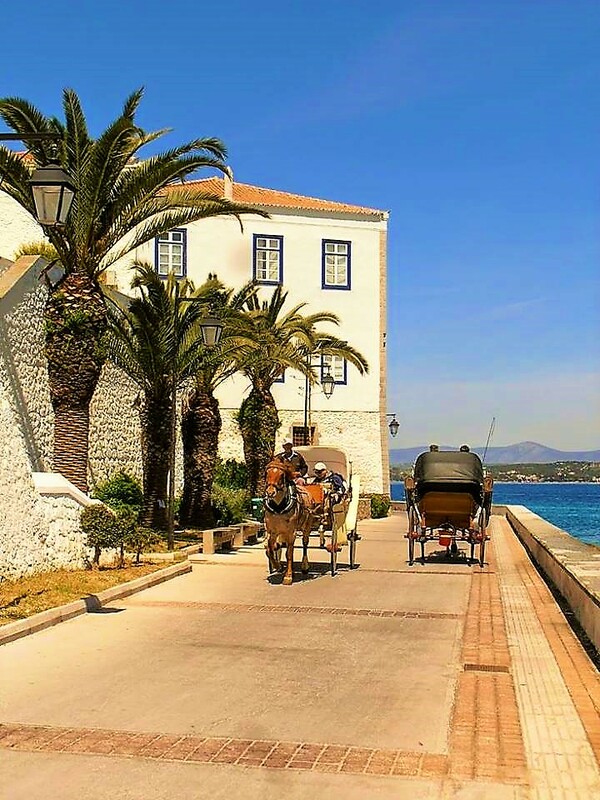 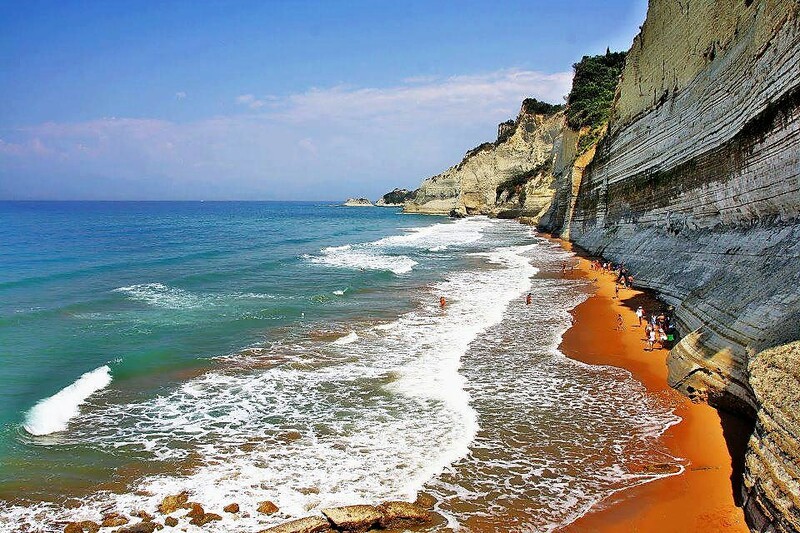 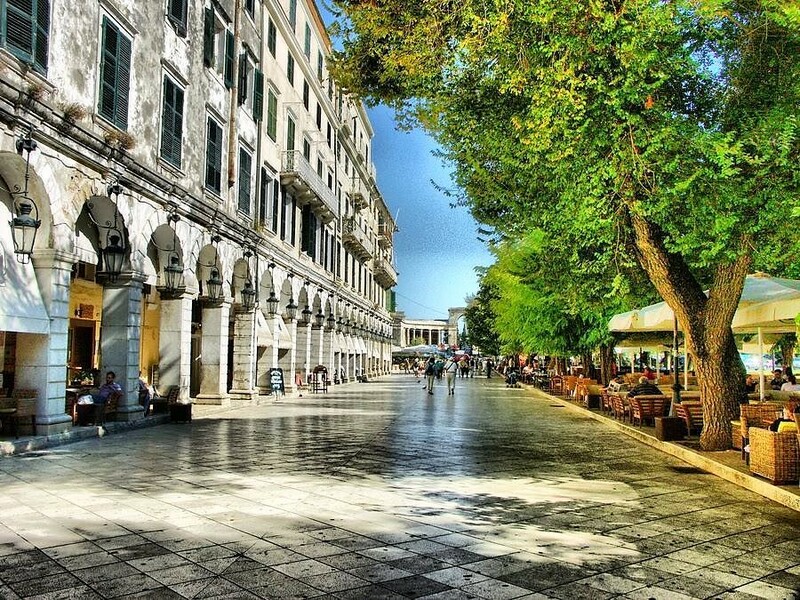 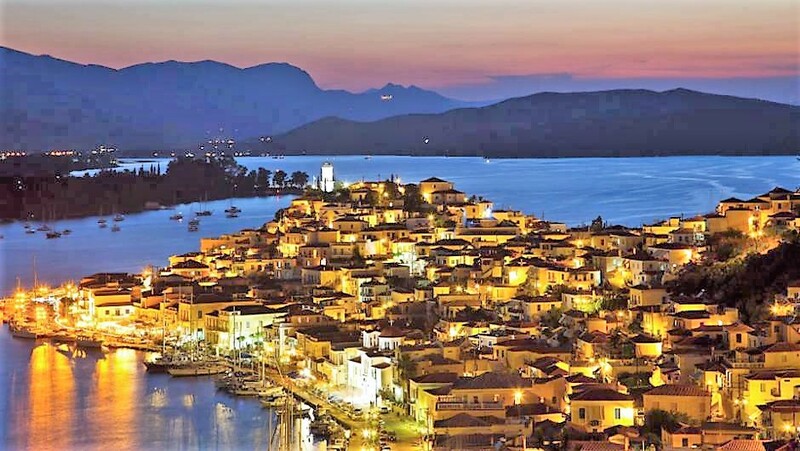 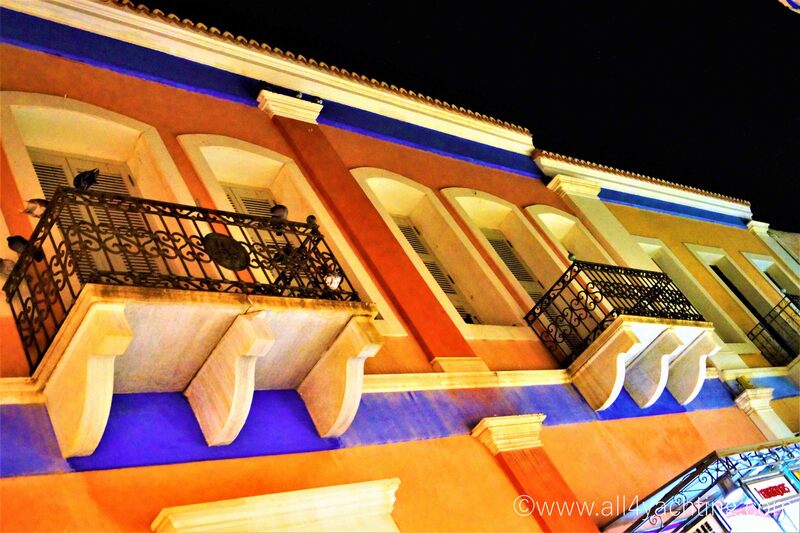 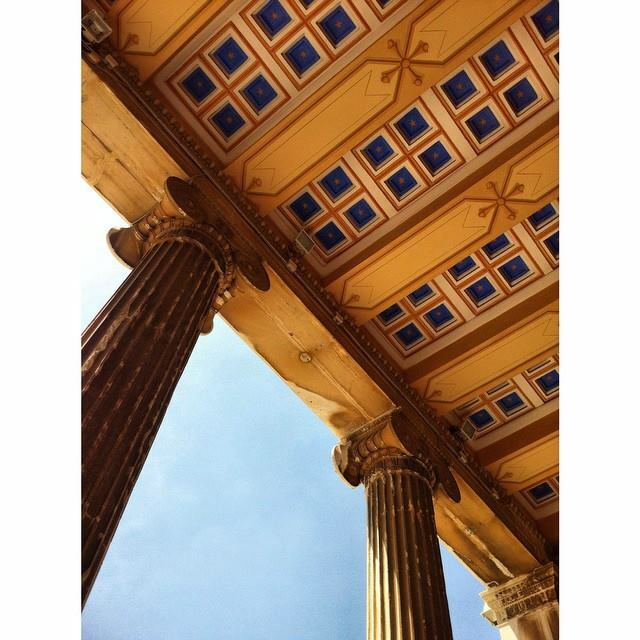 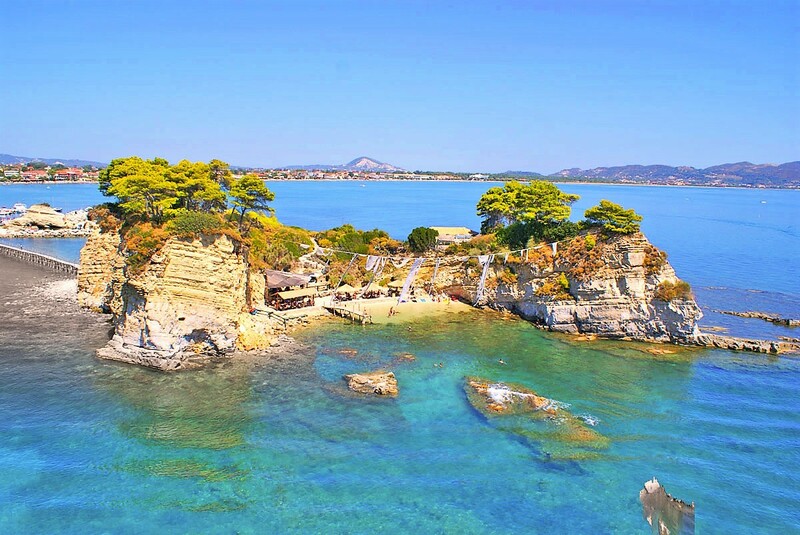 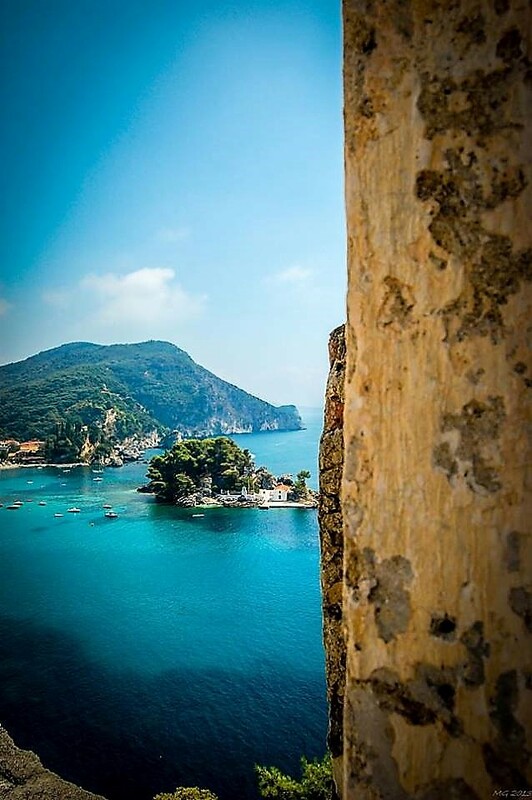 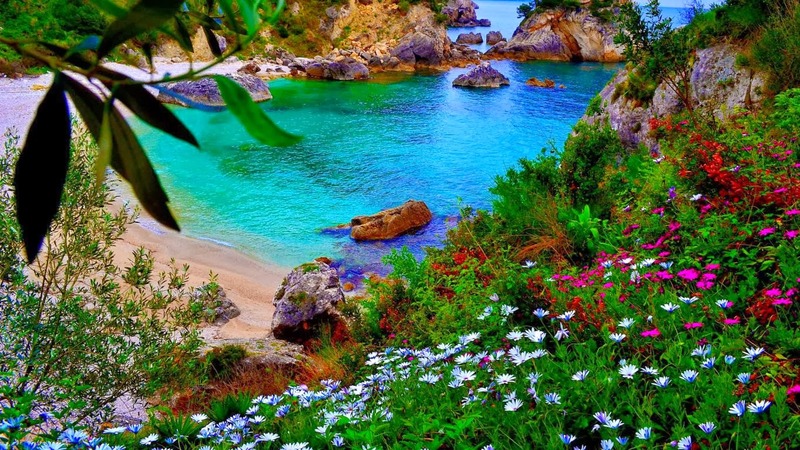 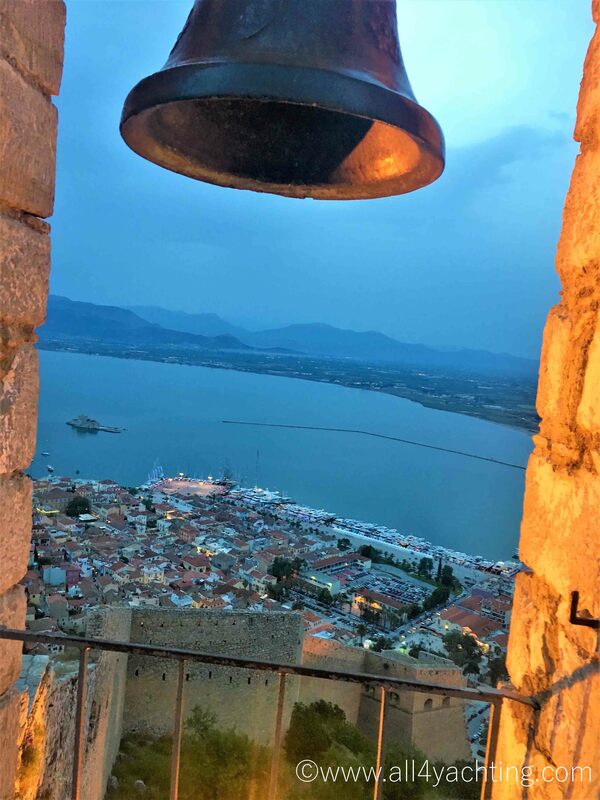 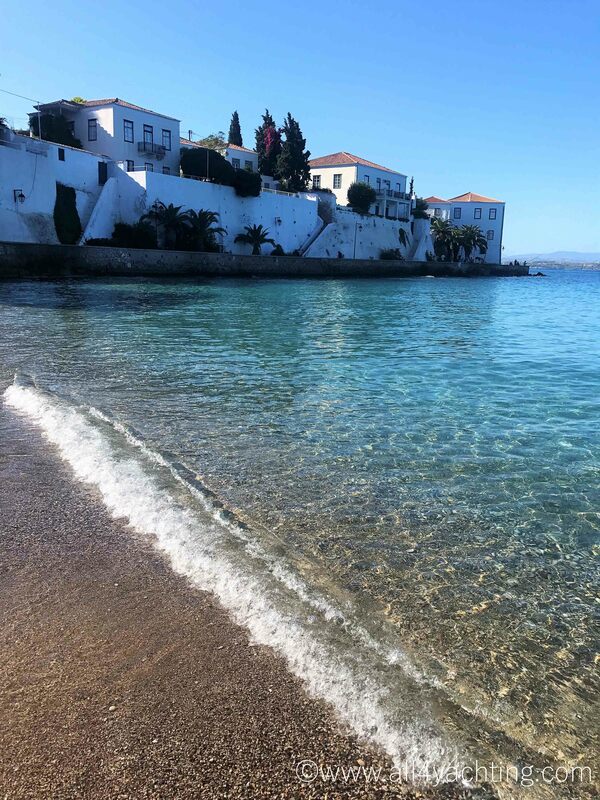 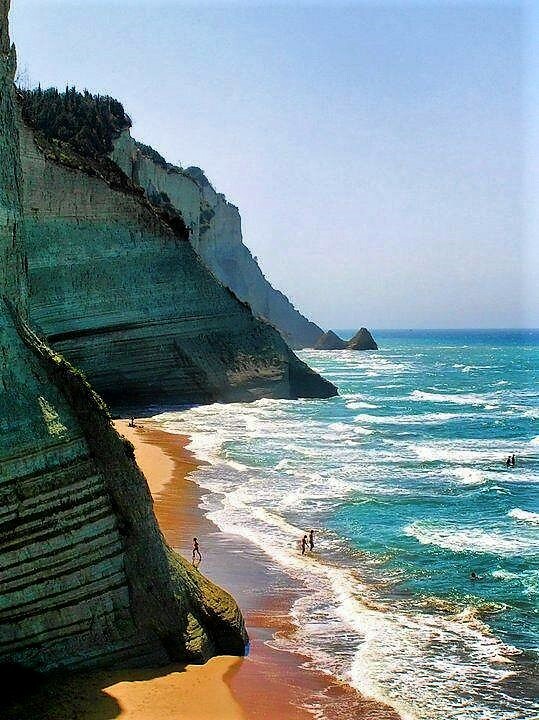 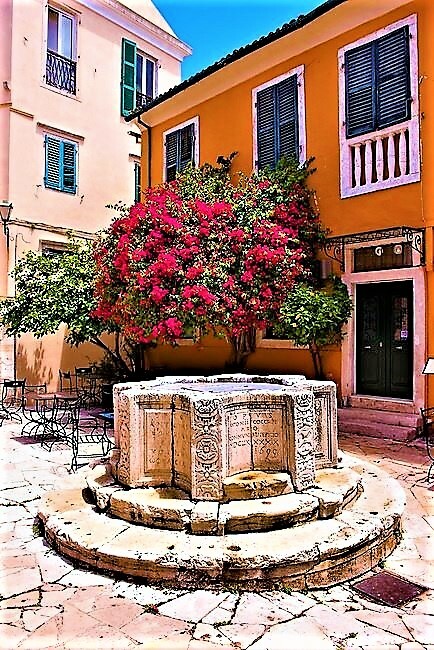 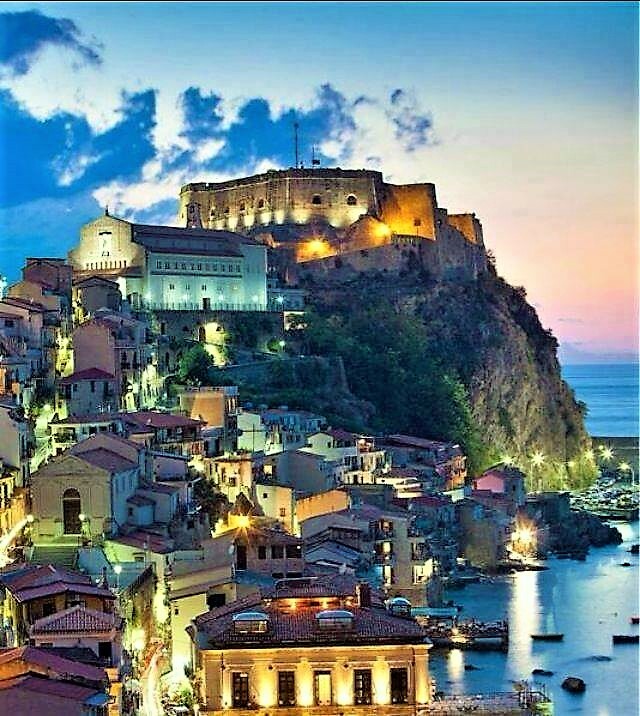 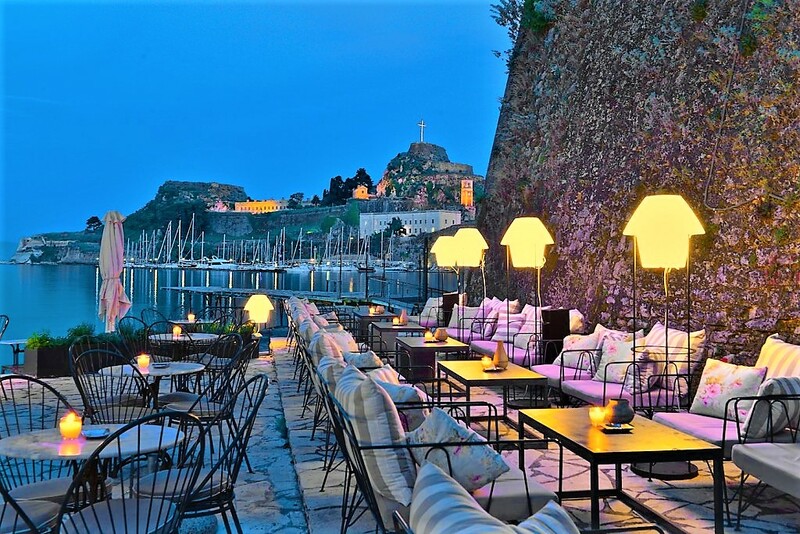 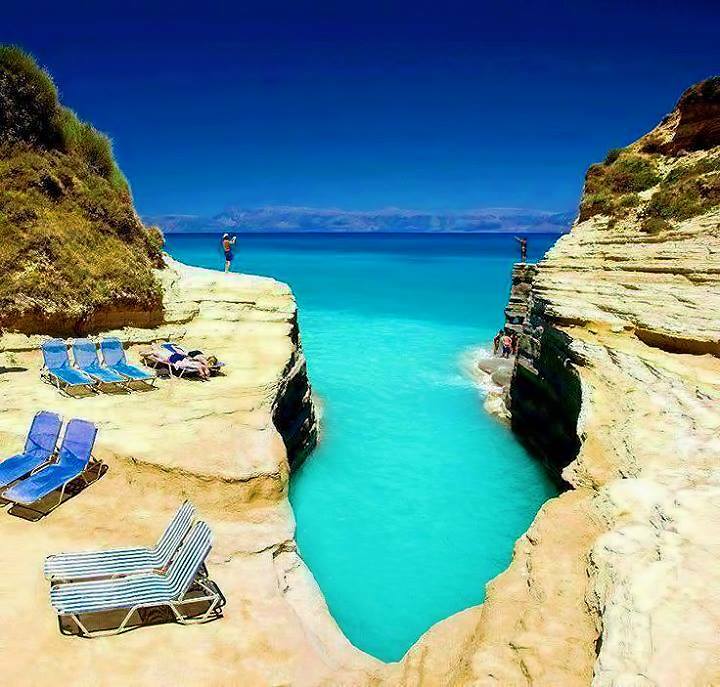 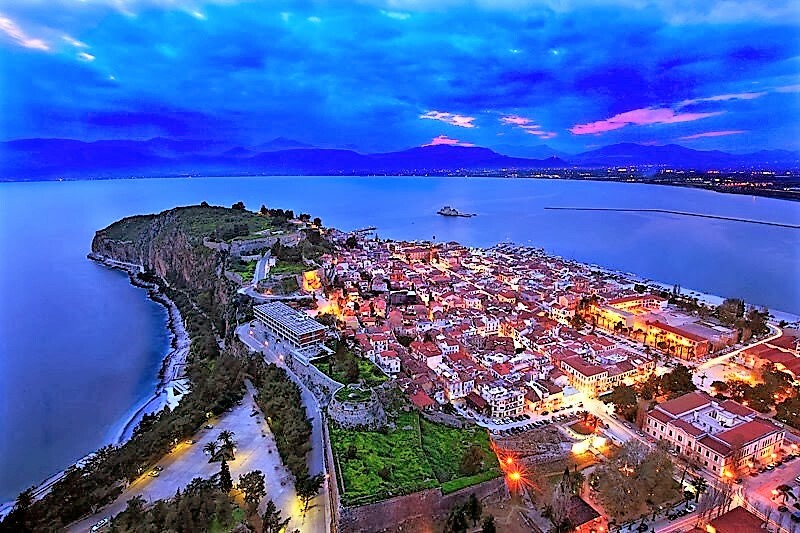 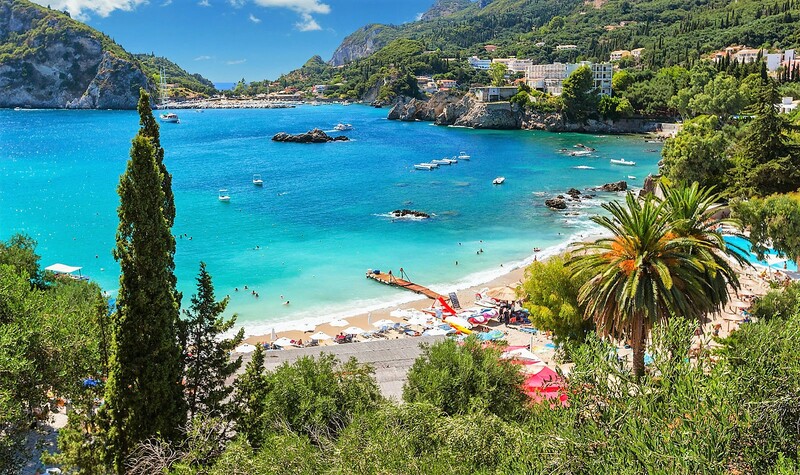 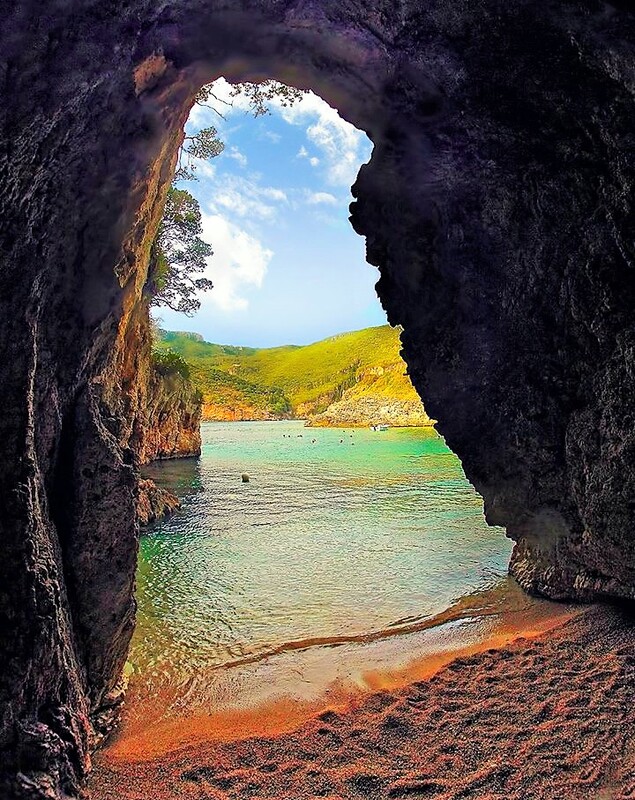 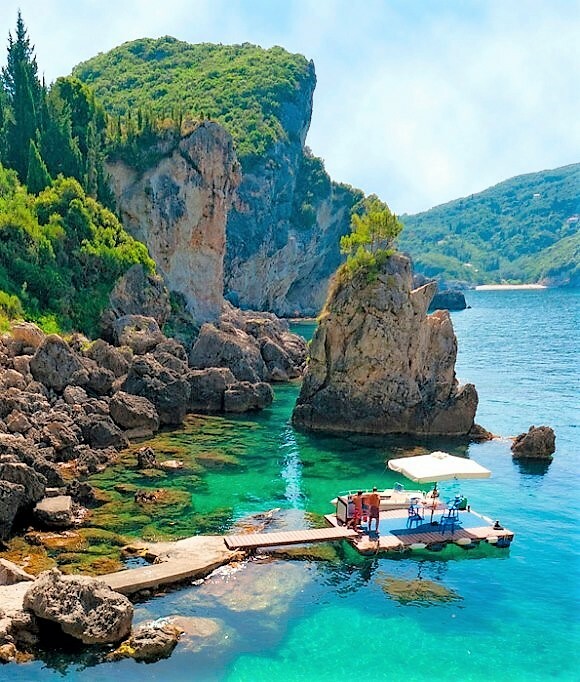 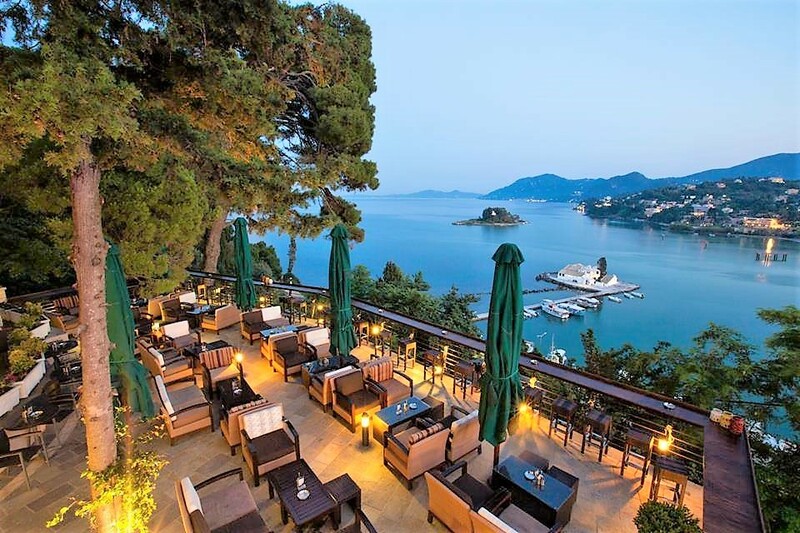 Corfu, for example, was ruled over by the Greeks, Byzantines, Venetians, French and British over the centuries, giving it a fascinating mix of architectural styles and cultures. 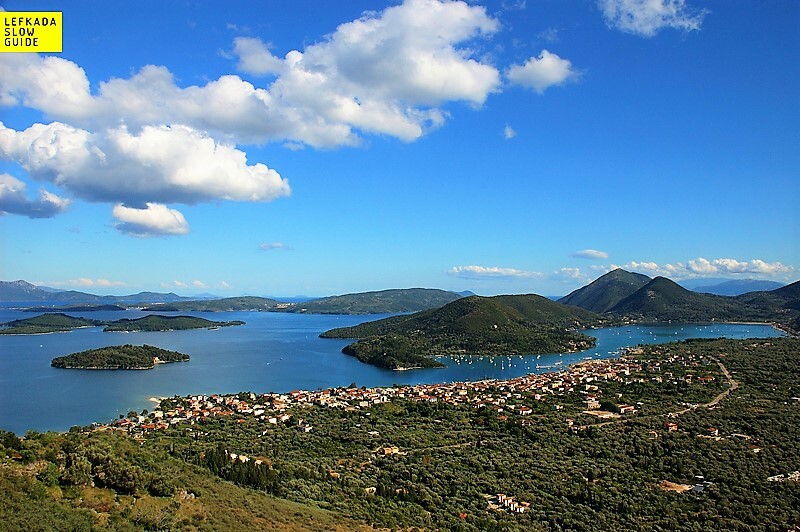 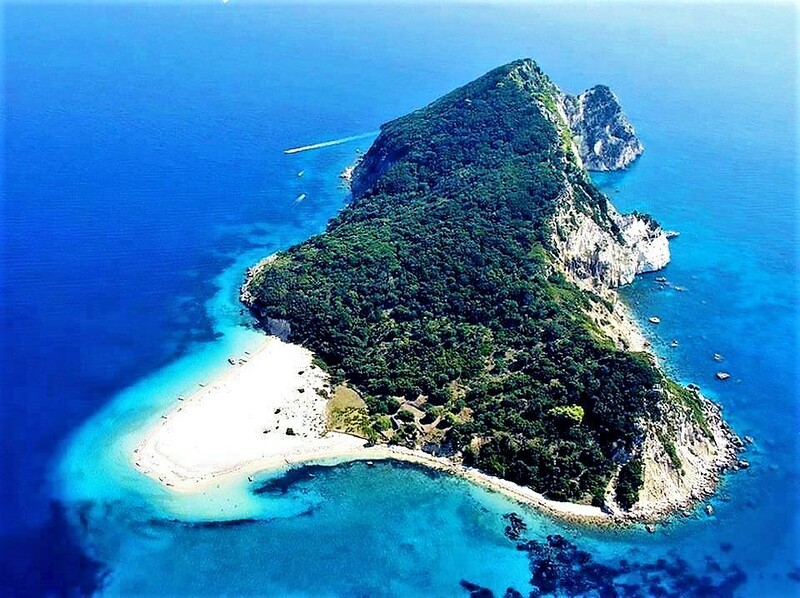 In fact, the Ionian islands (of which Corfu is just one) were among the few parts of the Greek Empire that didn’t end up in the hands of the Ottomans, and so provide a wonderful insight into some of the other great historical powers. 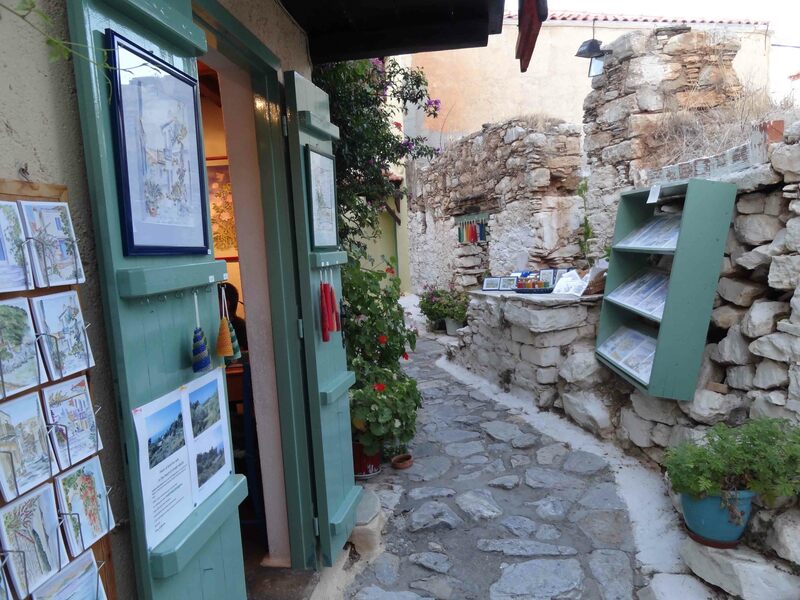 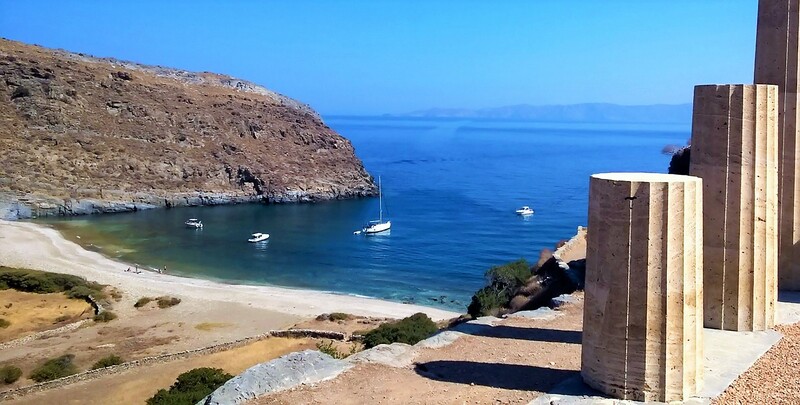 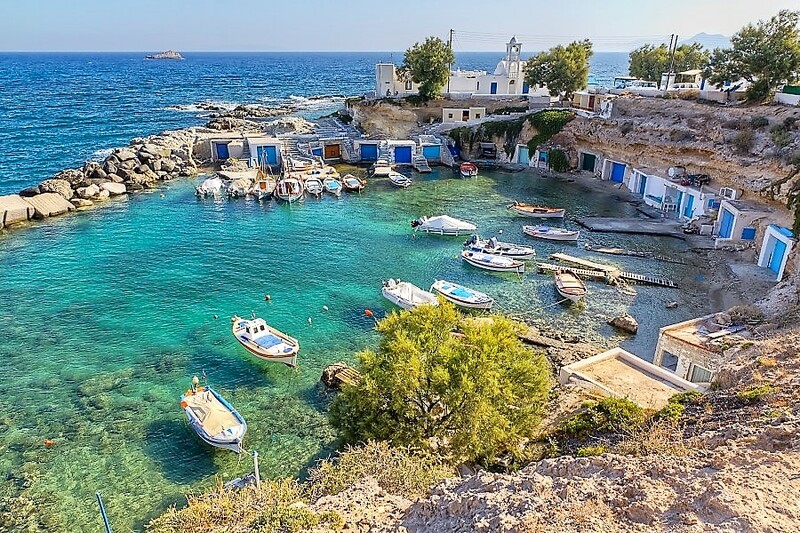 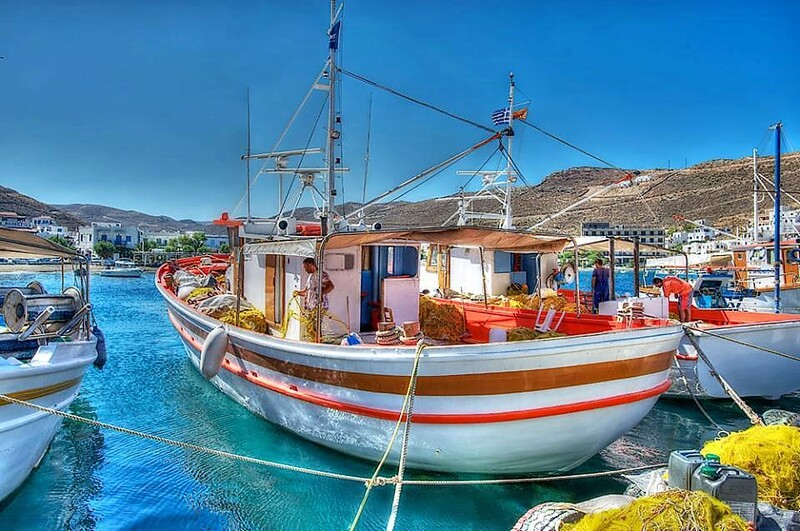 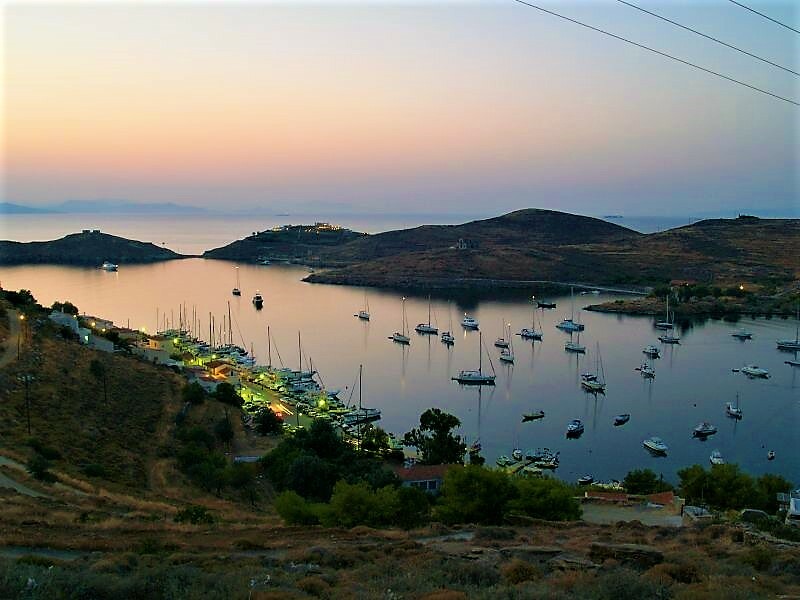 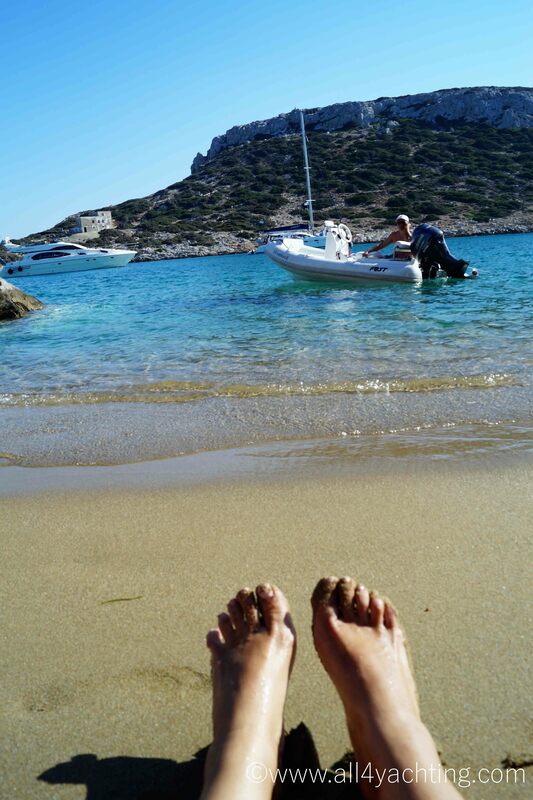 Many of Greece’s other islands, including Ithaca, Hydra, Salamina, Kea, Anafi and Delos, have connections to Greek mythology that you can uncover during a sailing holiday - hearing these stories is a fantastic way to engage with the local culture and history. 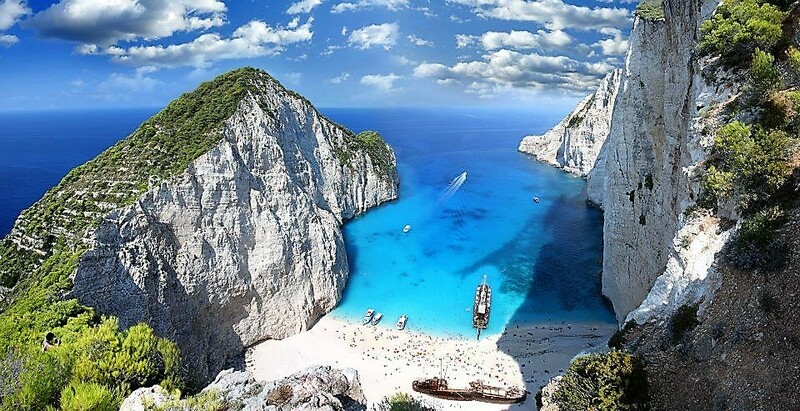 Greece can be divided into 5 main cruising areas. 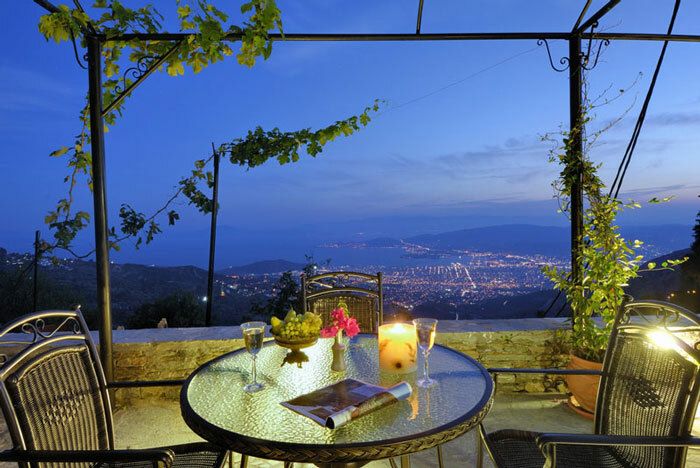 Each area has distinct advantages to offer. 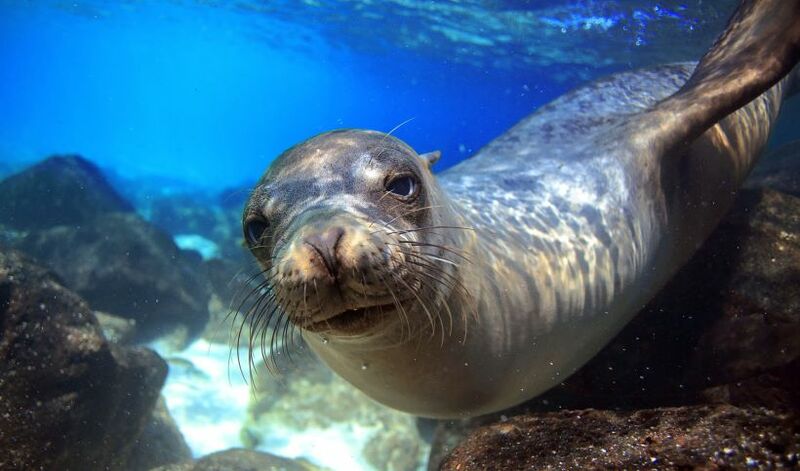 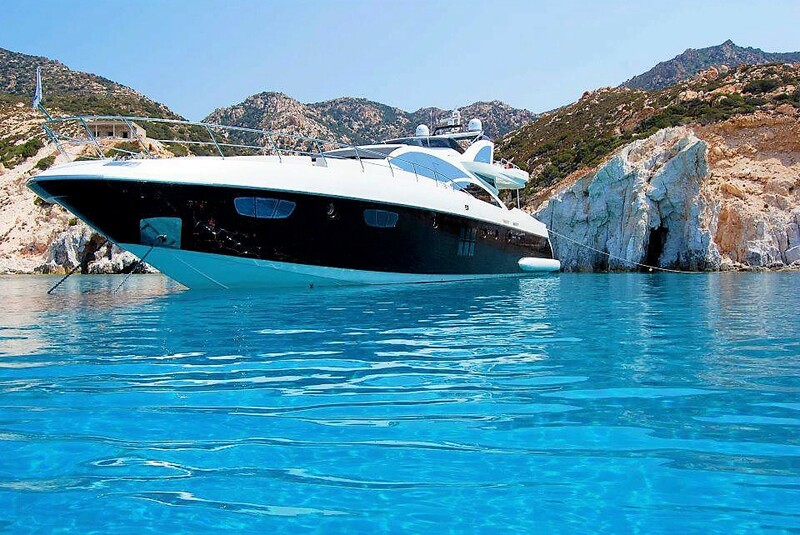 Their common characteristic is that are unique and ideal for yachting. 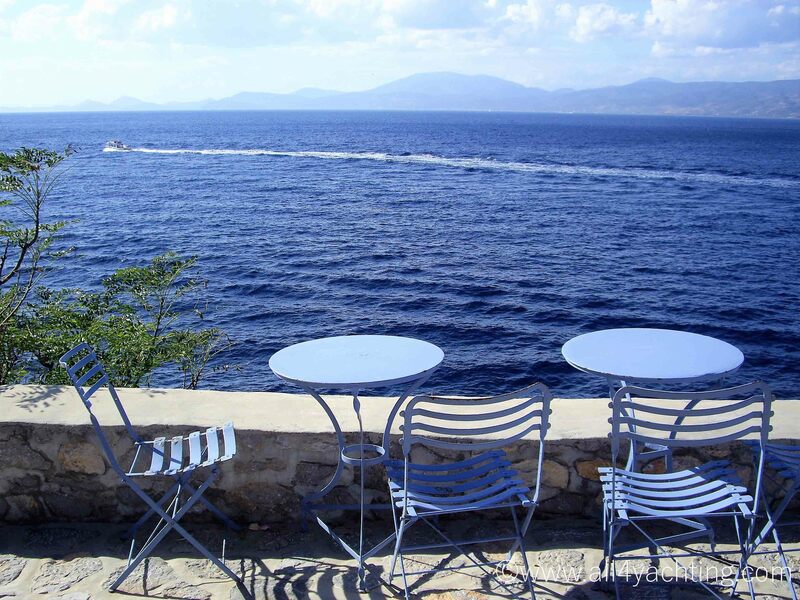 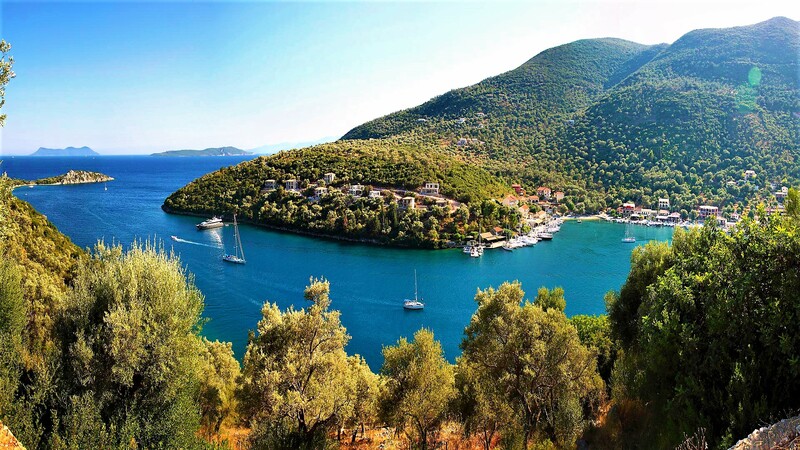 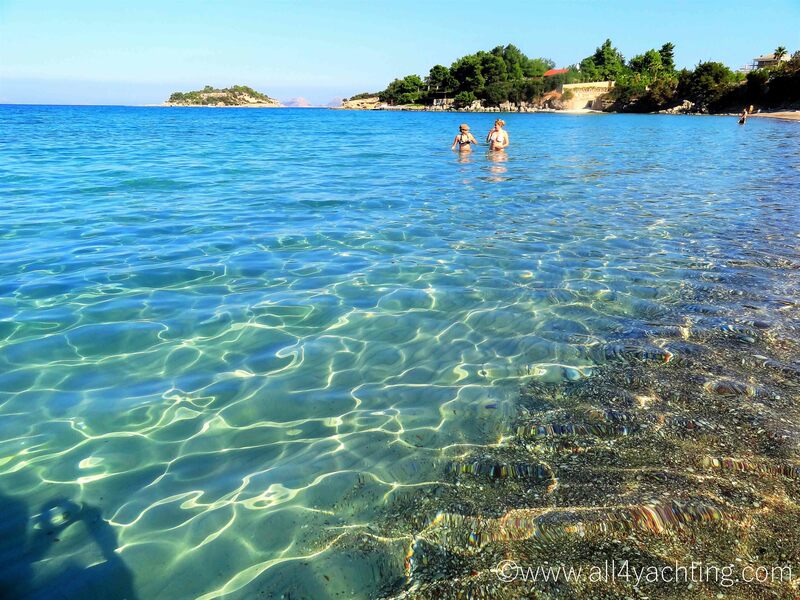 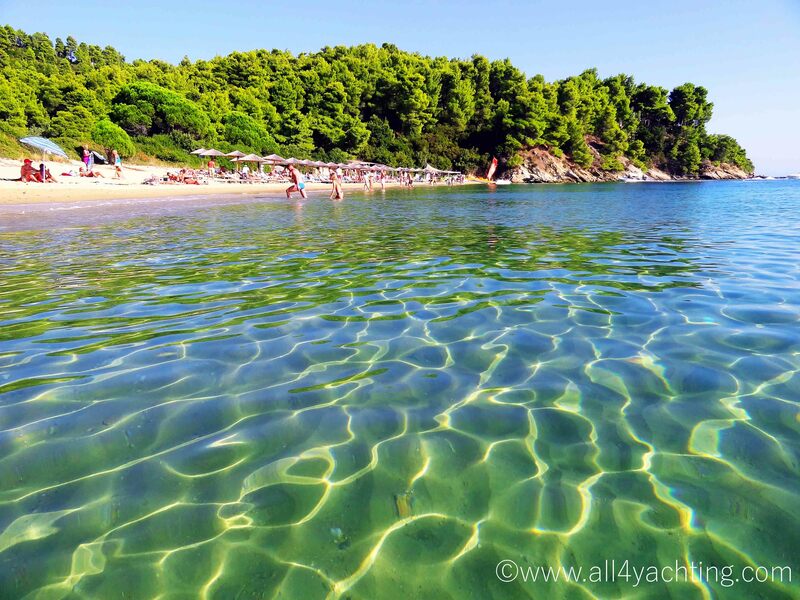 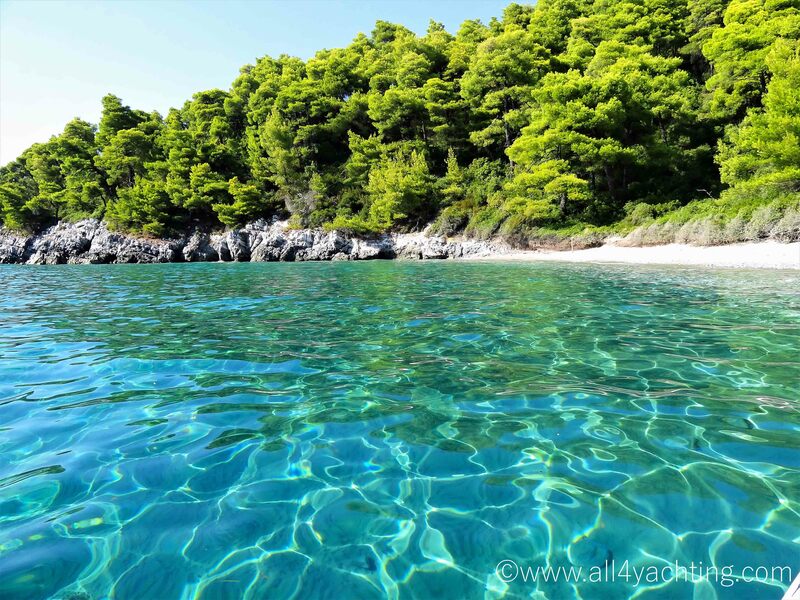 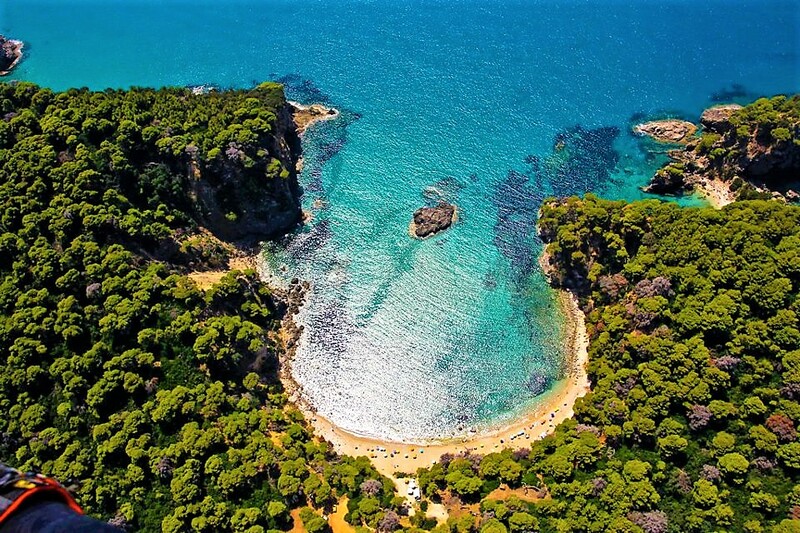 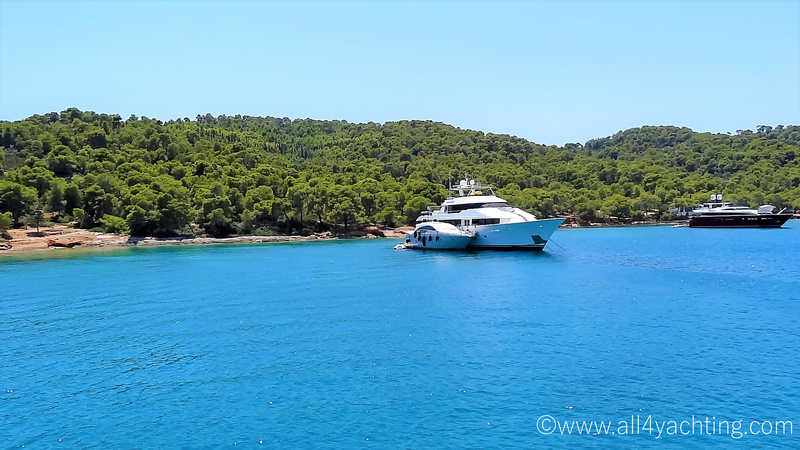 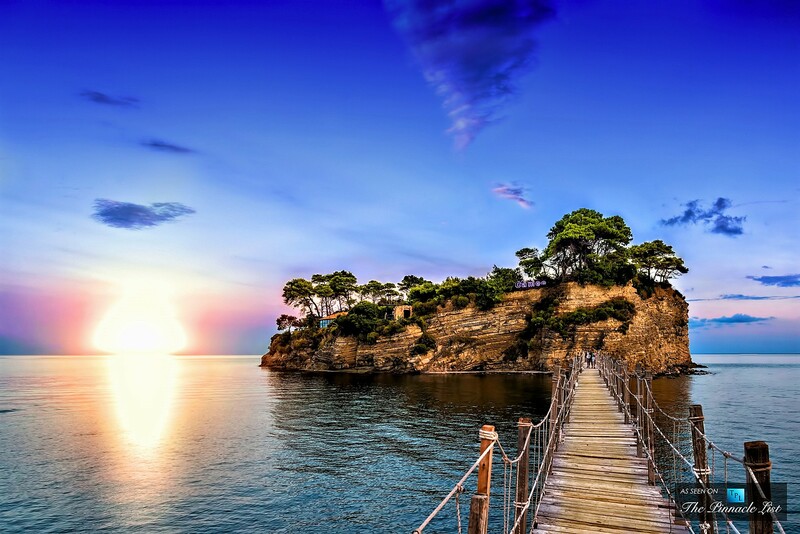 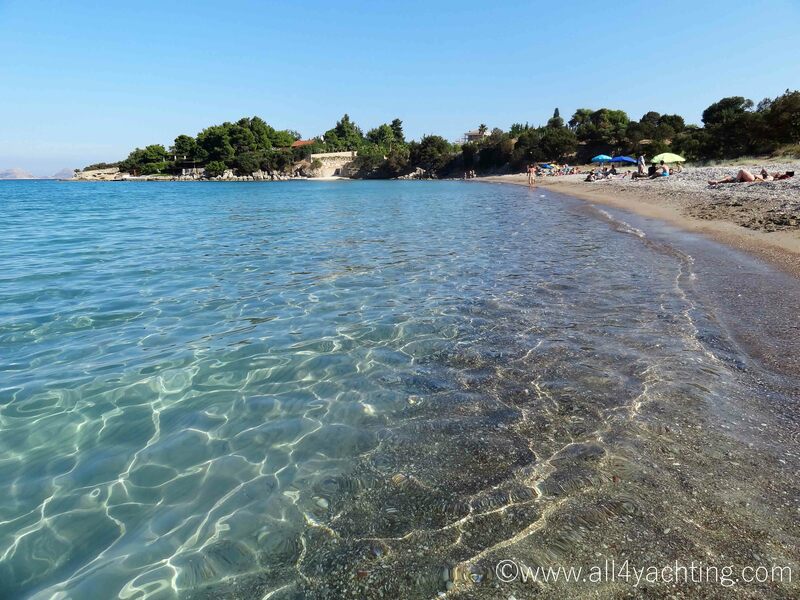 The Saronic Gulf & Argolic Gulf & Peloponesse east coast is the ideal destination for those who wish to explore the unparallel beauty of the Greek Islands but with sort cruising time and ideal calm weather conditions. 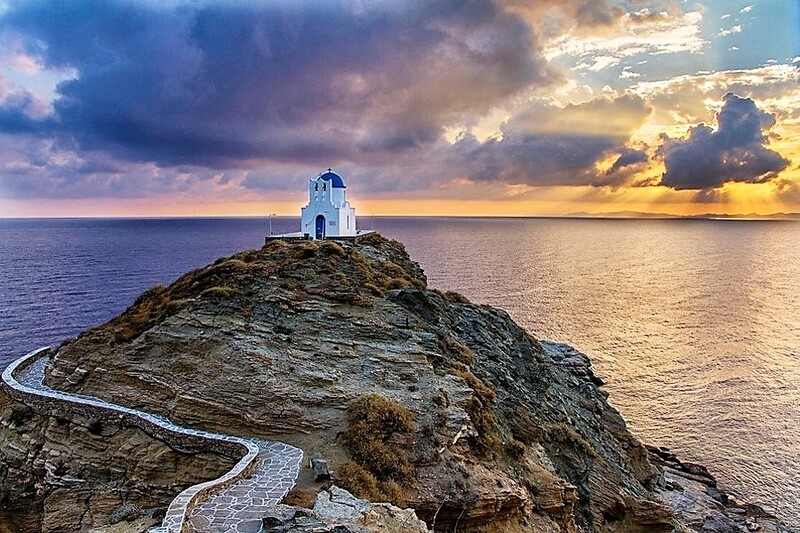 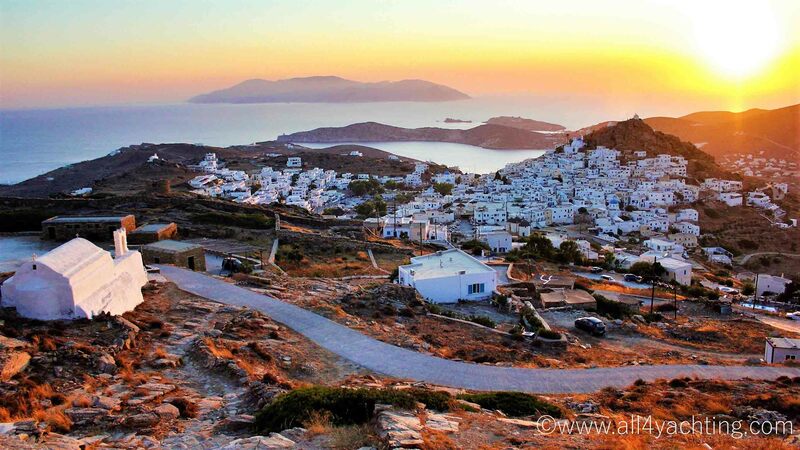 The Cyclades island complex is found in the Central, Eastern and Western Aegean Sea and has twenty four (24) inhabited and many more uninhabited islands of small or medium size. 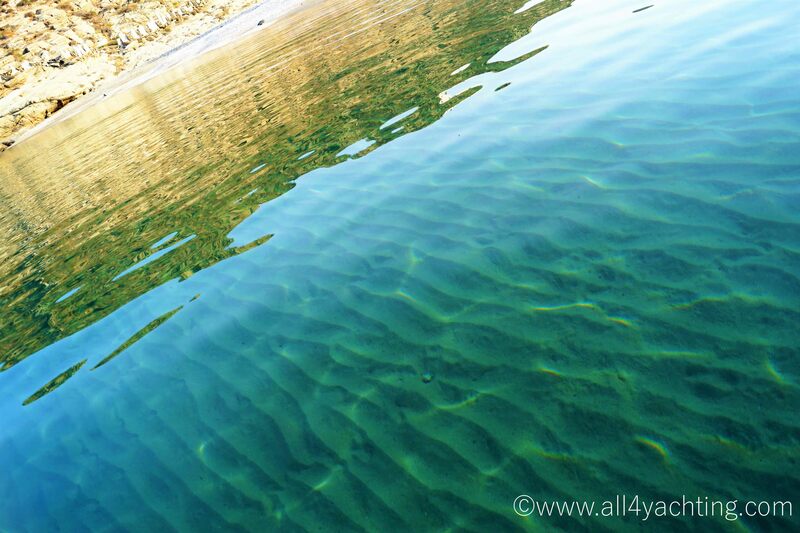 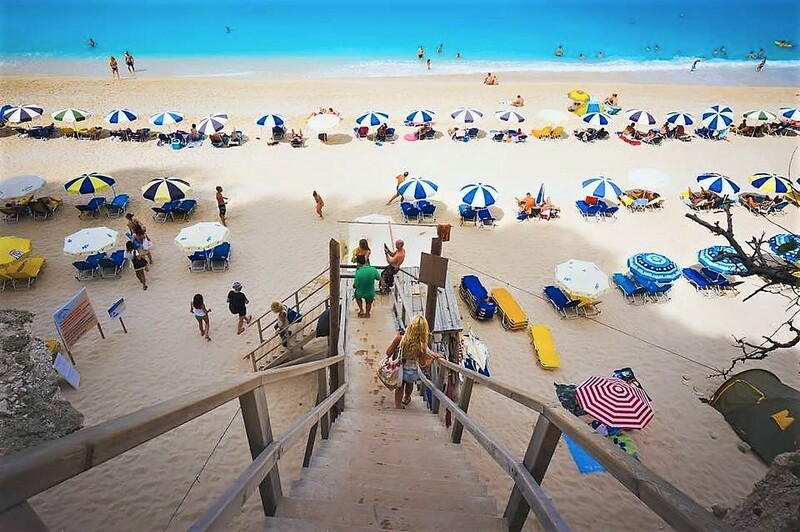 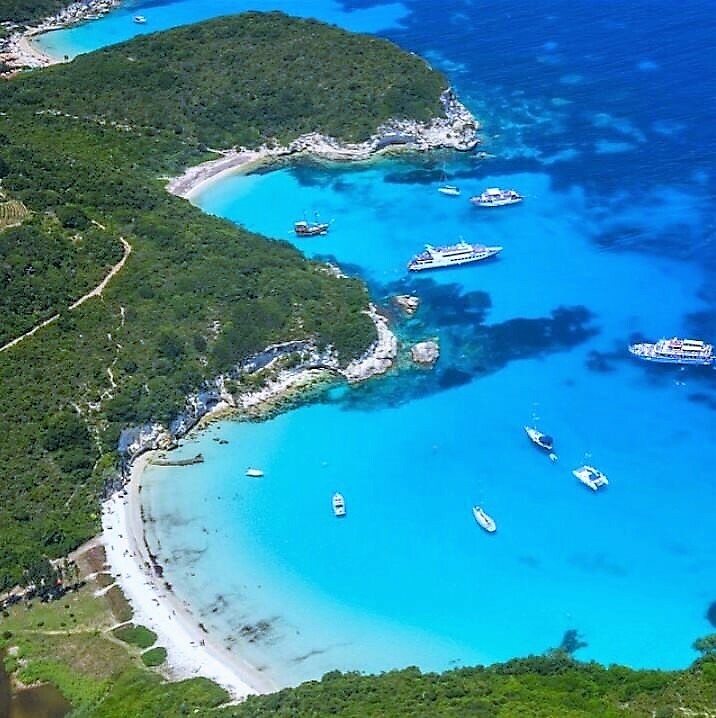 Thousands of amazing protected bays and beaches with golden sand and crystalline waters of all shades of blue, turquoise and green. 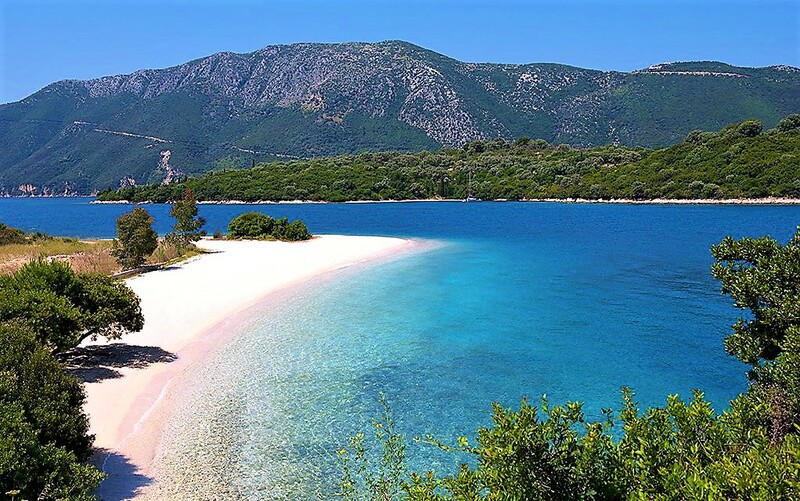 Each island has on average forty to sixty wonderful beaches of different kinds (isolated, organized, small, large etc) to choose from. 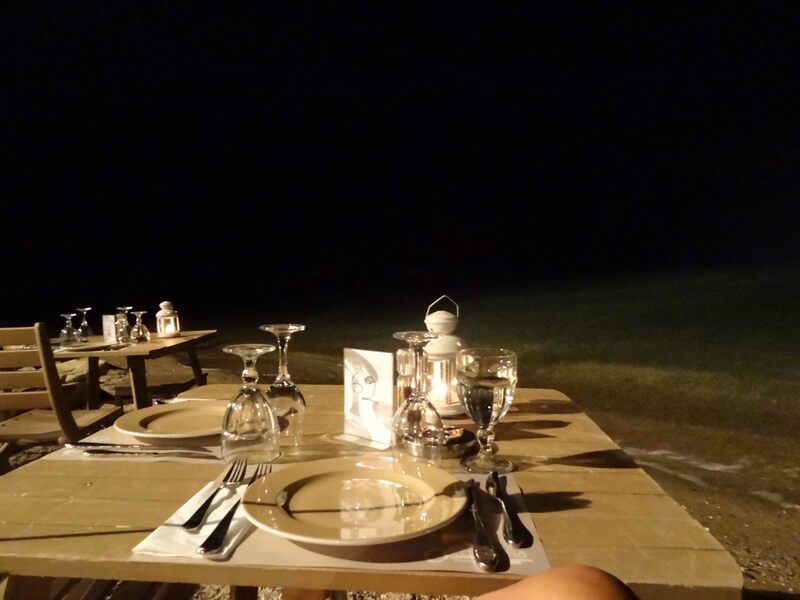 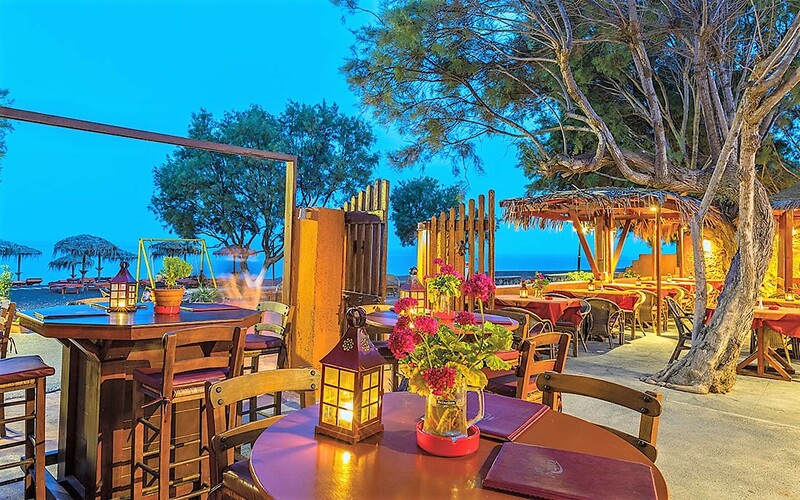 Numerous excellent dining and entertainment options. 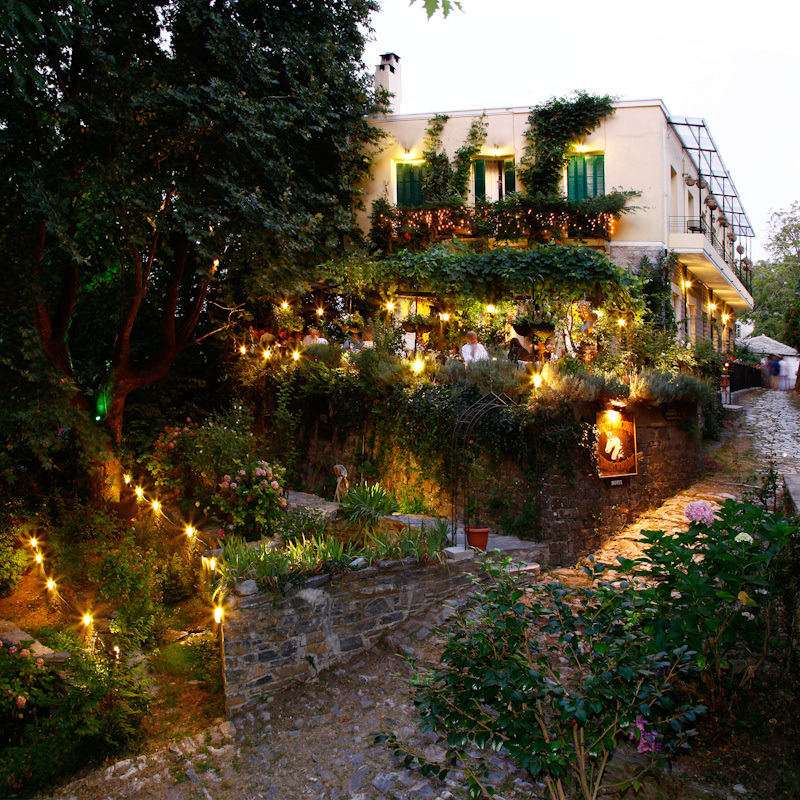 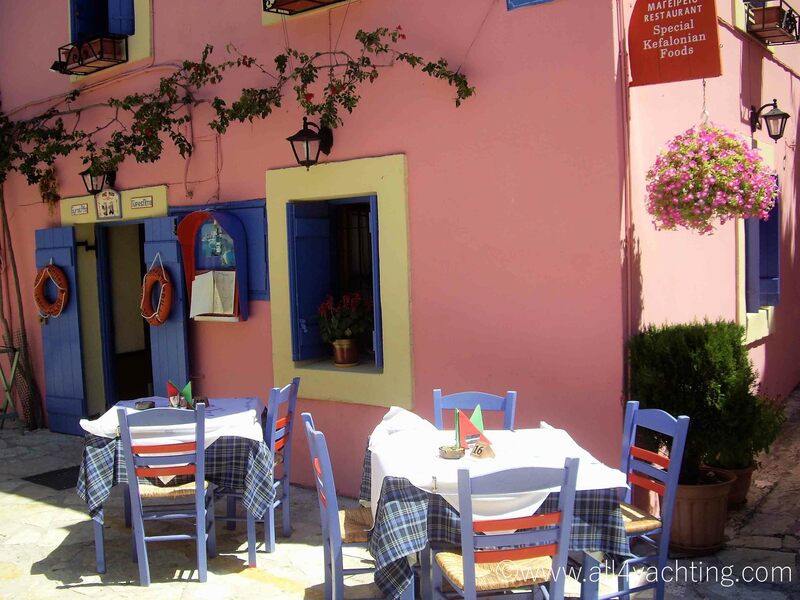 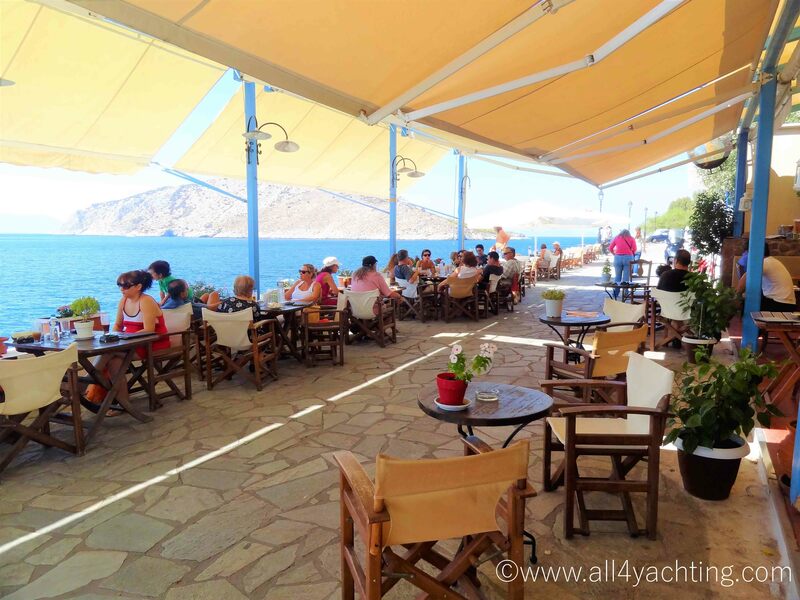 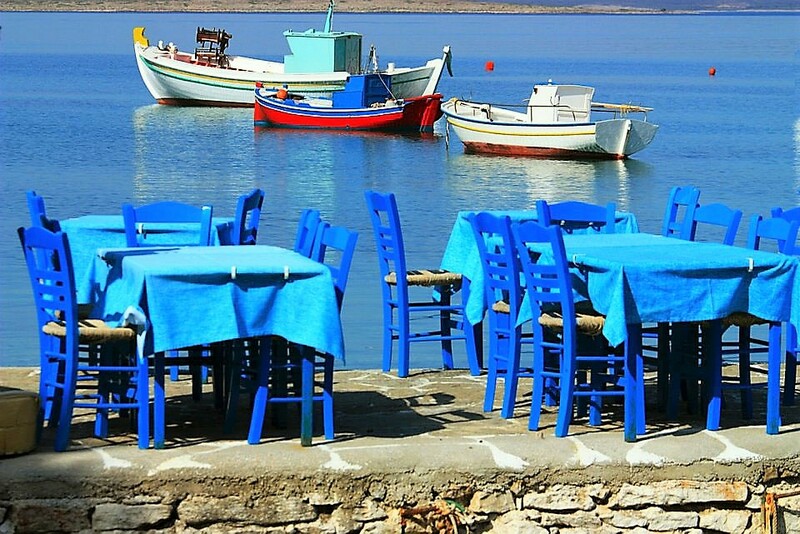 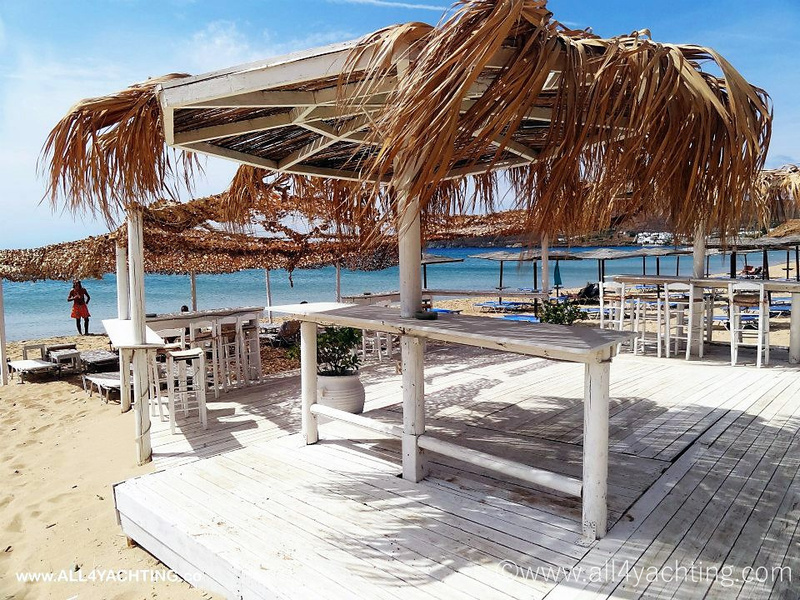 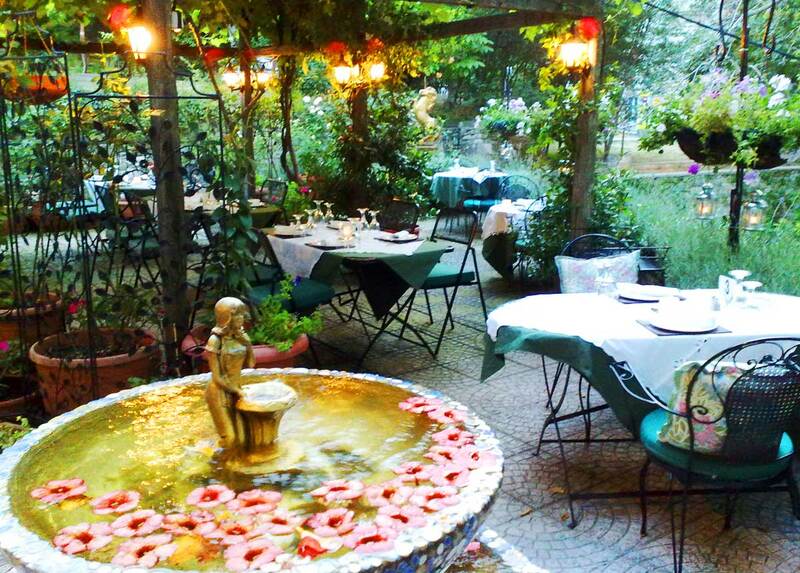 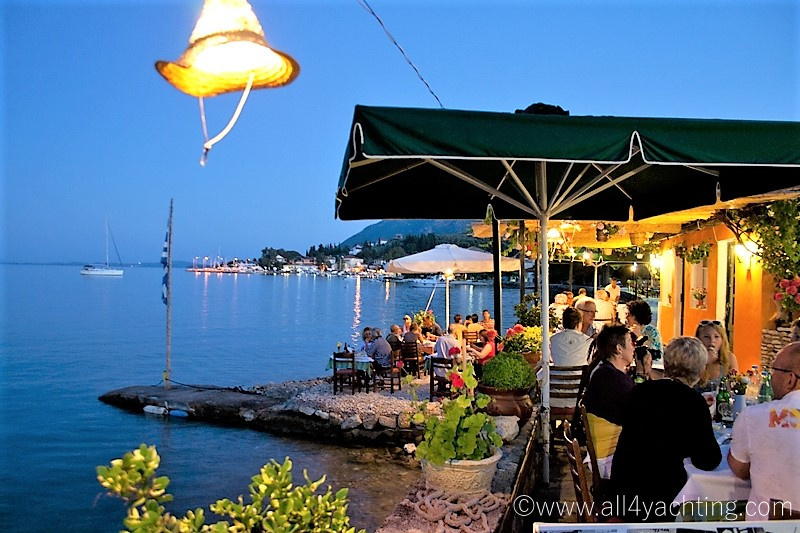 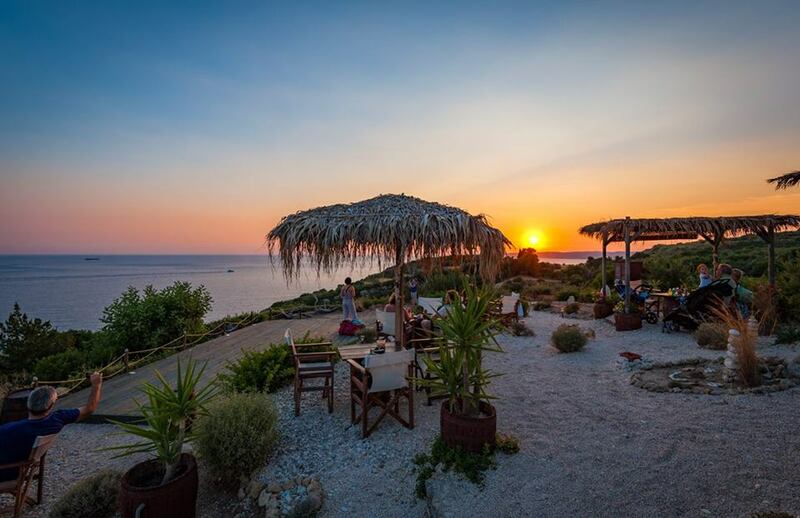 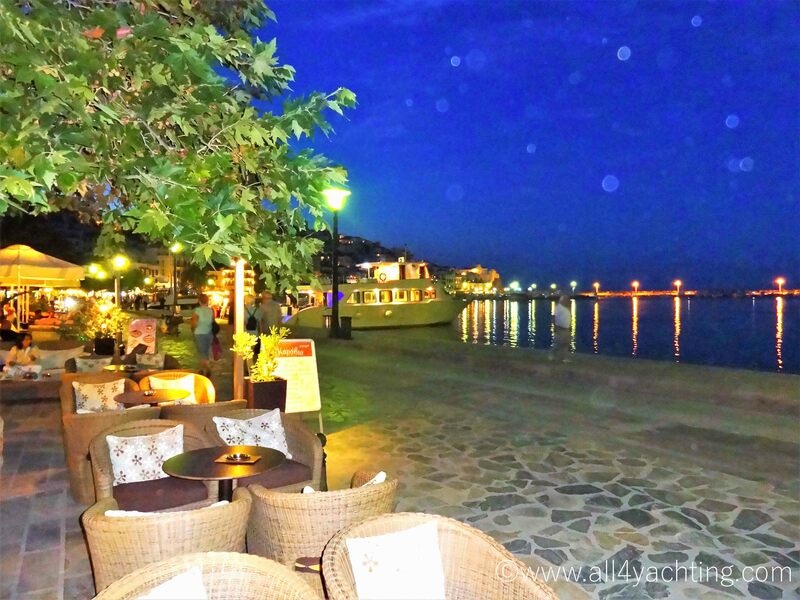 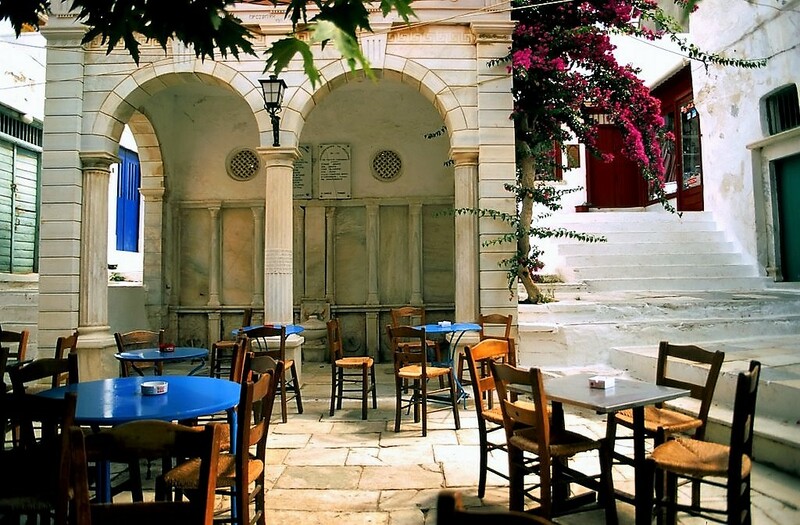 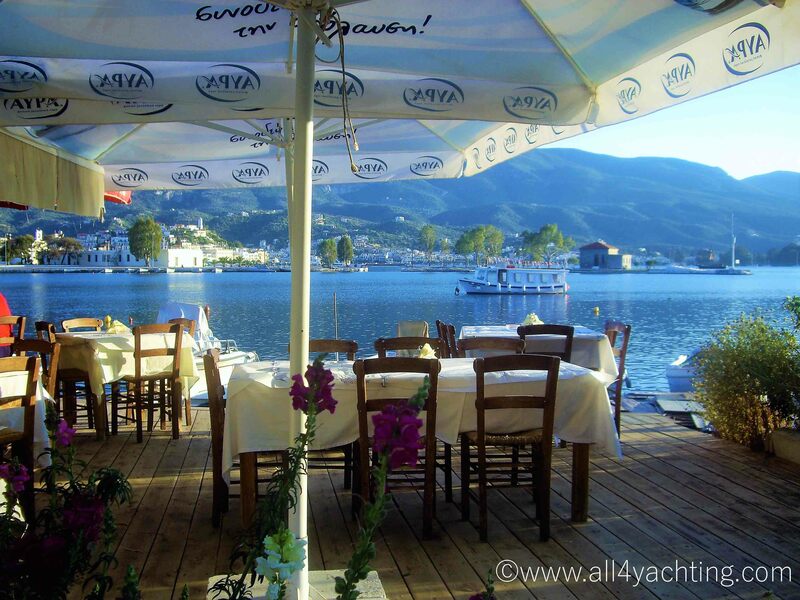 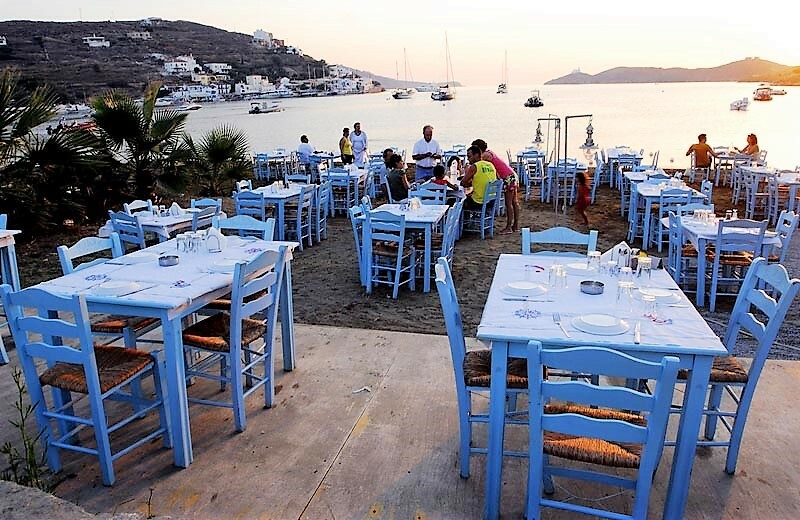 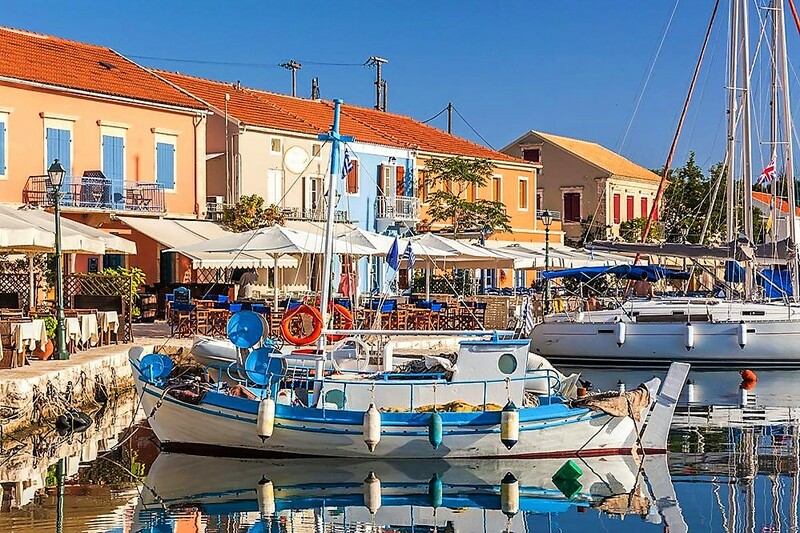 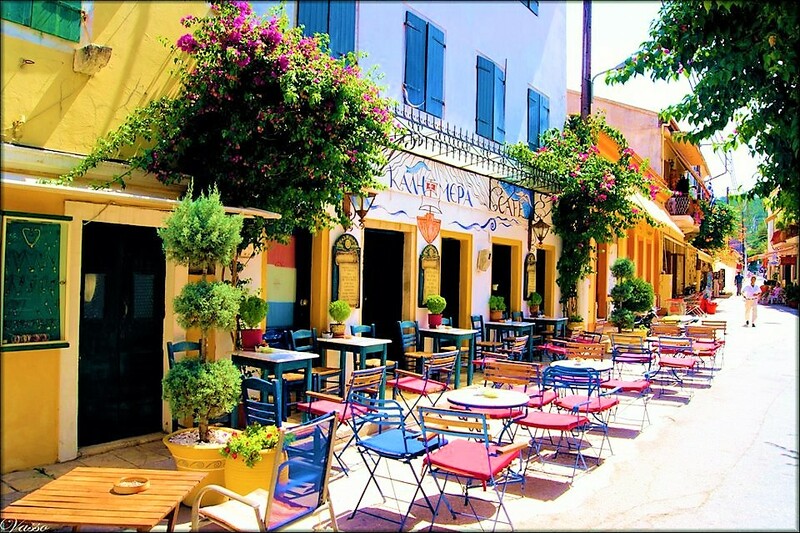 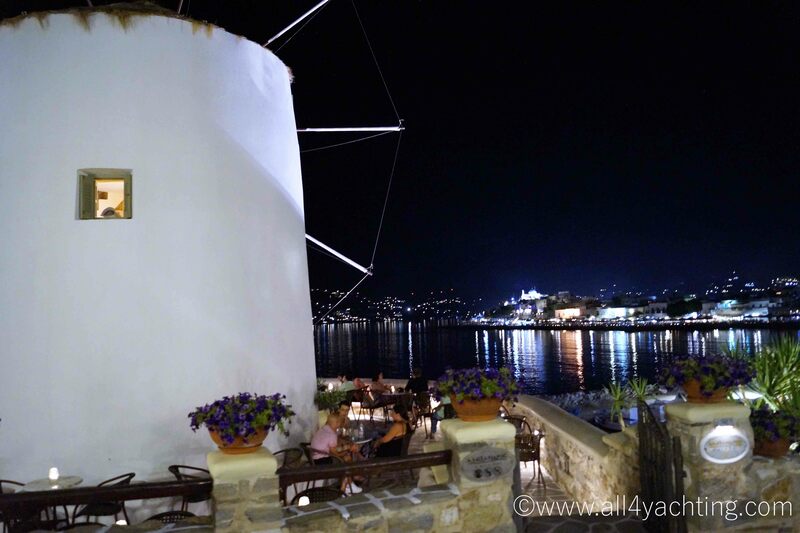 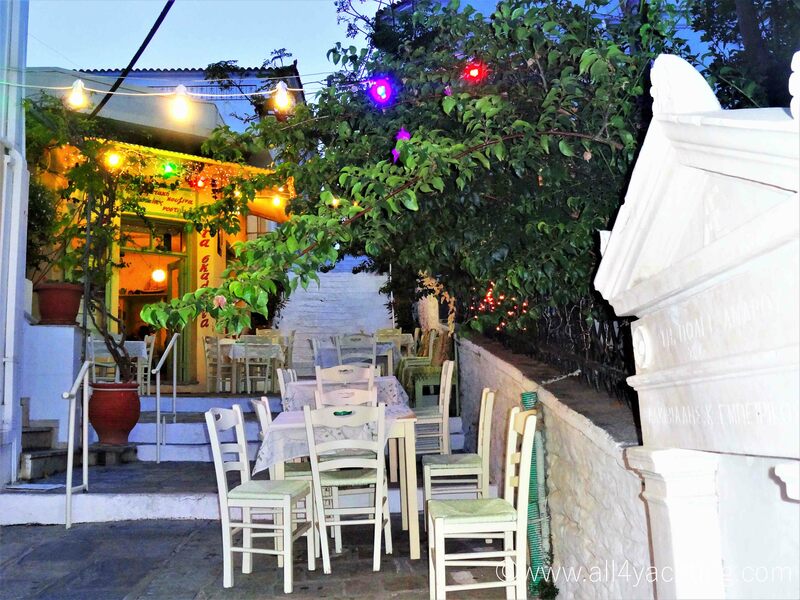 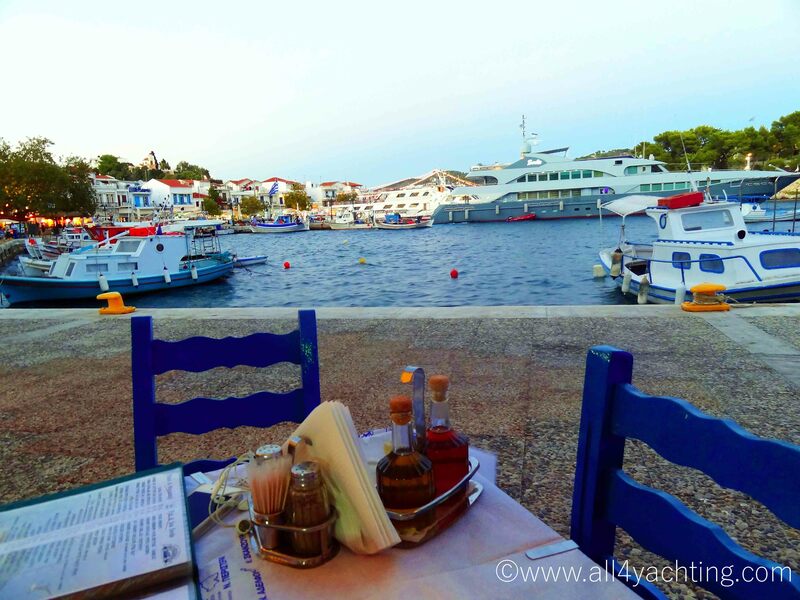 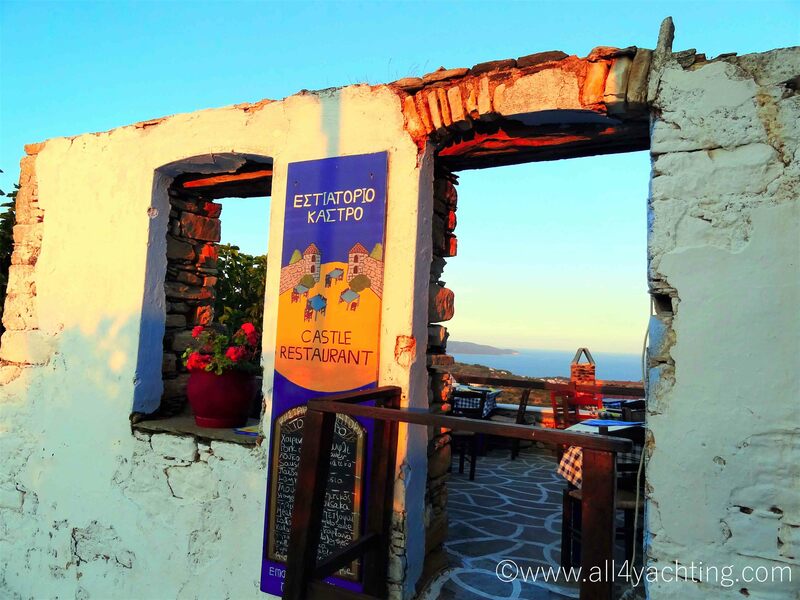 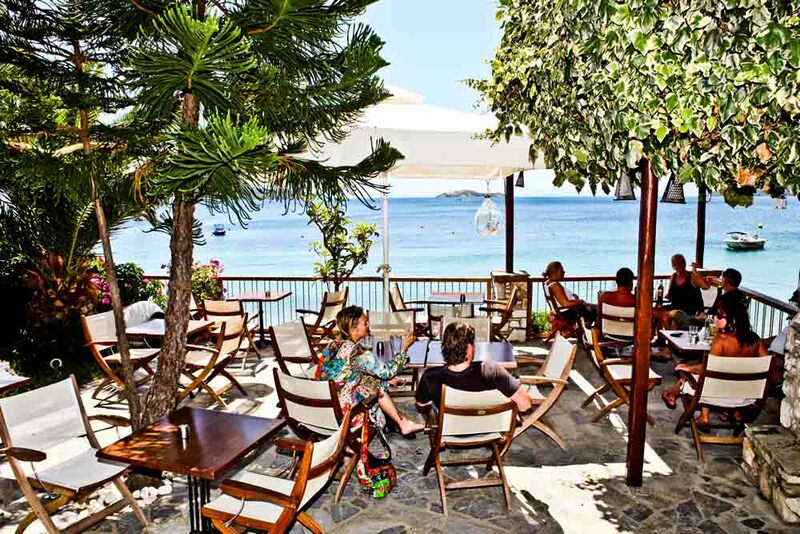 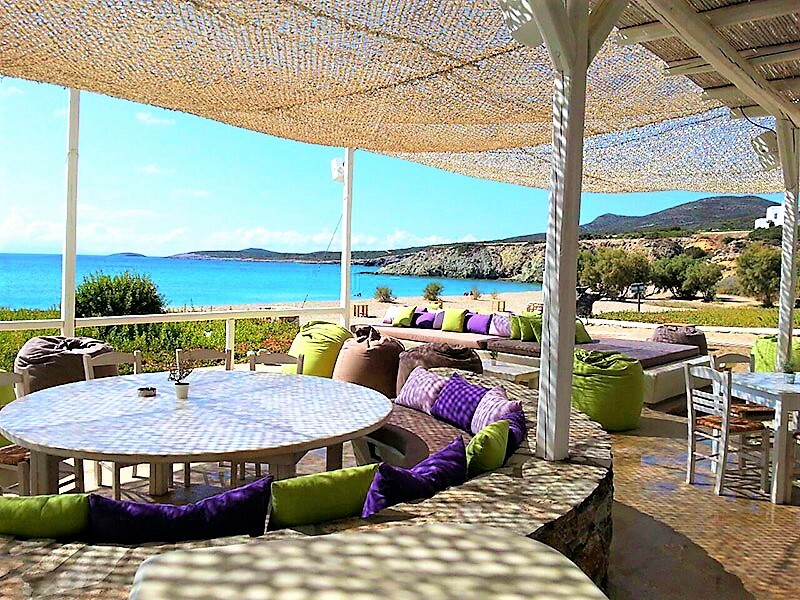 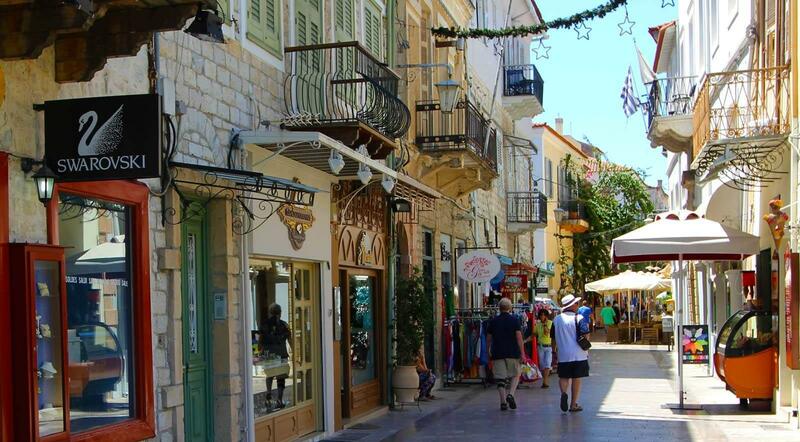 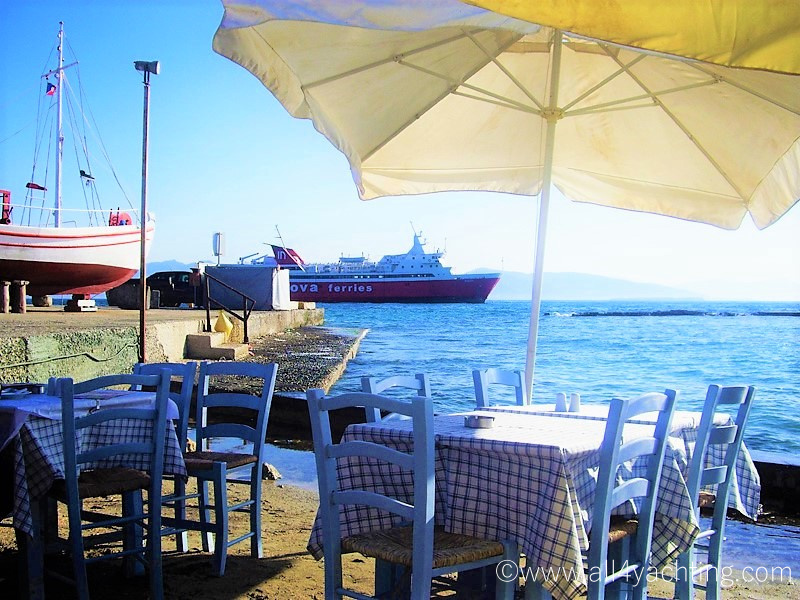 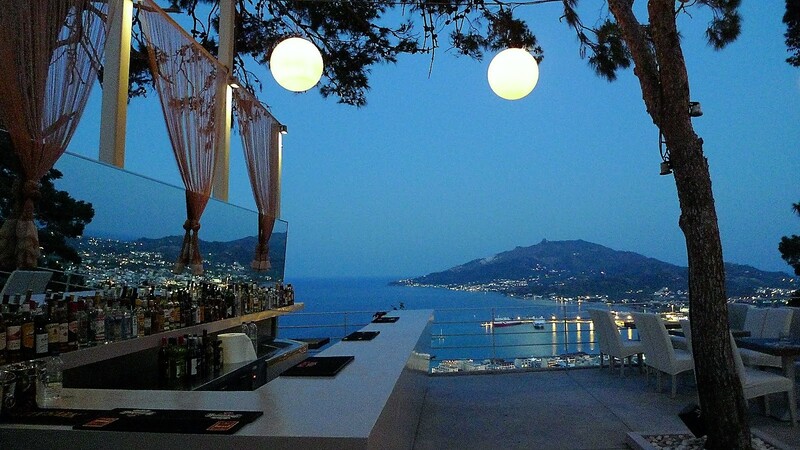 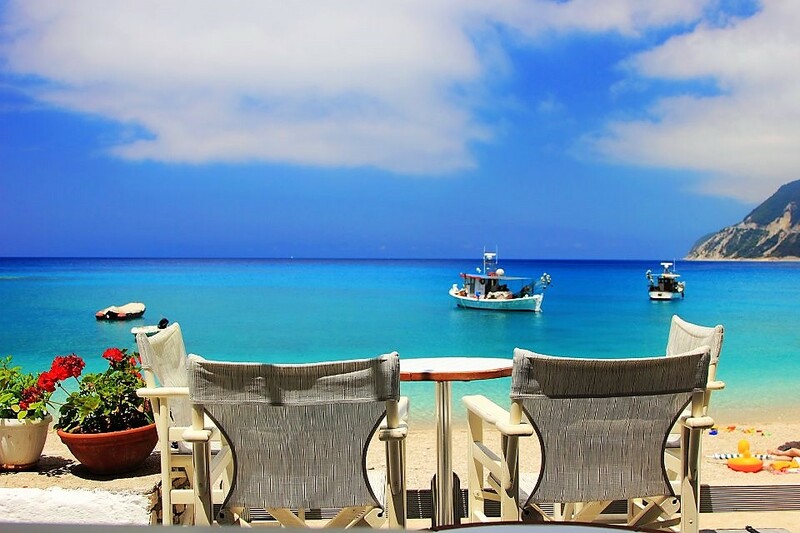 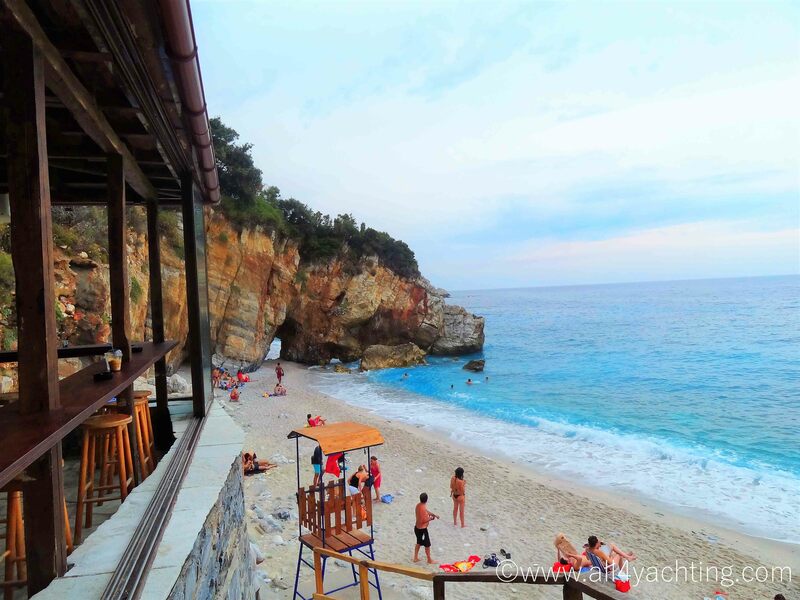 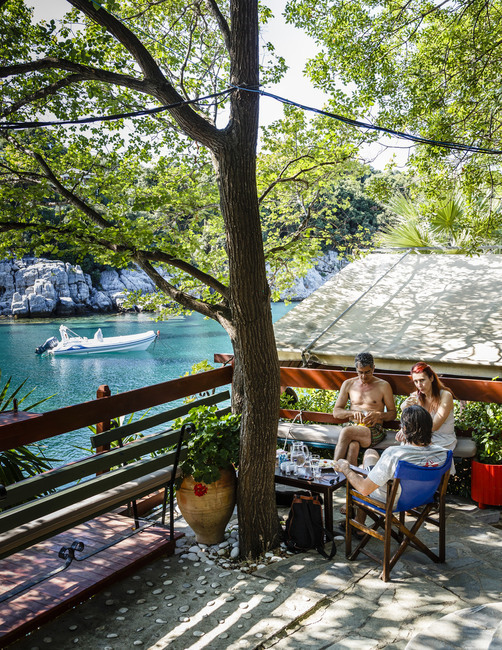 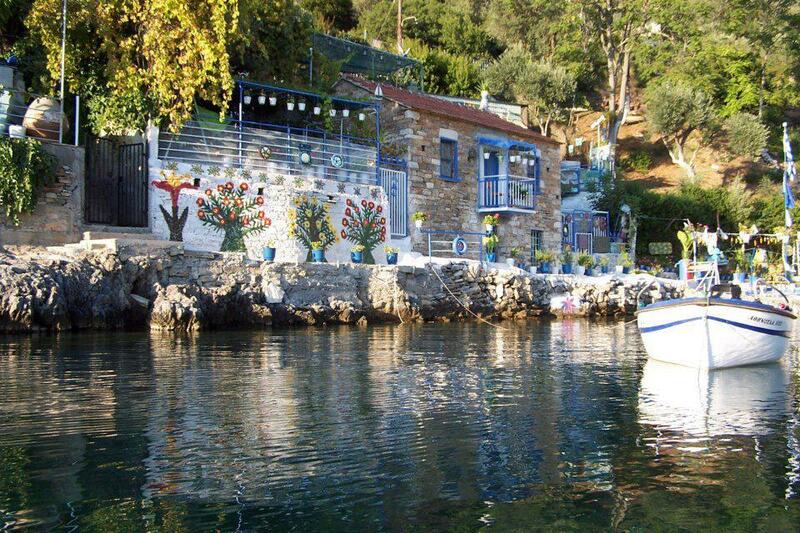 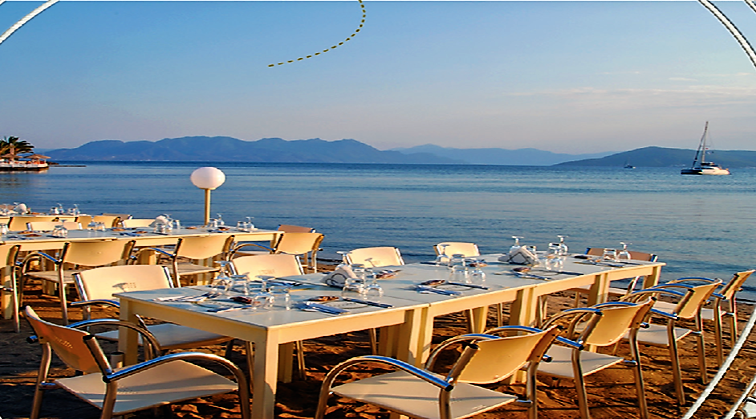 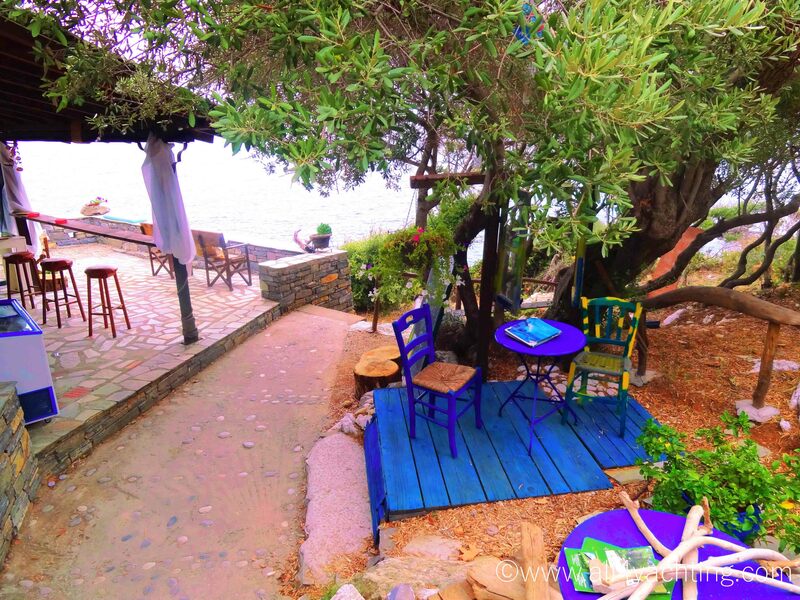 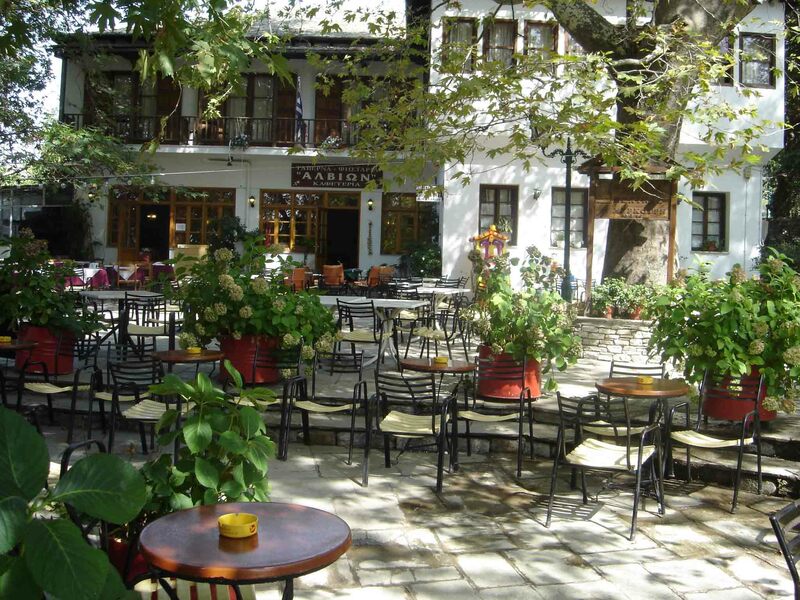 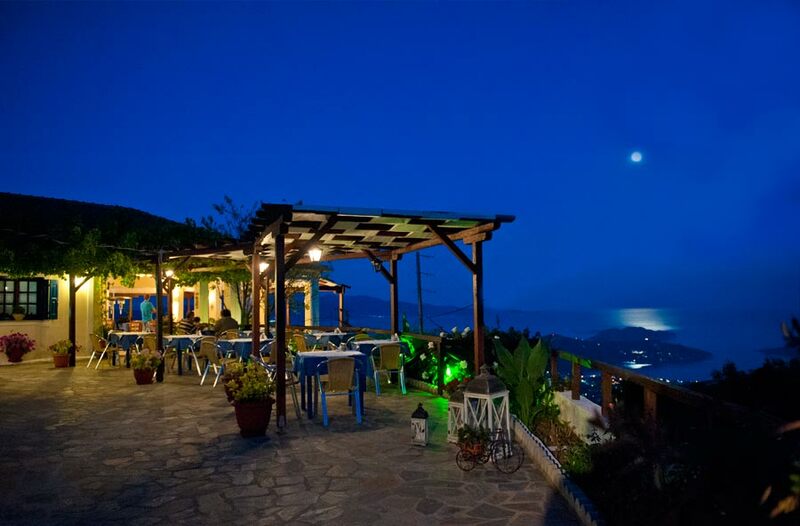 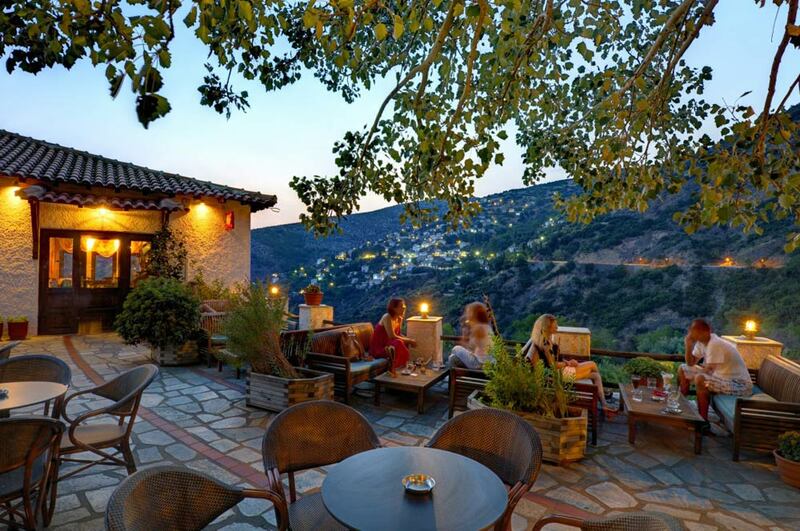 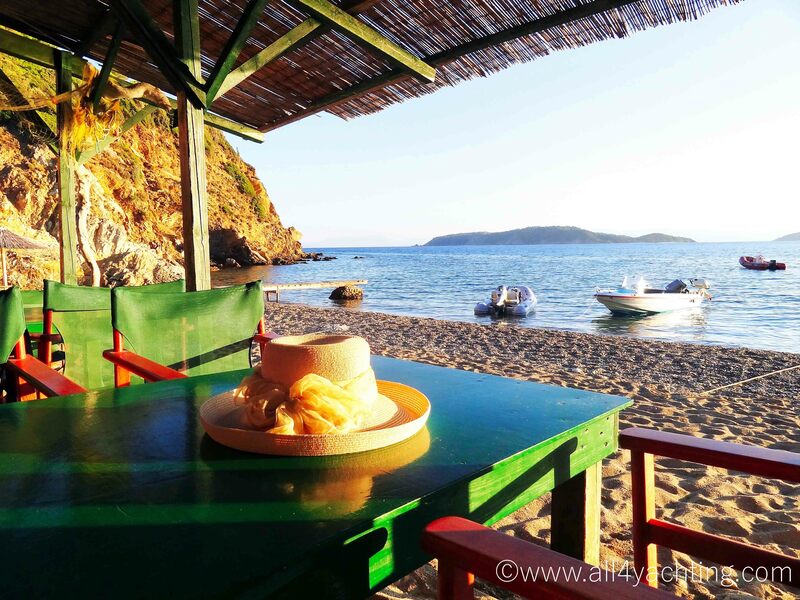 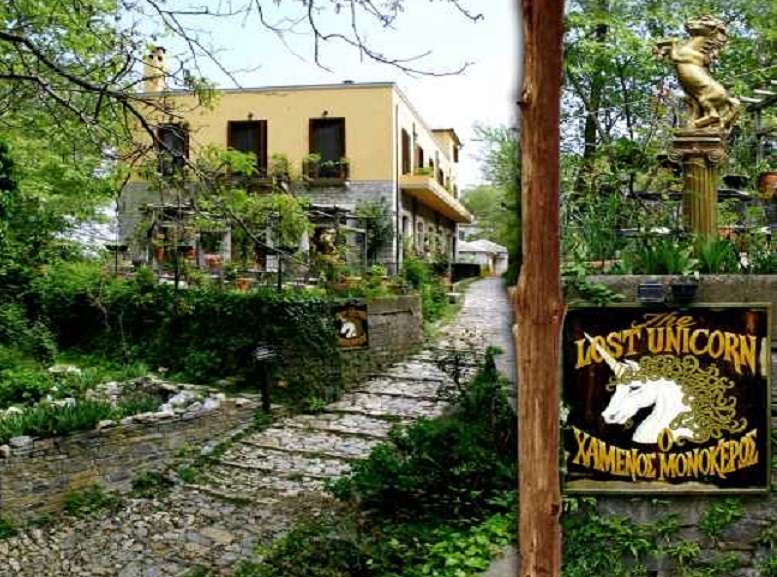 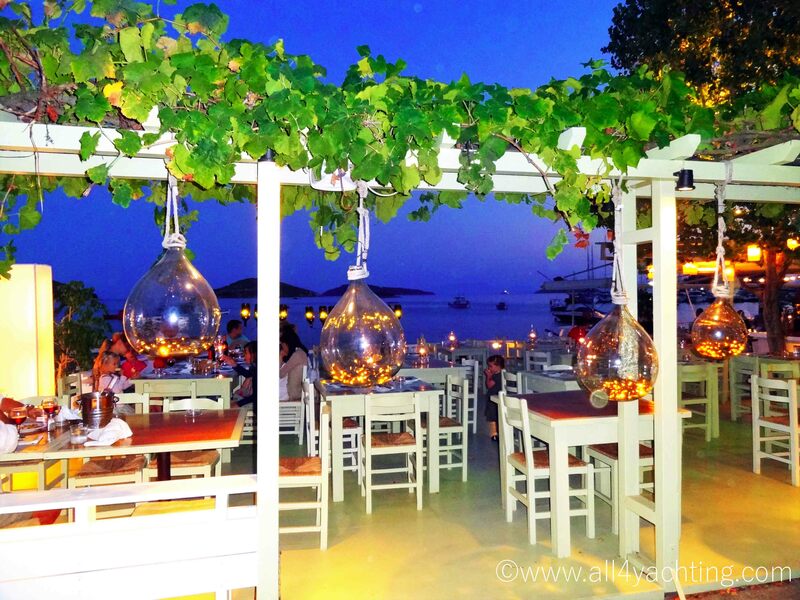 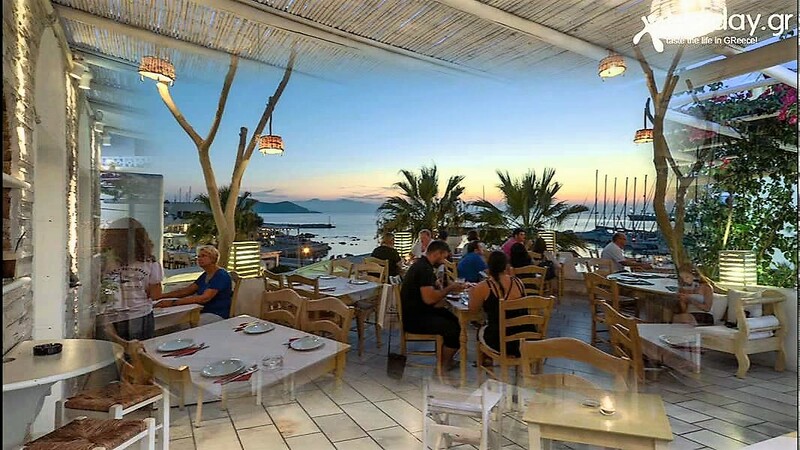 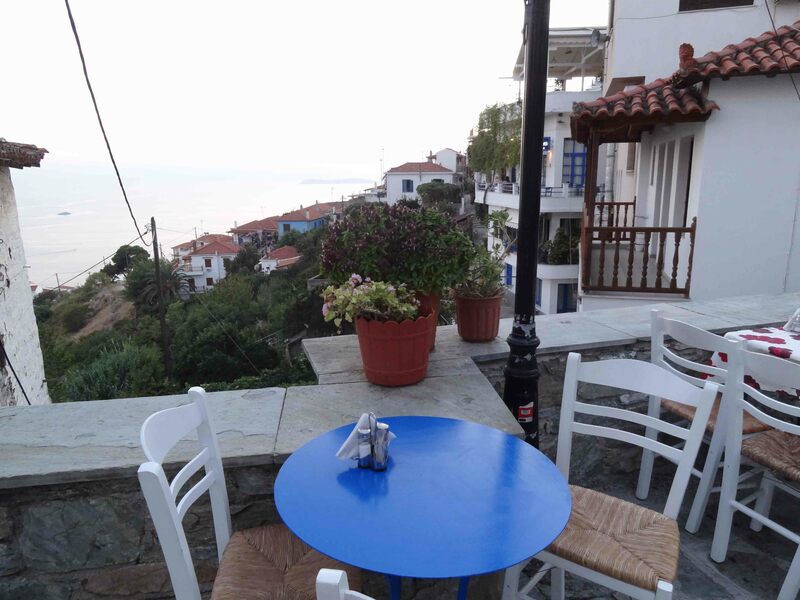 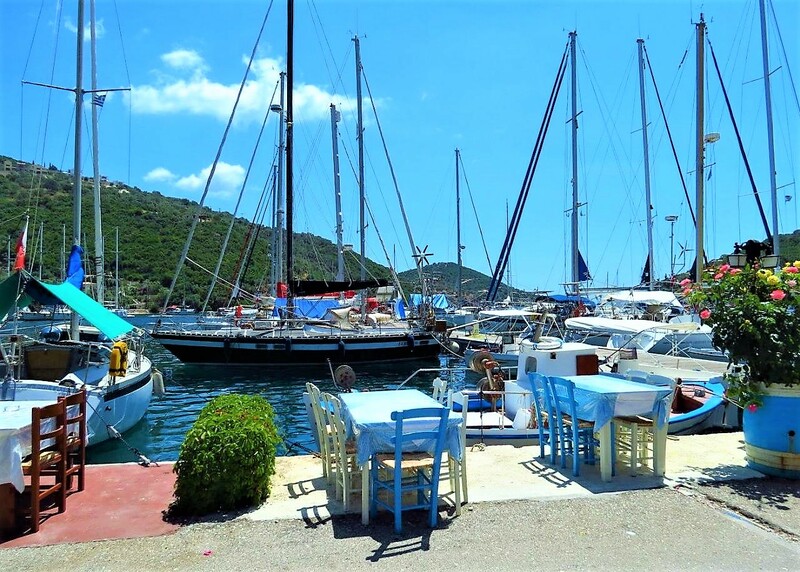 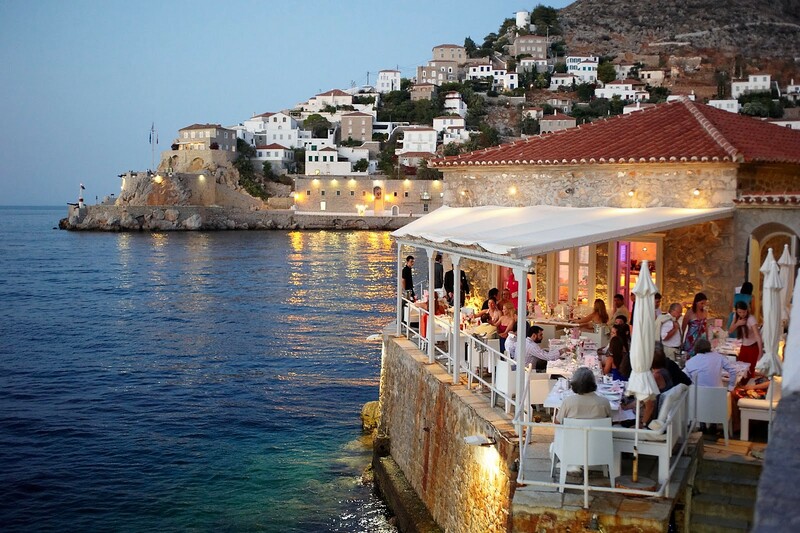 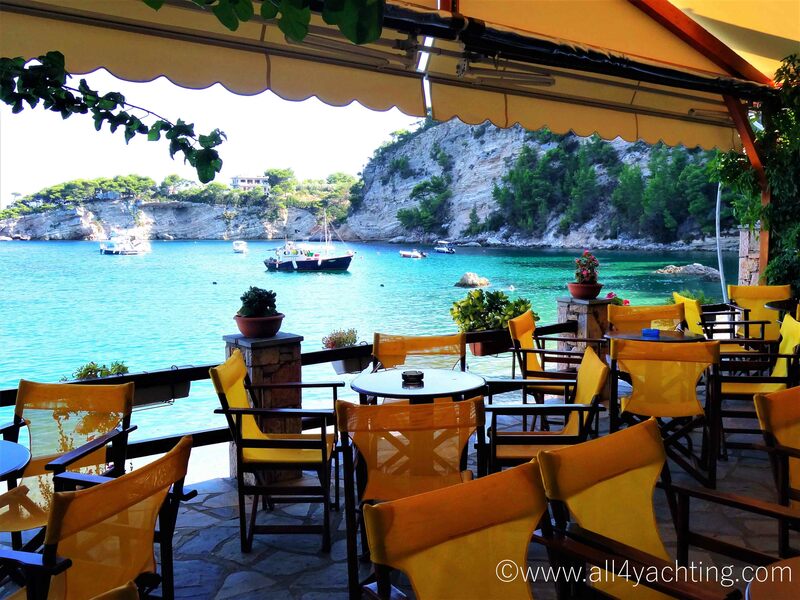 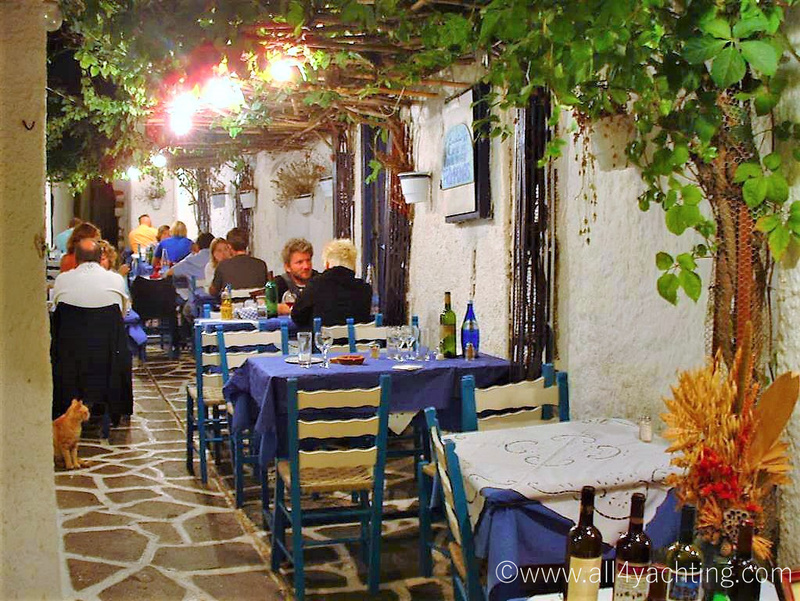 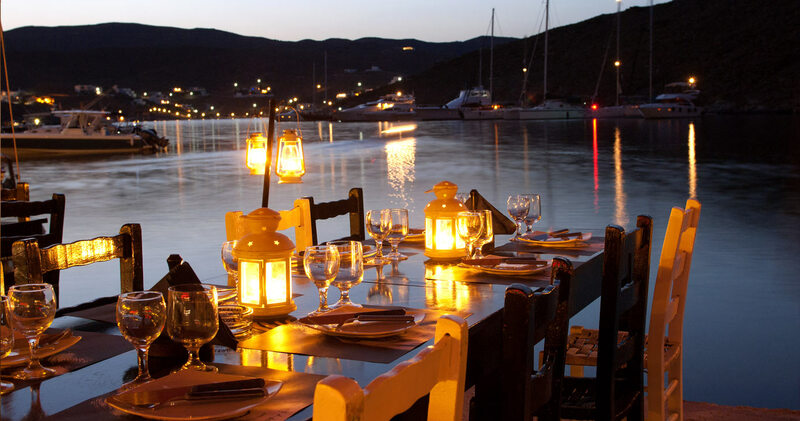 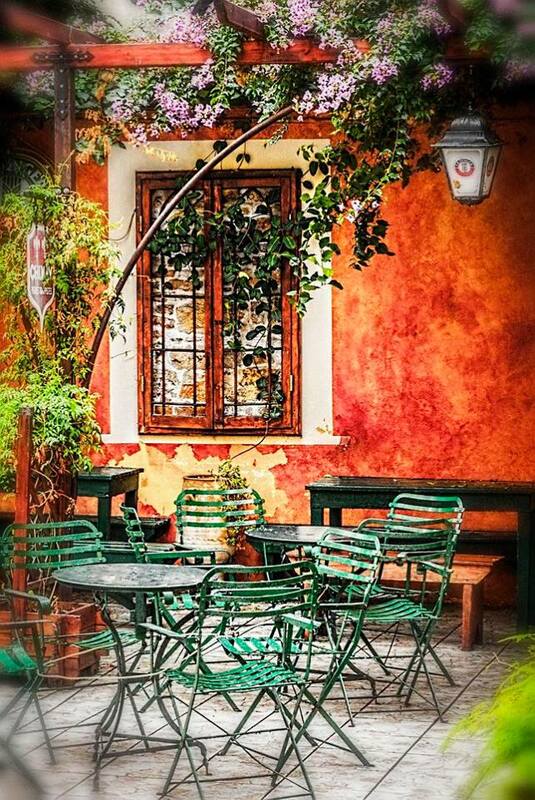 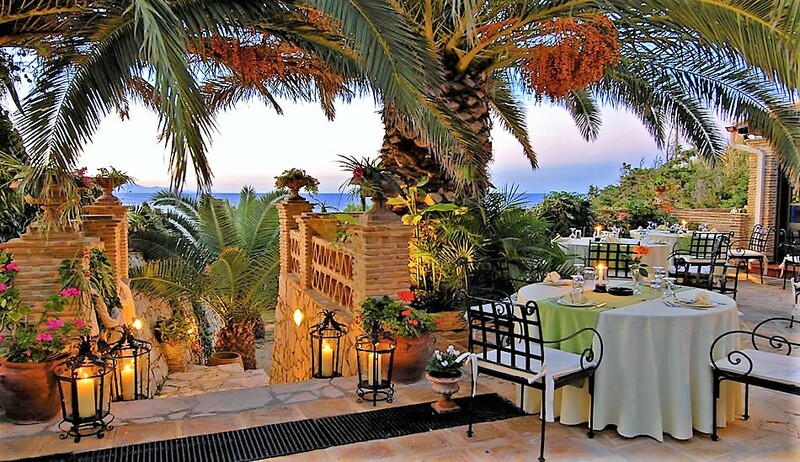 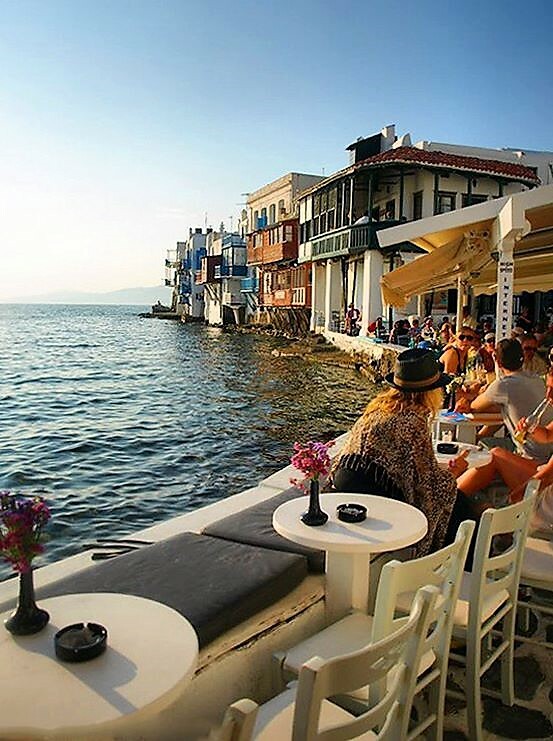 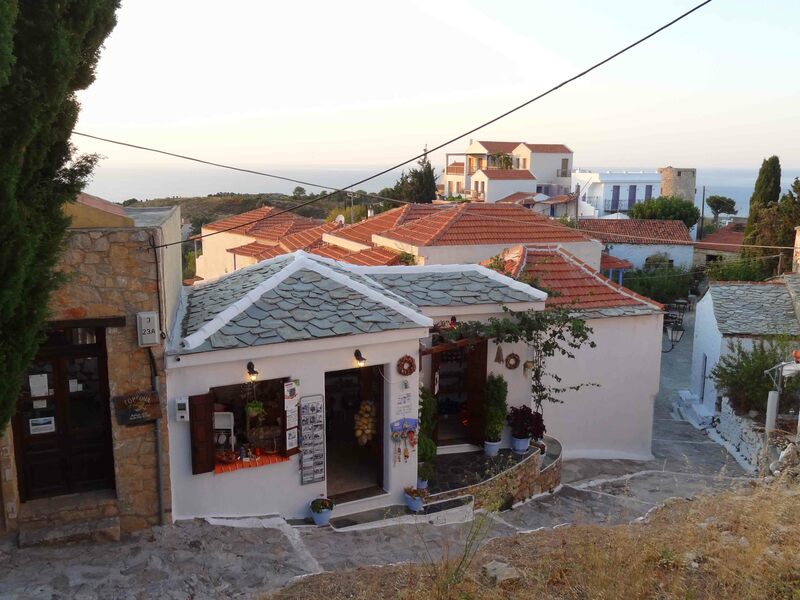 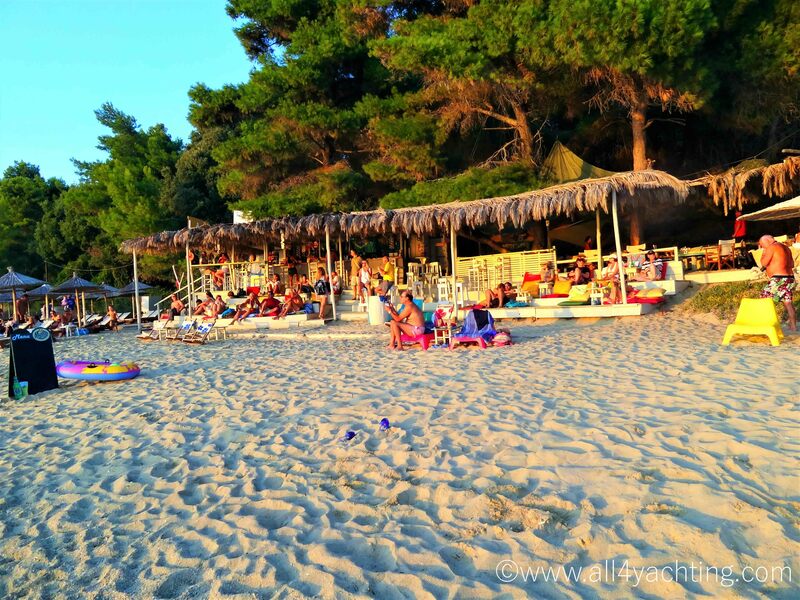 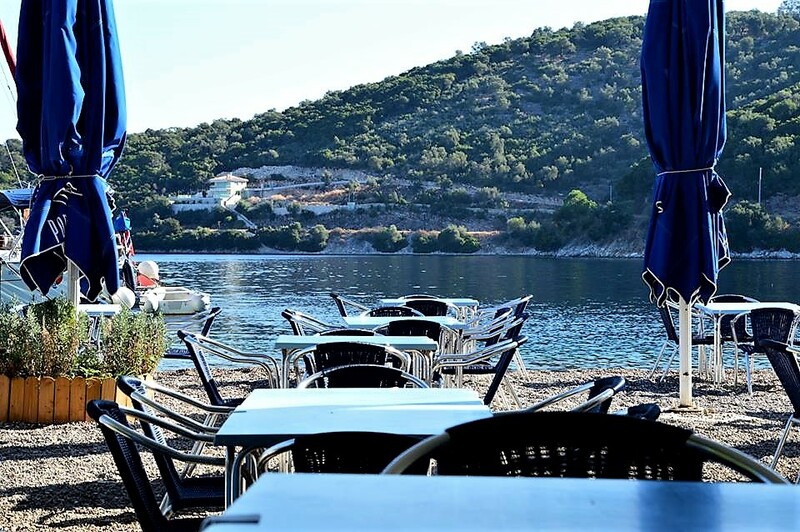 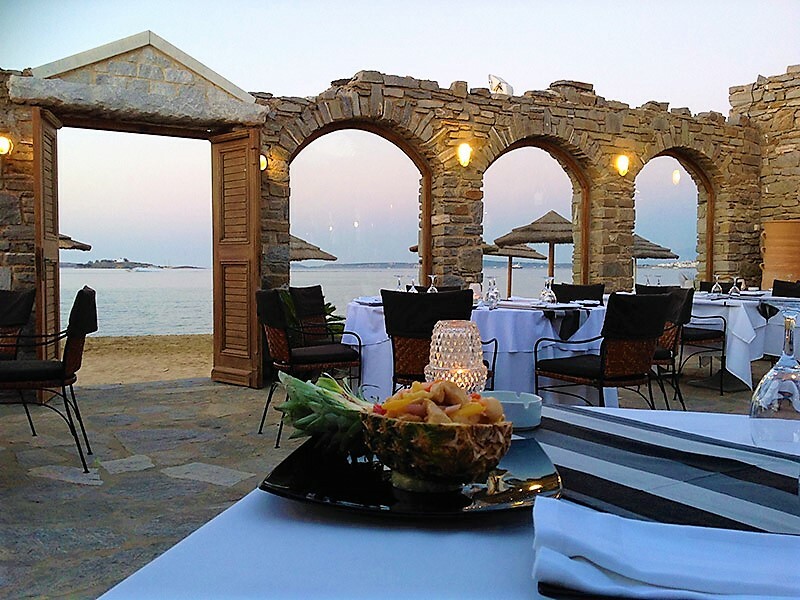 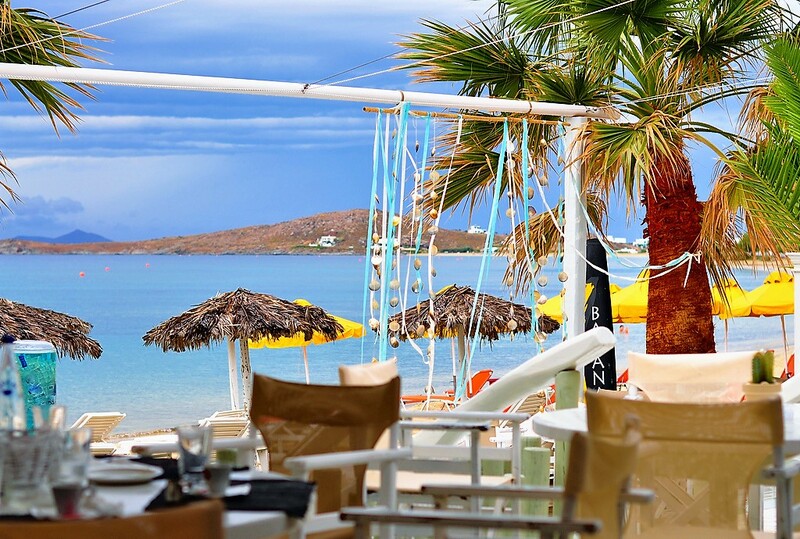 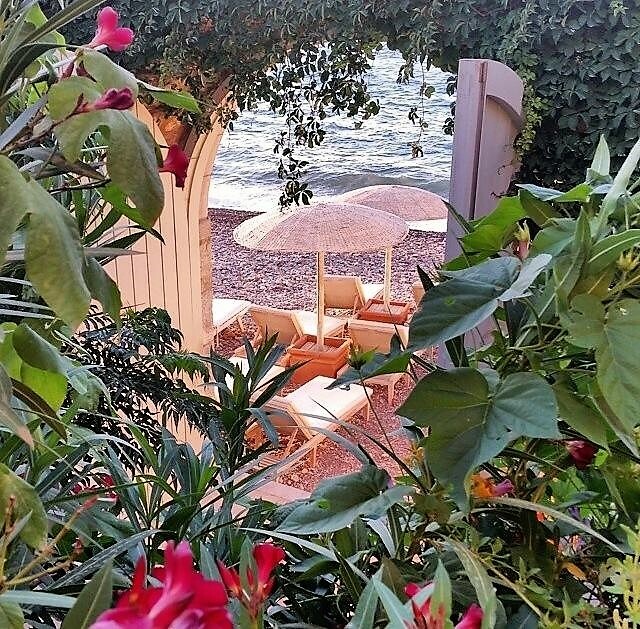 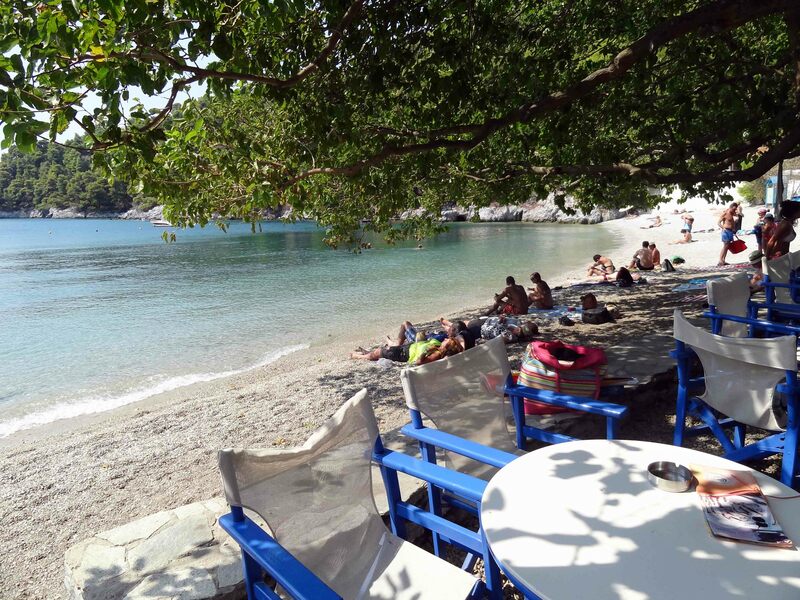 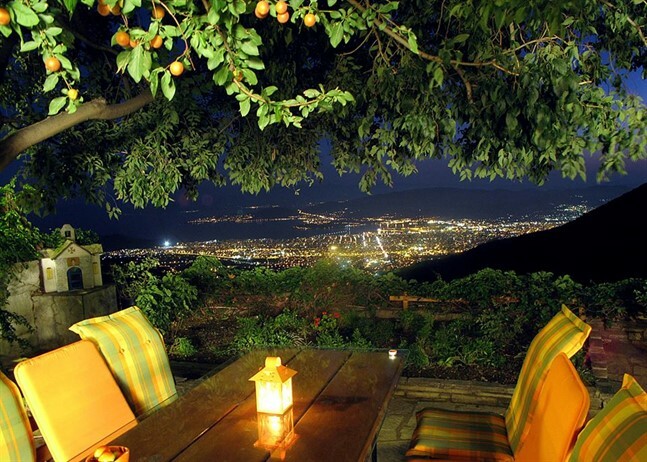 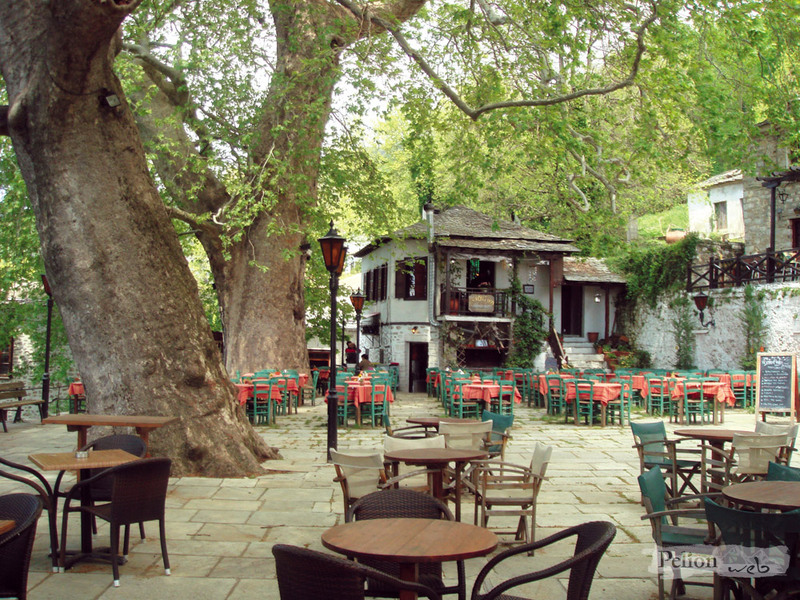 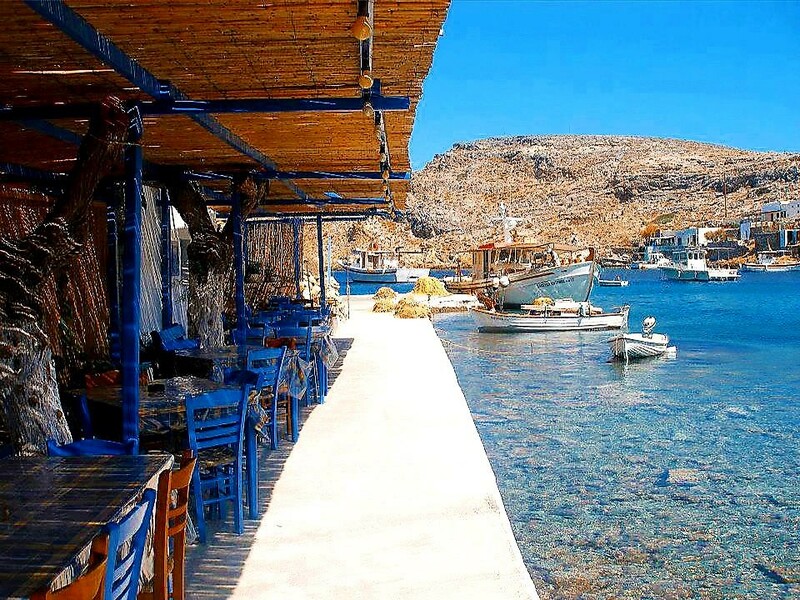 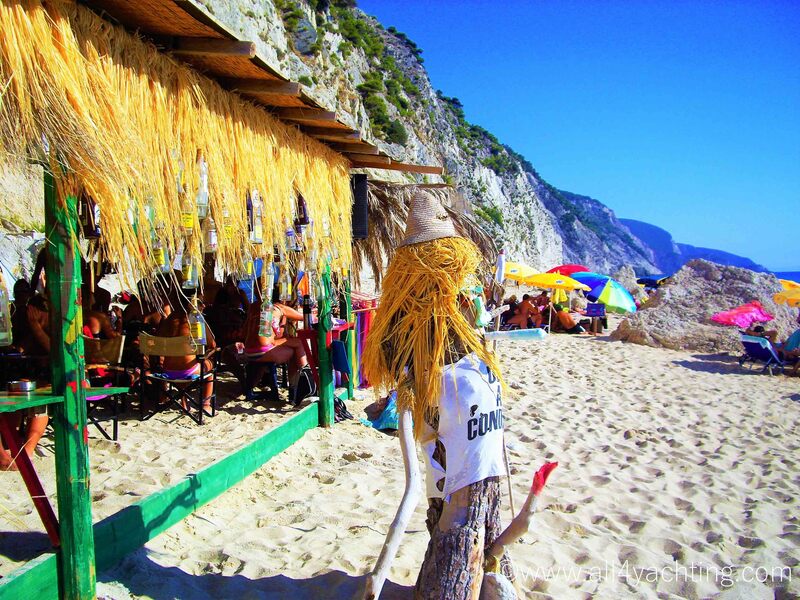 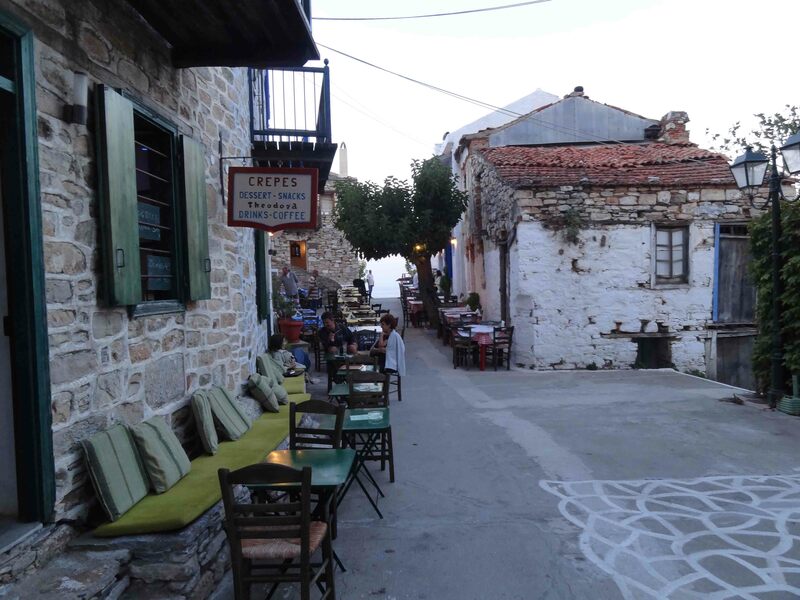 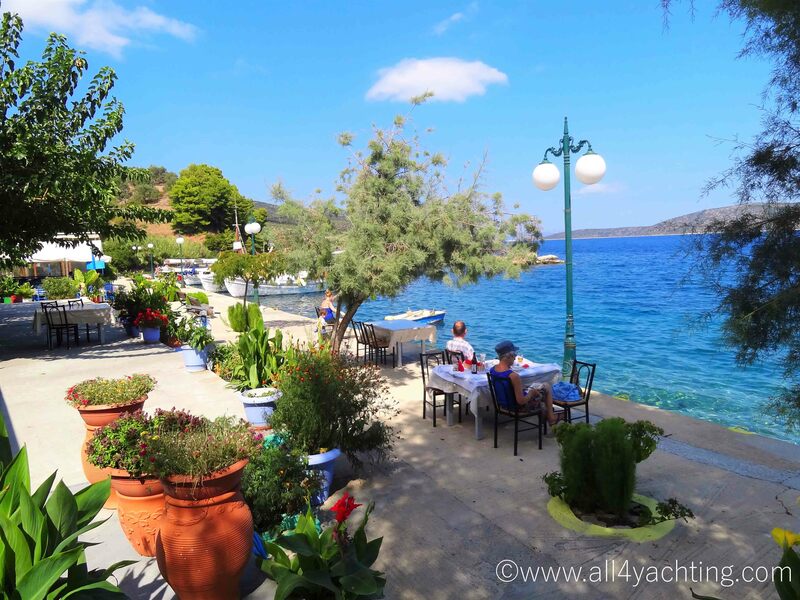 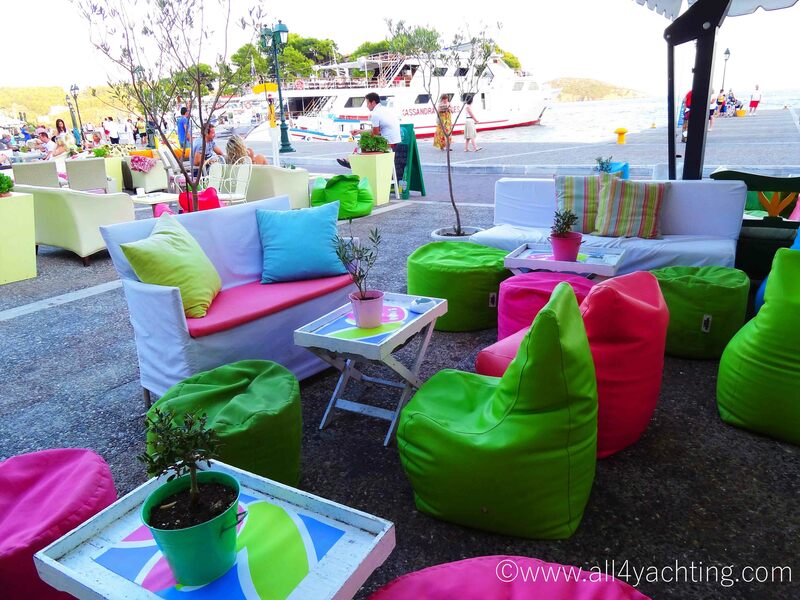 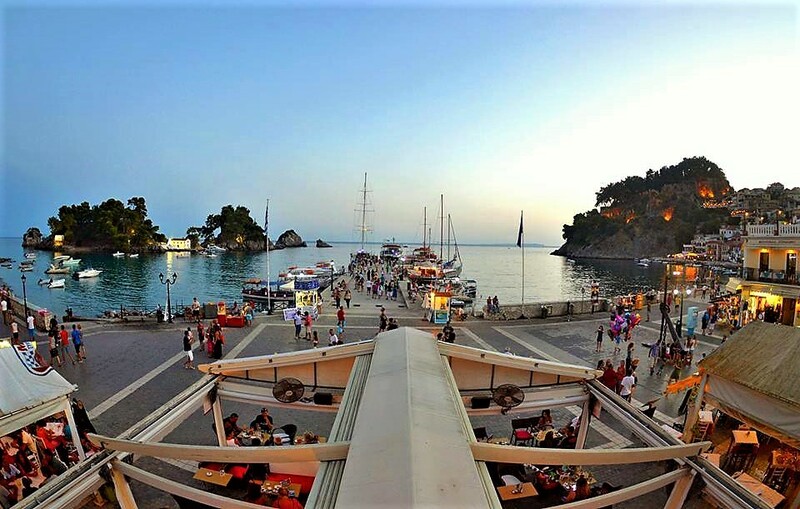 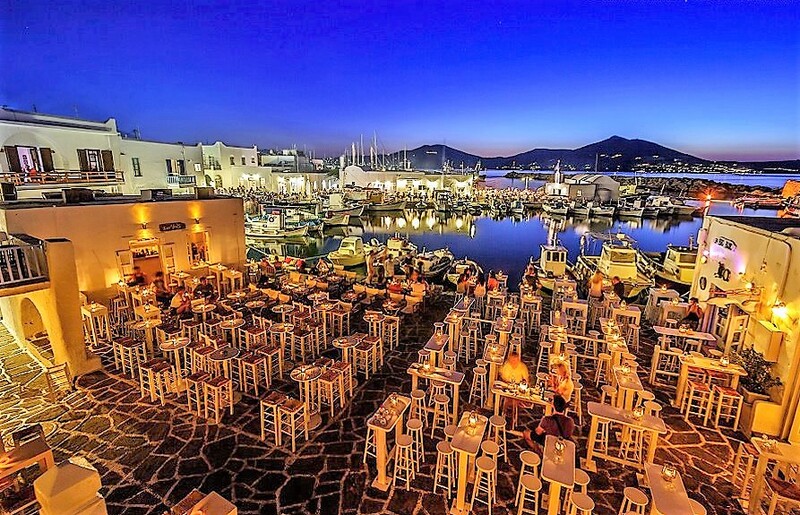 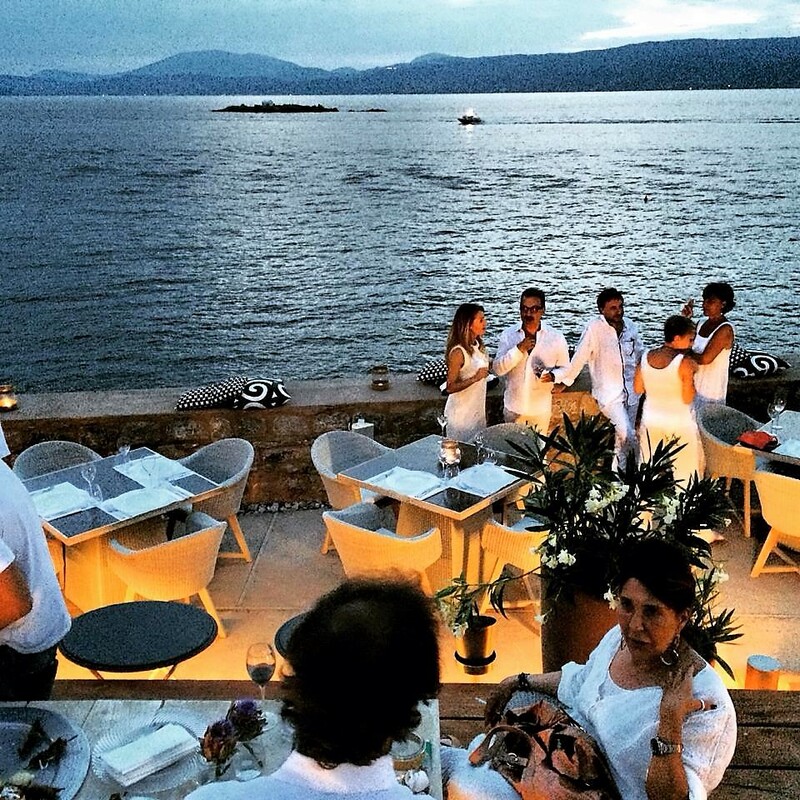 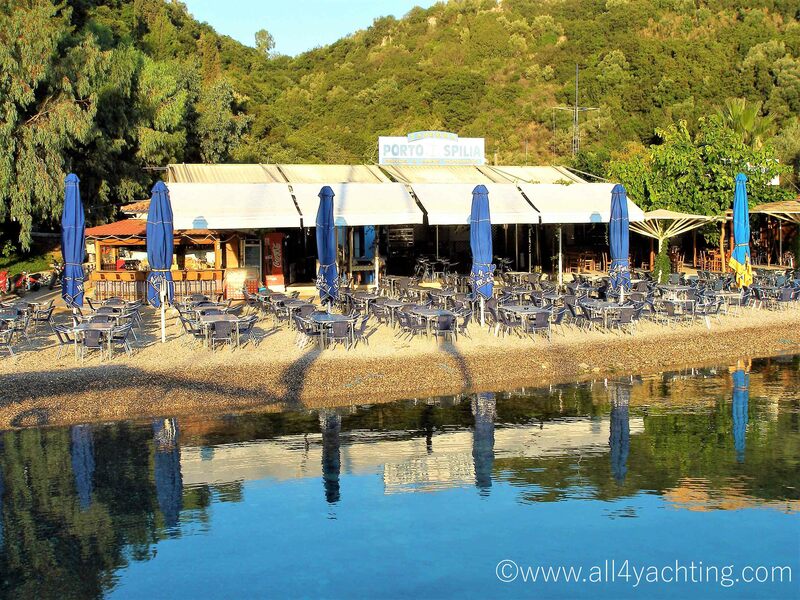 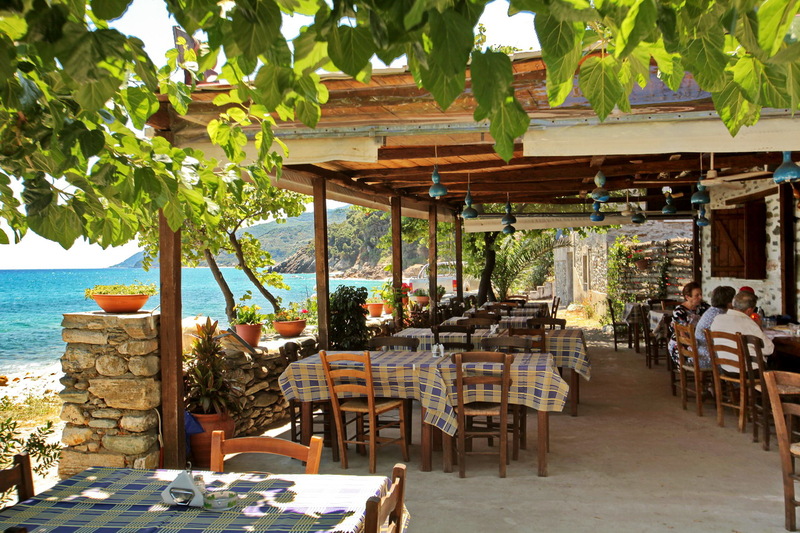 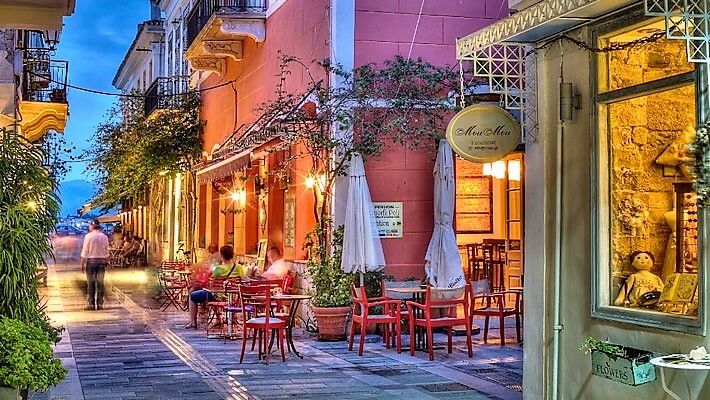 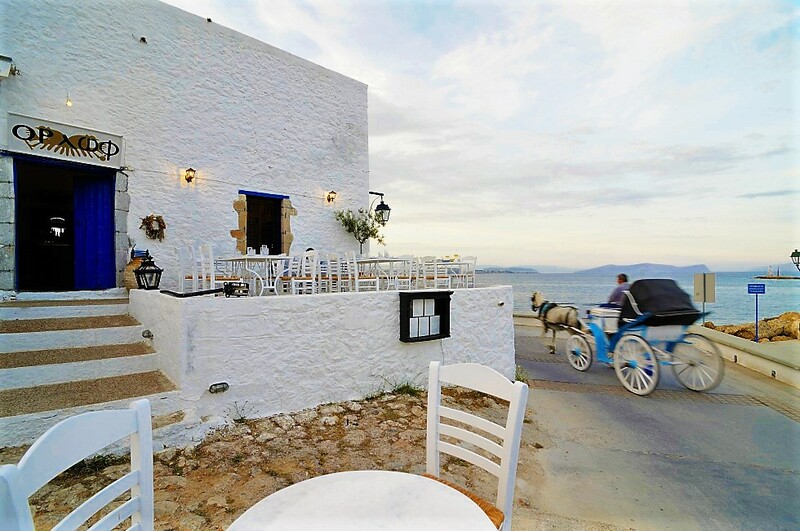 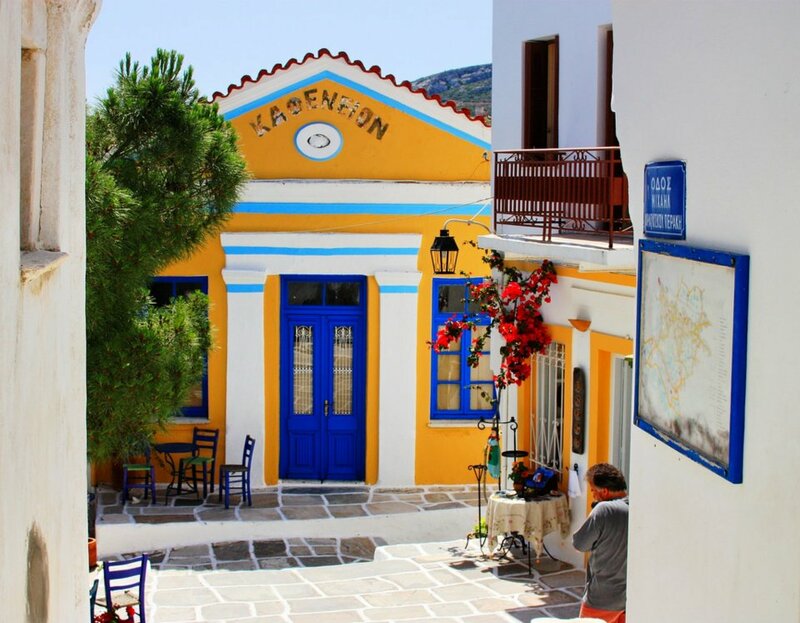 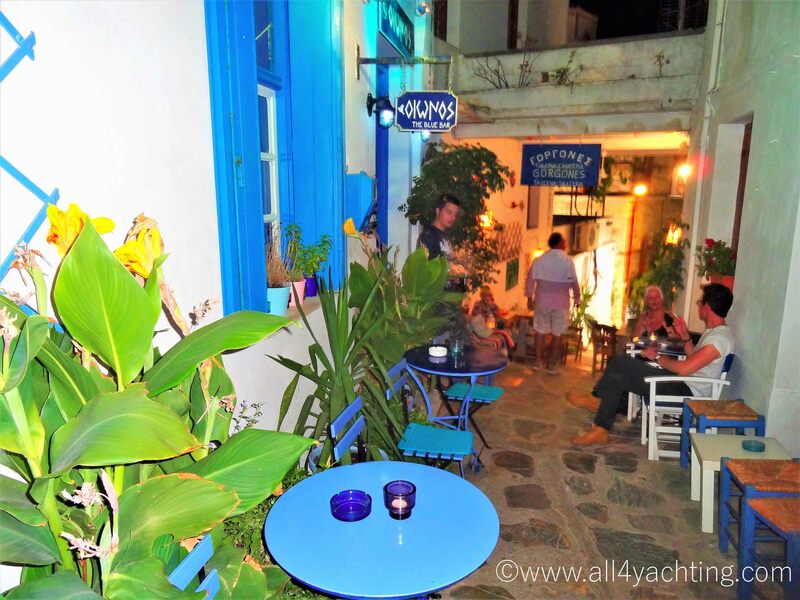 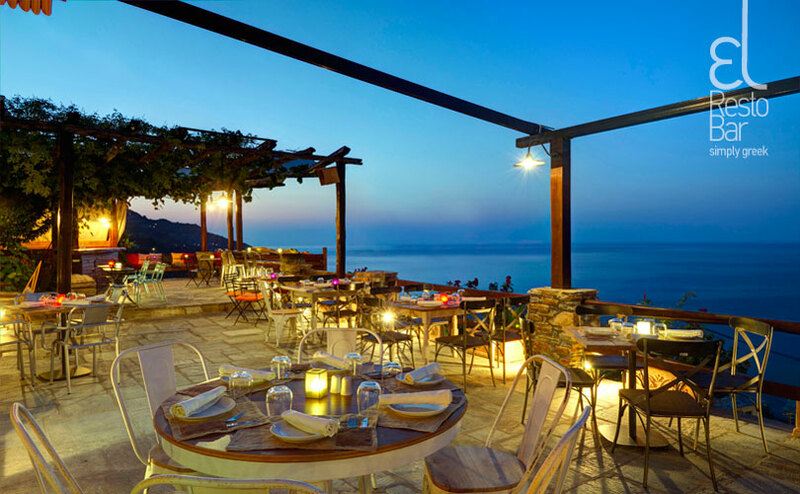 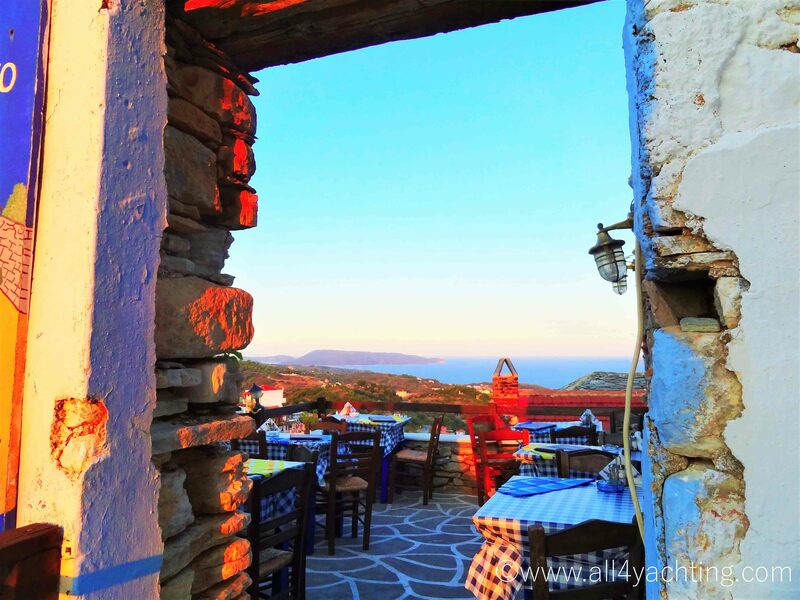 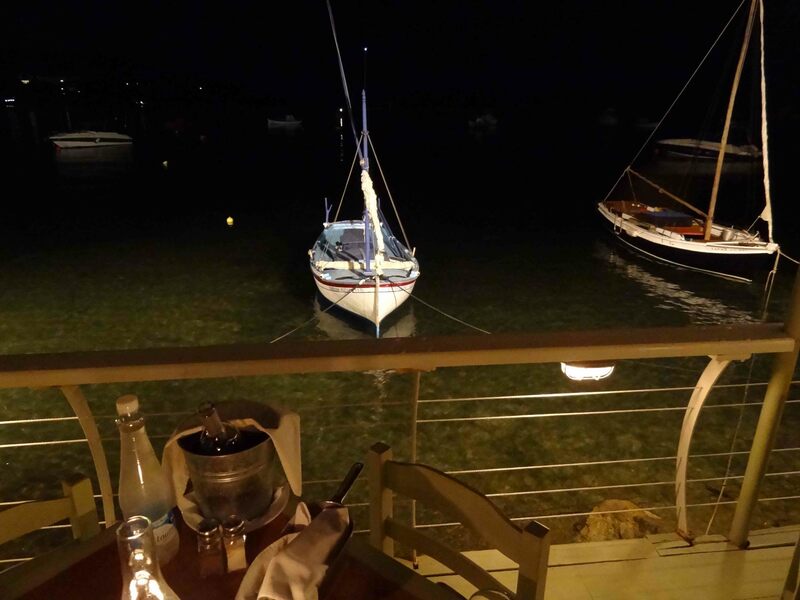 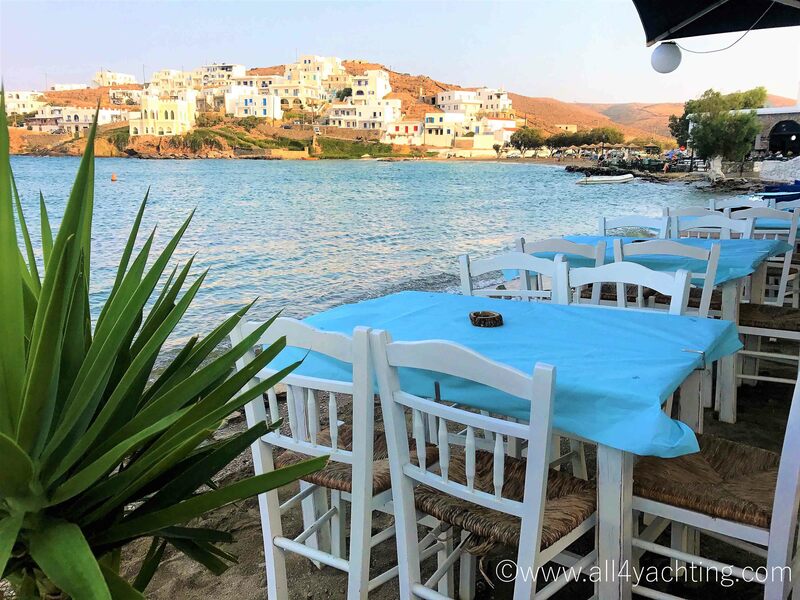 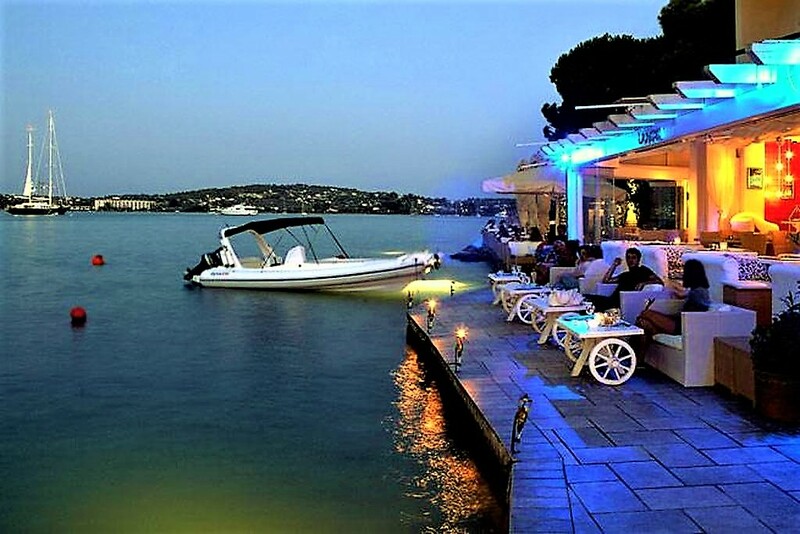 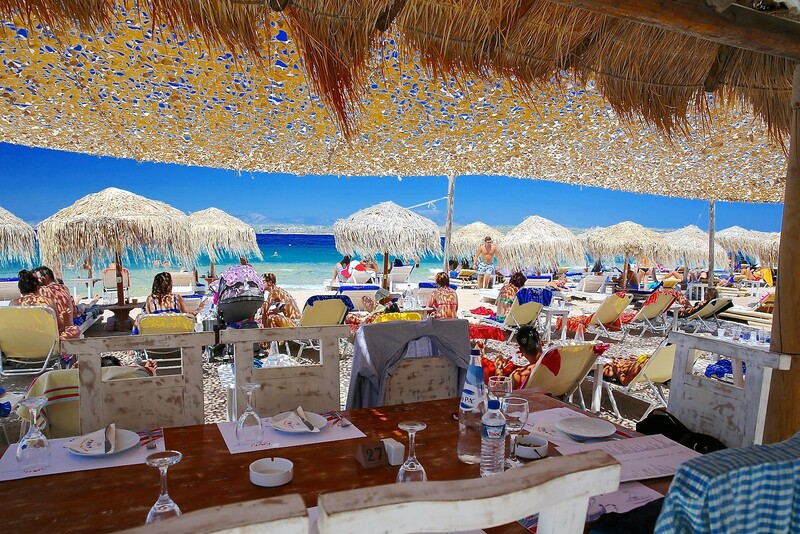 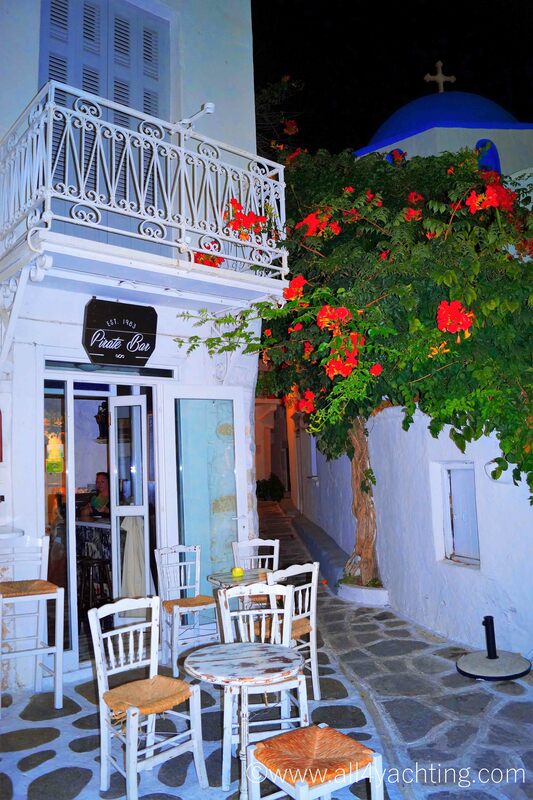 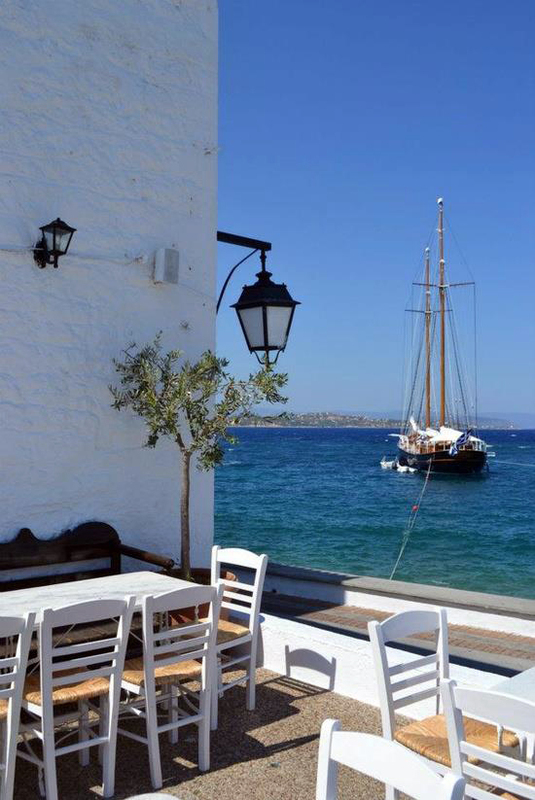 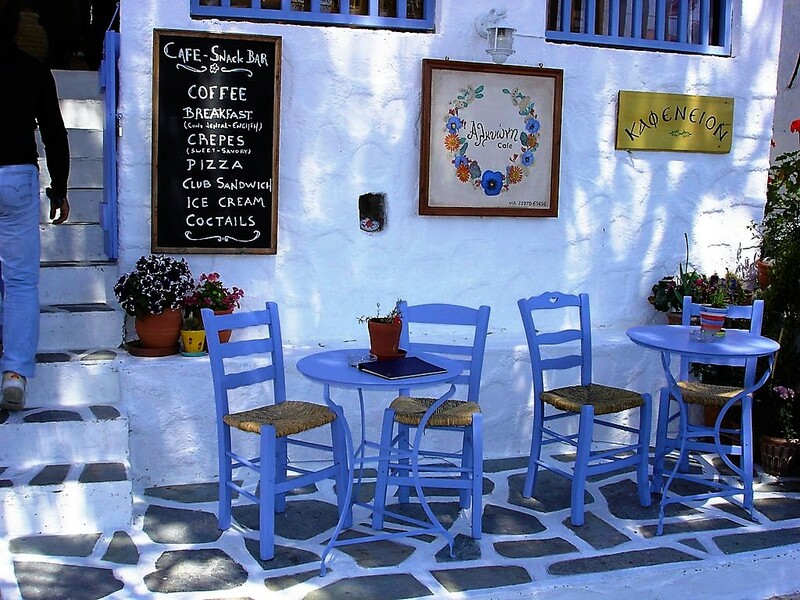 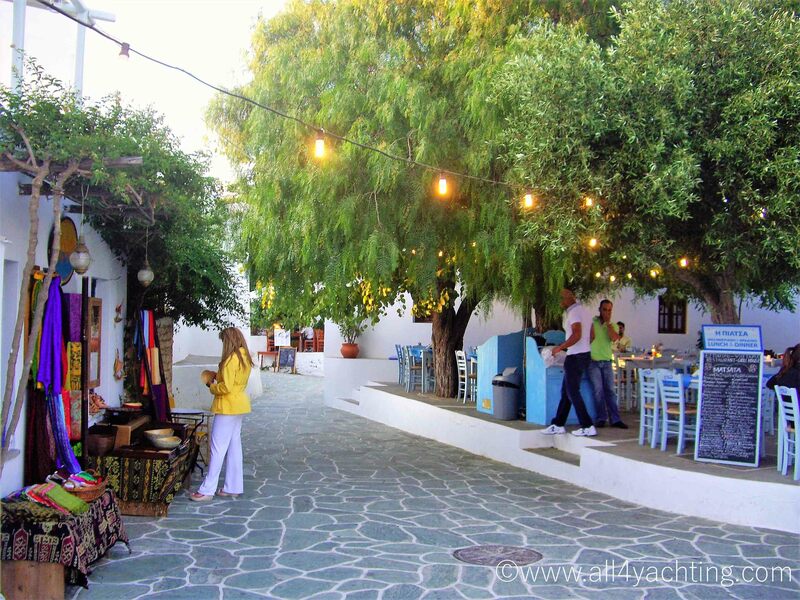 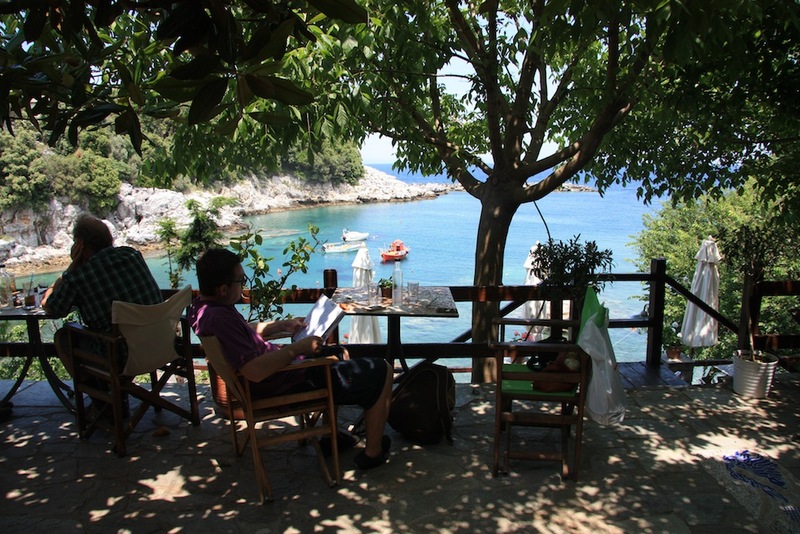 In almost every island visitors will find many stylish restaurants, traditional tavernas, cozy cafes and bars -usually open all day long- that will satisfy all different tastes. 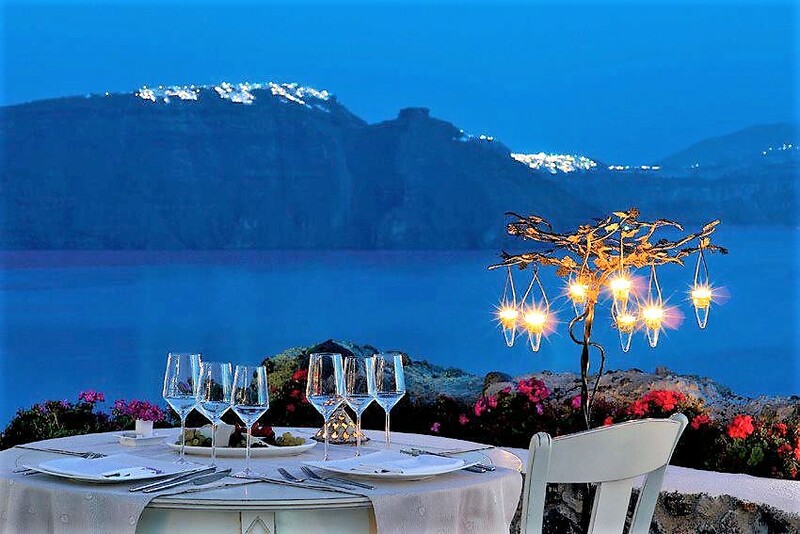 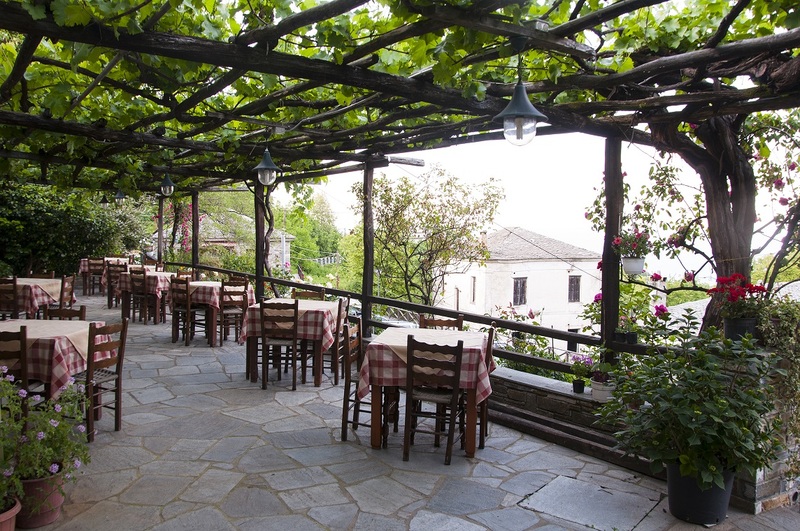 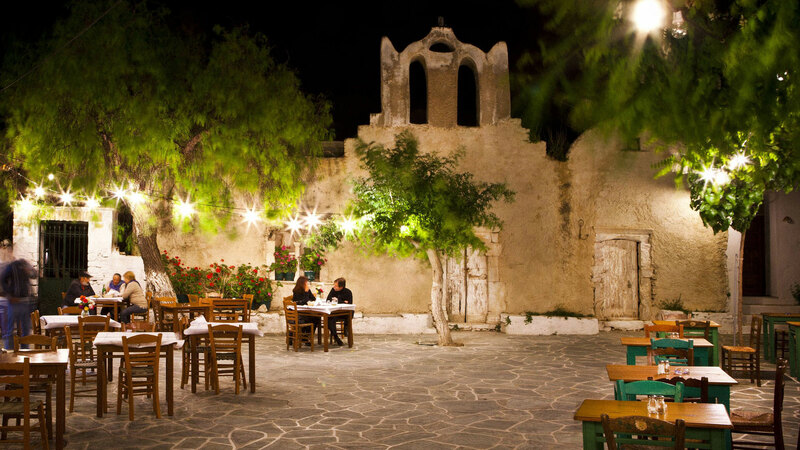 Delicious cuisine and local products, such as the famous wines, the “fava: and the tiny tomatoes of Santorini, various varieties of cheese etc. 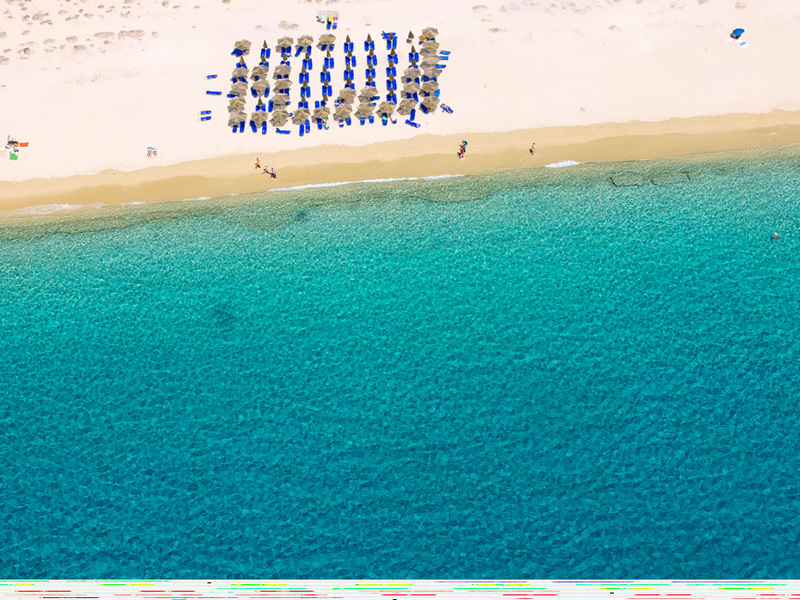 Bright sun, shining almost all year round. 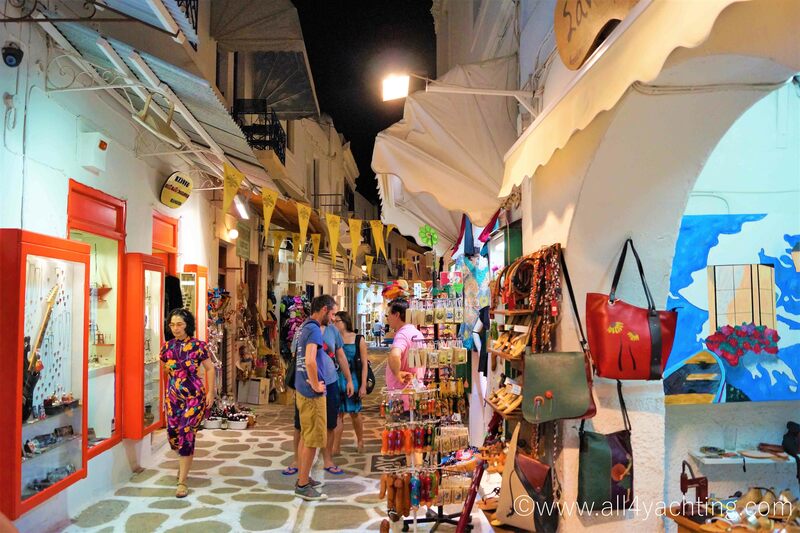 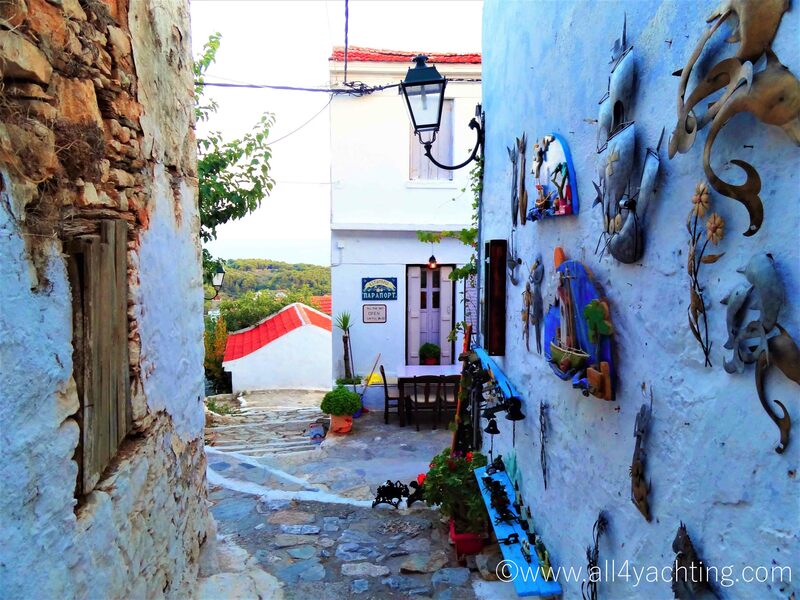 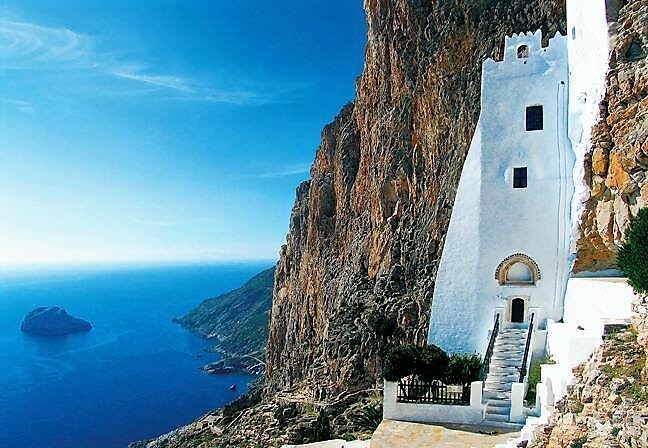 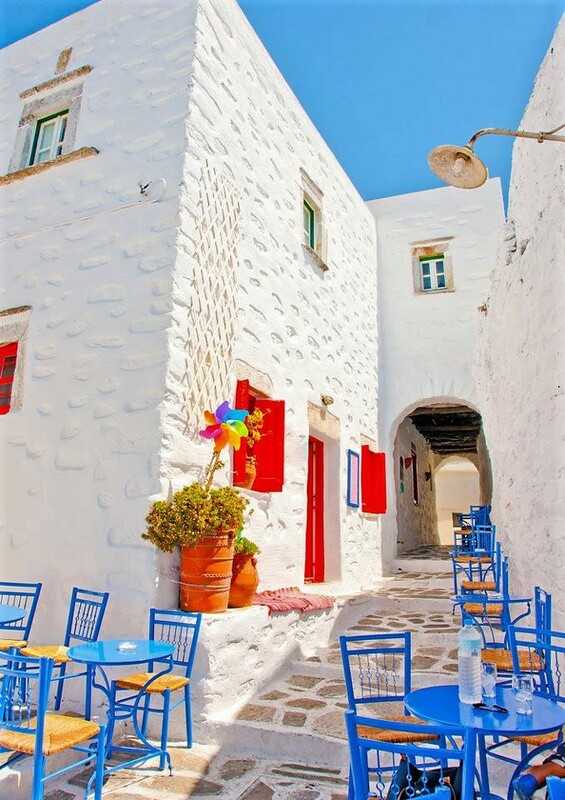 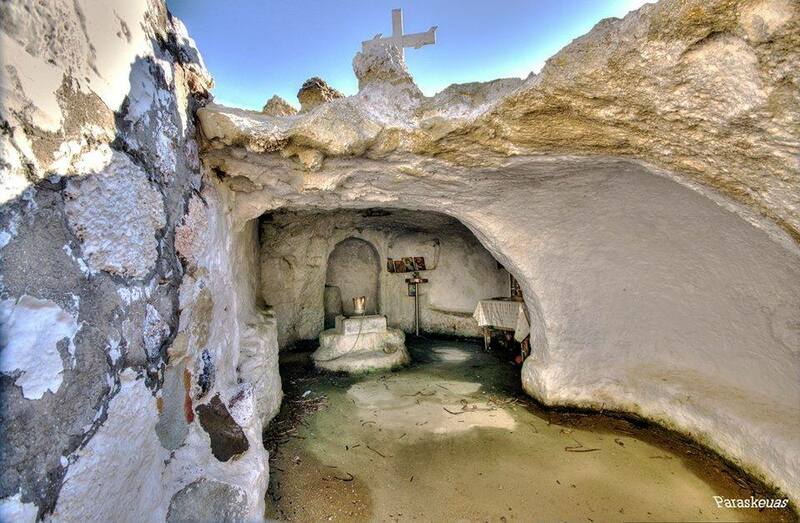 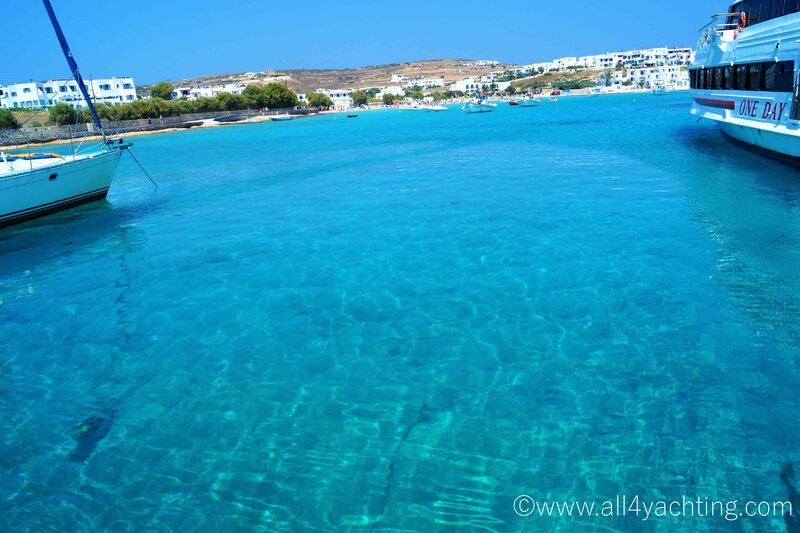 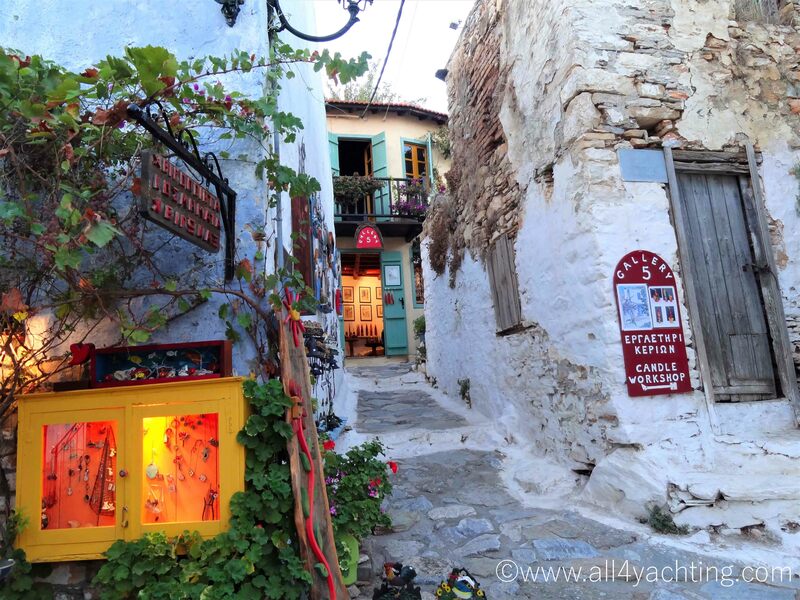 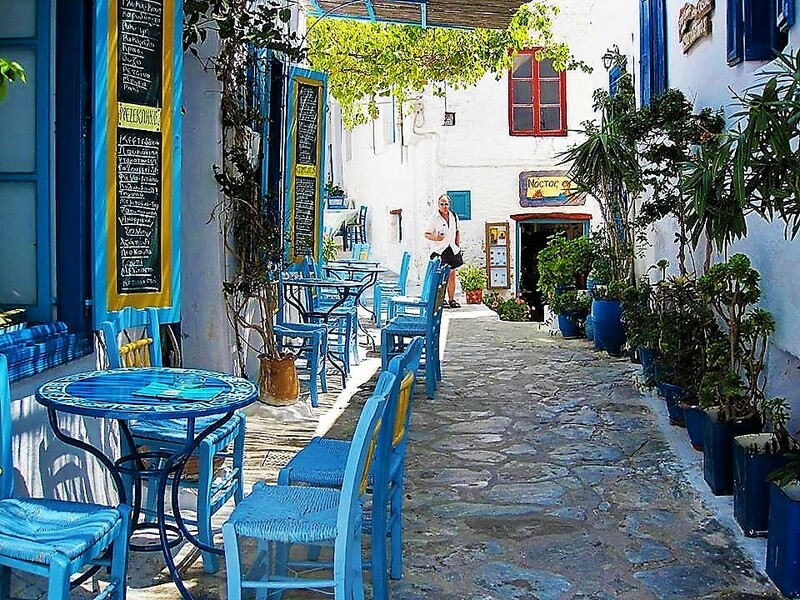 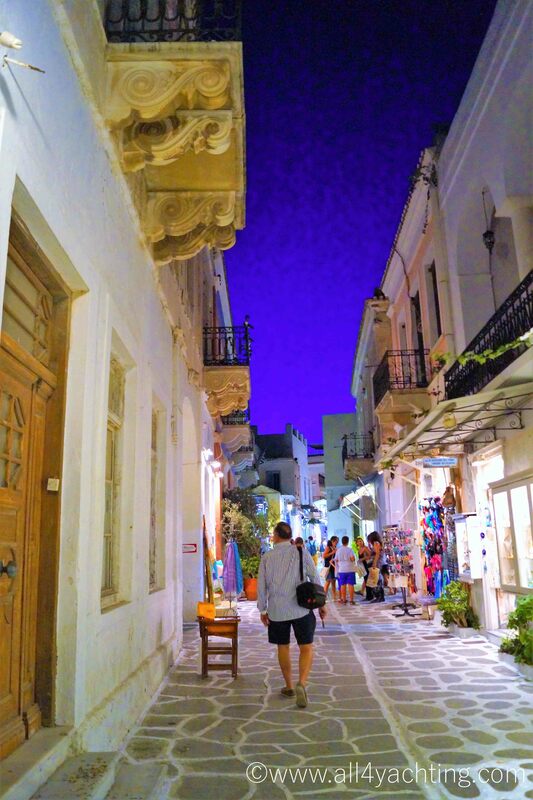 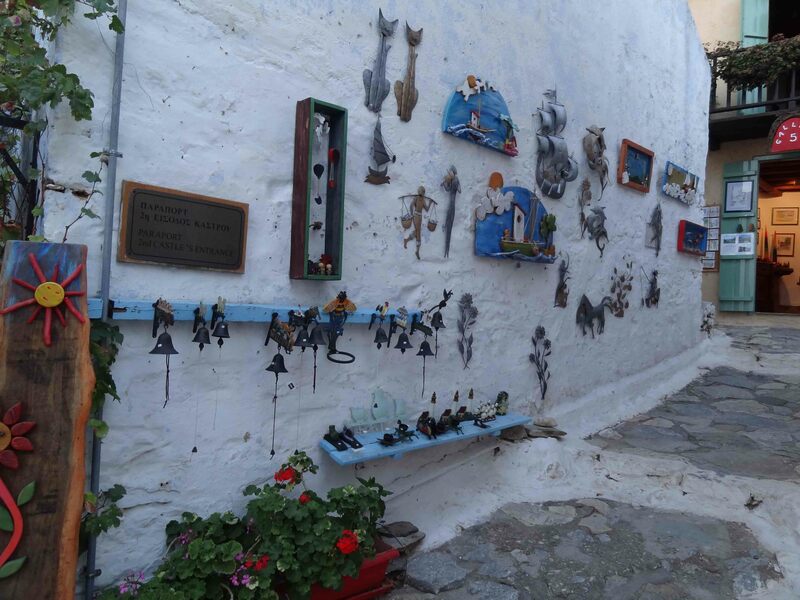 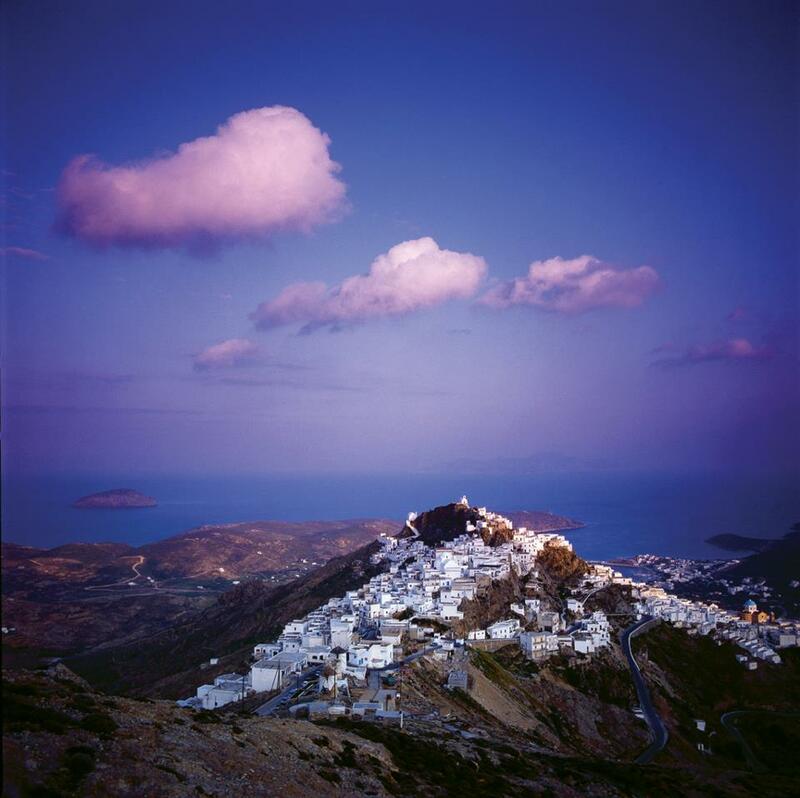 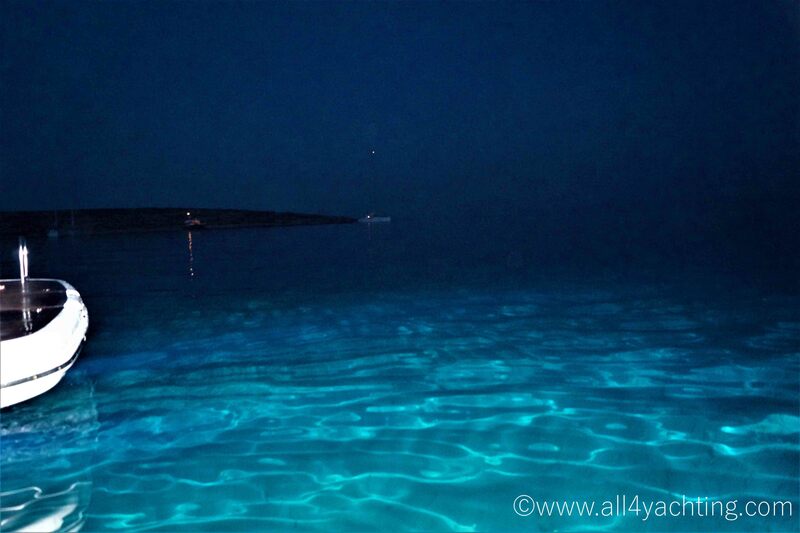 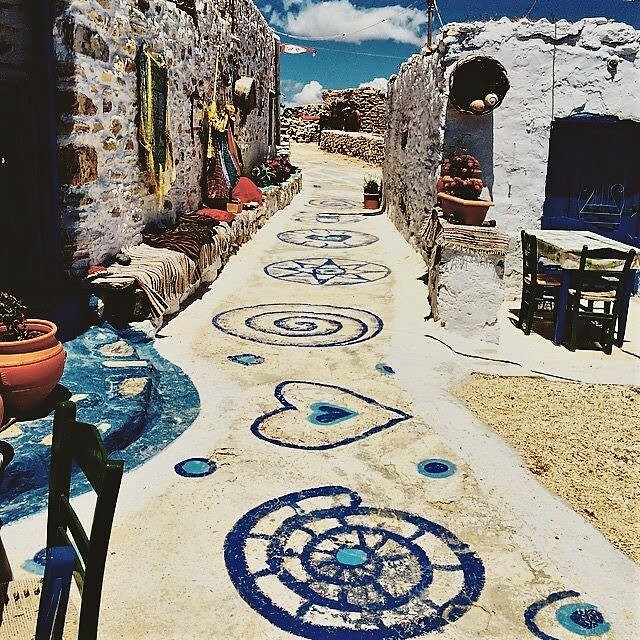 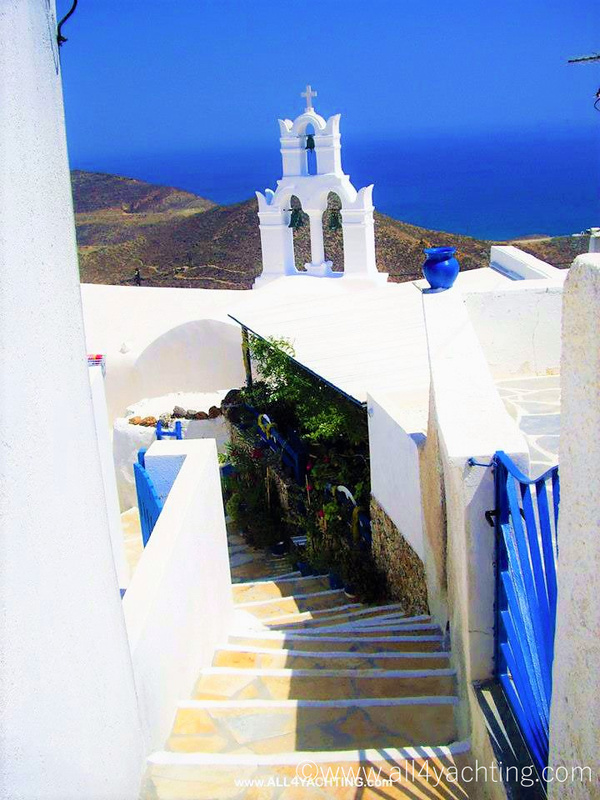 Mass tourism has no place in Cyclades, as all of them keep their authenticity and local character. 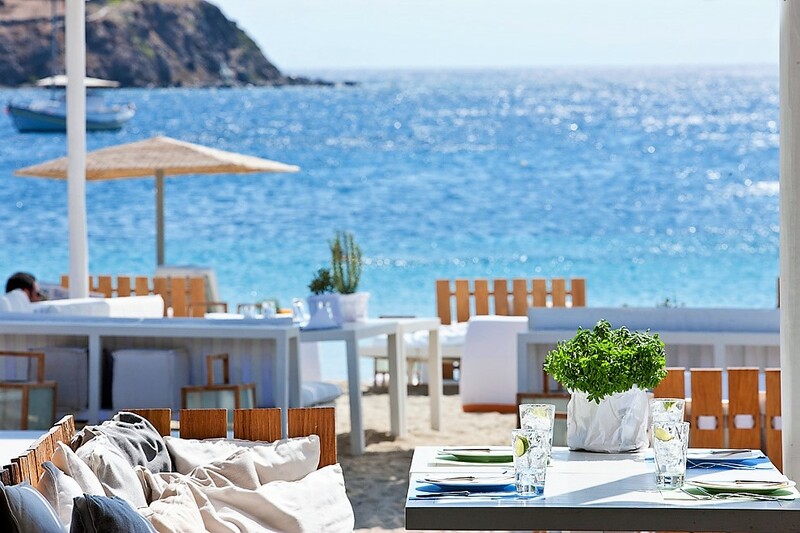 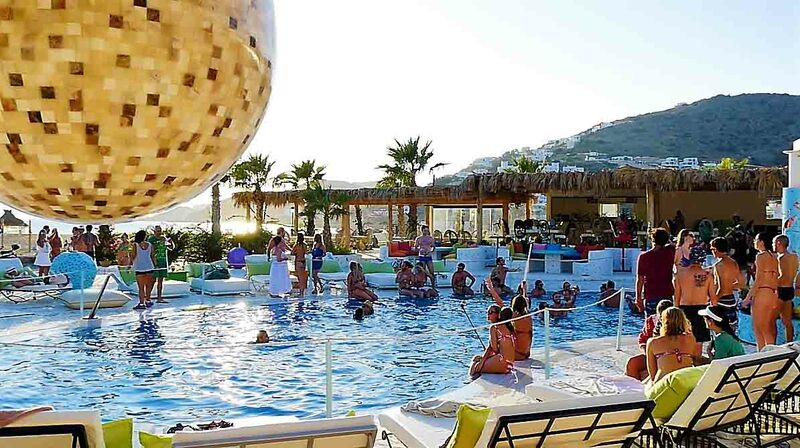 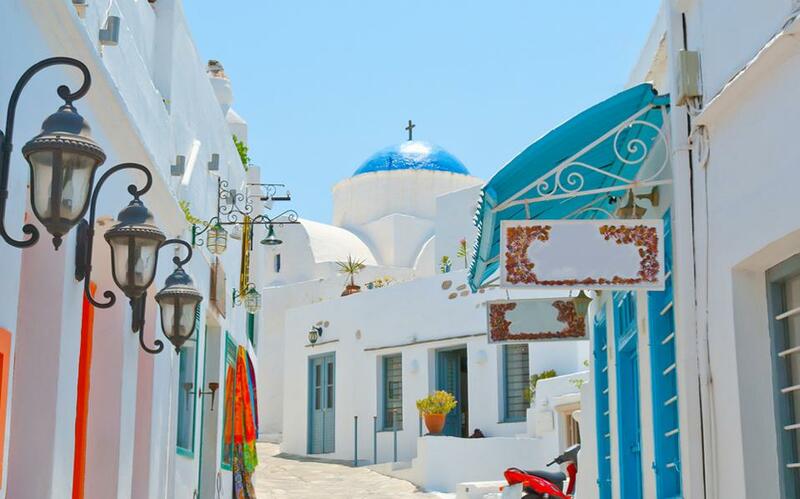 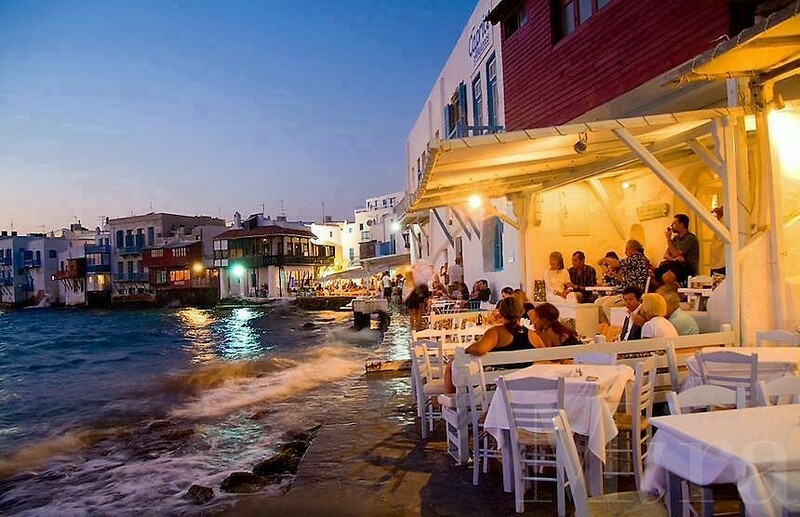 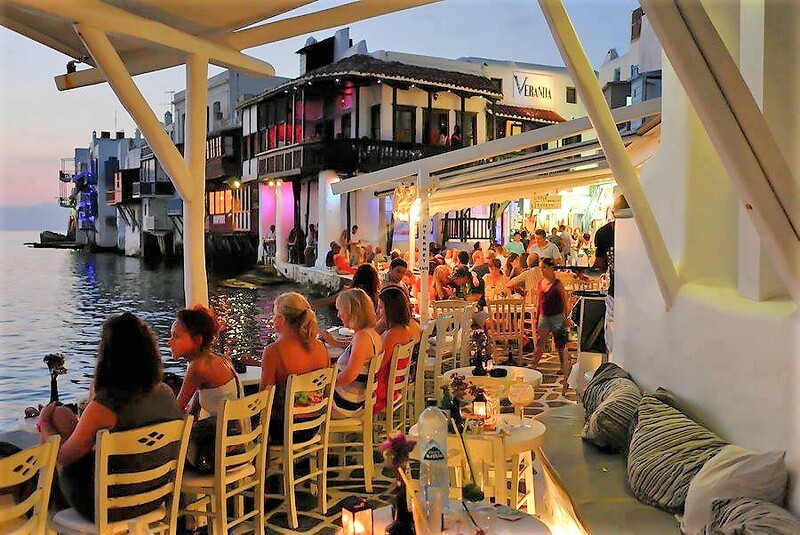 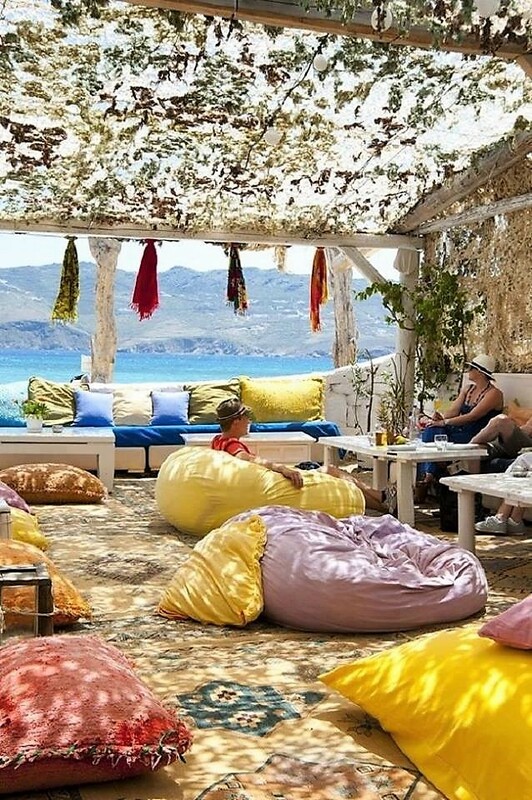 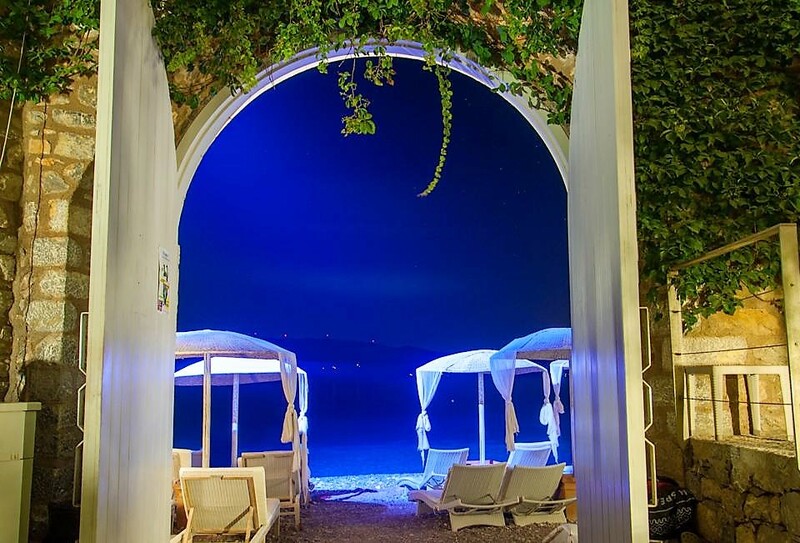 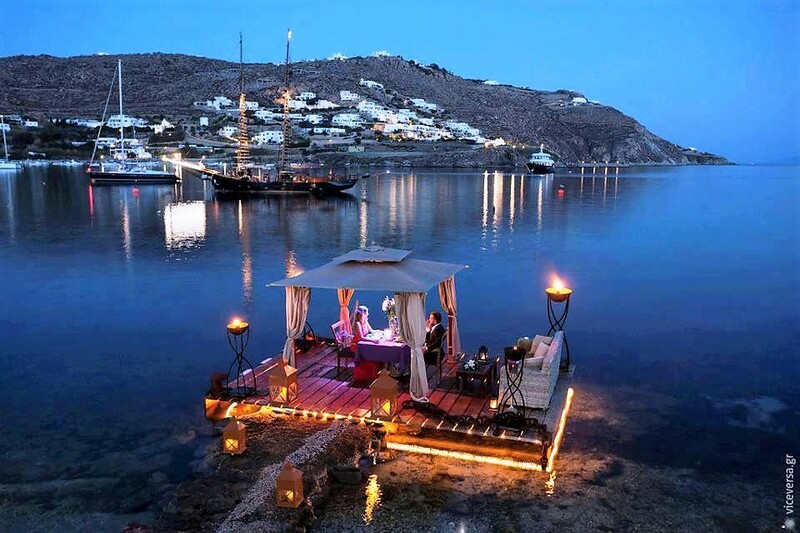 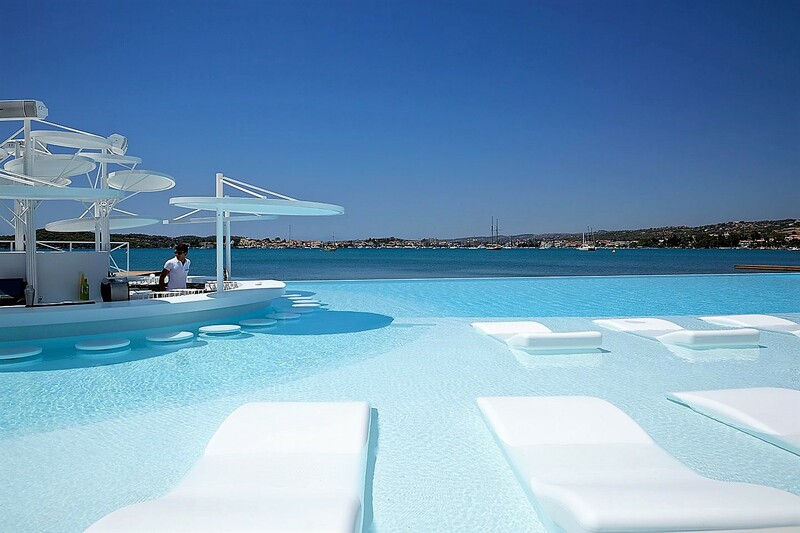 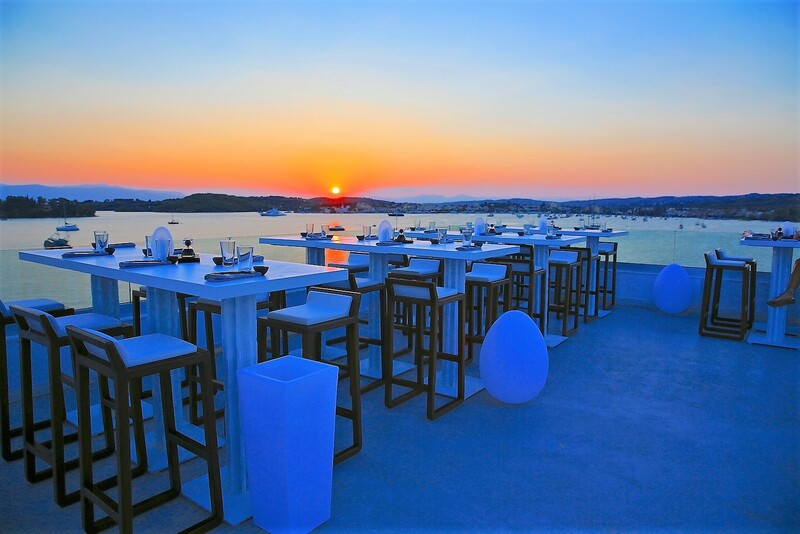 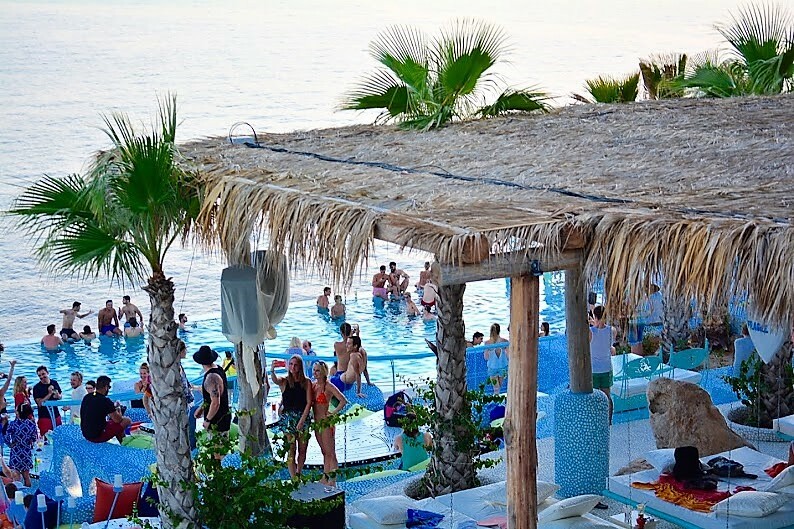 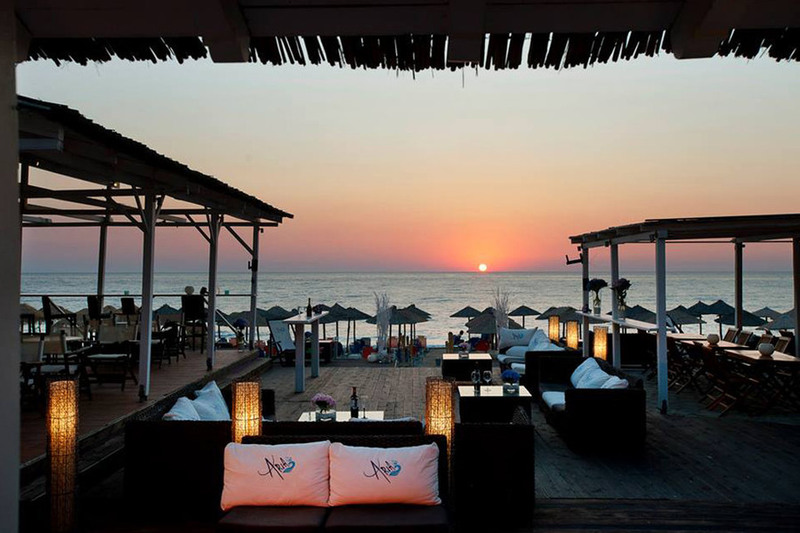 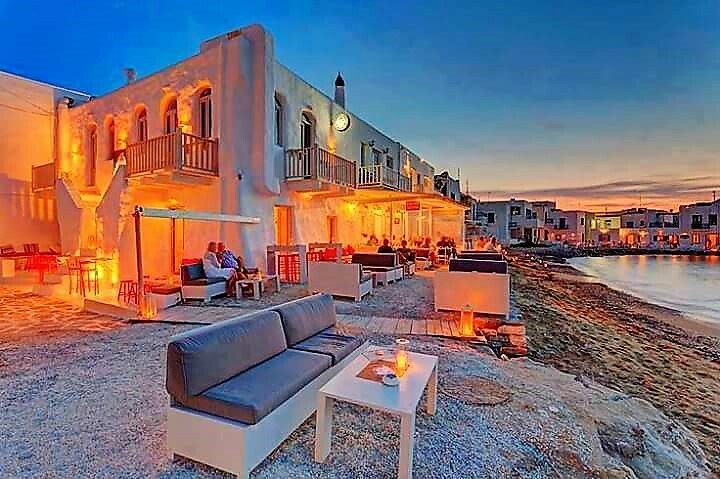 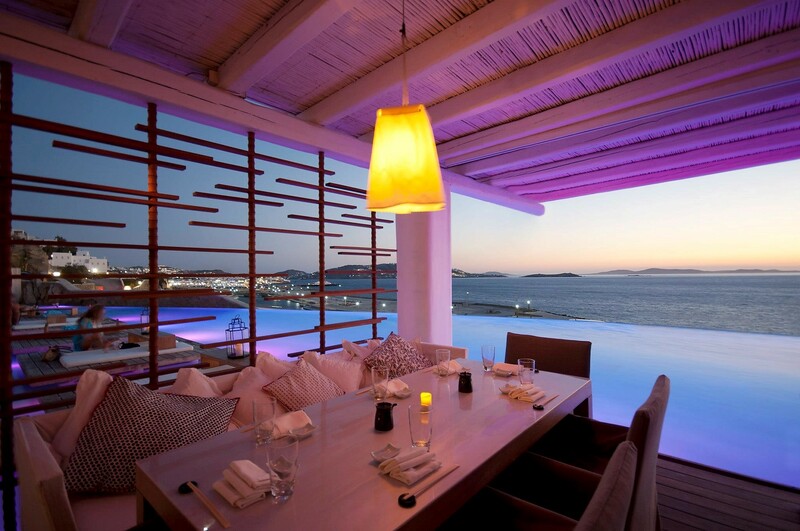 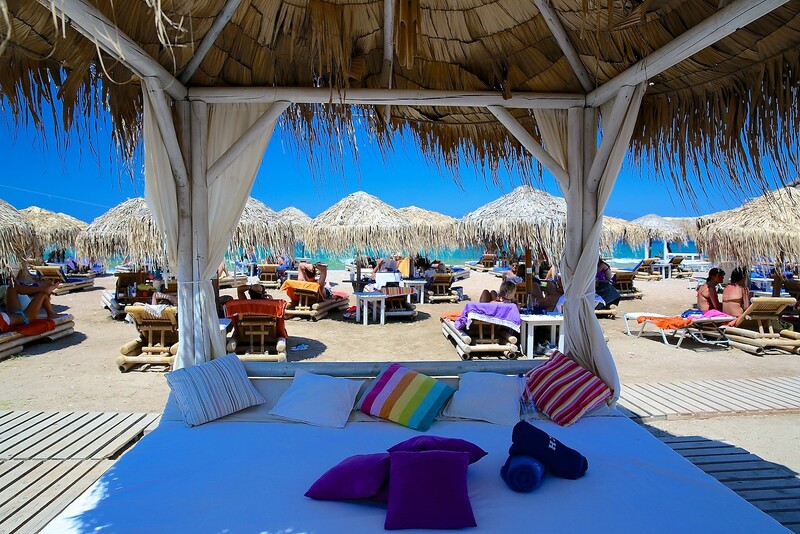 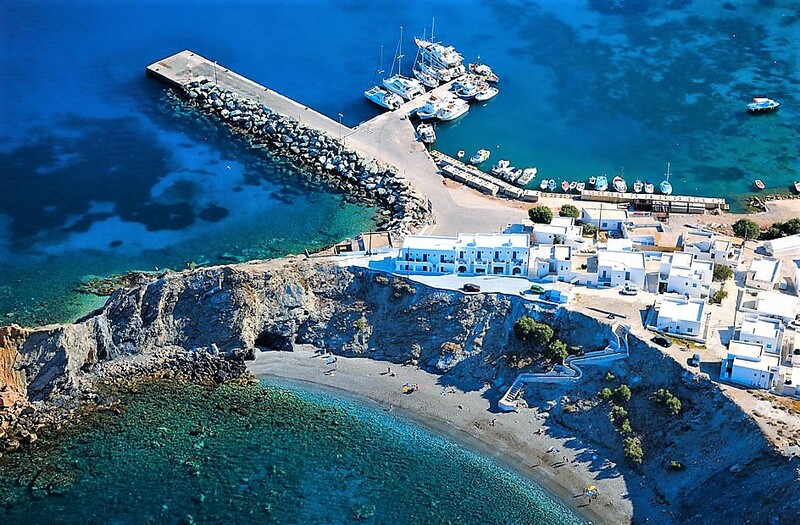 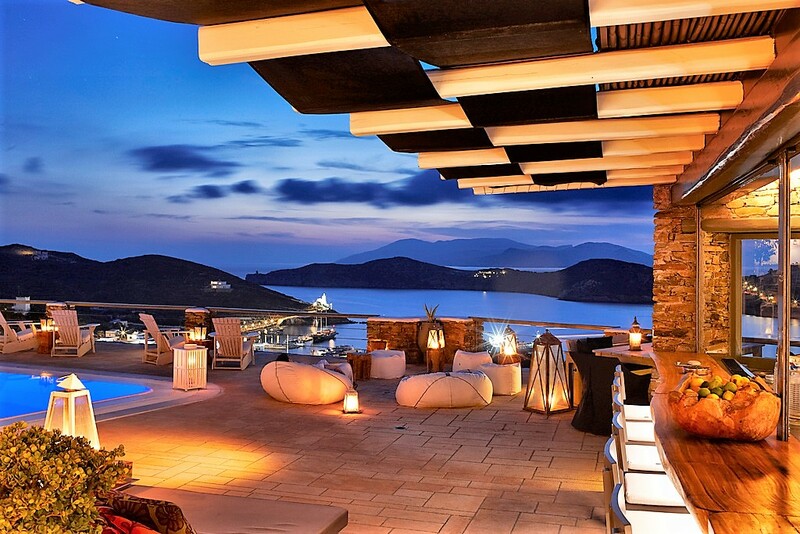 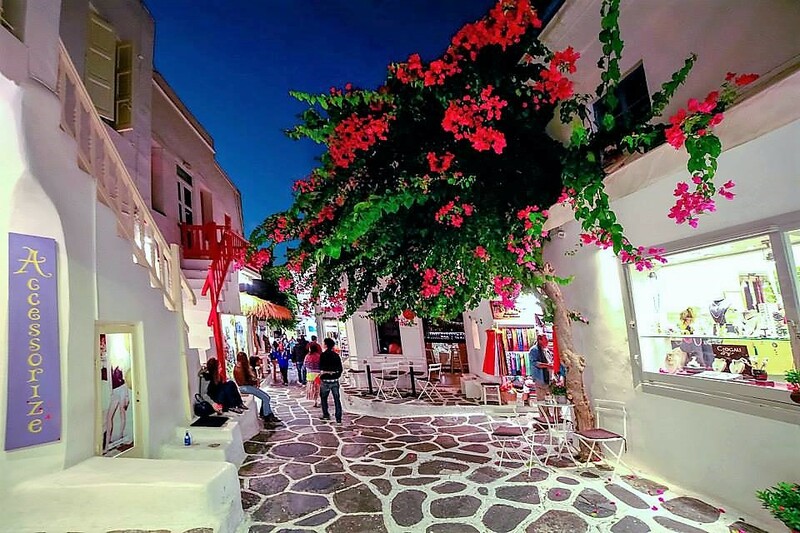 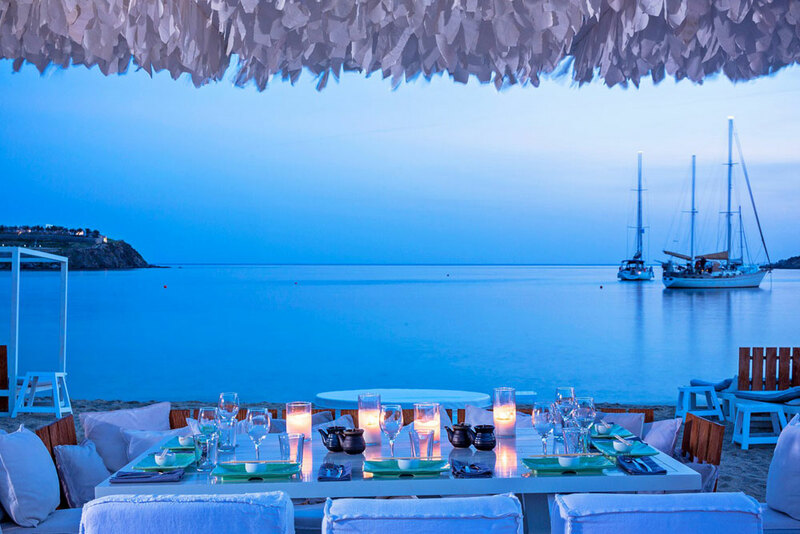 Cosmopolitan, world famous upper class islands, with numerous restaurants, beach bars and intense day and night life, are: Mykonos, Santorini and Paros. 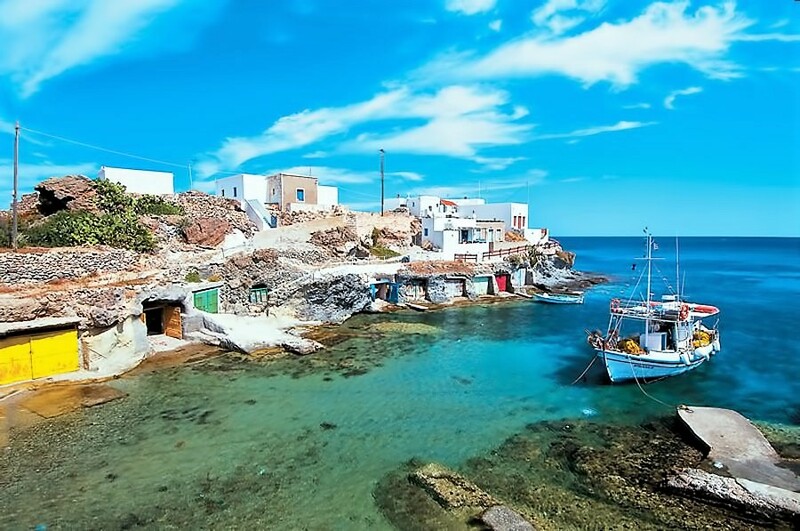 Primitive islands, where life seems to be forgotten in the past, are: Koufonisi, Iraklia, Donousa, Shinousa, Kythnos, Sikinos, Anafi. 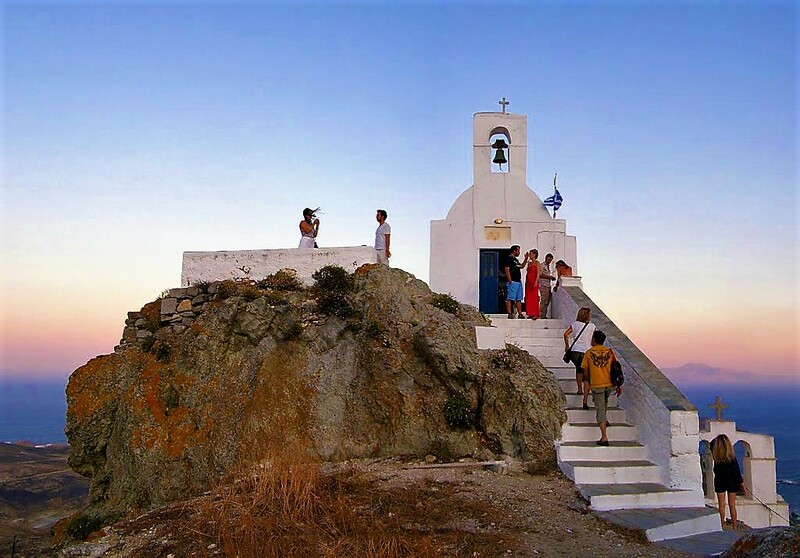 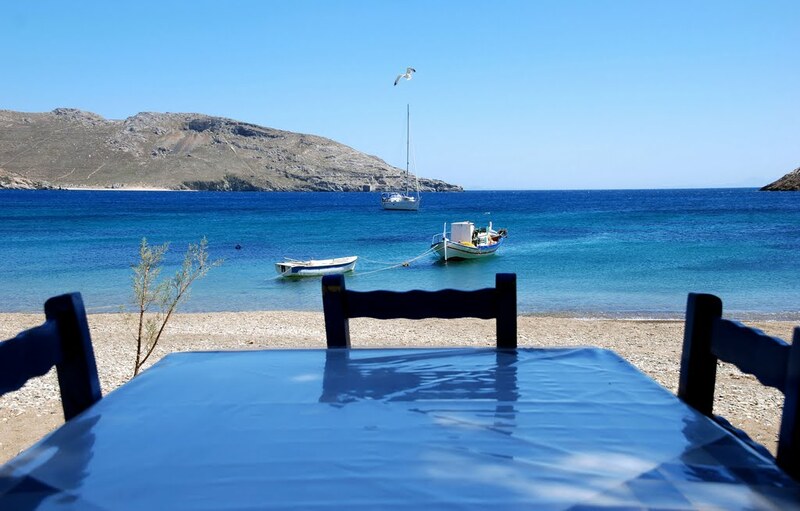 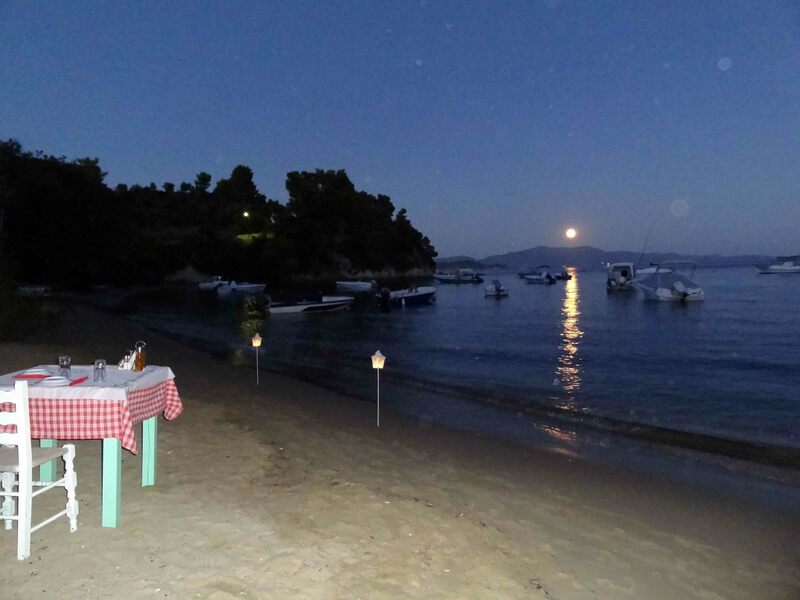 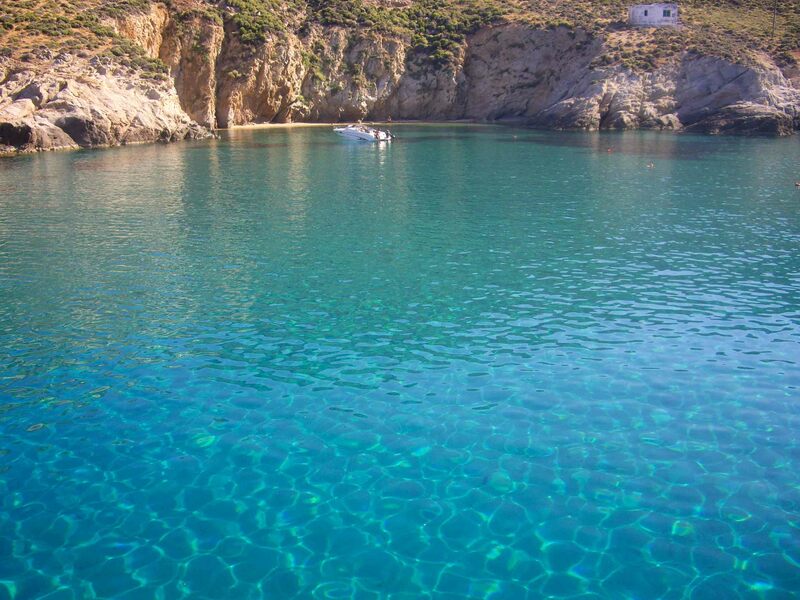 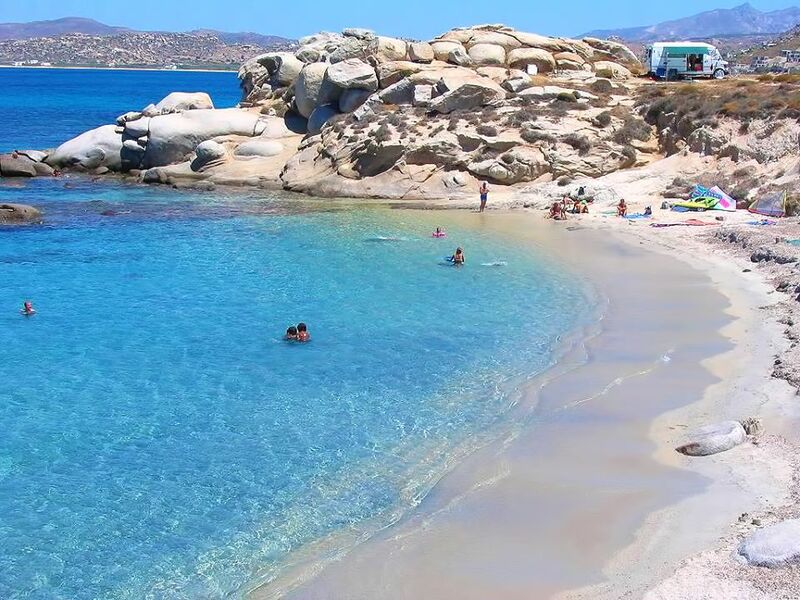 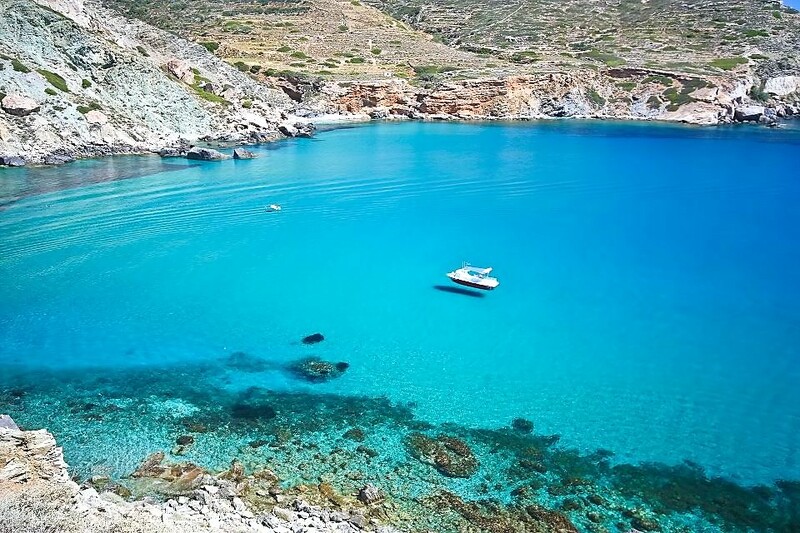 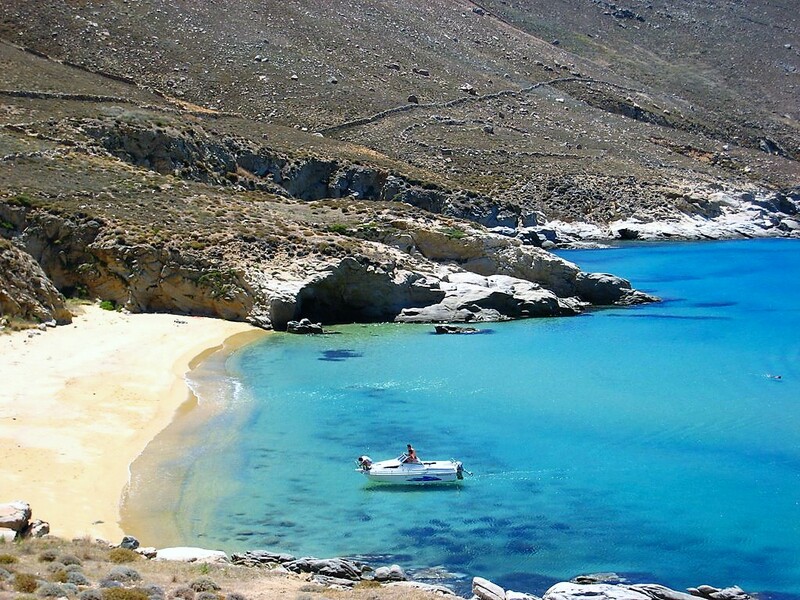 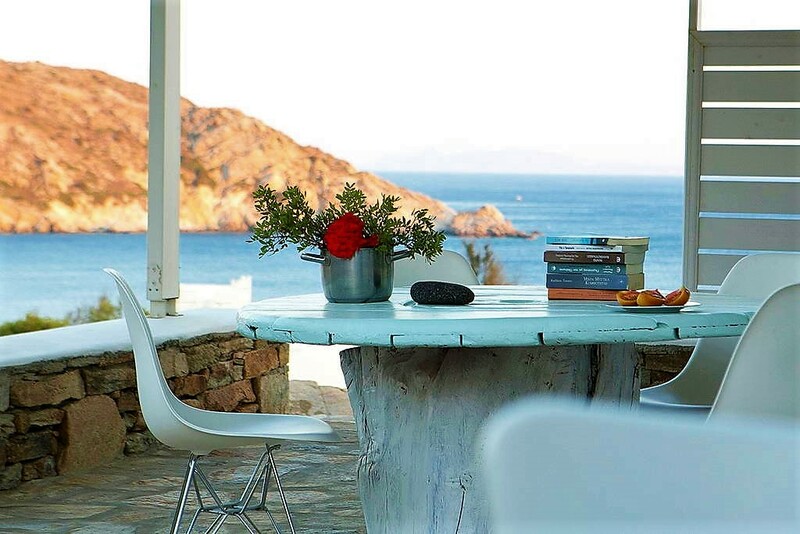 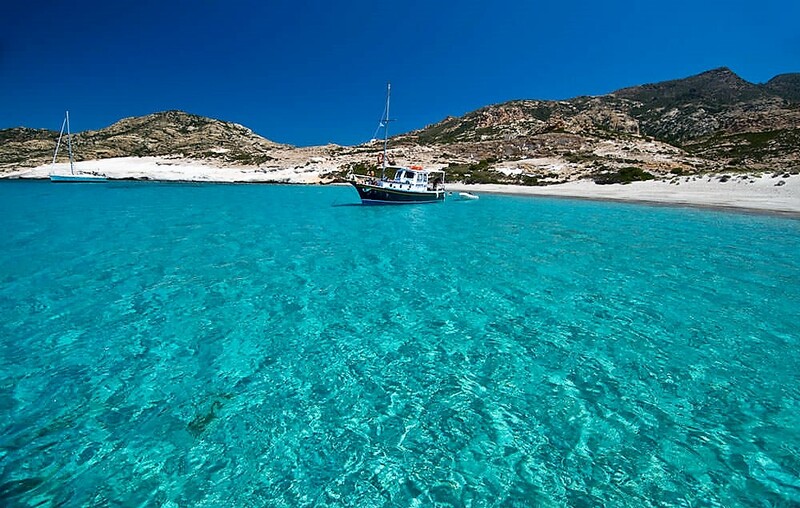 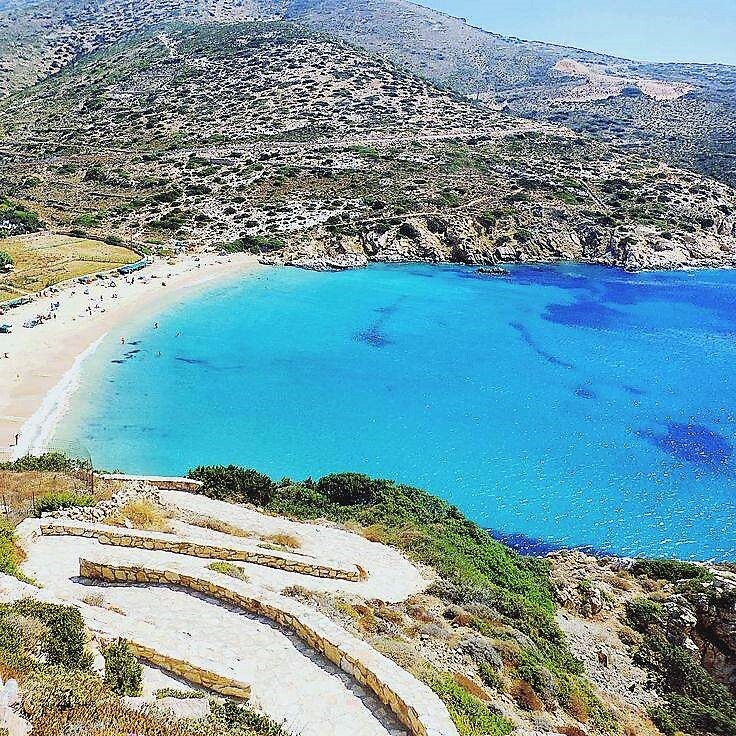 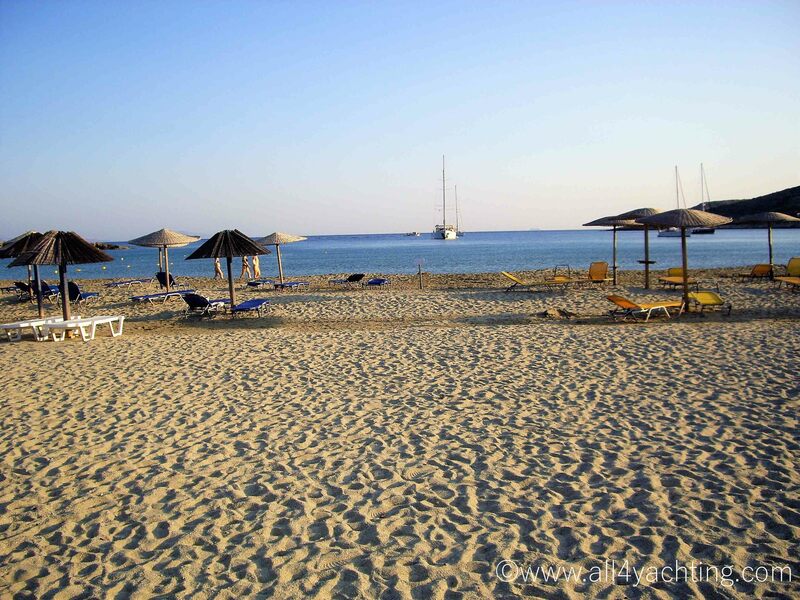 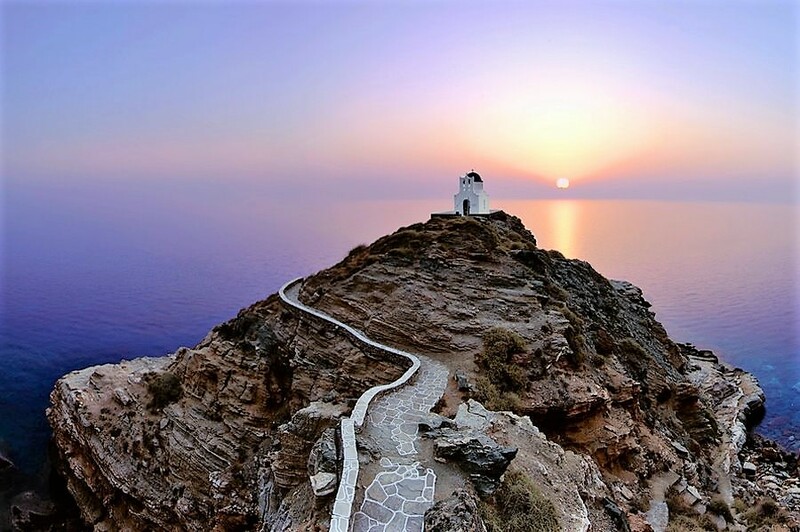 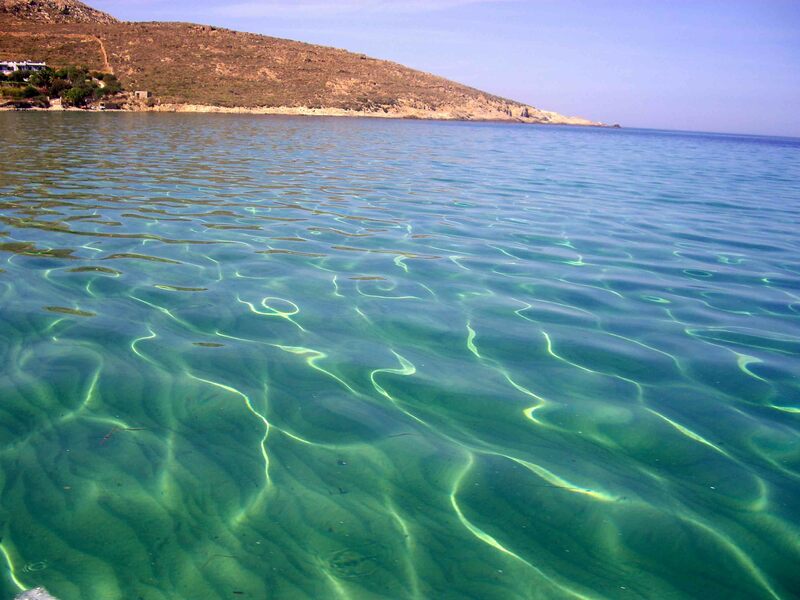 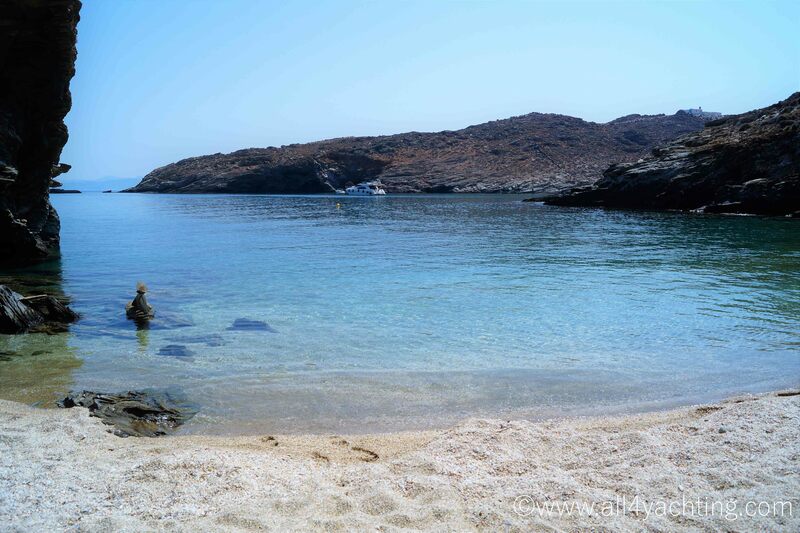 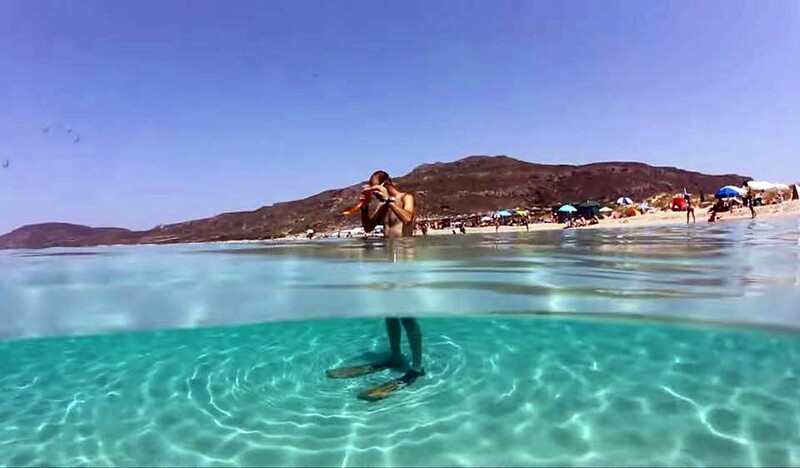 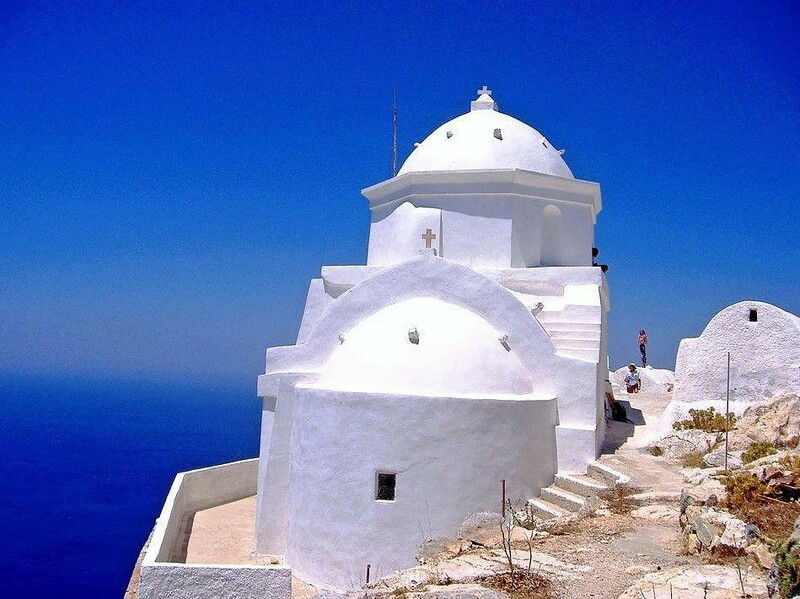 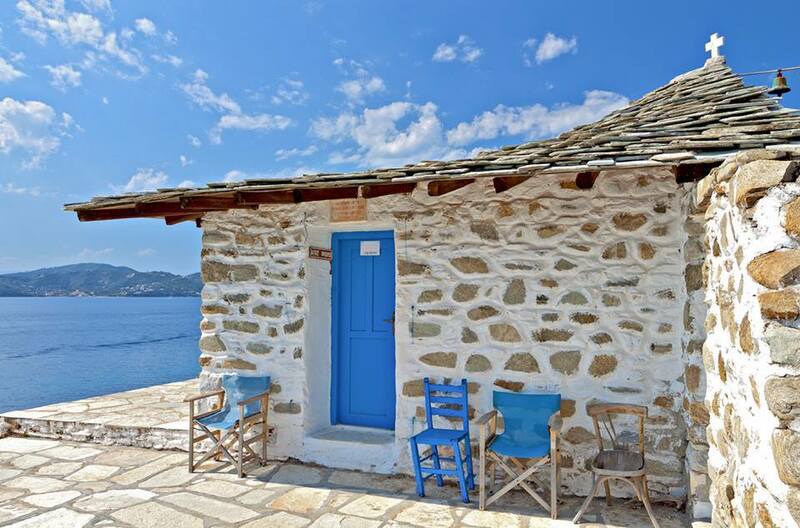 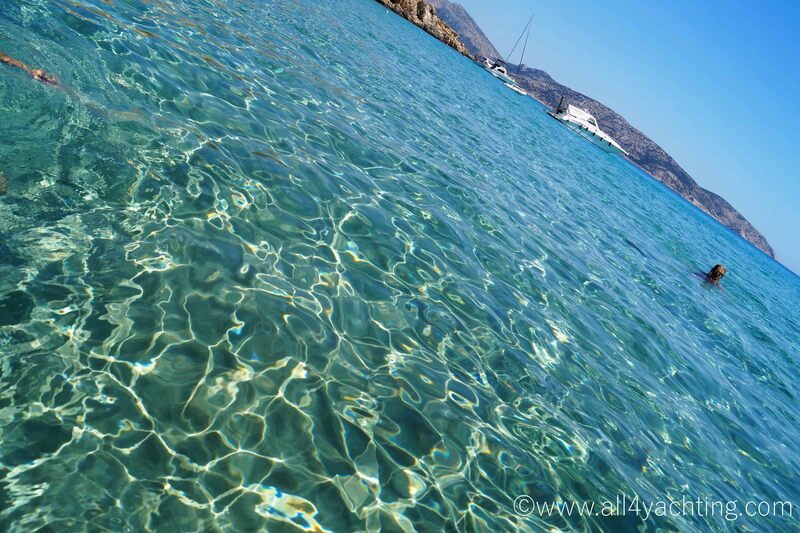 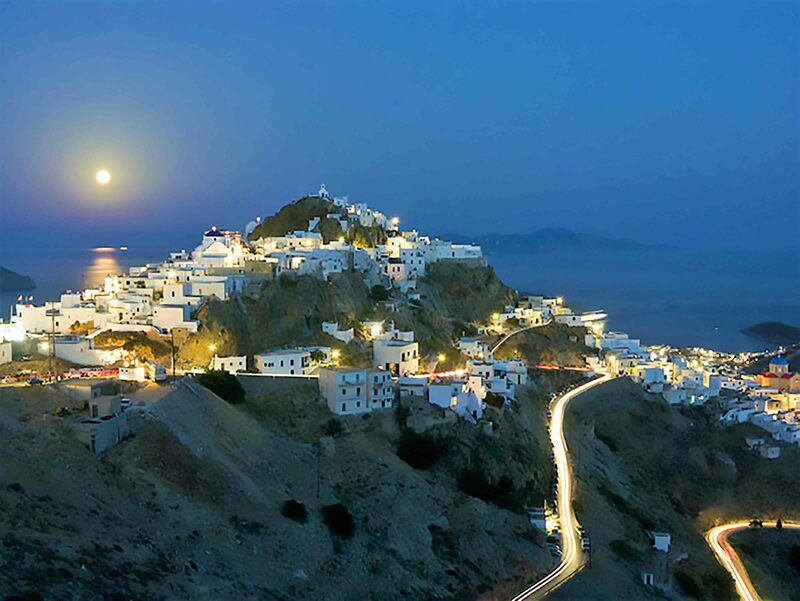 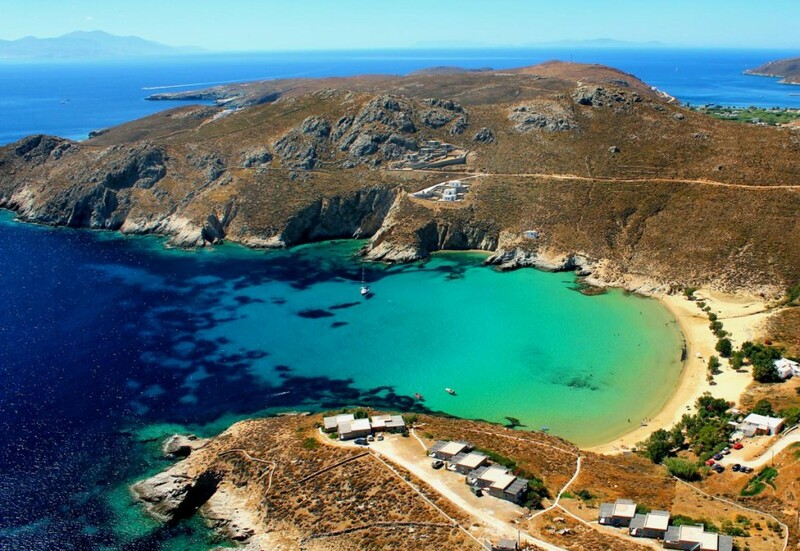 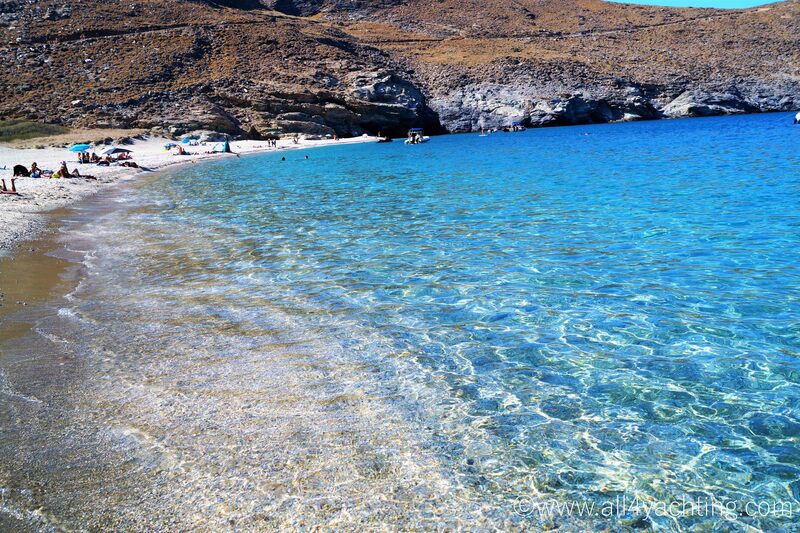 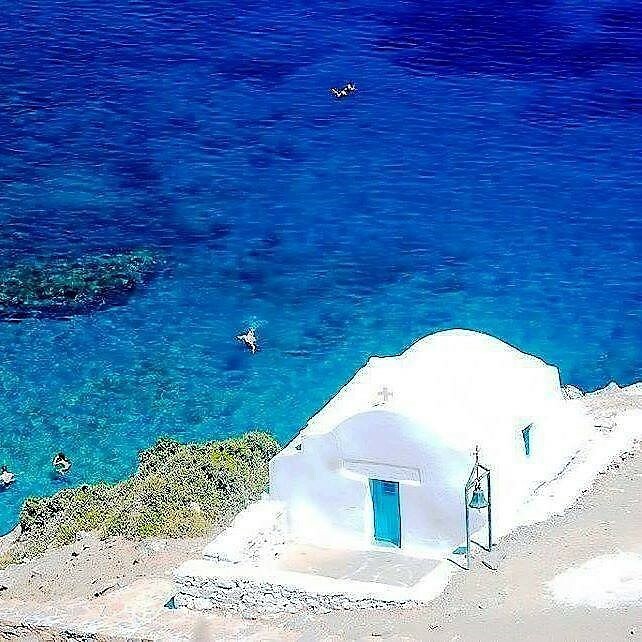 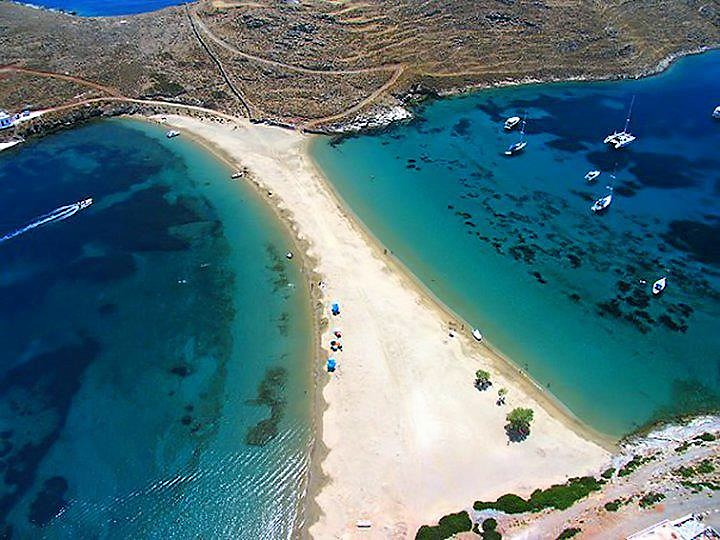 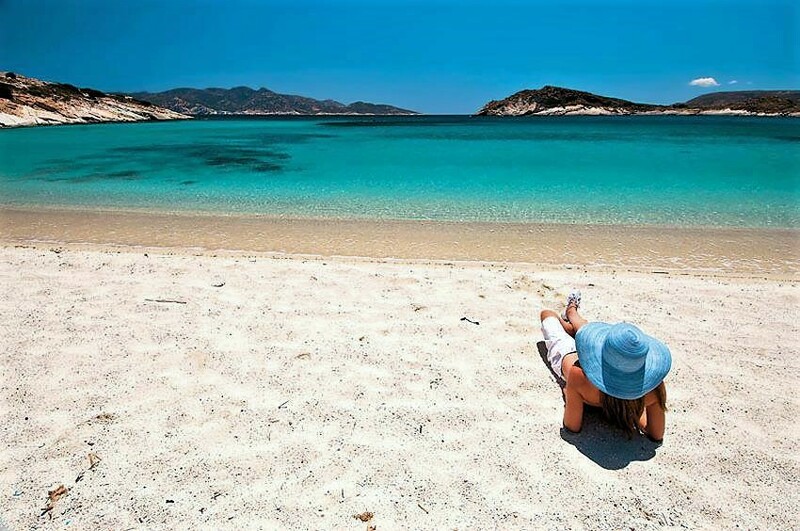 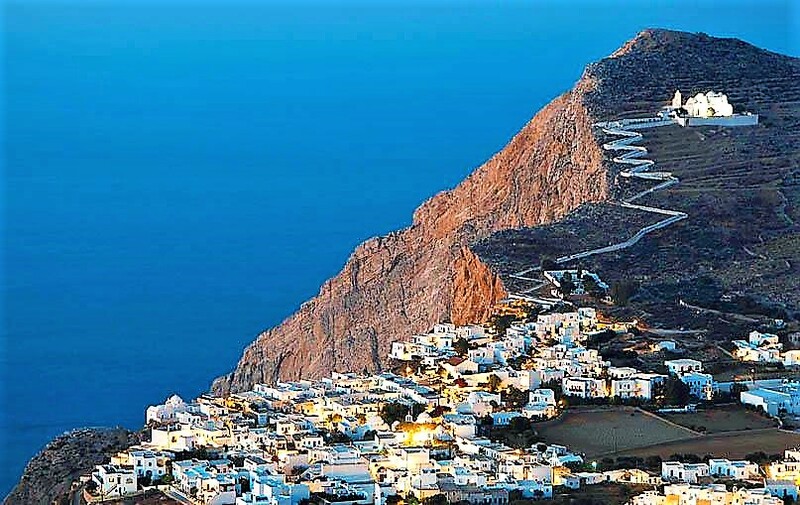 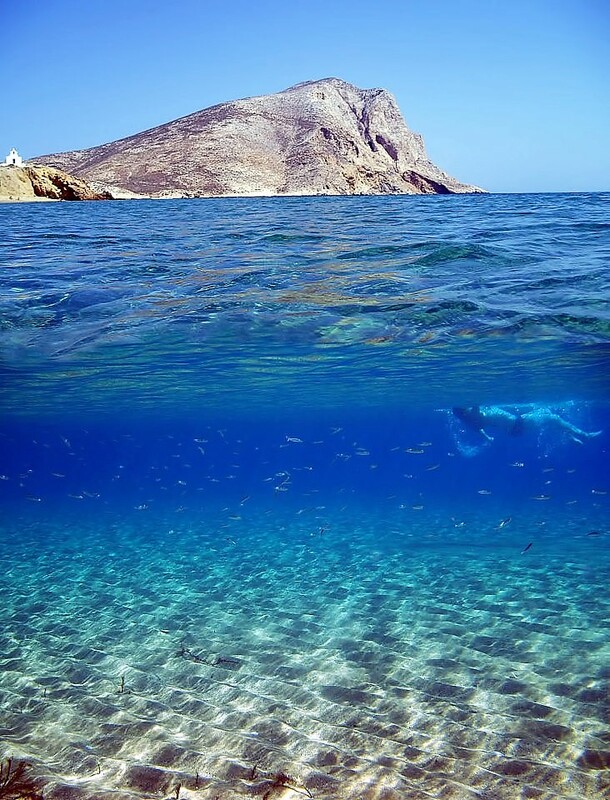 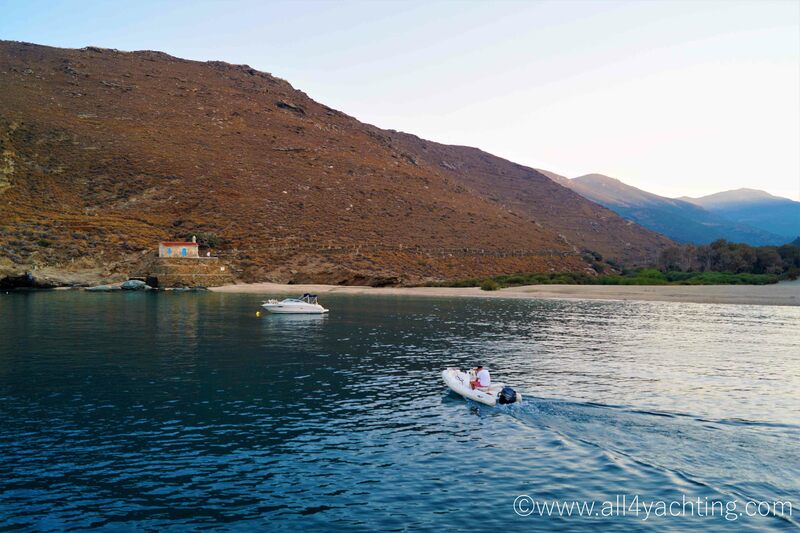 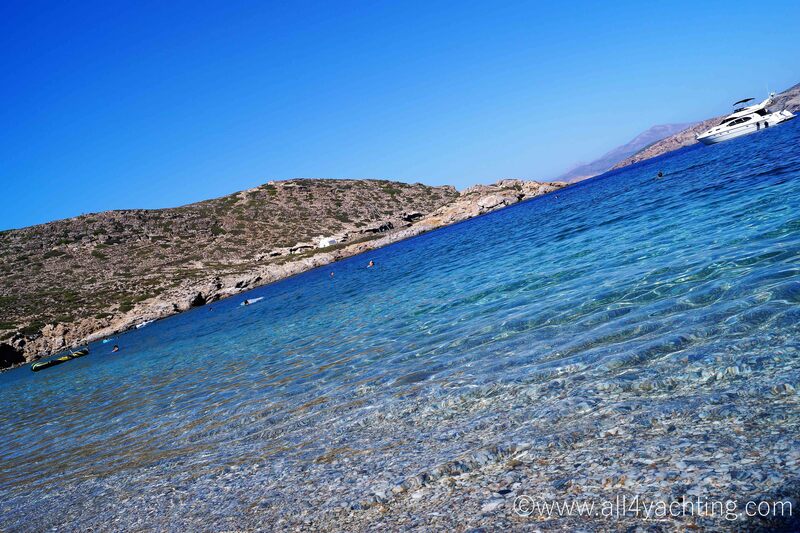 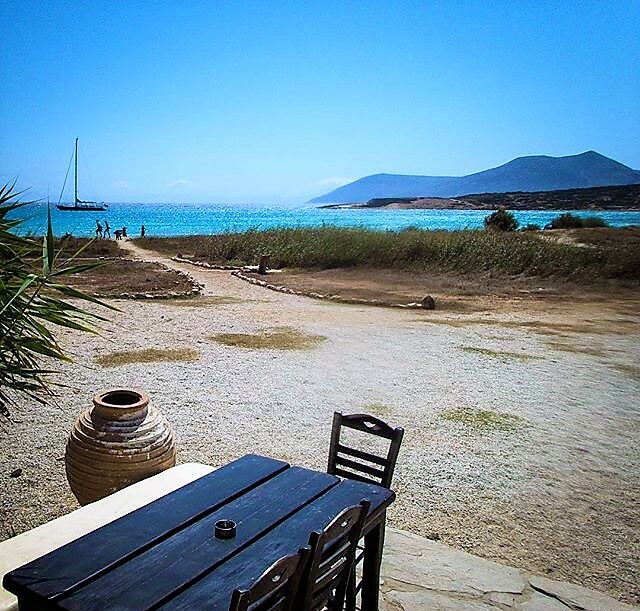 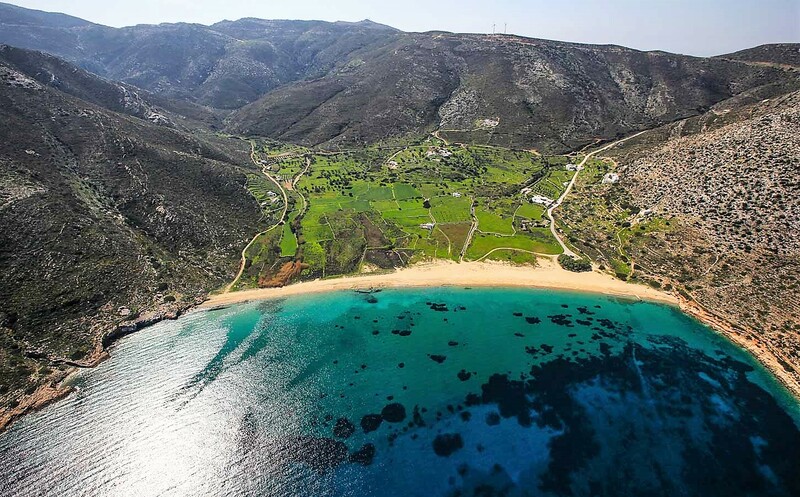 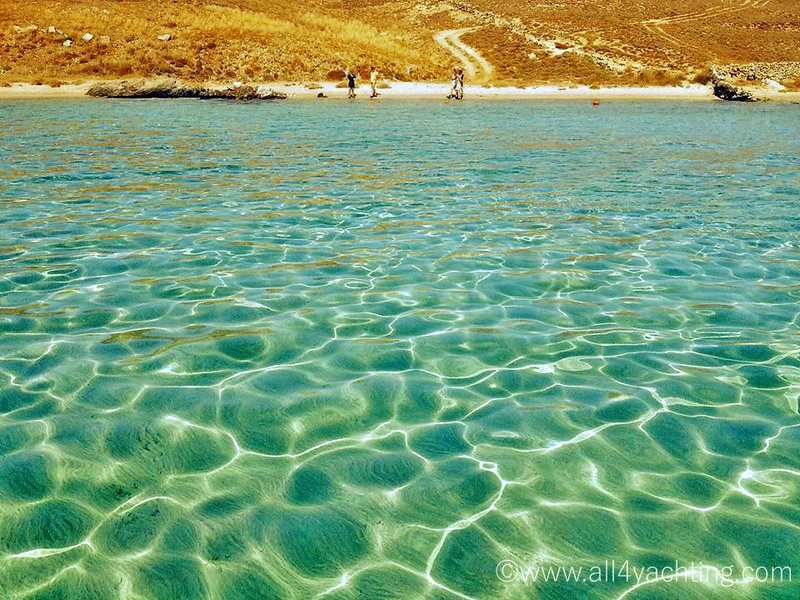 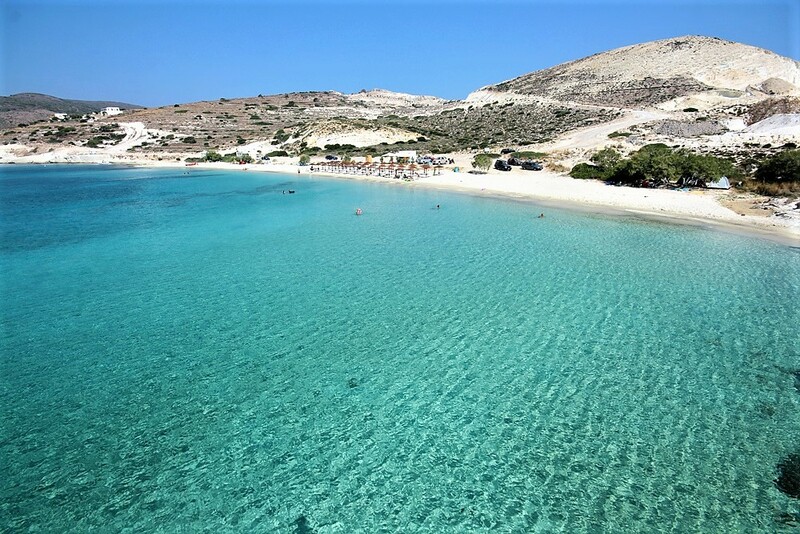 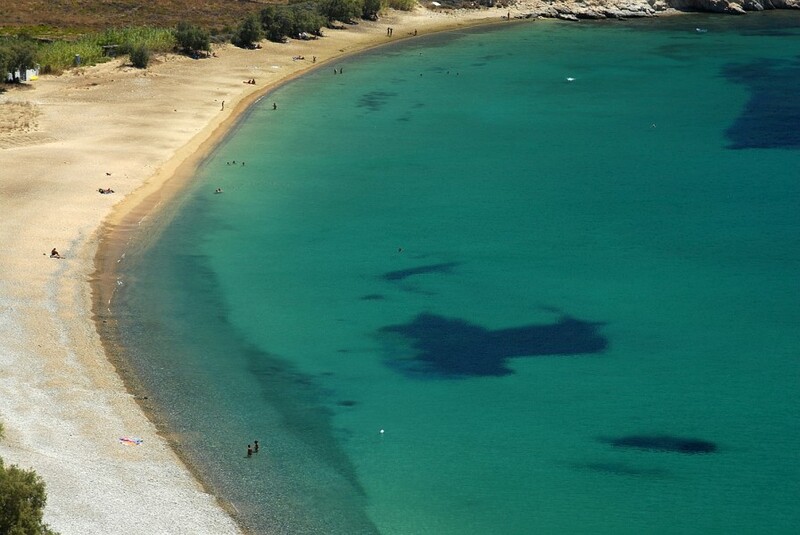 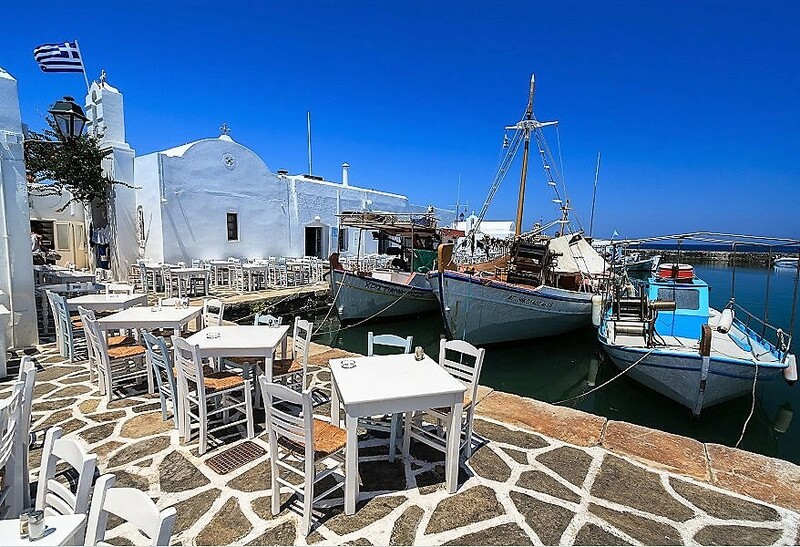 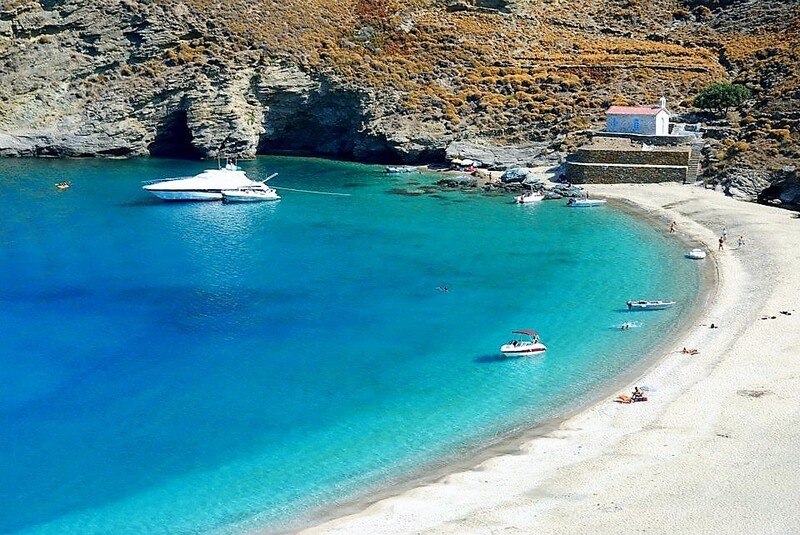 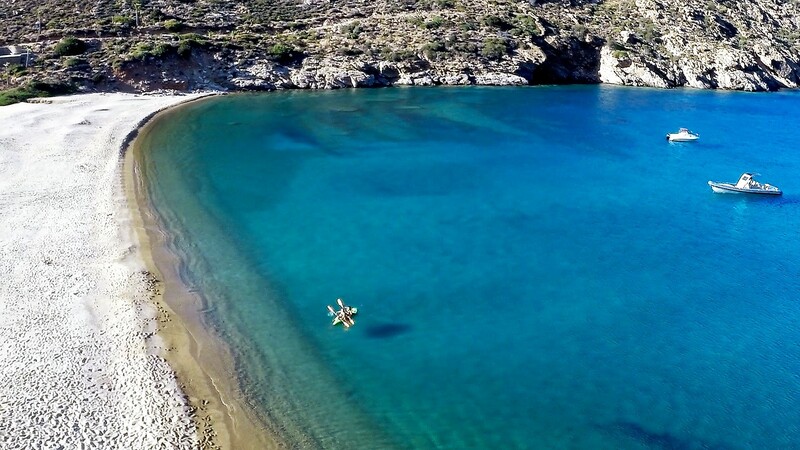 Traditional islands offering equally primitiveness and a satisfactory level of quality tourist and entertainment infrastructure, are: Folegandros, Amorgos, Milos, Ios, Sifnos, Serifos, Kea (Tzia), Antiparos. 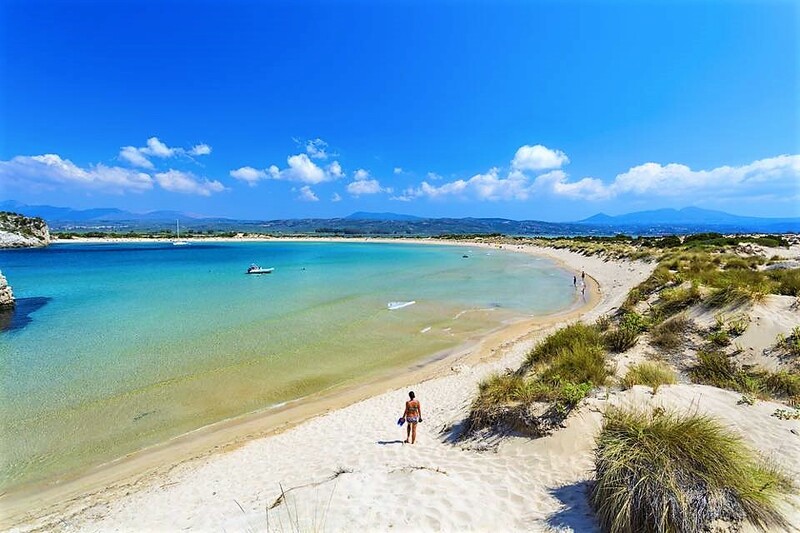 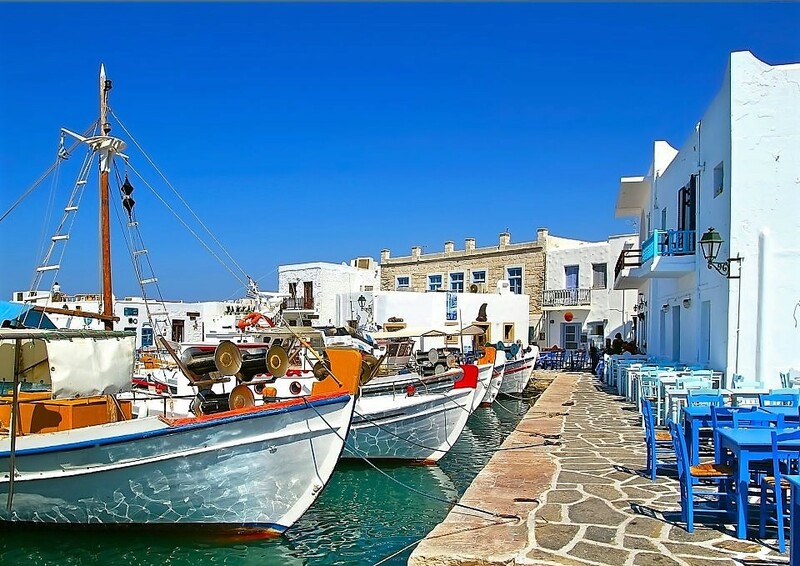 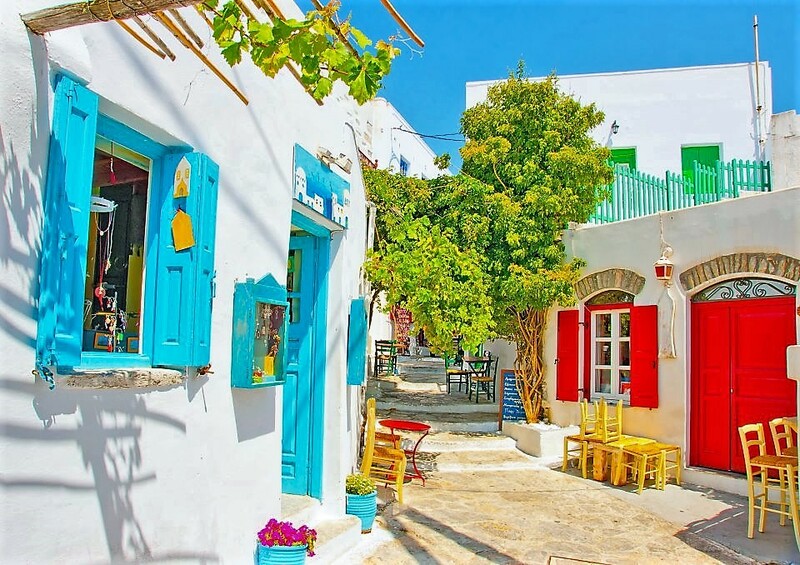 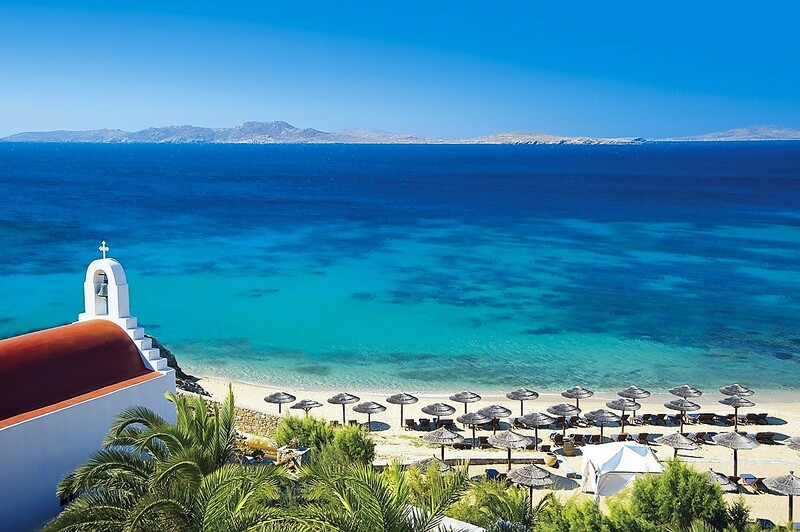 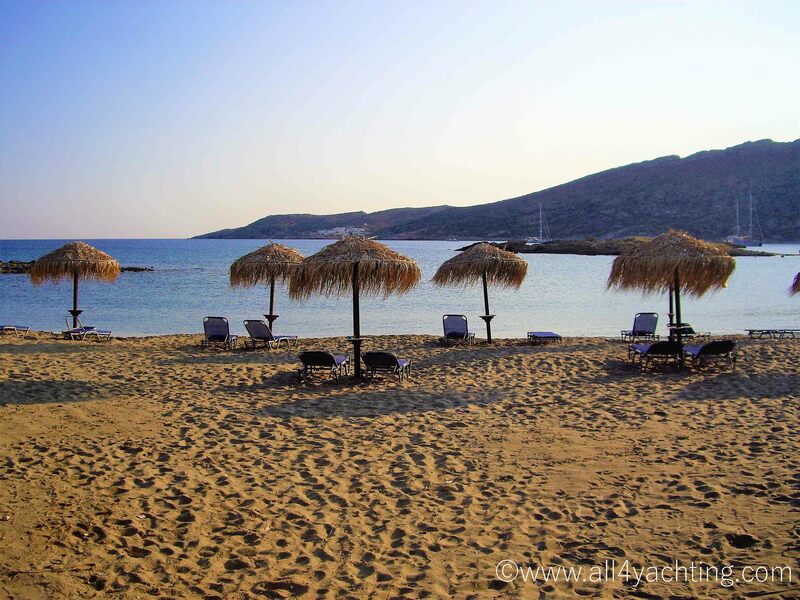 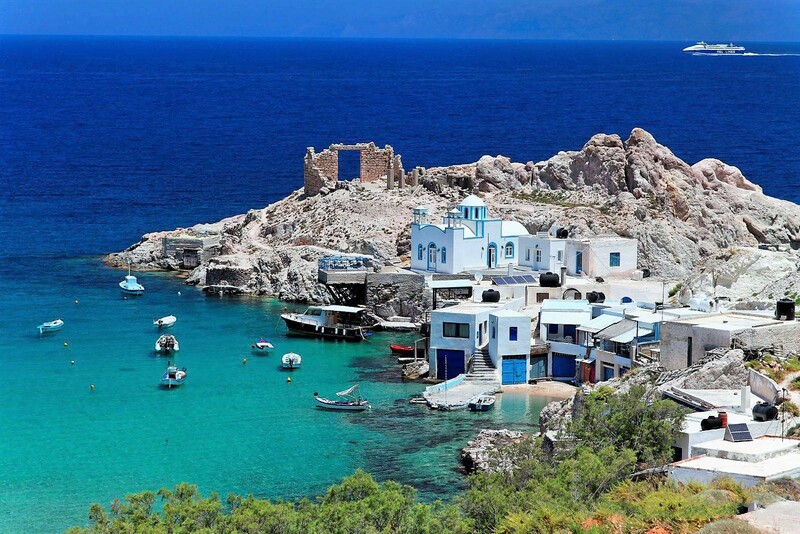 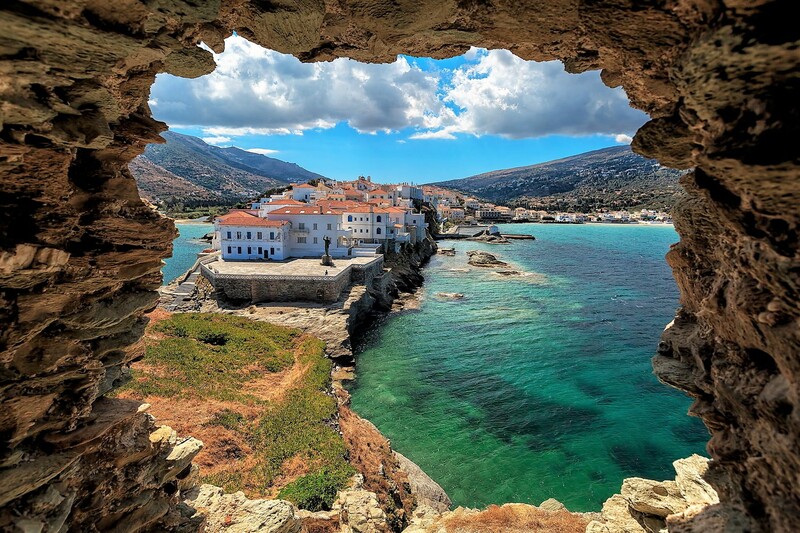 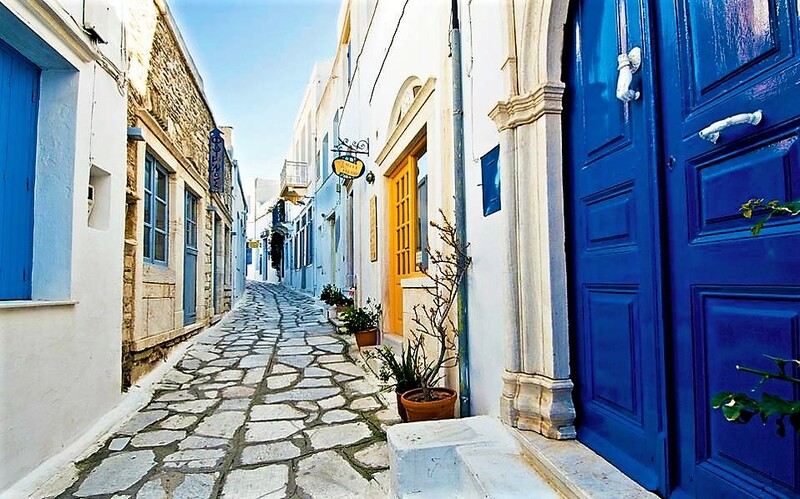 Family destinations, with quite developed yet picturesque small capital Towns and a satisfactory level of tourist and entertainment infrastructure, are: Naxos, Andros, Syros, Tinos. 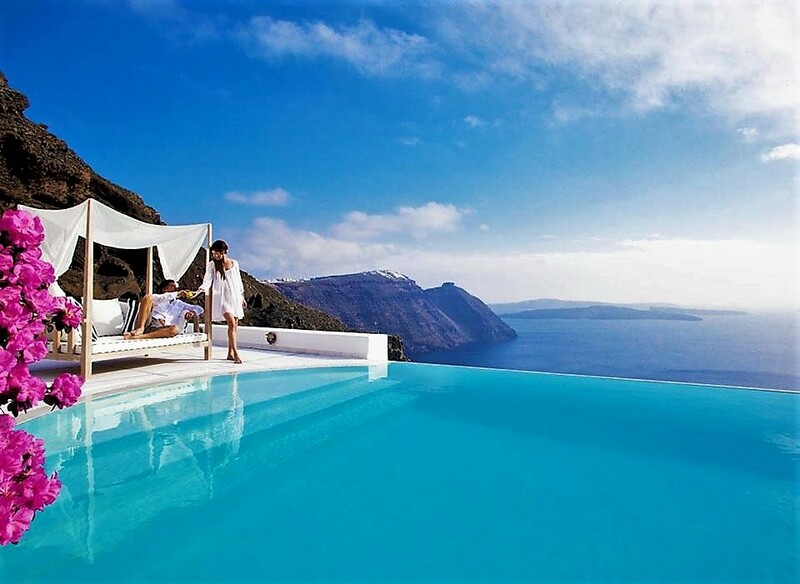 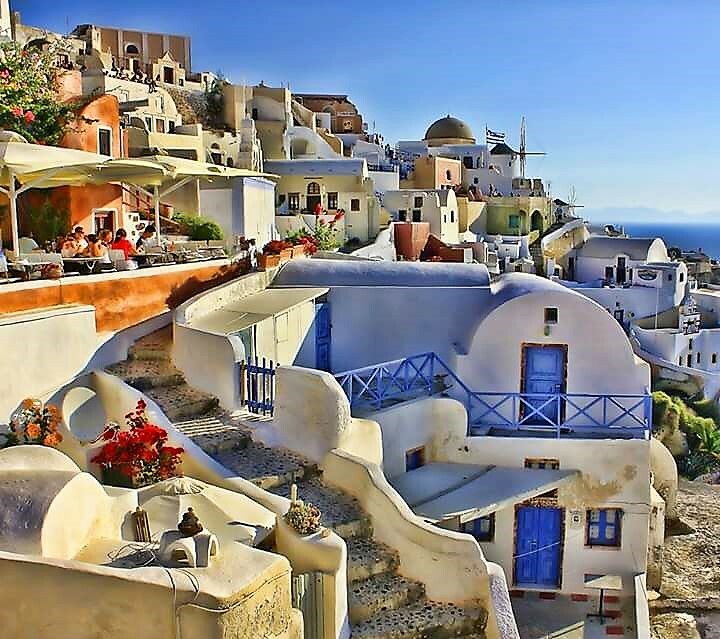 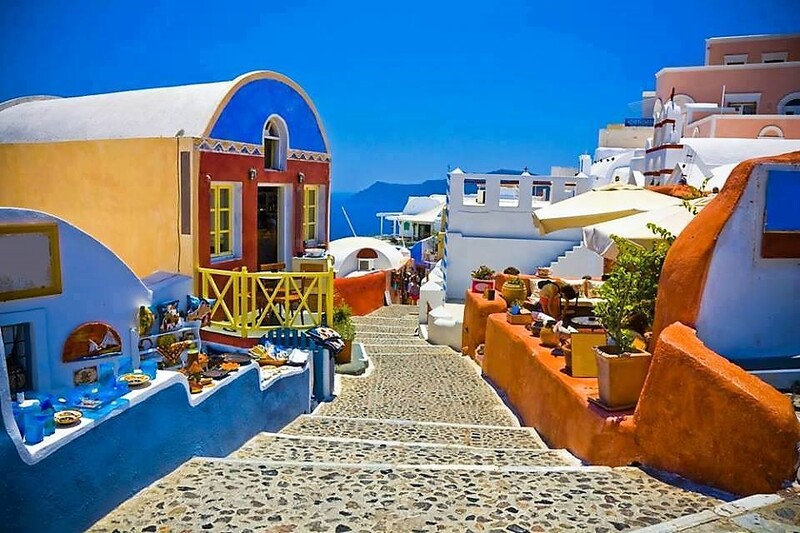 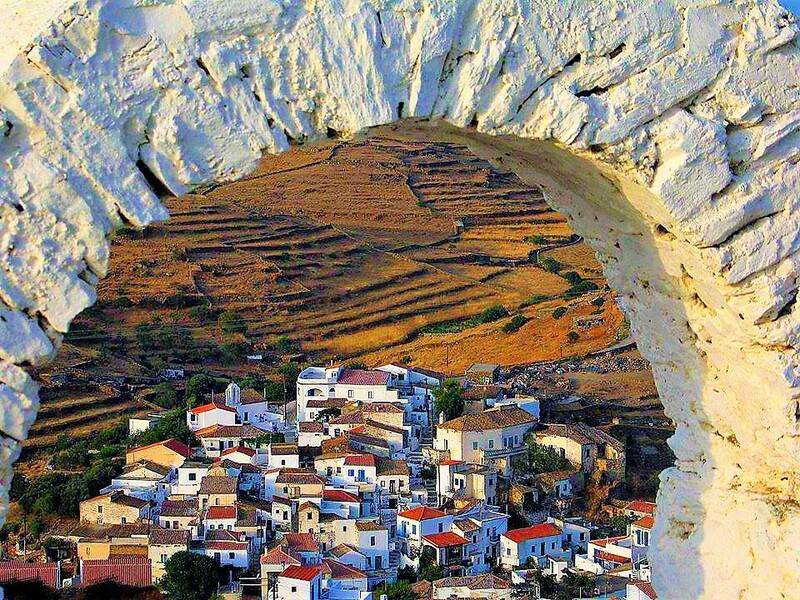 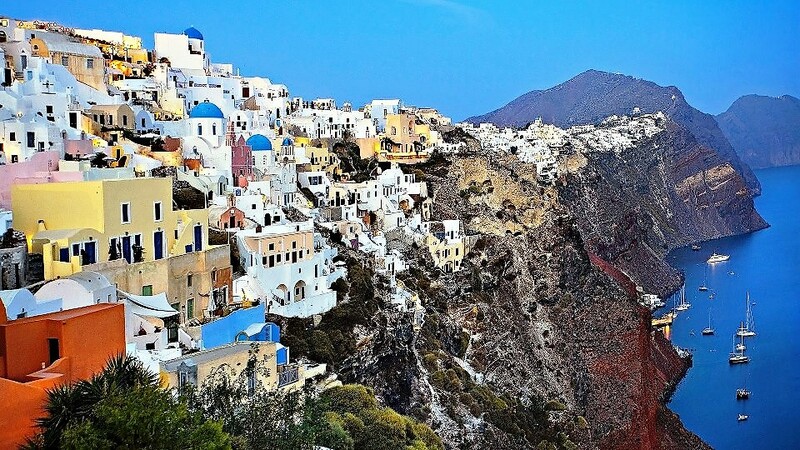 Unique volcanic landscapes with breathtaking natural beauty, are: Santorini, Milos, Kimolos, Polyegos (uninhabited). 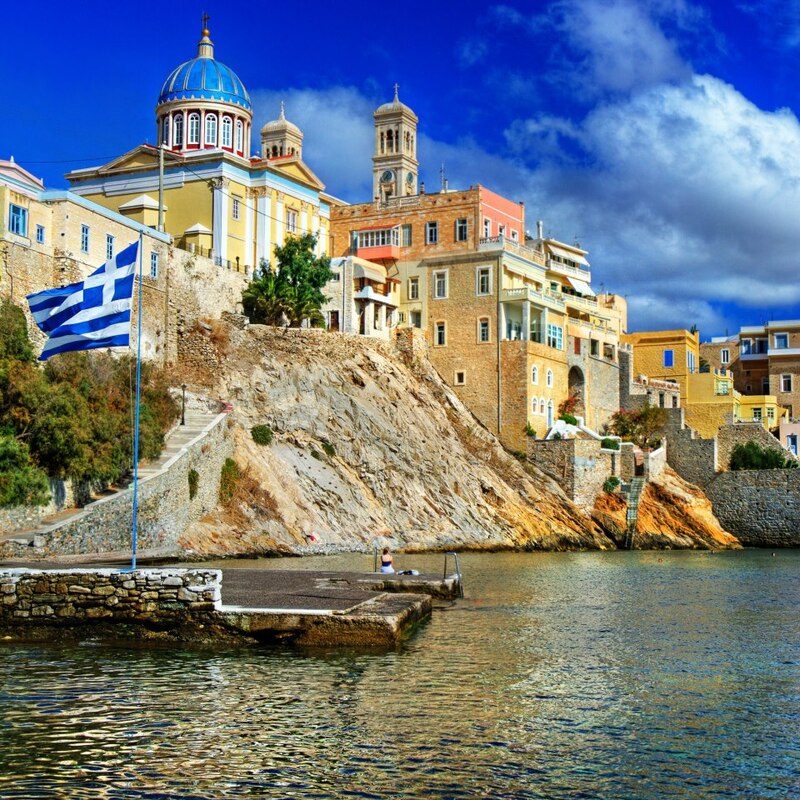 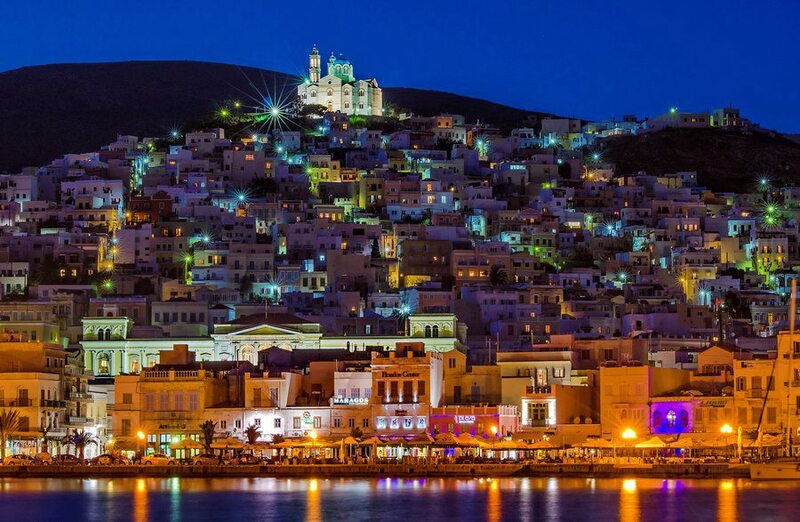 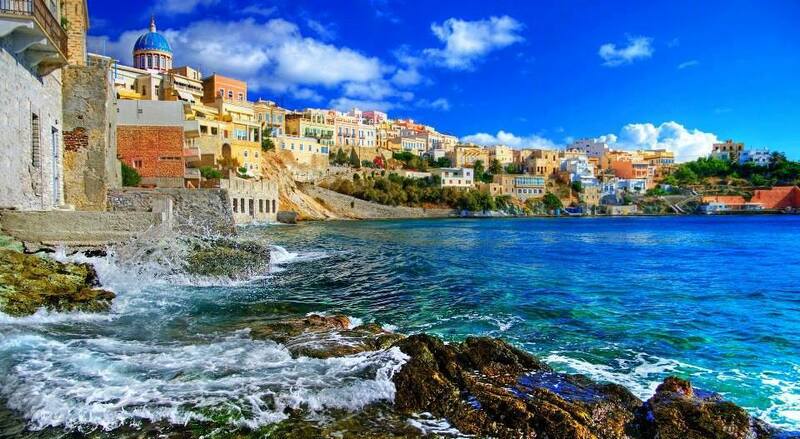 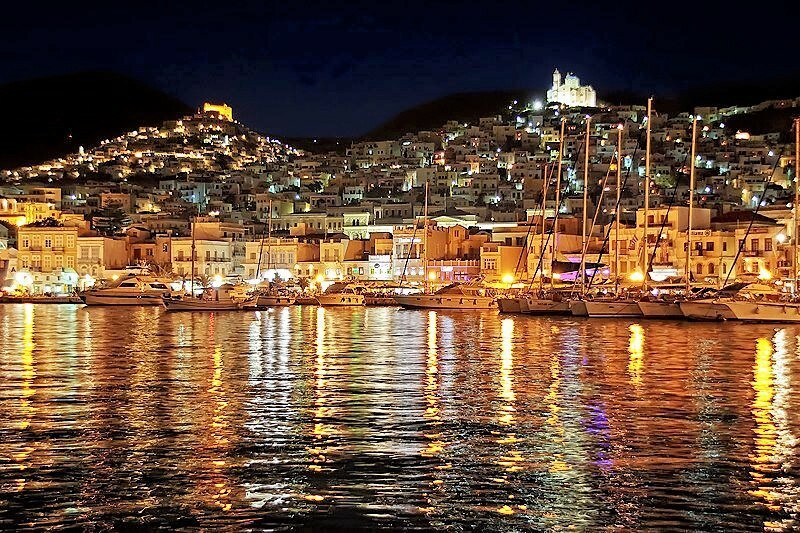 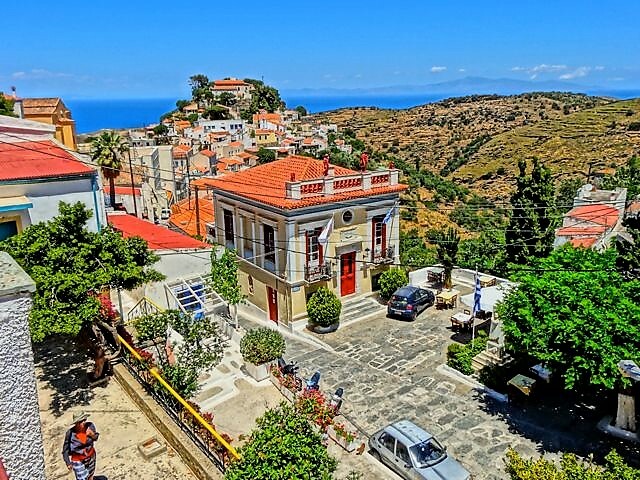 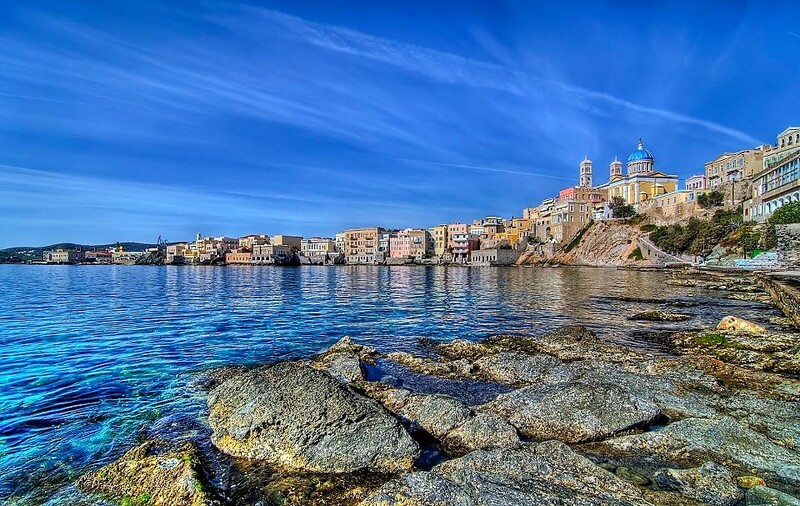 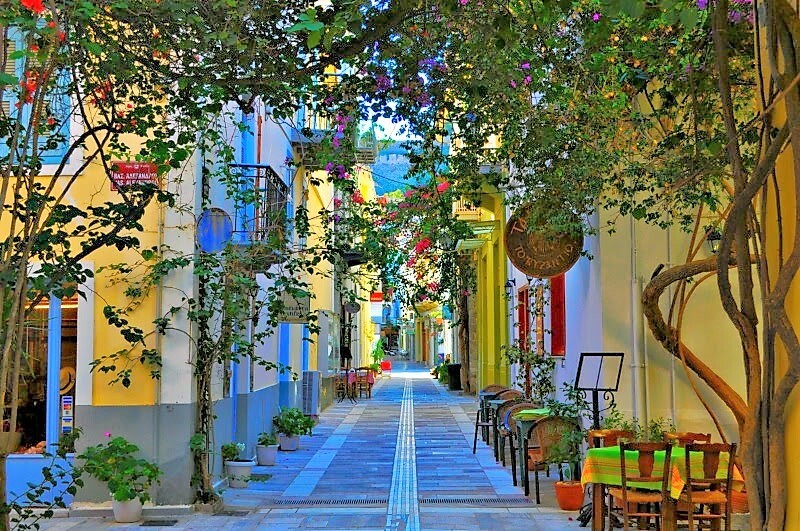 Towns with impressive neo-classical mansions and European-style squares, accompanied with beautiful beaches, good tourist infrastructure and entertainment options, are: Syros and Andros. 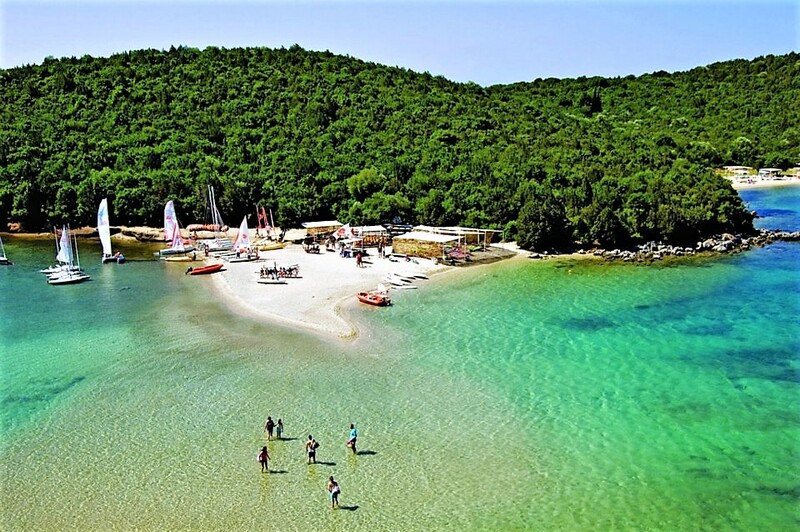 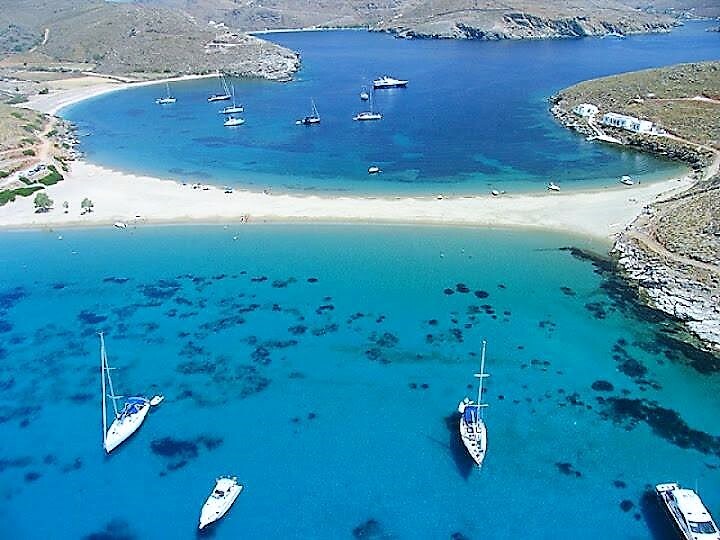 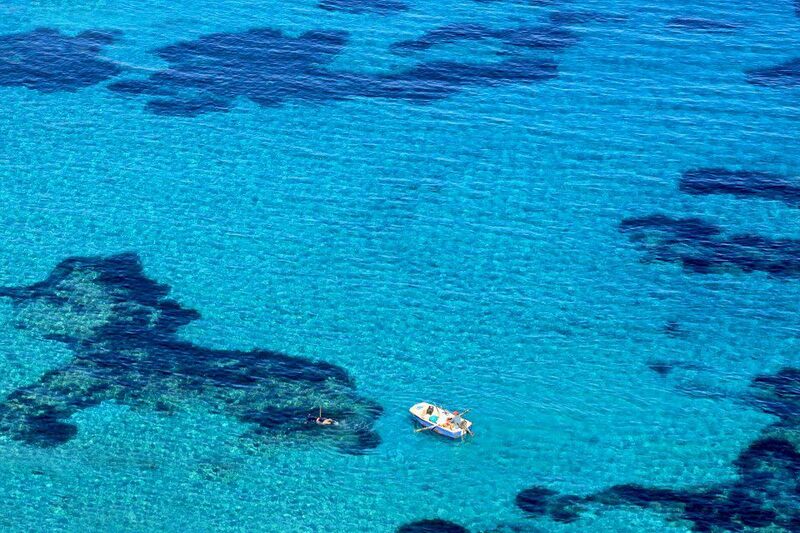 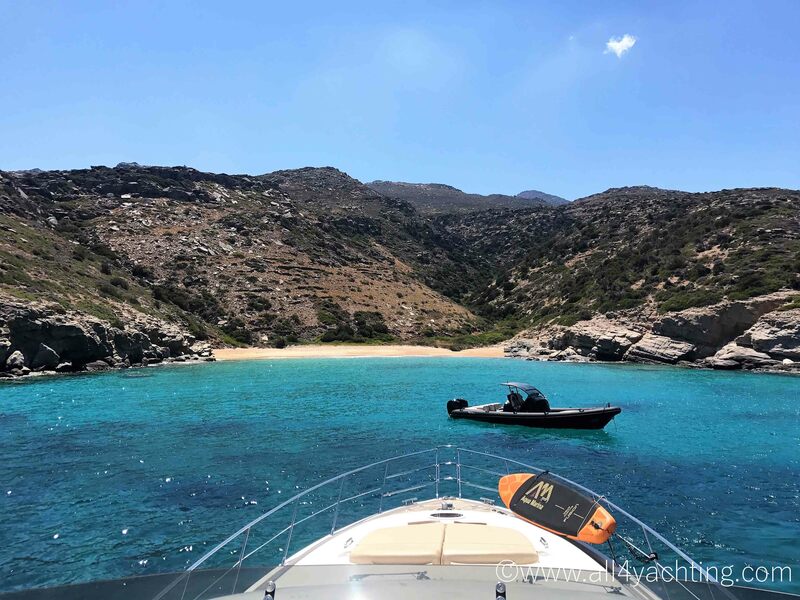 The Cyclades complex is extremely popular as a yachting destination, however it less “yachting friendly”, if compared to Ionio, Sporades, Dodecanese and Saronic Gulf, due to the “meltemi” winds. 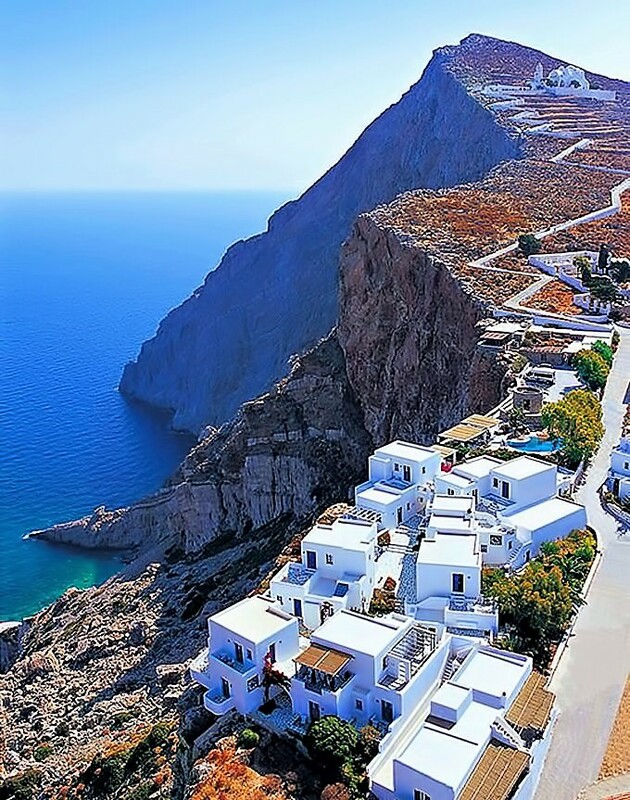 They are strong (6-7 BF) North winds that become stronger in the Central Aegean and transform to NW in the North Aegean and NE in the South Aegean. 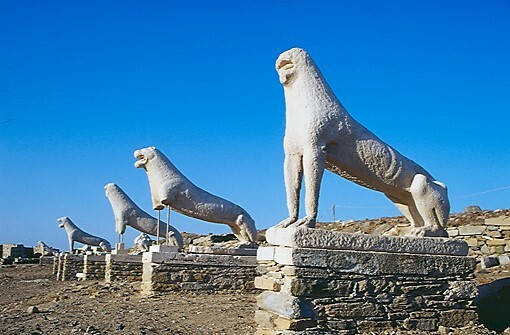 They prevail mainly during the end of July and August. 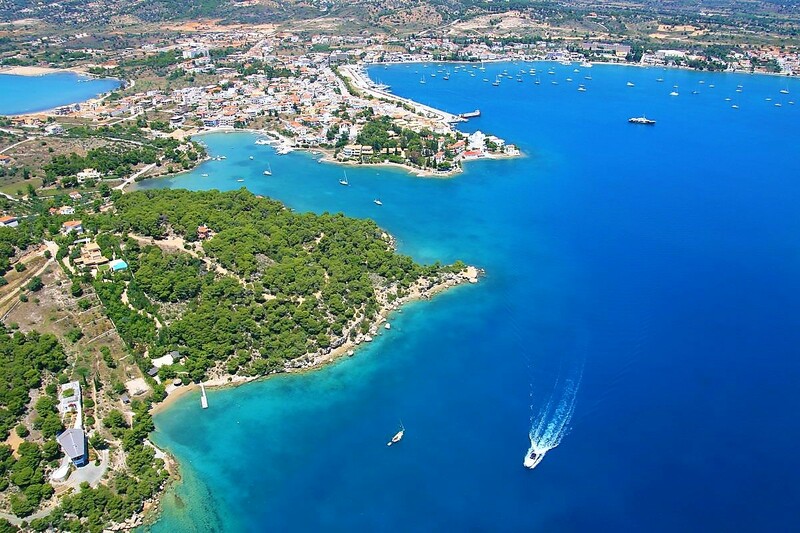 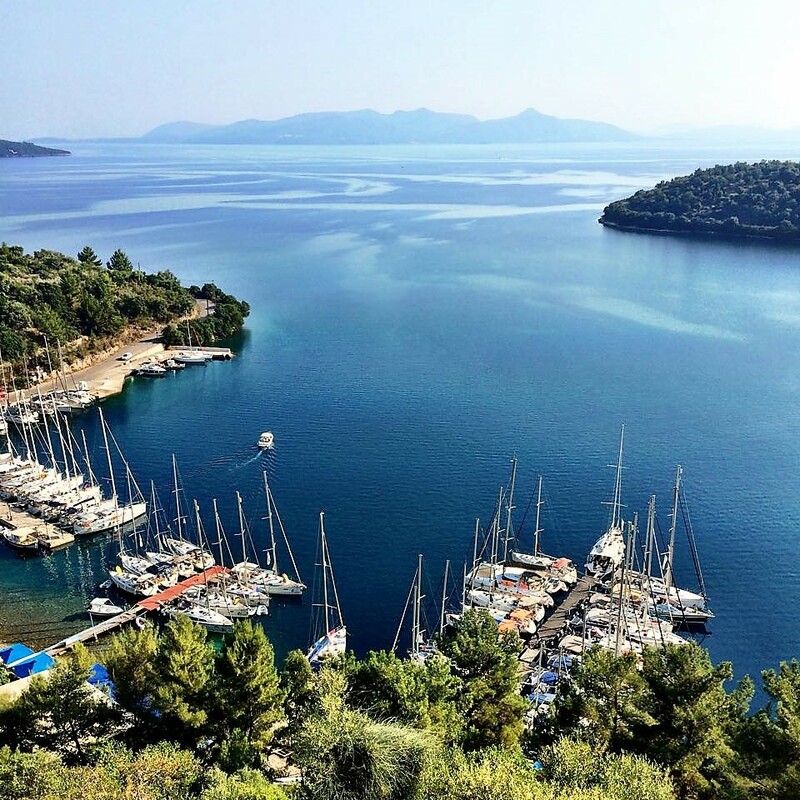 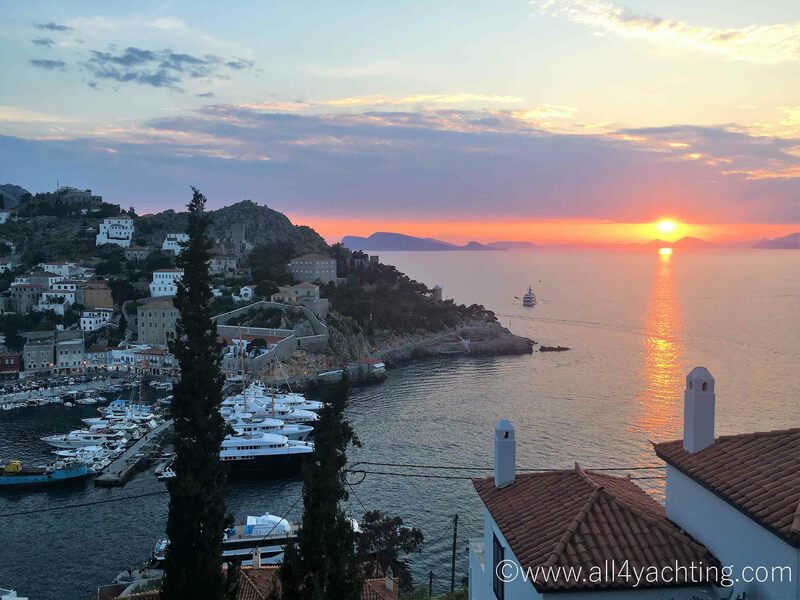 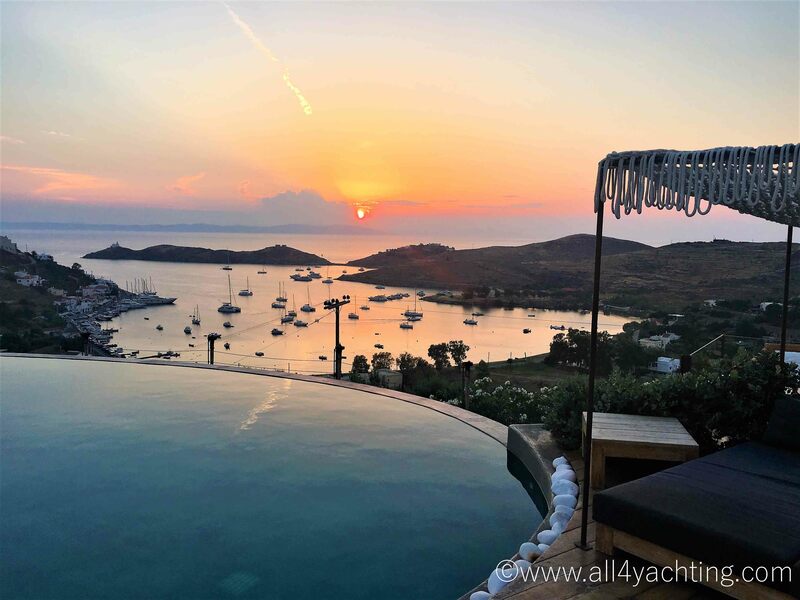 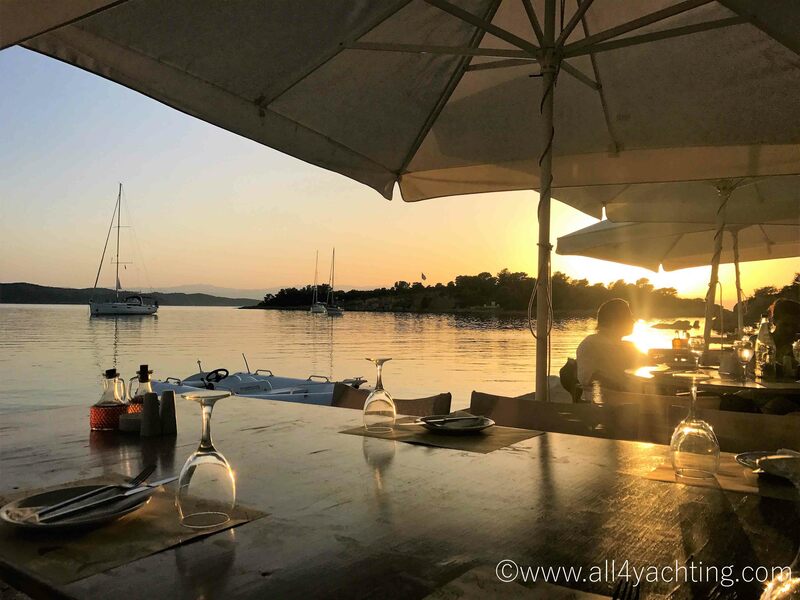 Despite having inferior yachting infrastructure, compared to Ionio and Dodecanese, yachters will find satisfactory berth and other facilities at low or insignificant cost. 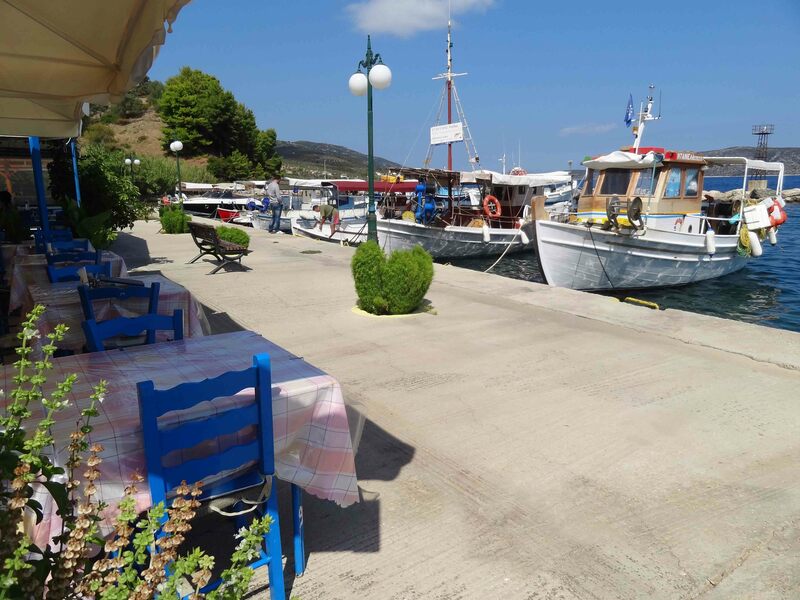 There are quite enough berth places at the public ports or at the few small public marinas. 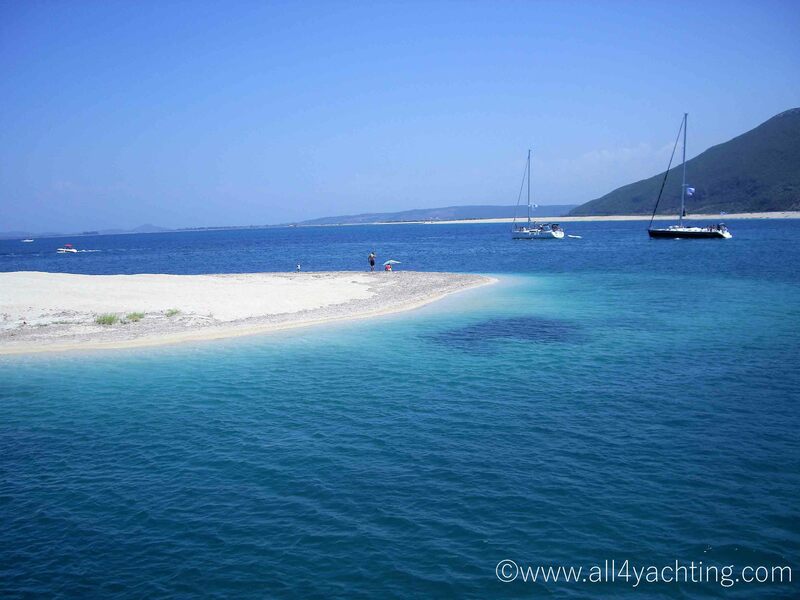 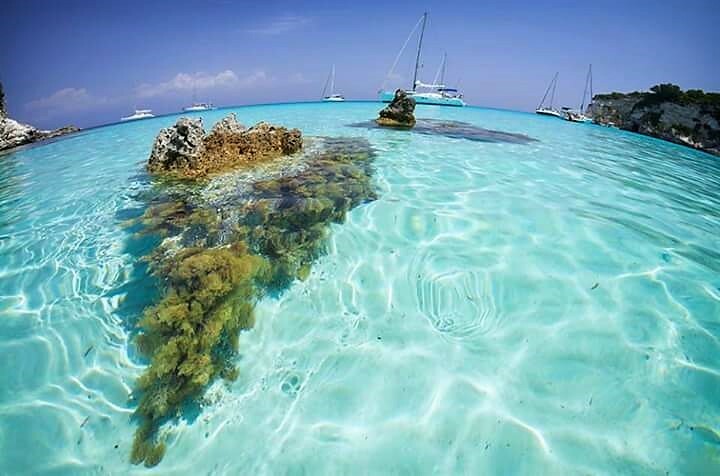 Fuel and water are available in almost all islands, along with numerous protected bays with crystalline blue-green waters, ideal for anchoring. 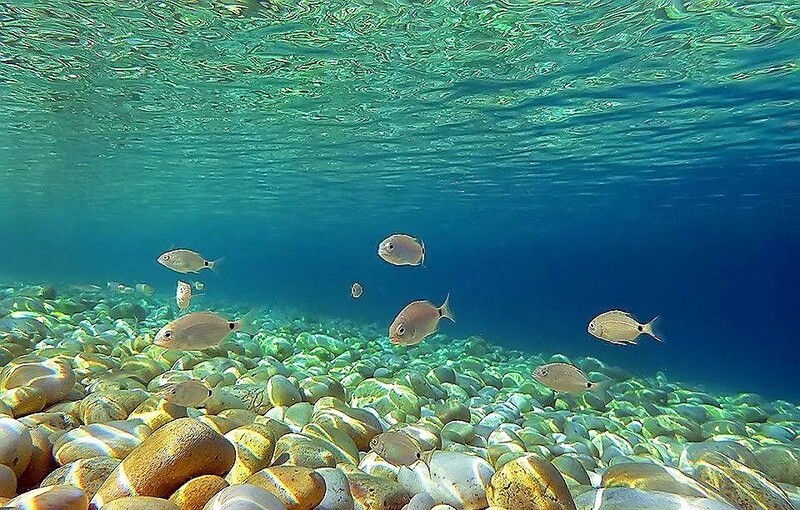 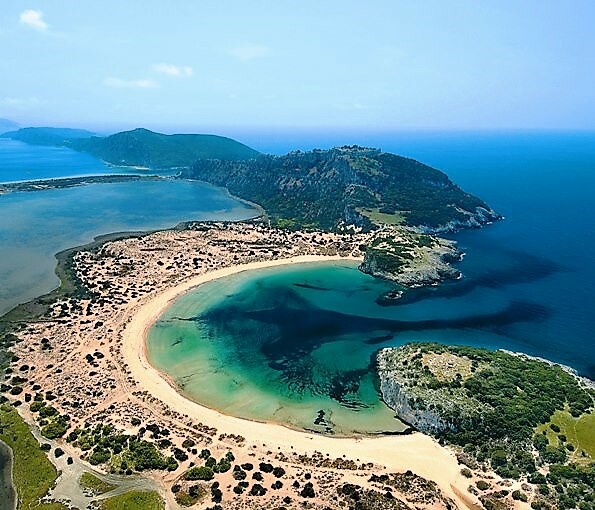 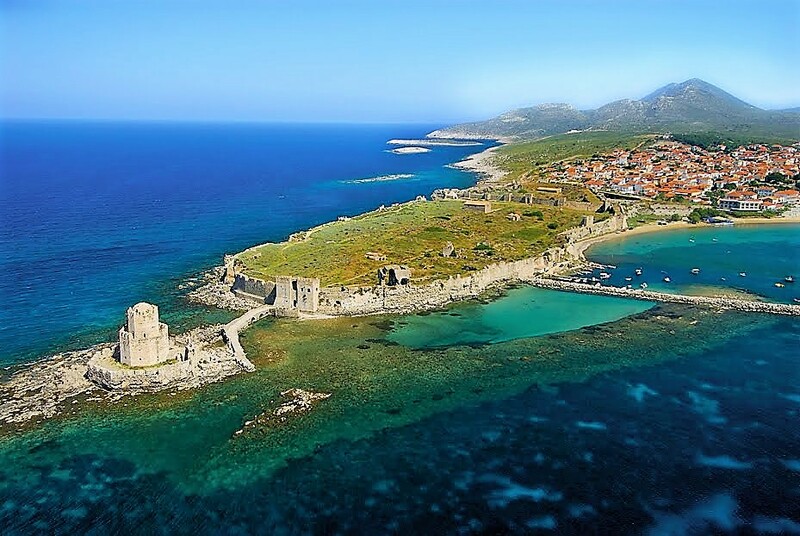 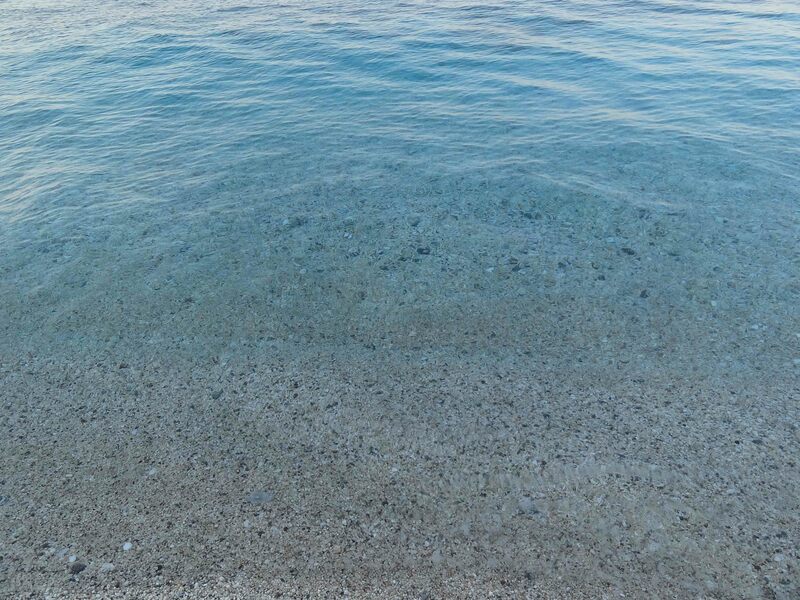 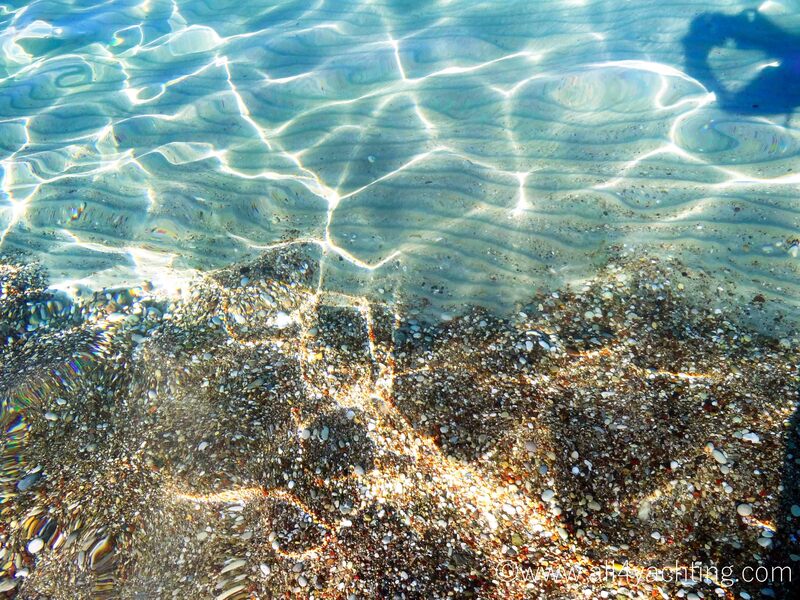 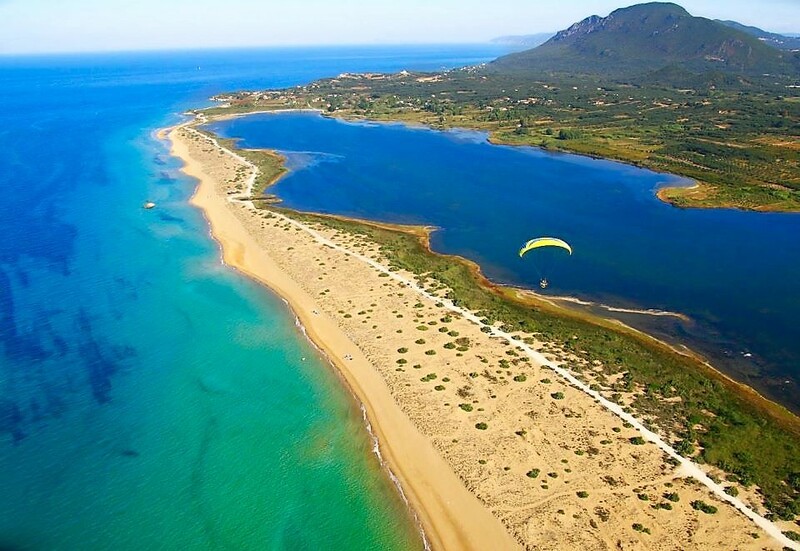 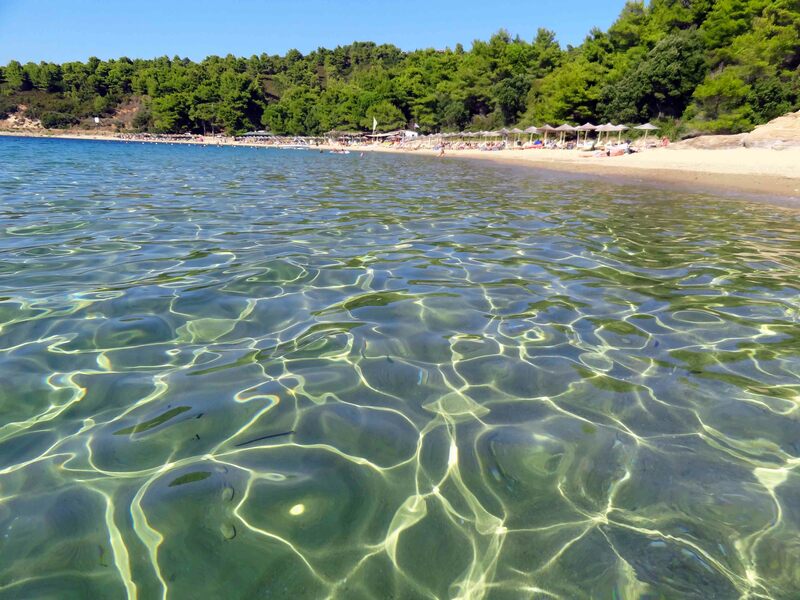 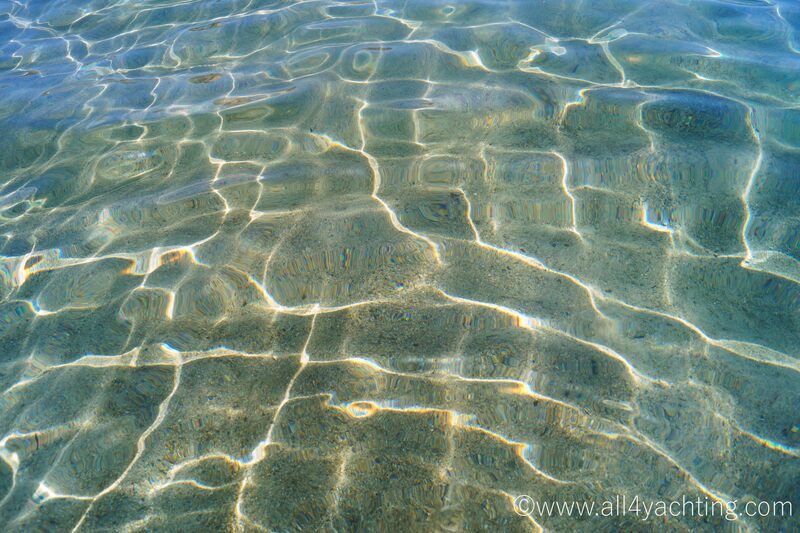 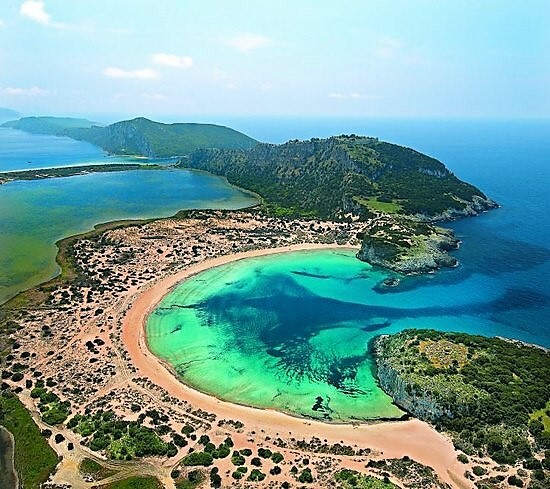 Ionio Sea is found in Western Greece and has approximately thirty islands and islets of various sizes, among which thirteen are inhabited. 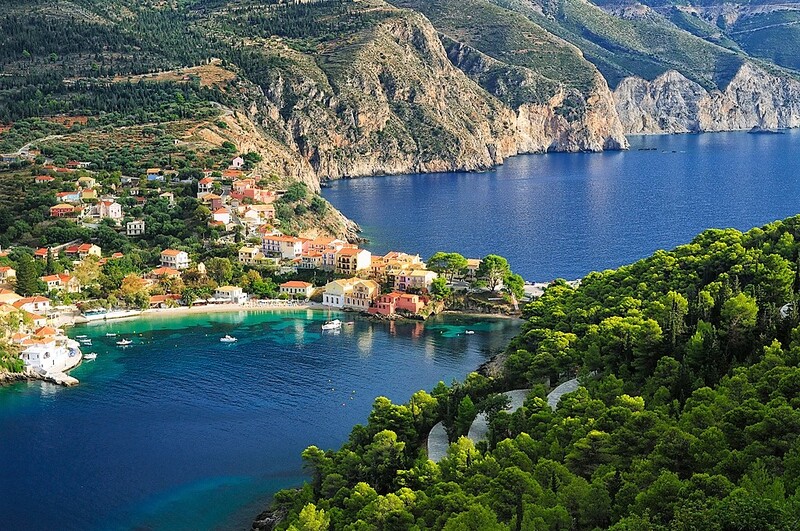 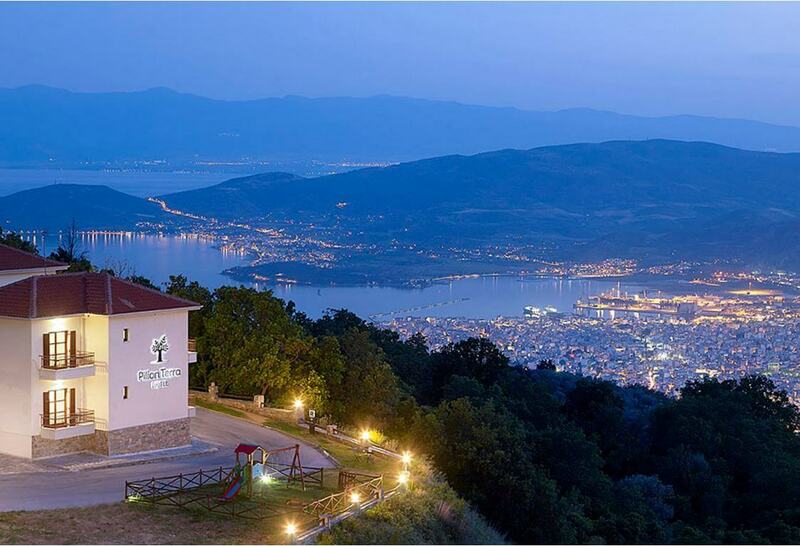 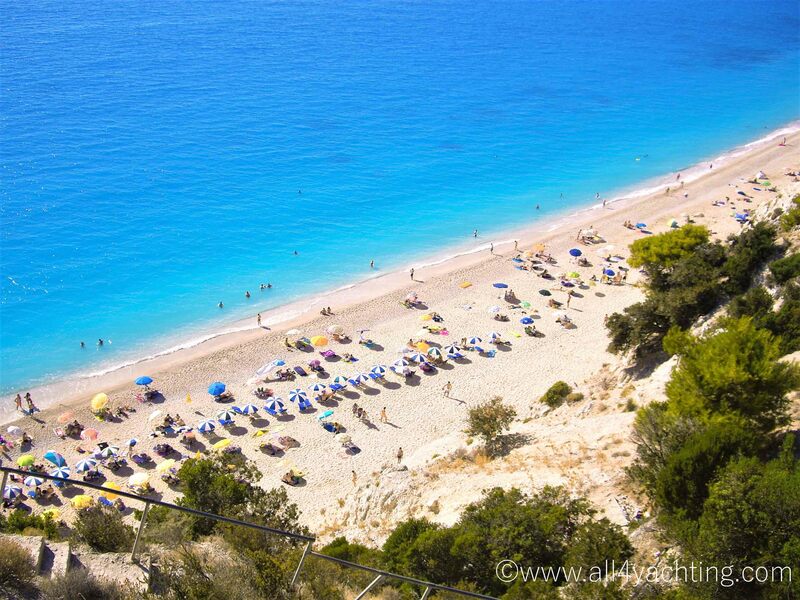 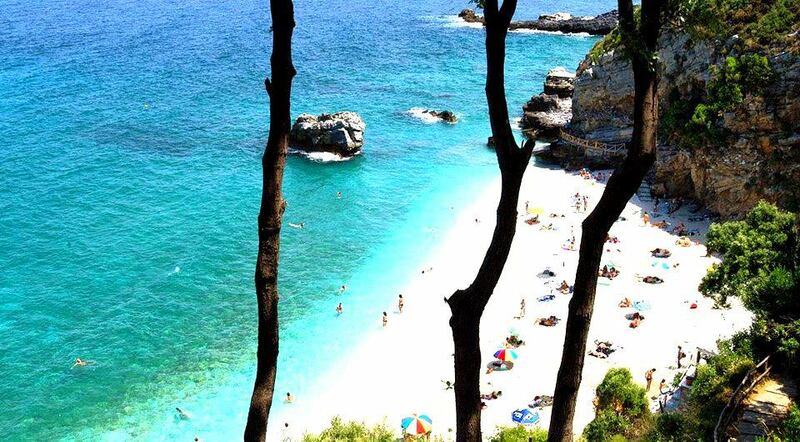 The larger and more developed ones are: Corfu (Kerkyra), Kefalonia, Zakynthos, Lefkas, Ithaca (Ithaki) and Paxi. 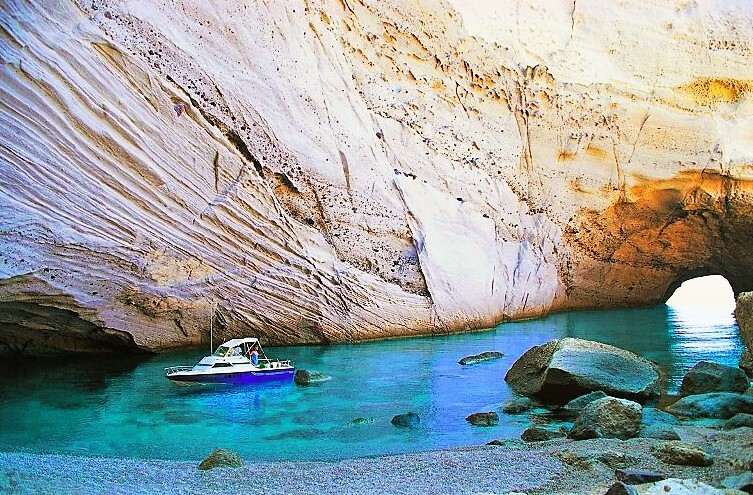 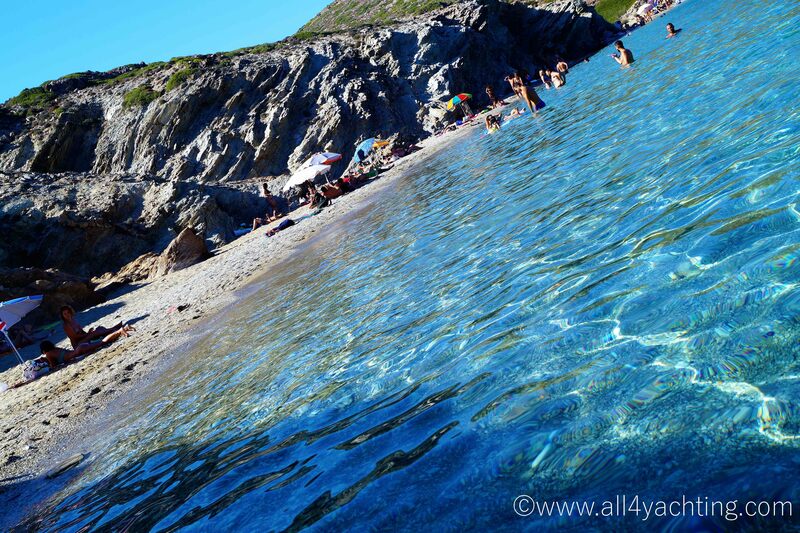 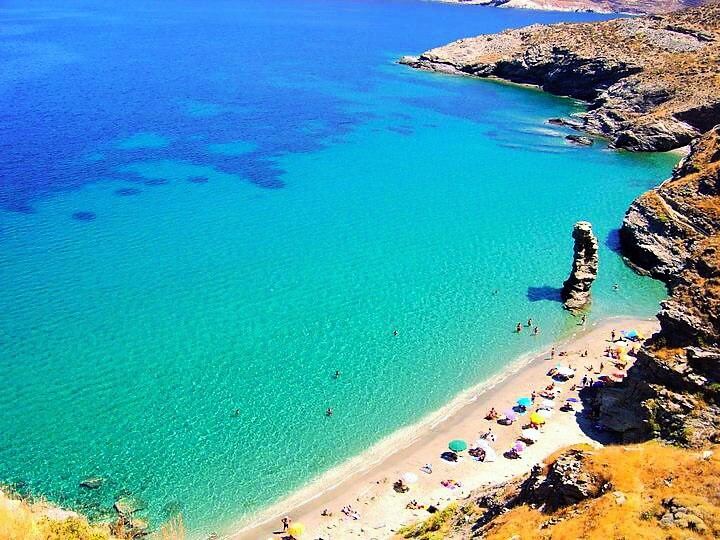 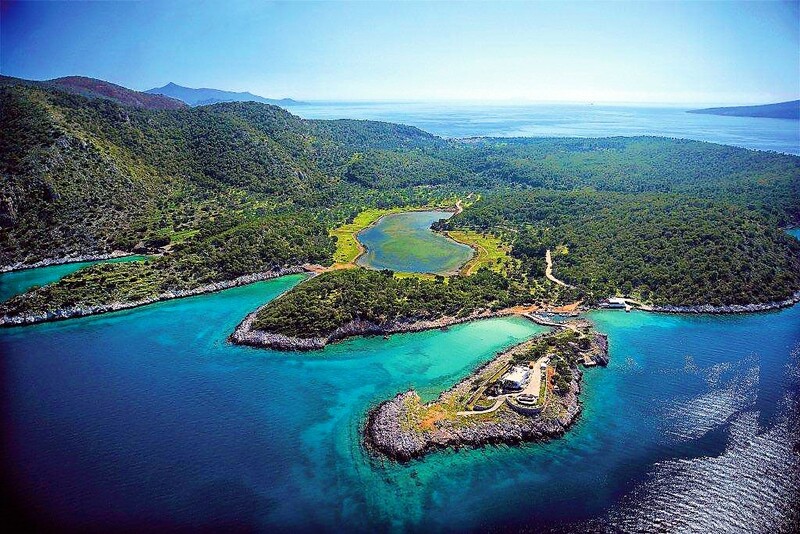 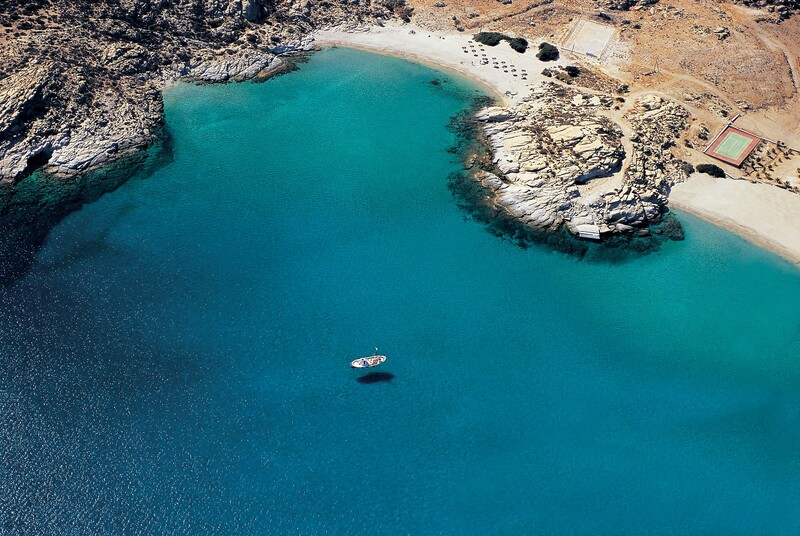 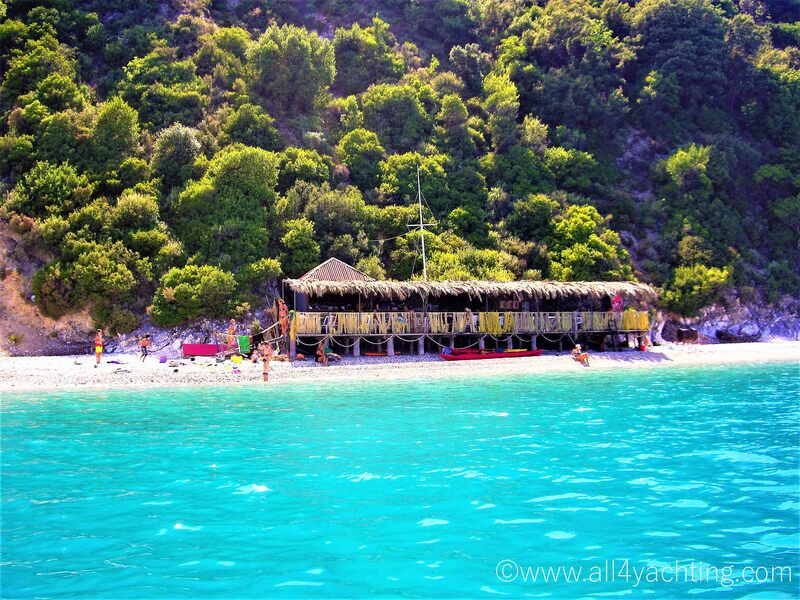 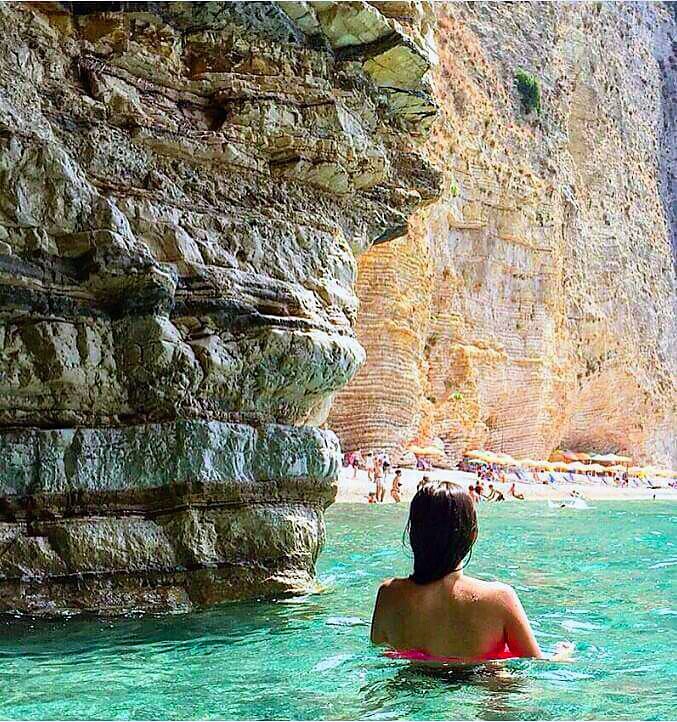 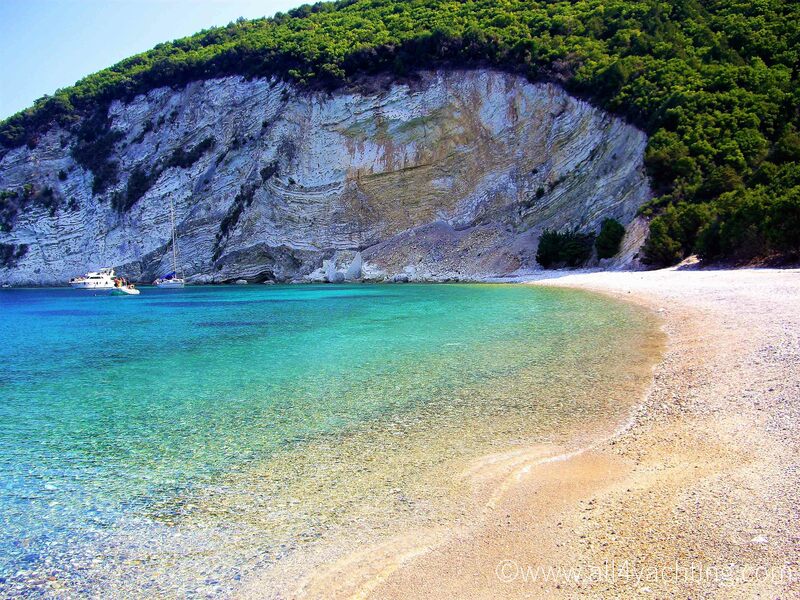 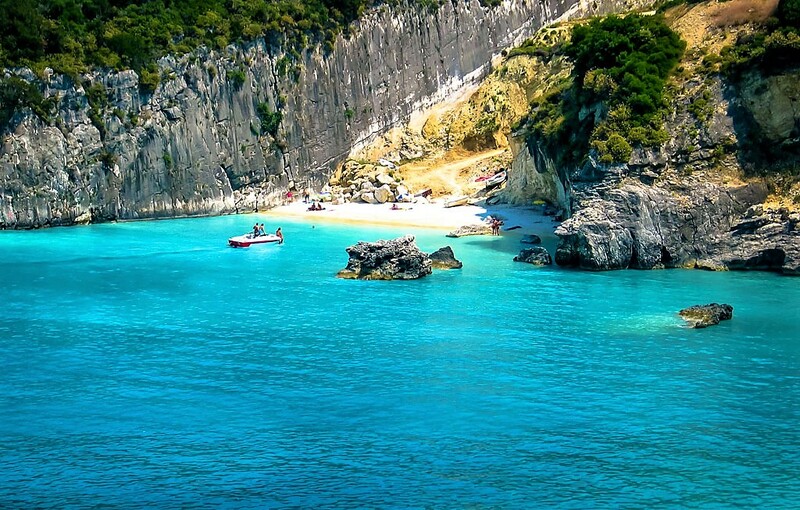 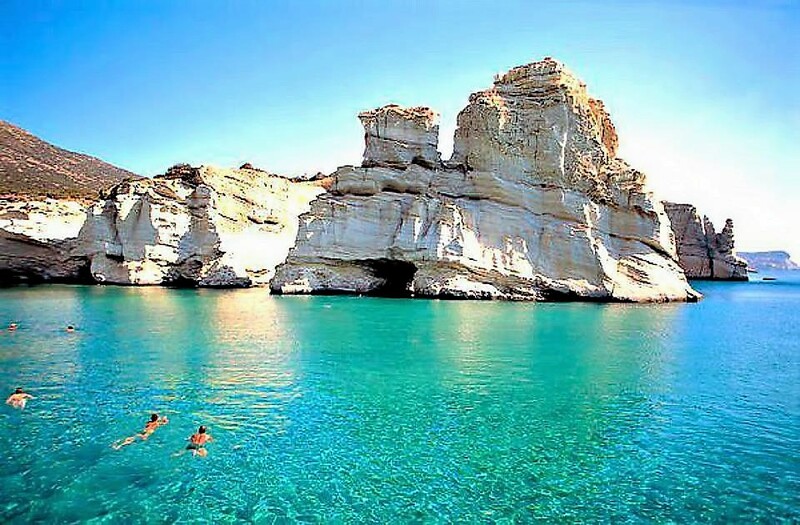 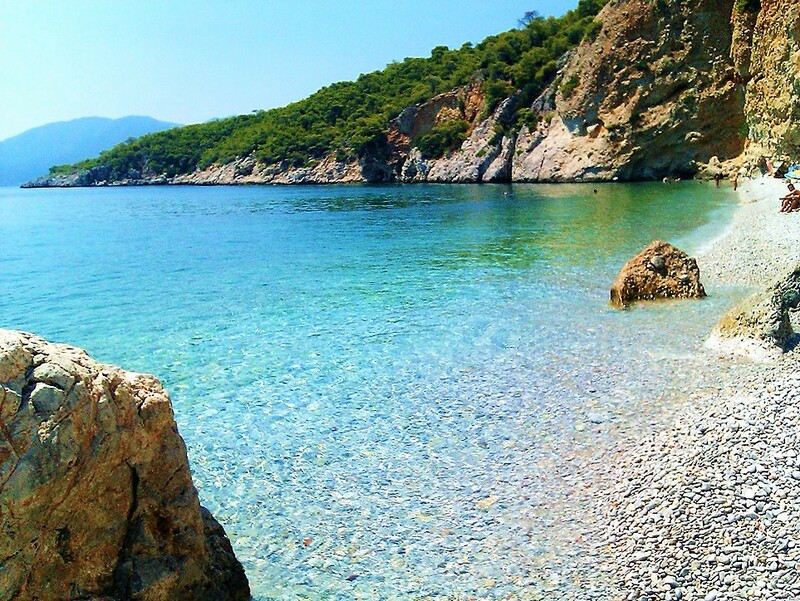 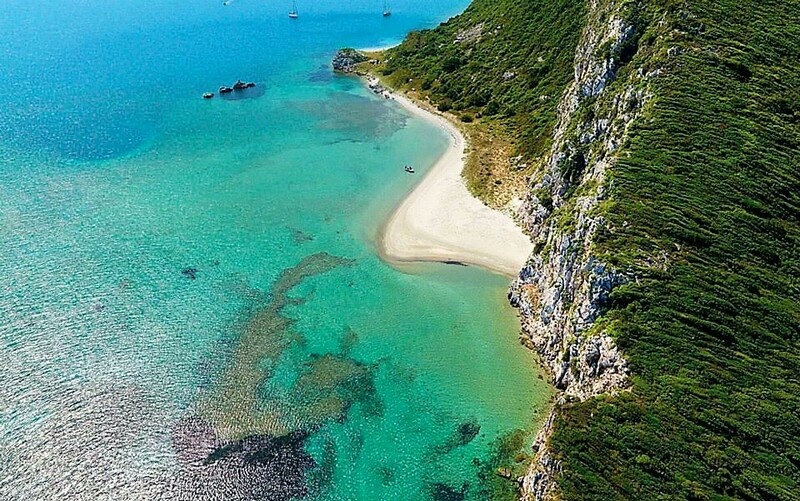 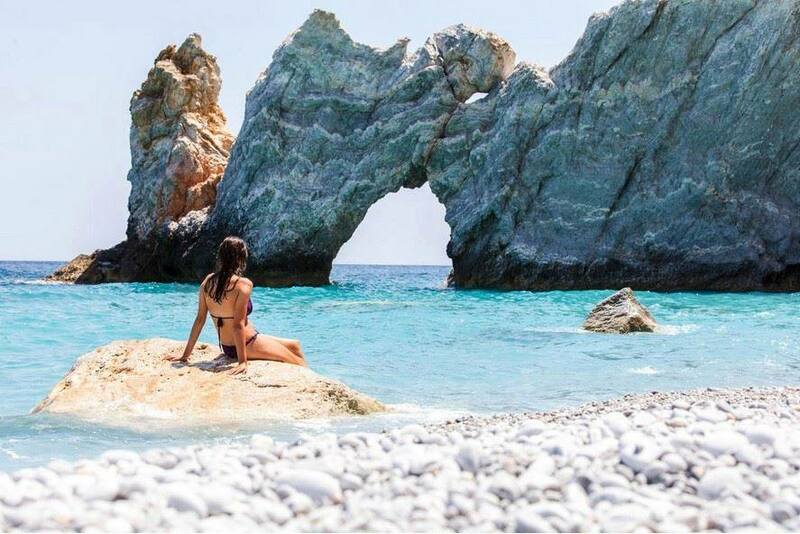 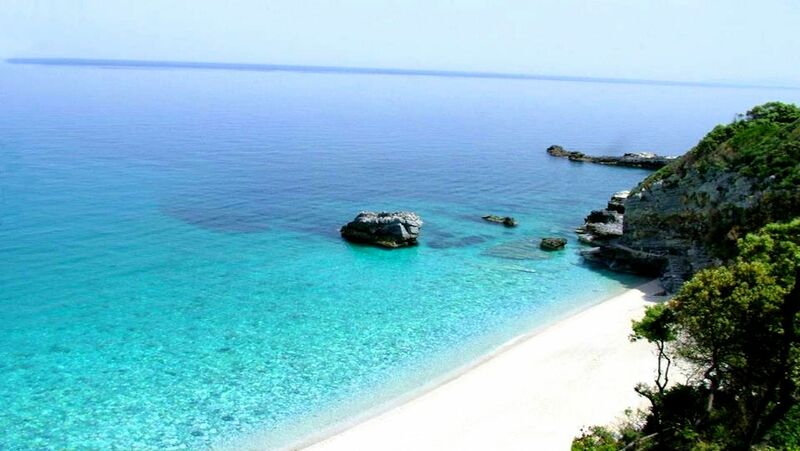 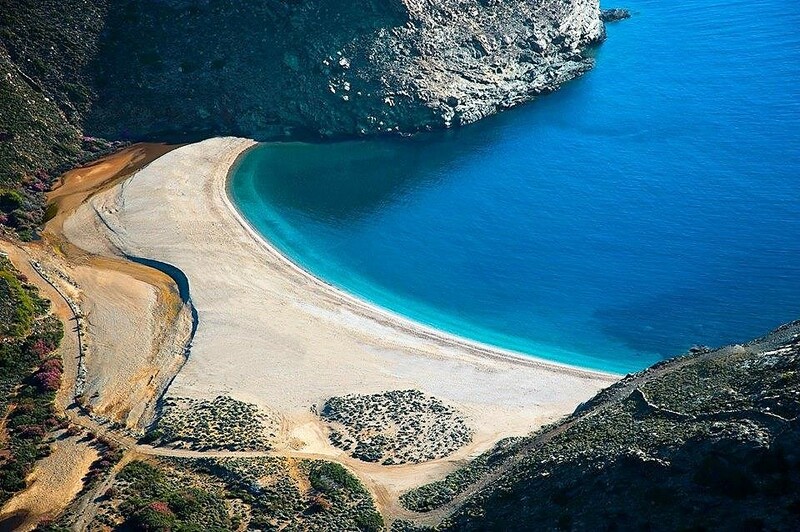 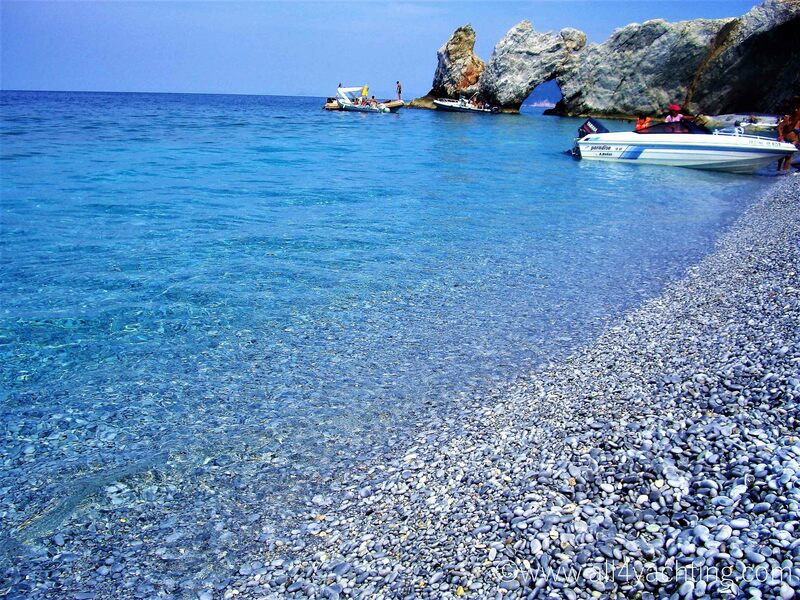 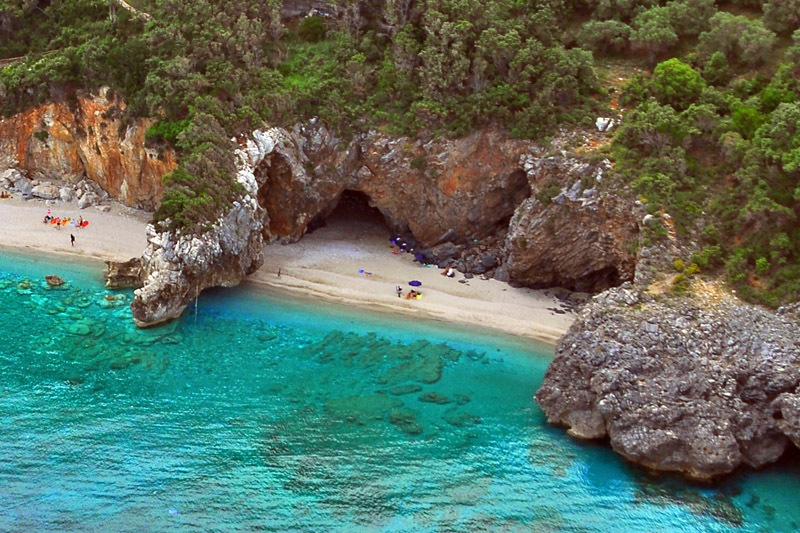 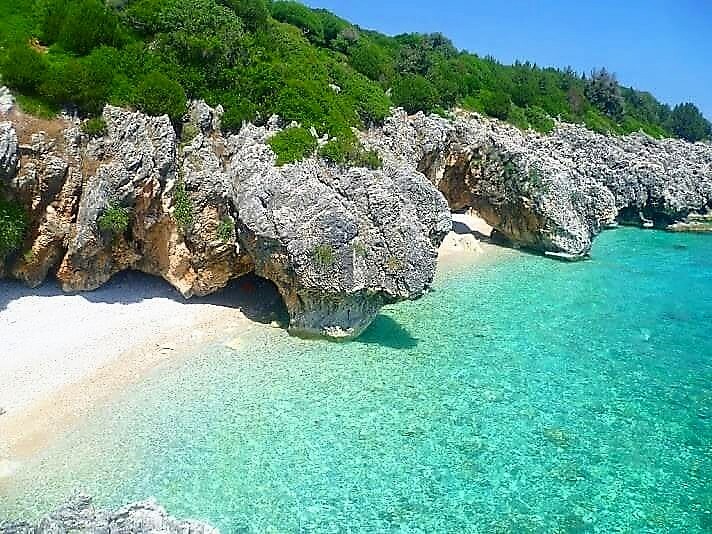 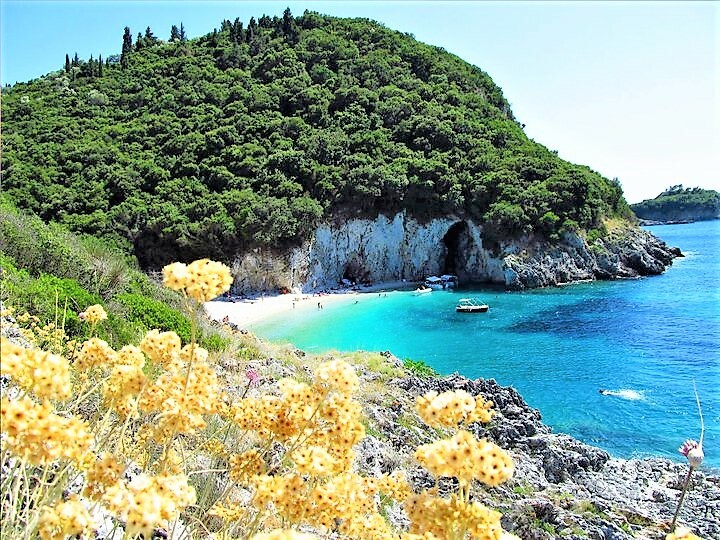 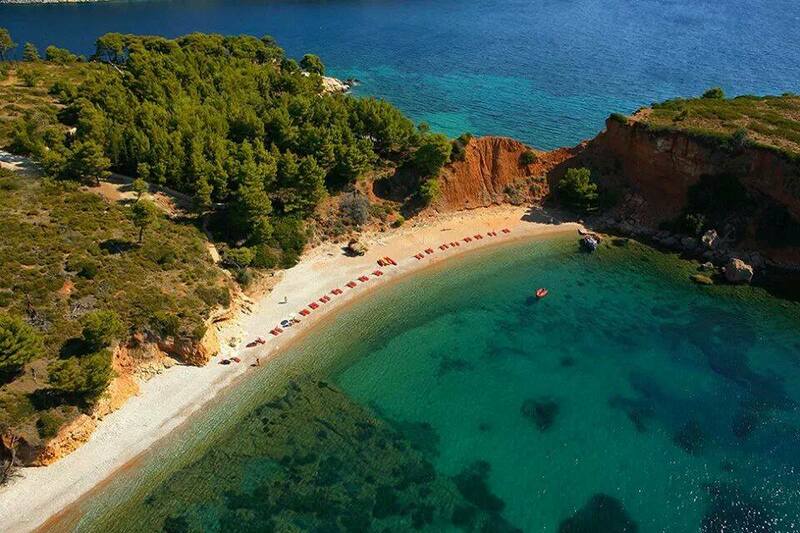 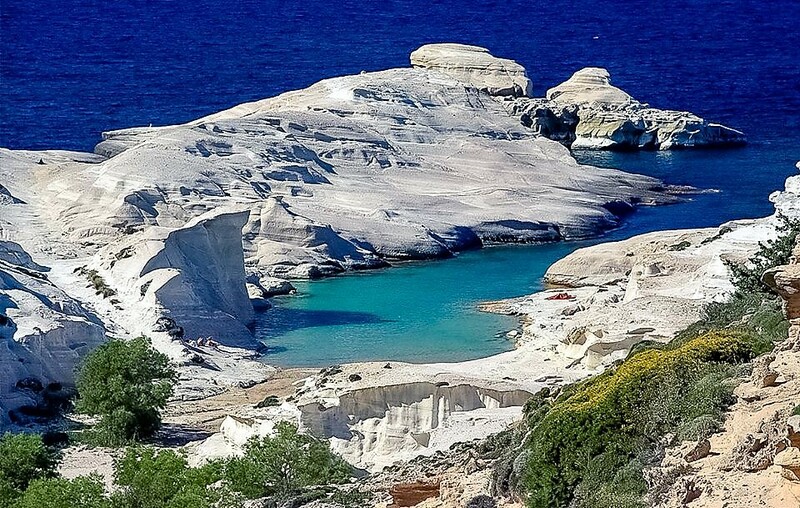 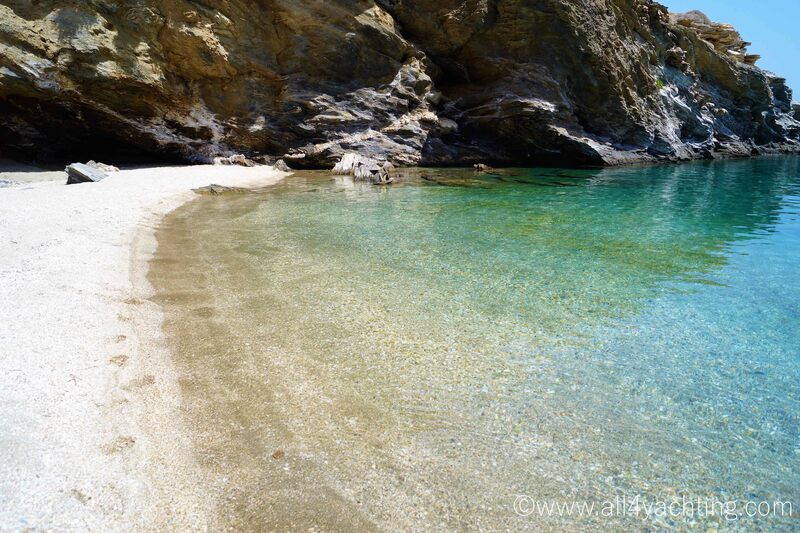 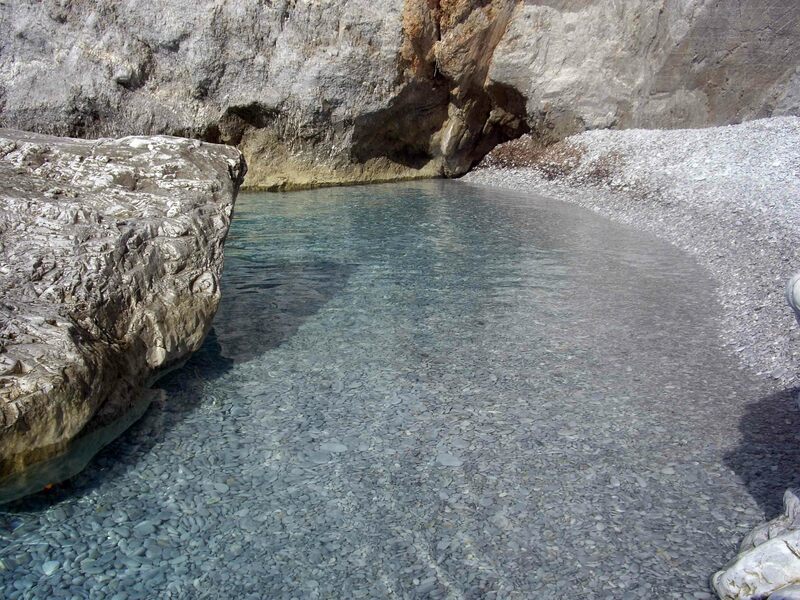 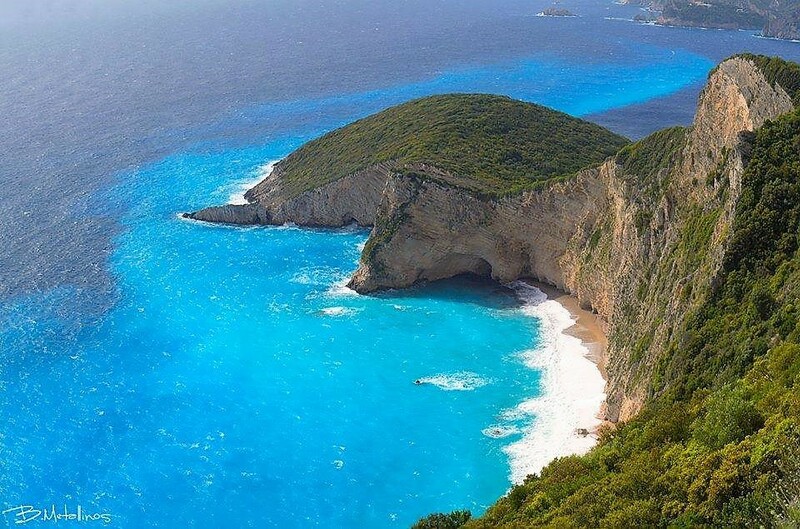 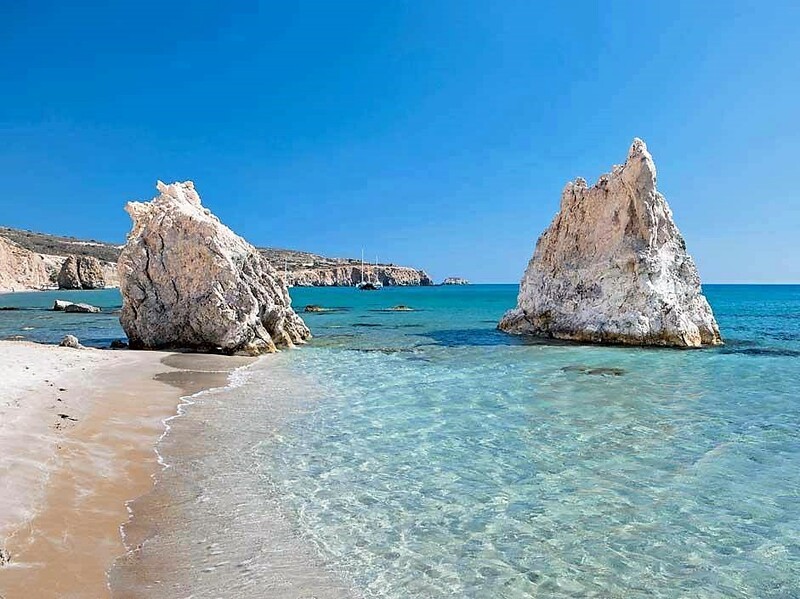 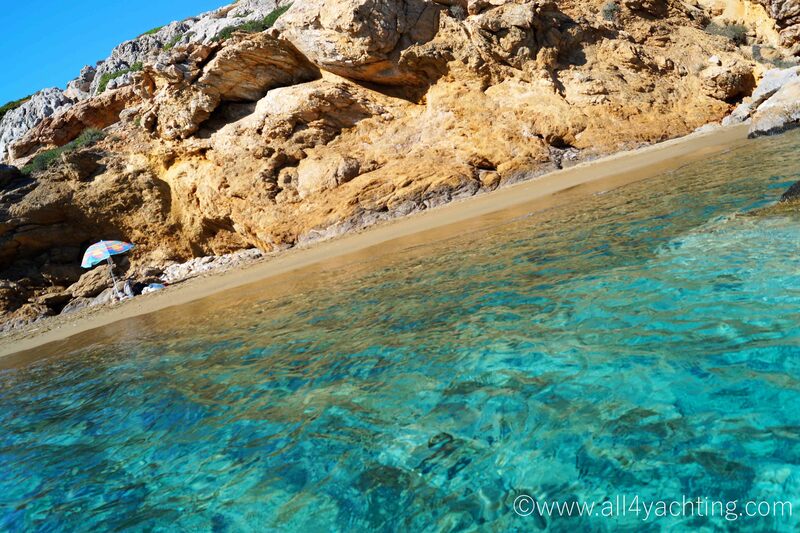 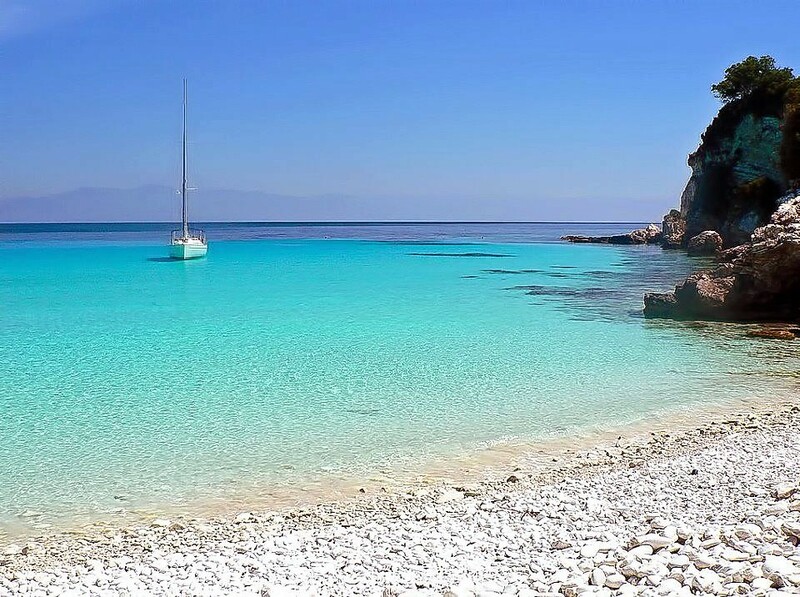 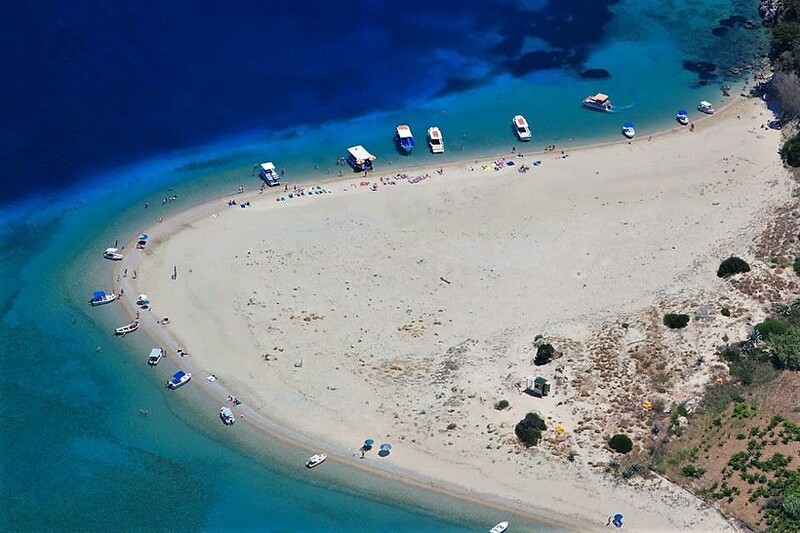 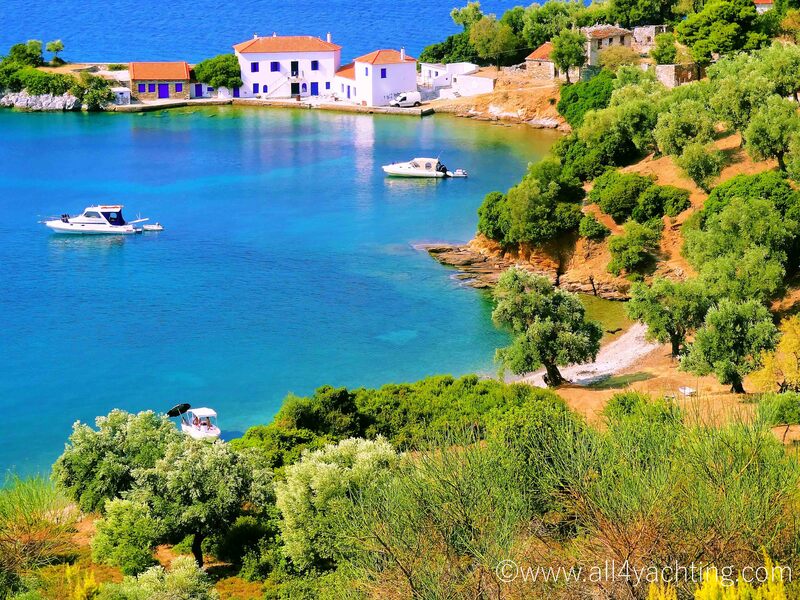 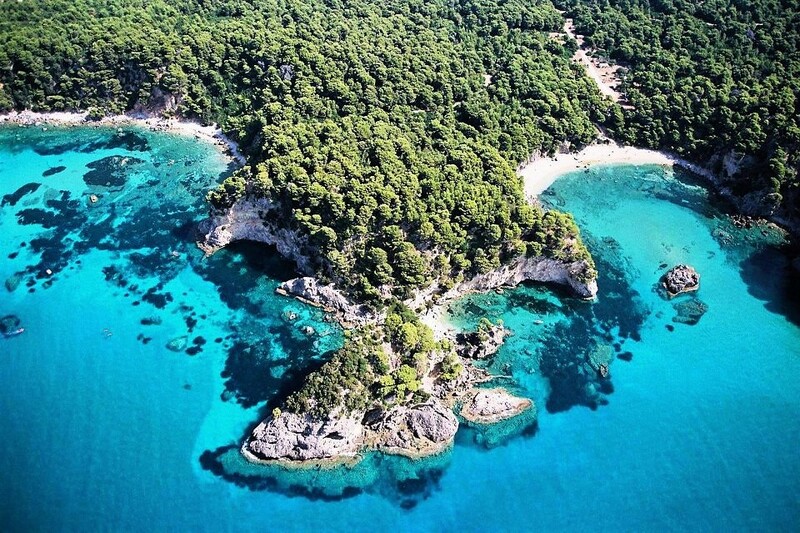 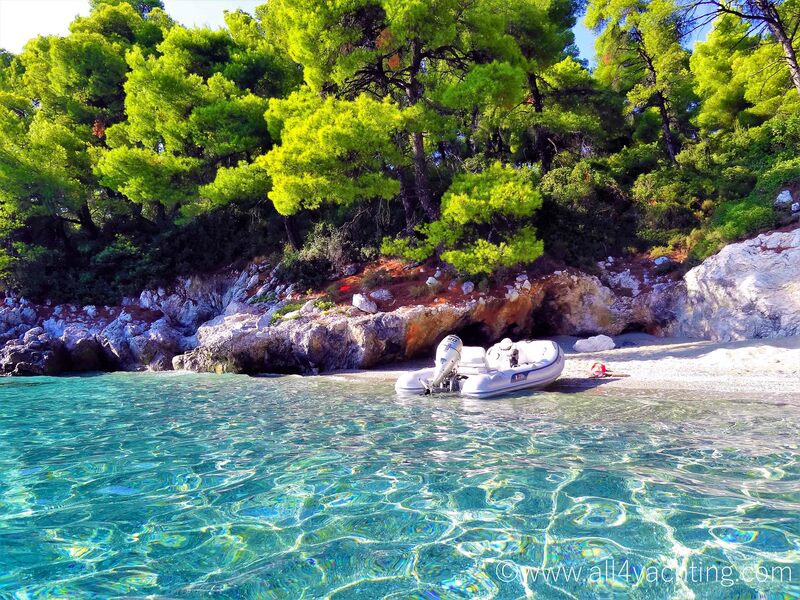 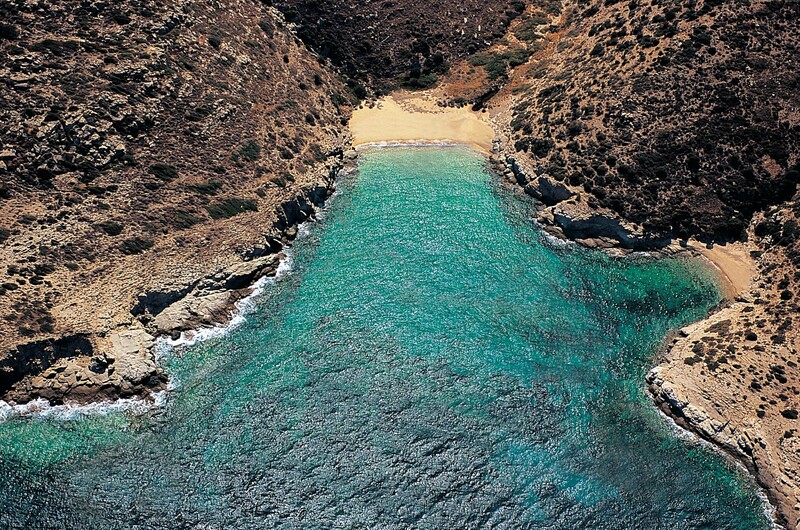 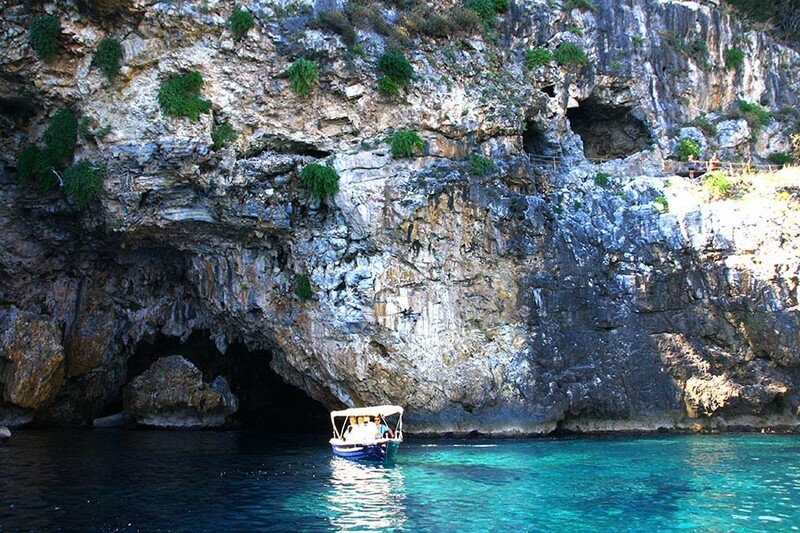 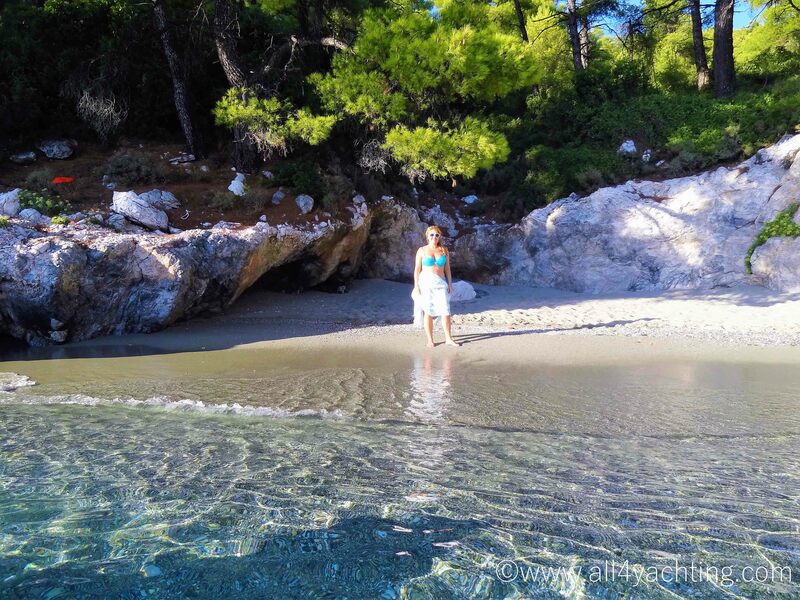 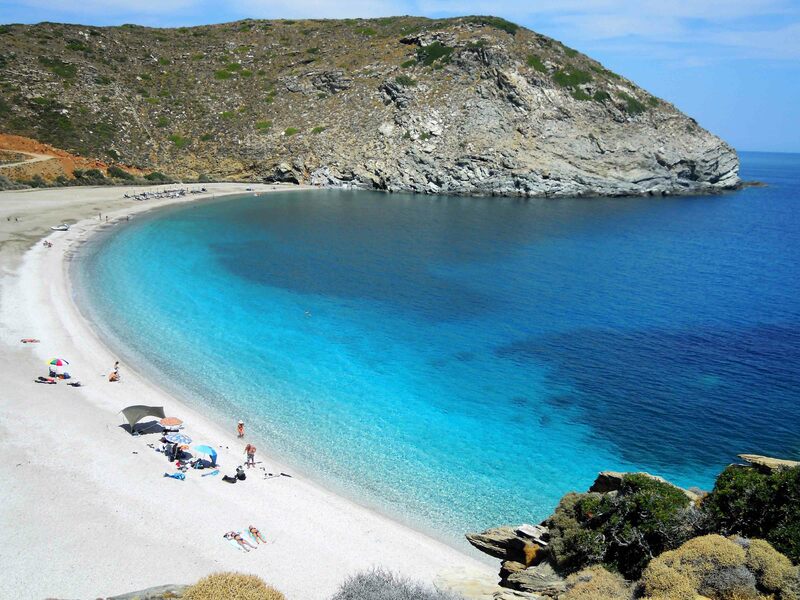 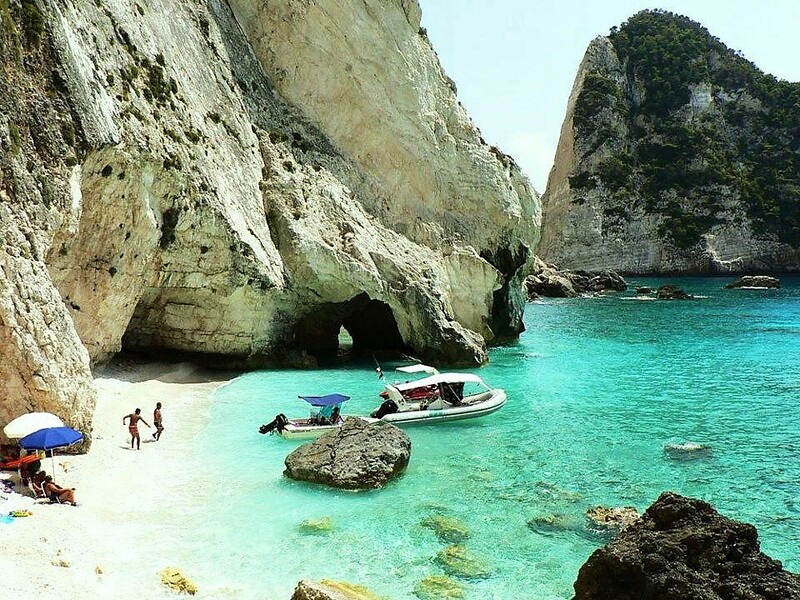 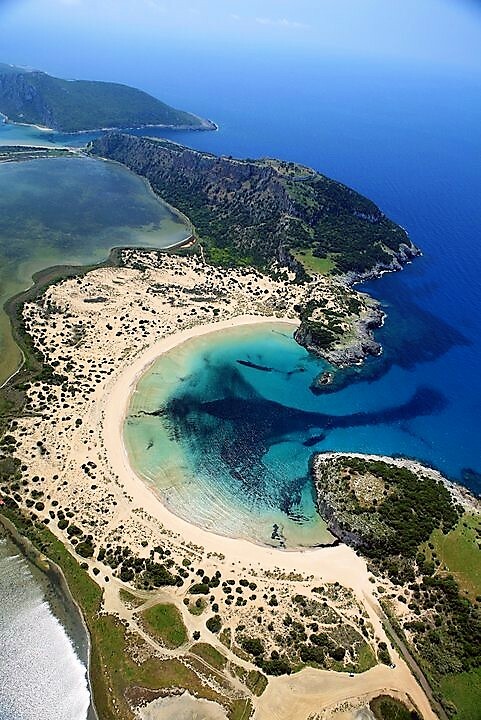 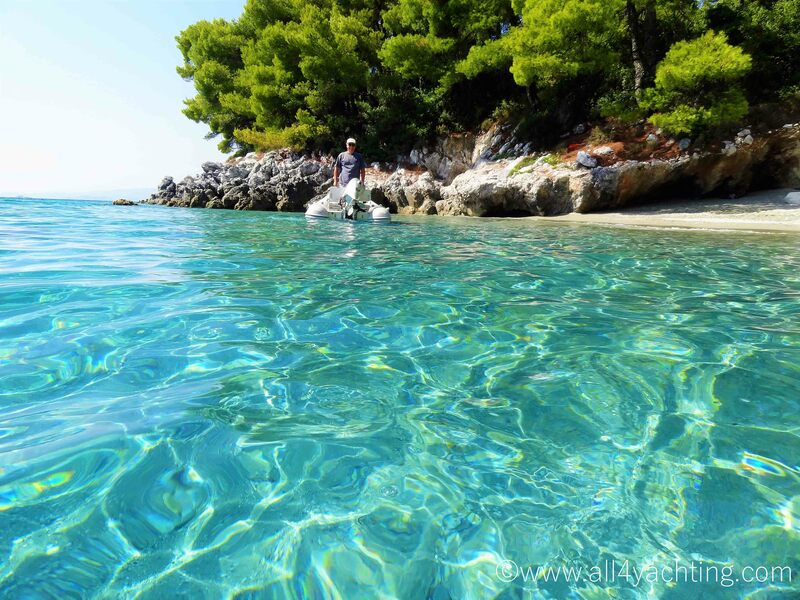 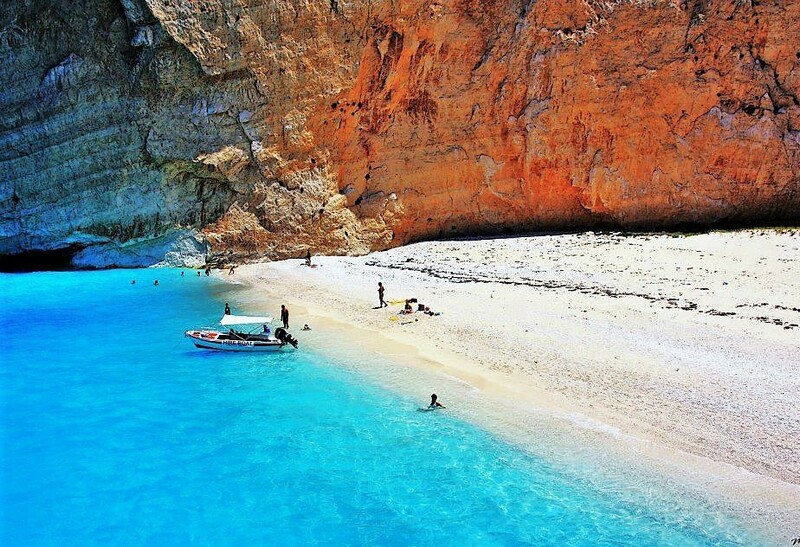 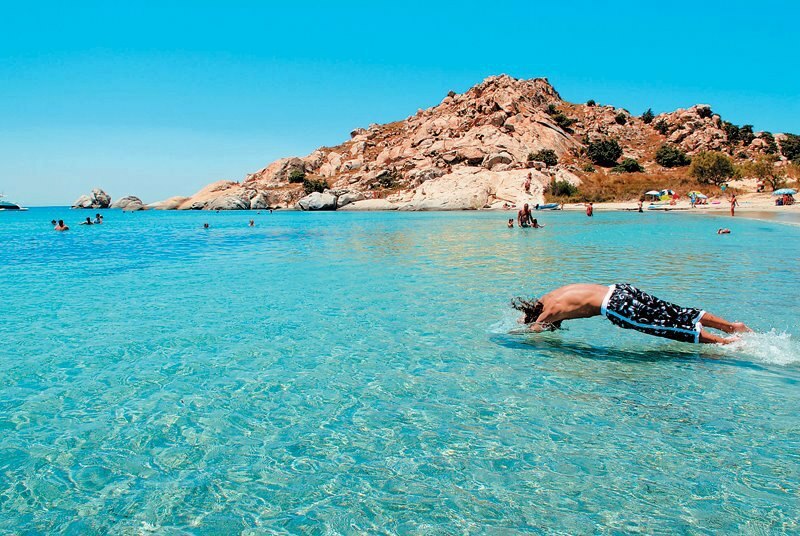 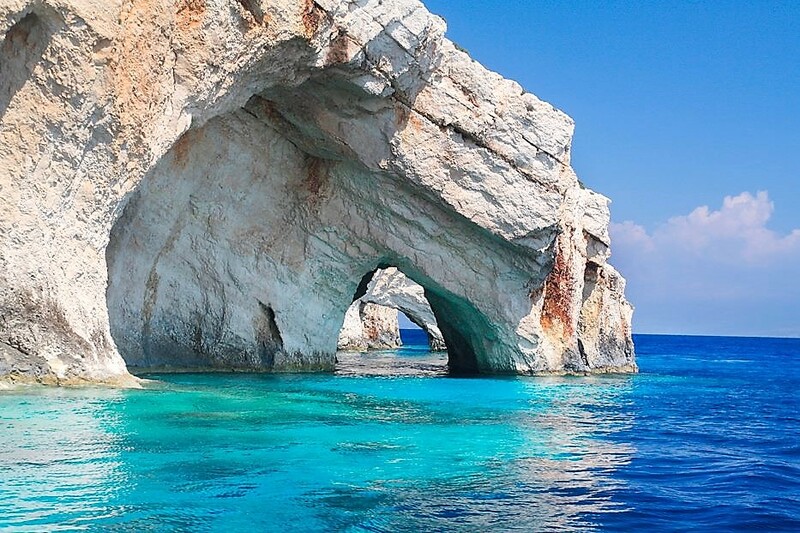 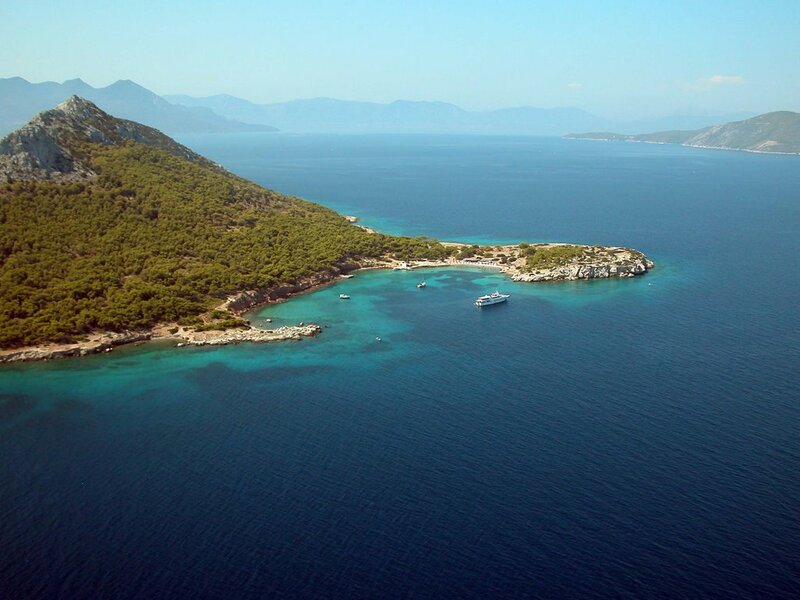 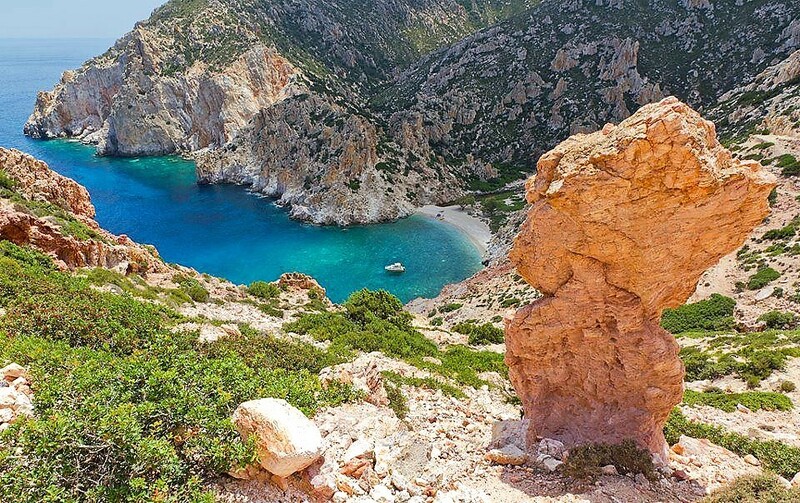 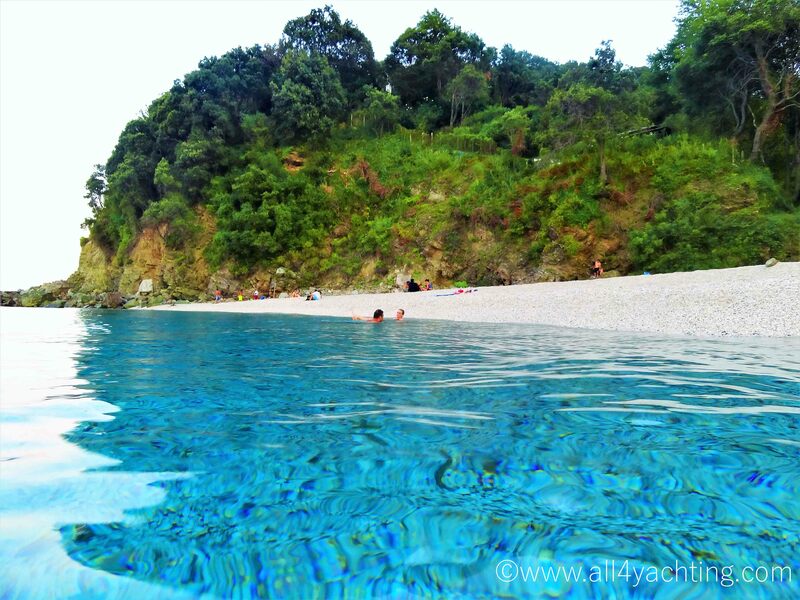 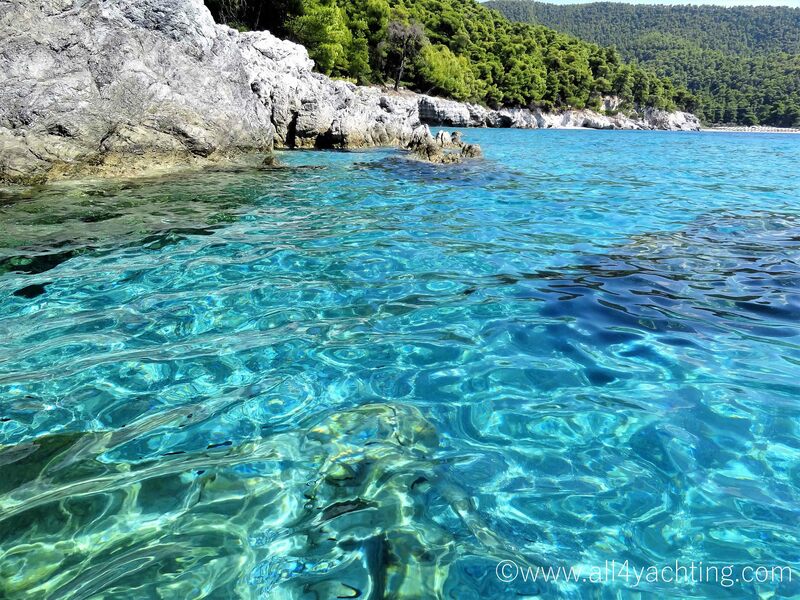 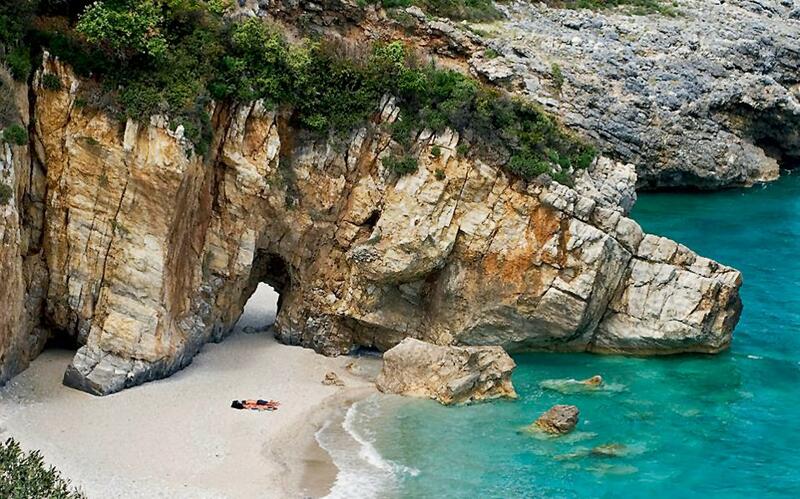 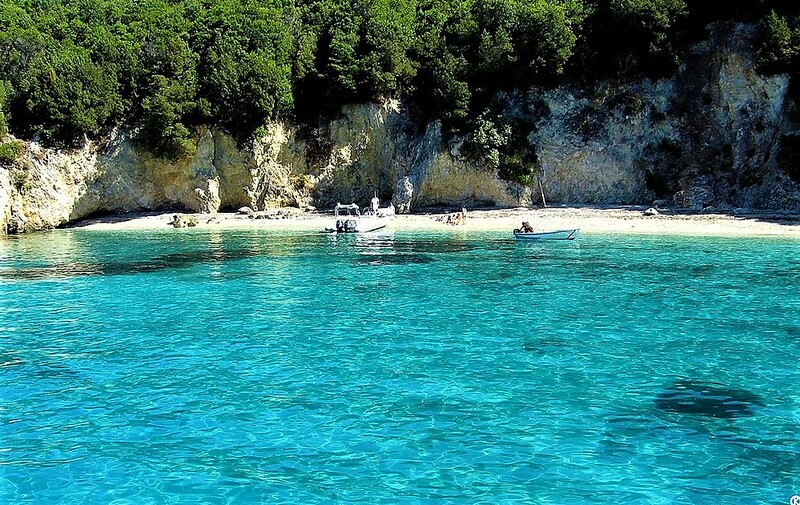 8) ATOKOS uninhabited island, for its wonderful beaches with the turquoise waters and the impressive rock formations. 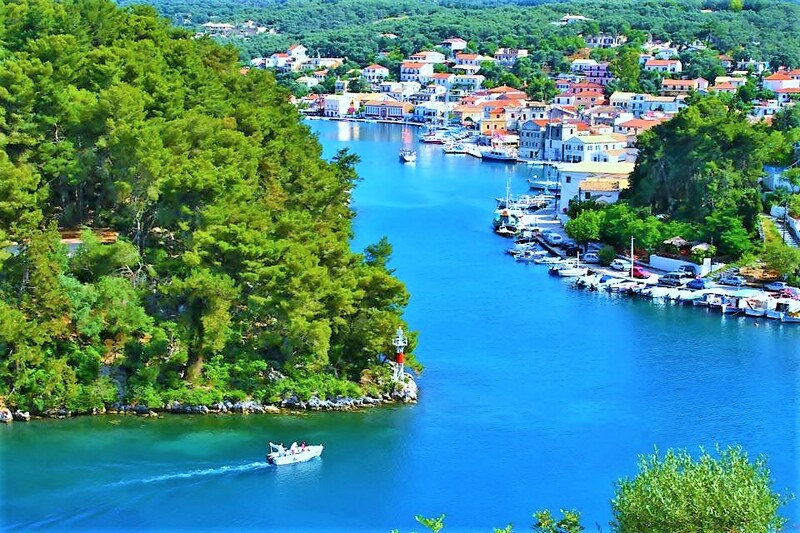 e)South of Lefkas: Lefkas (south bays), Lefkas islands (Meganisi, Skorpios etc), Ithaca (Vathy & Kioni), Fiskardo (Kefallonia), Zakynthos. 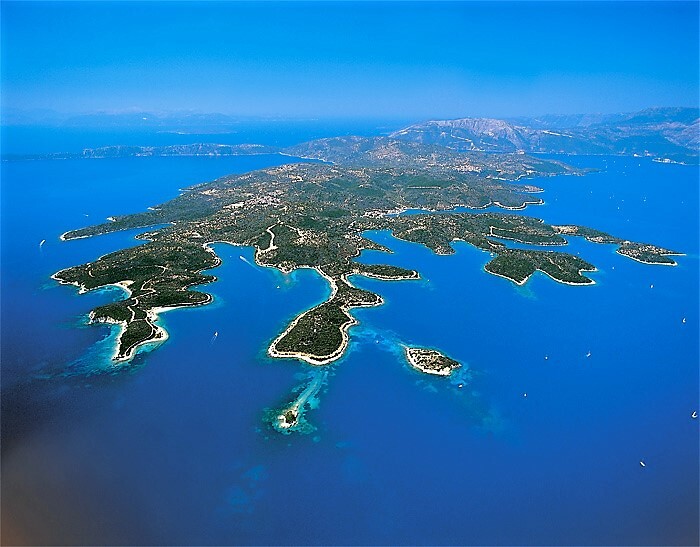 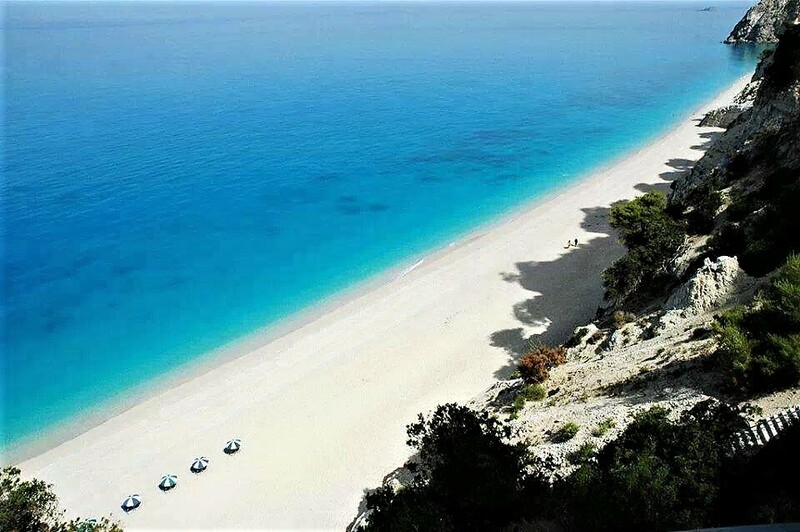 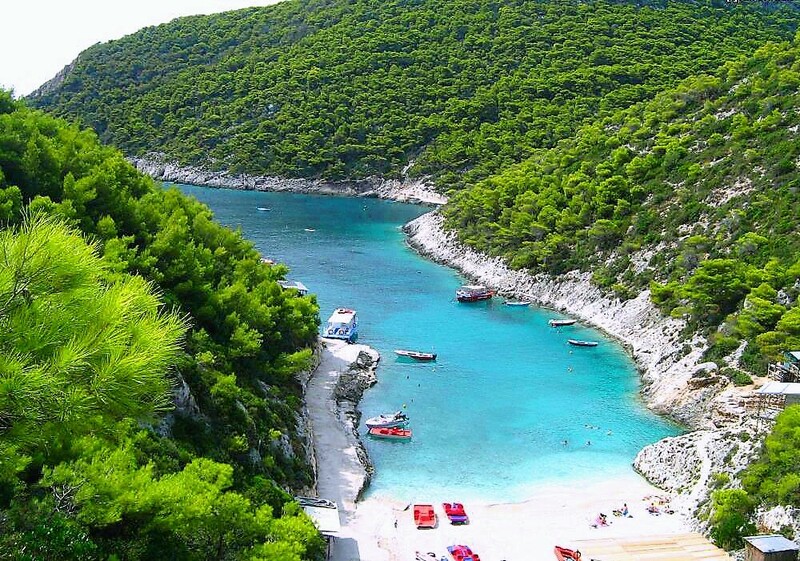 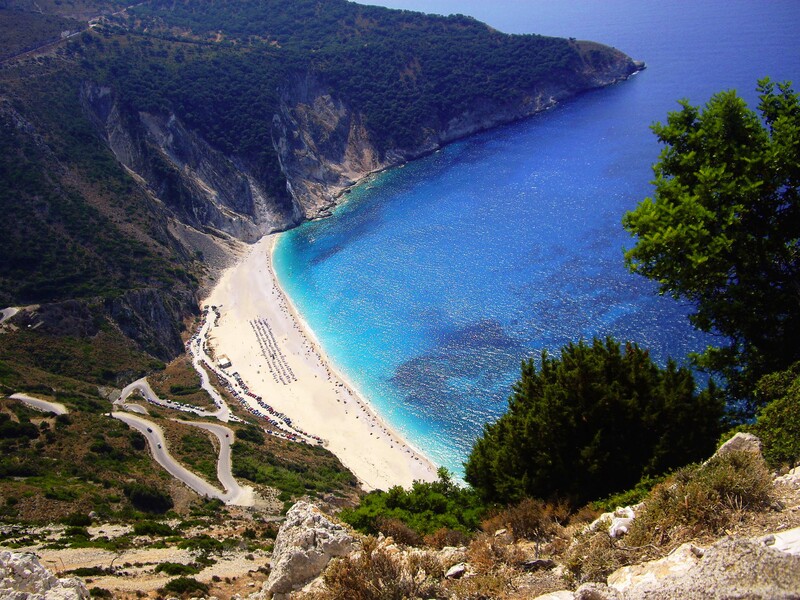 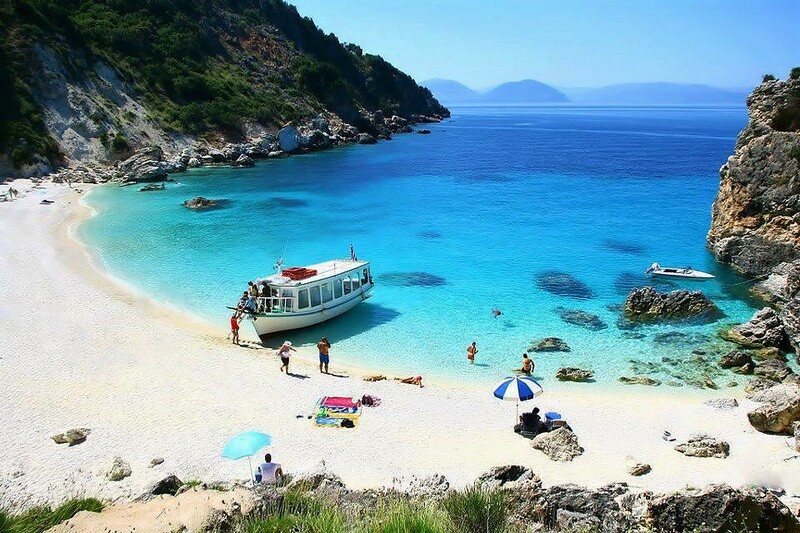 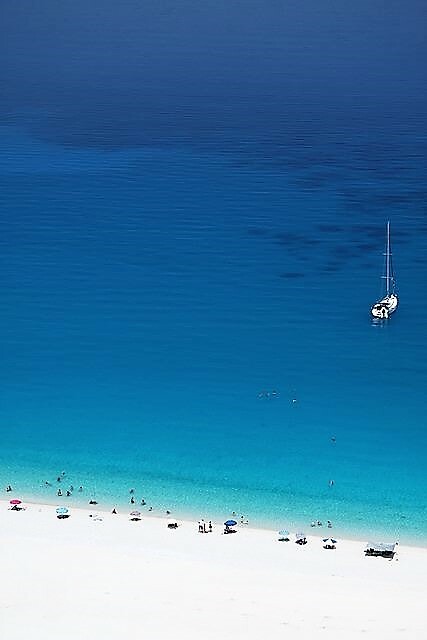 f)Lefkas & the close islands: Lefkas (south bays), Lefkas islands (Meganisi, Skorpios etc), Ithaca (Vathy & Kioni), Fiskardo (Kefallonia), Atokos, Kalamos. 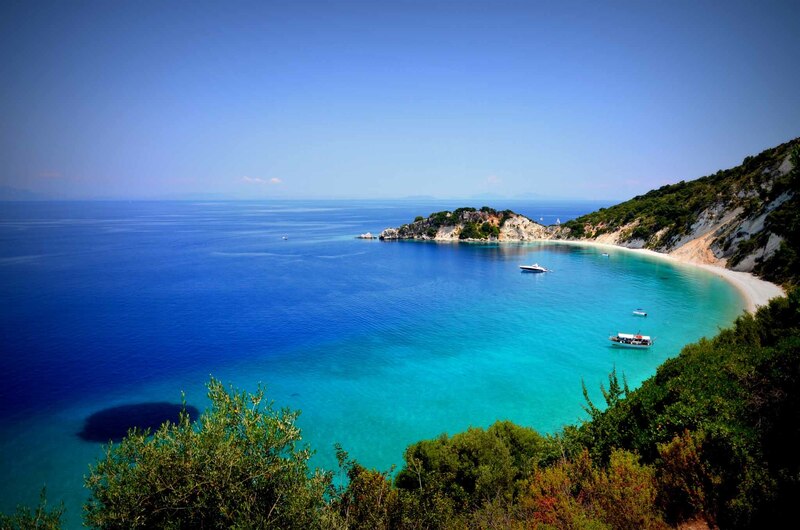 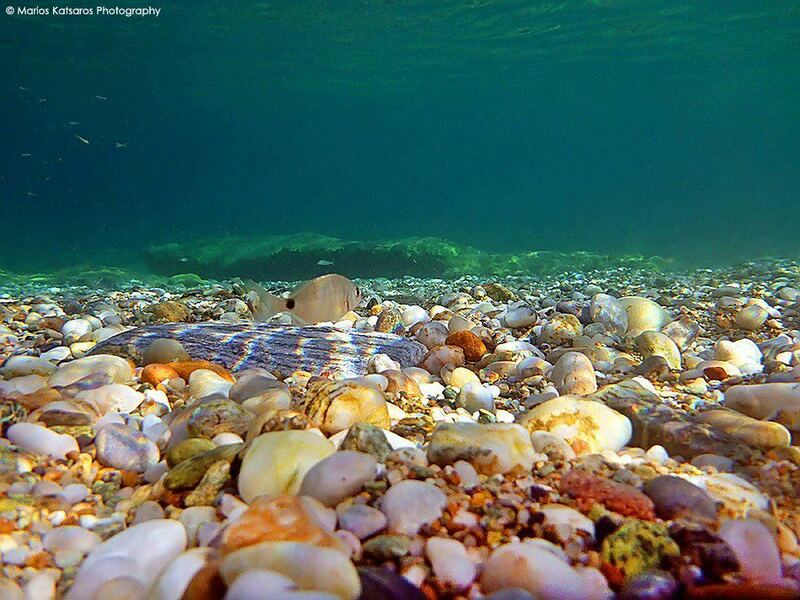 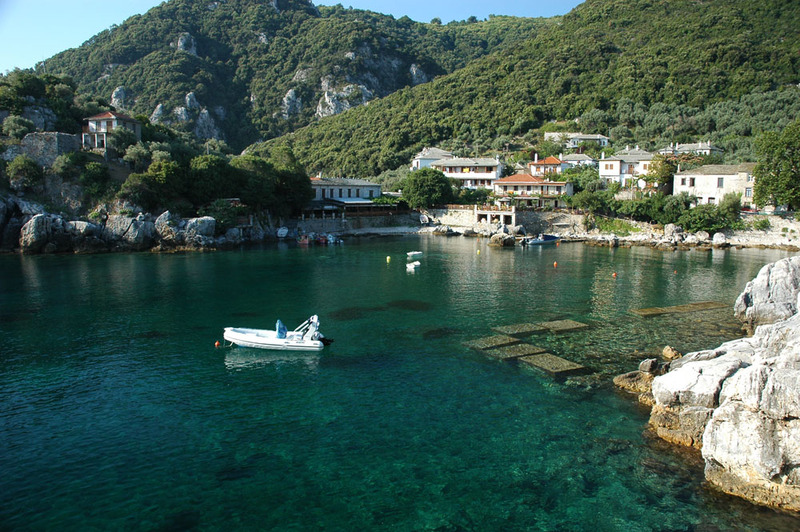 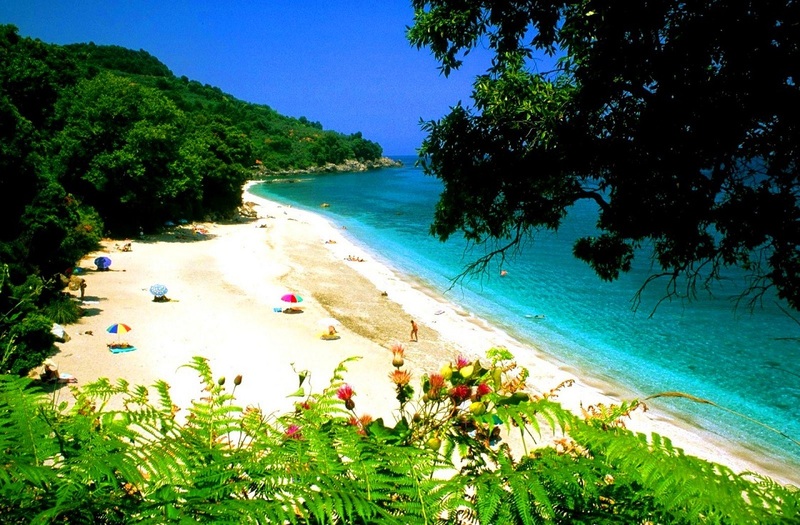 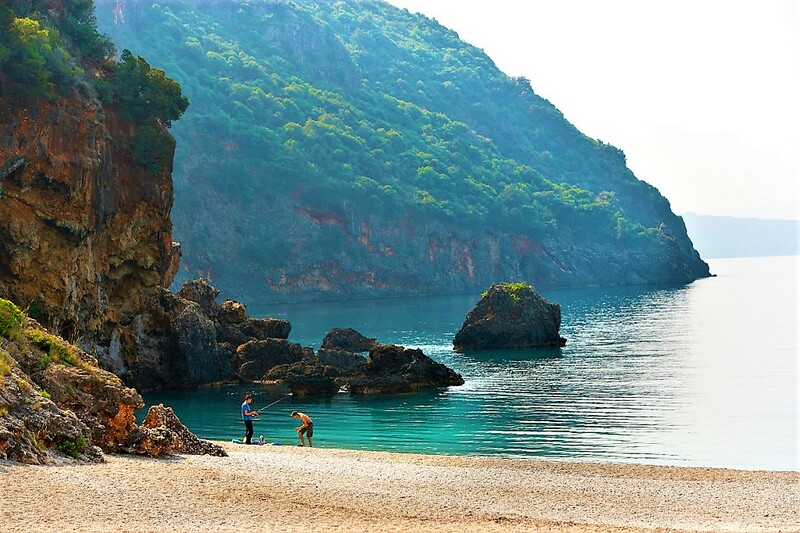 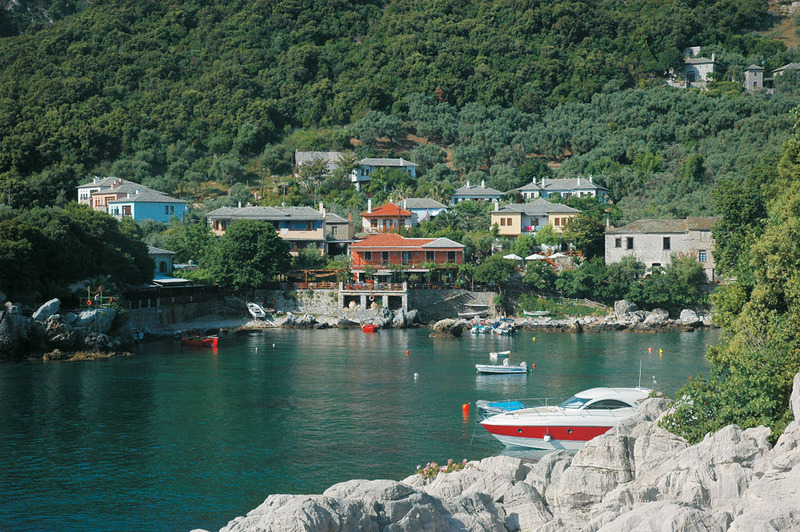 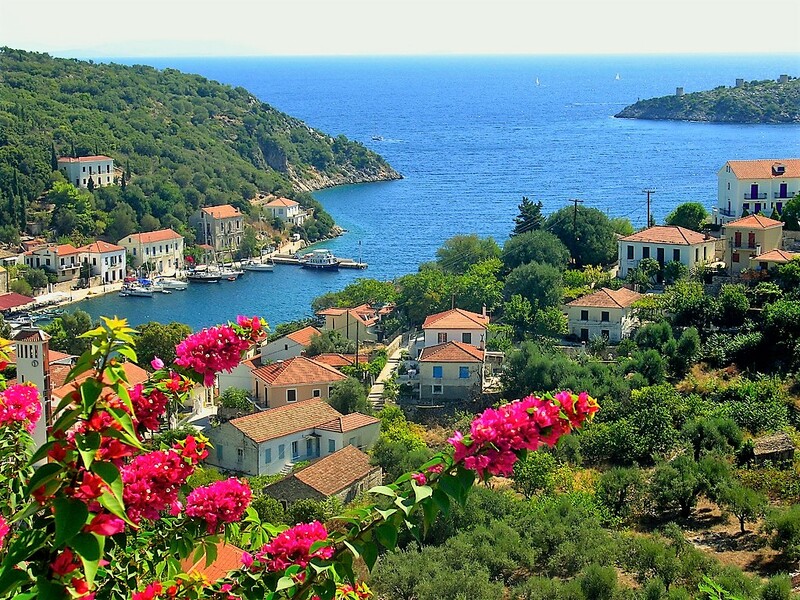 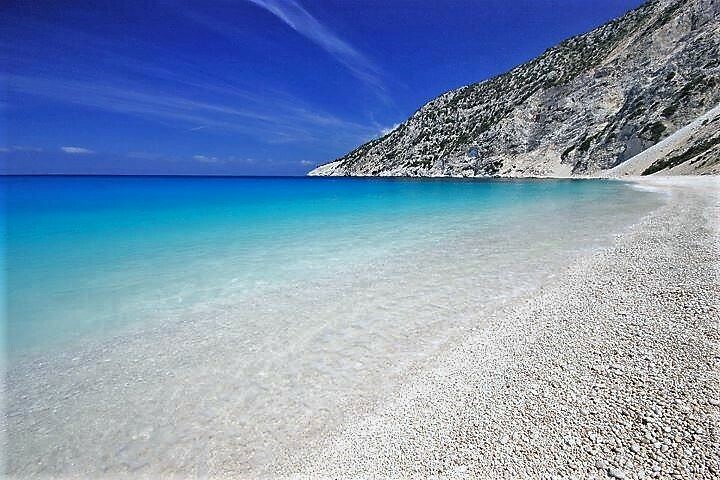 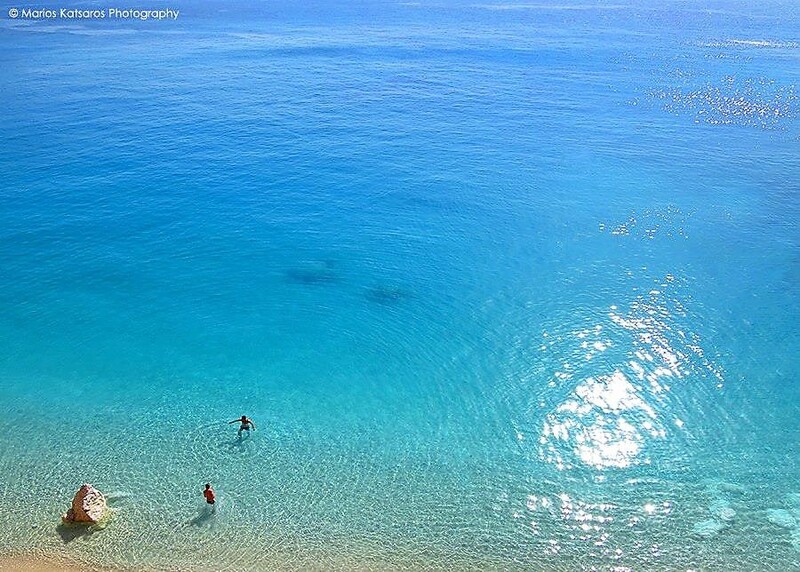 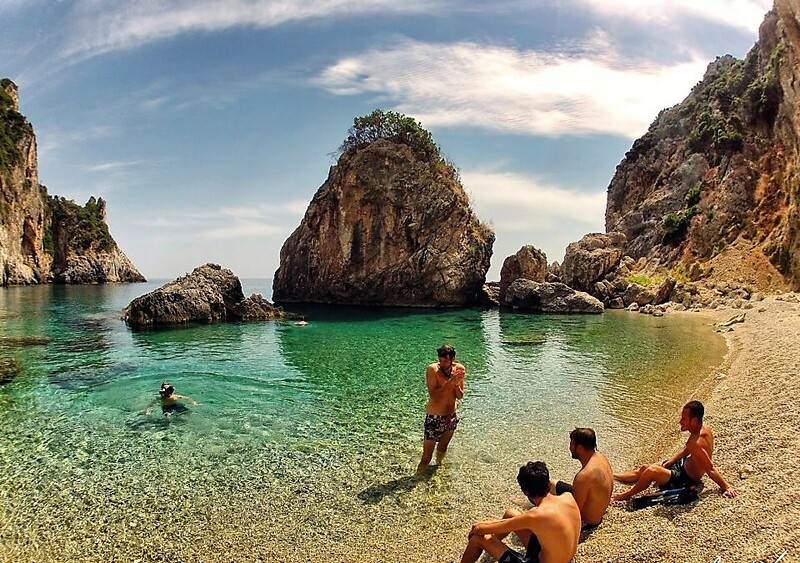 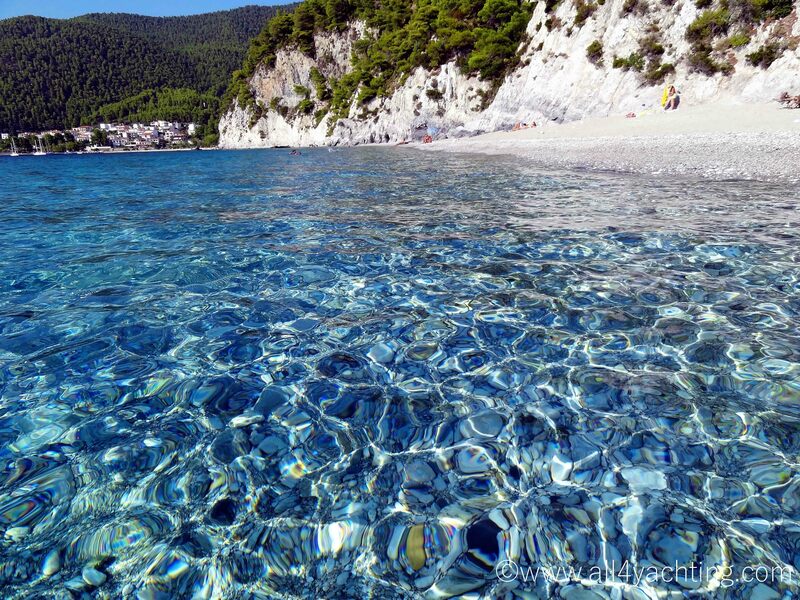 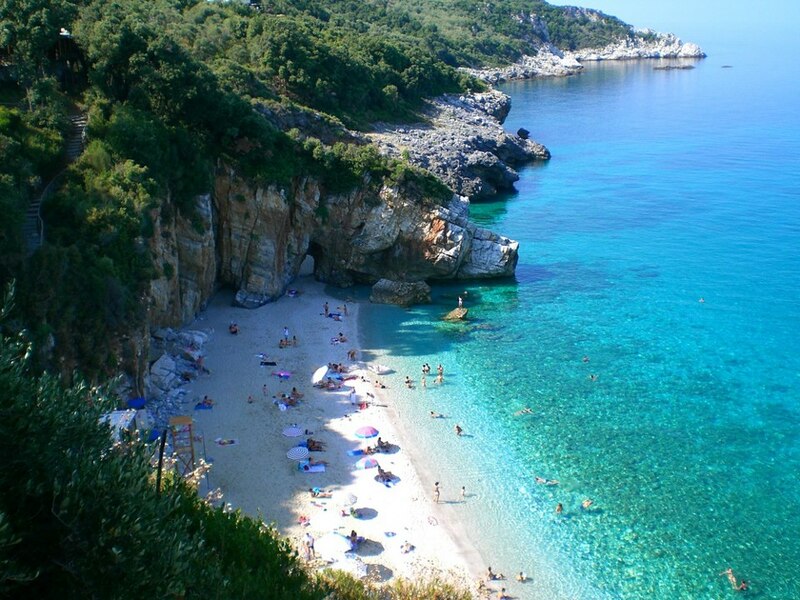 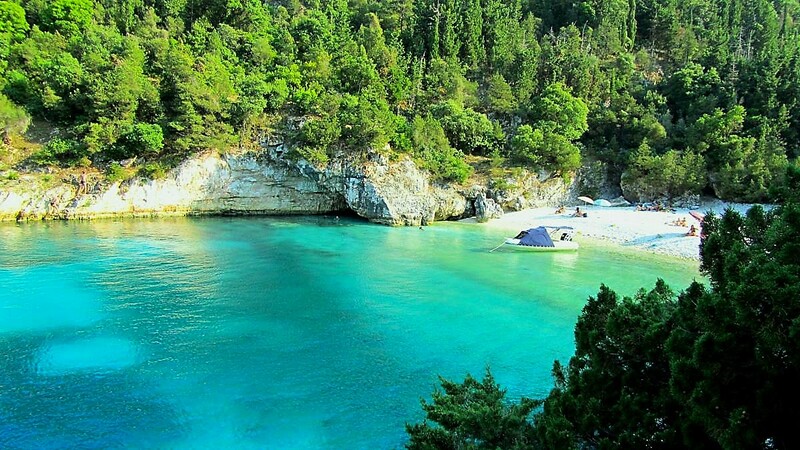 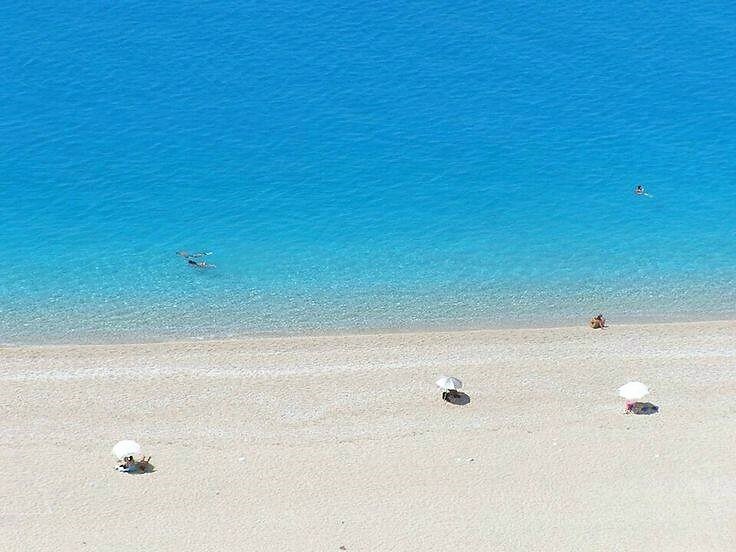 g)North of Lefkas: Lefkas islands (Meganisi, Skorpios etc), Paxi-Antipaxi, Corfu, Sivota (Thesprotia) & Parga. 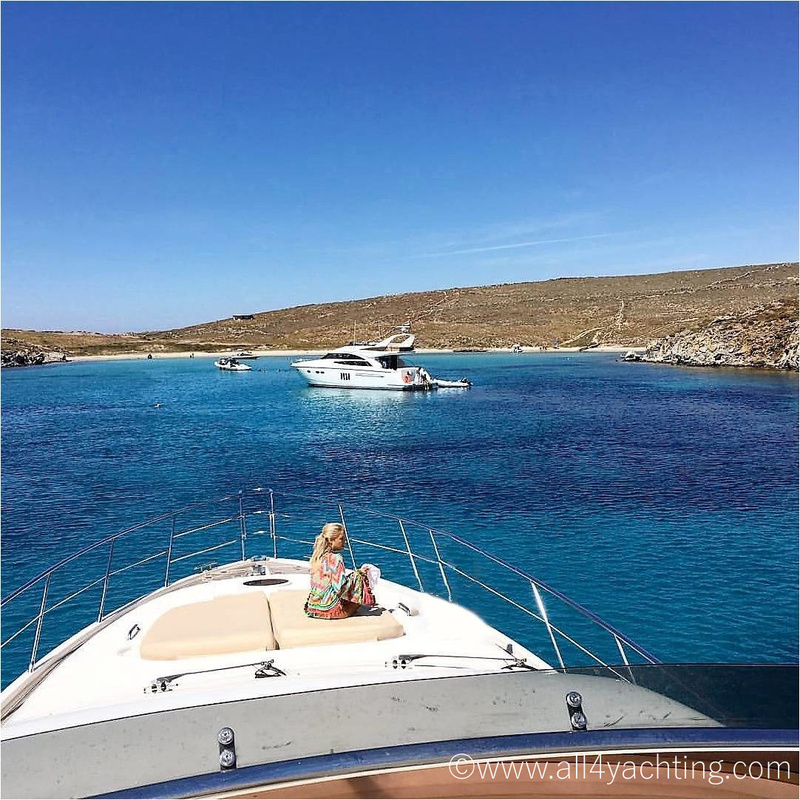 There are two types of motor yachts: a displacement motor yacht gives smooth and quiet cruising when you want to take your time between ports. 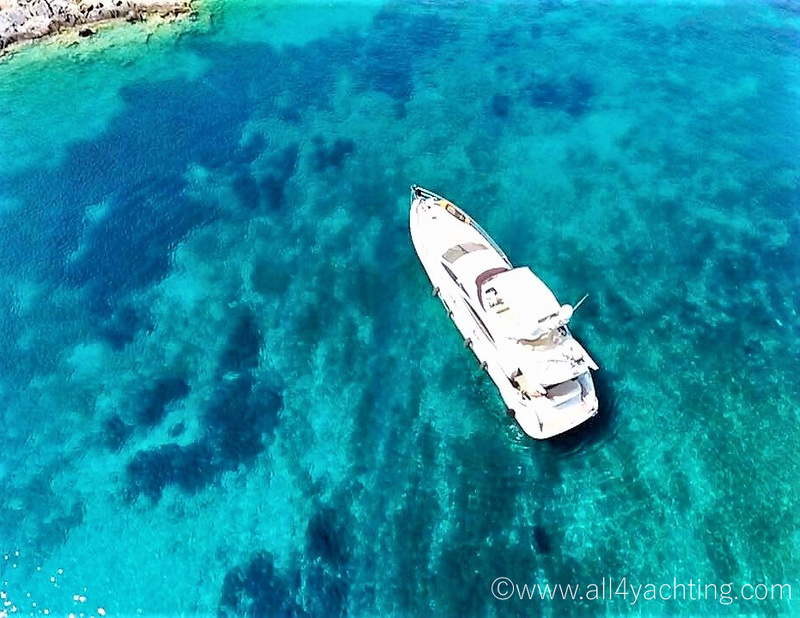 When you would rather spend time at anchor, a planning motor yacht will get you to your chosen destinations as fast as possible. 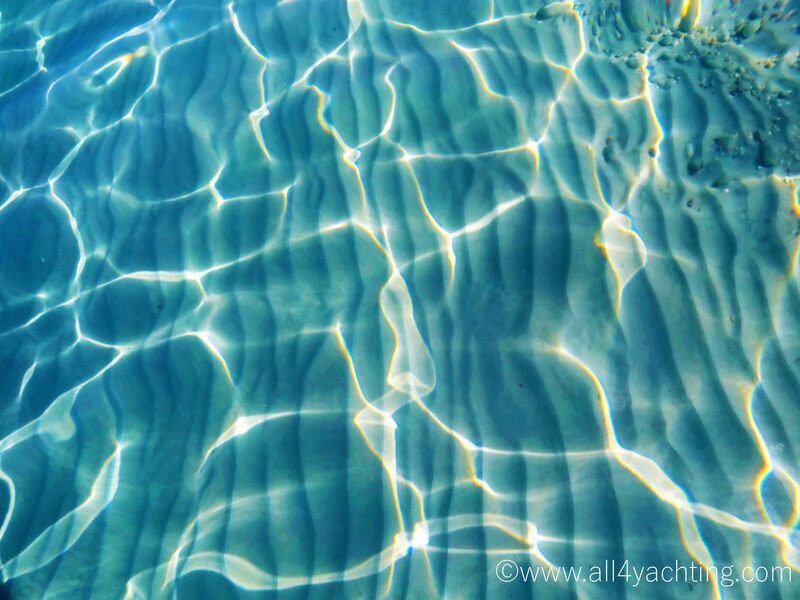 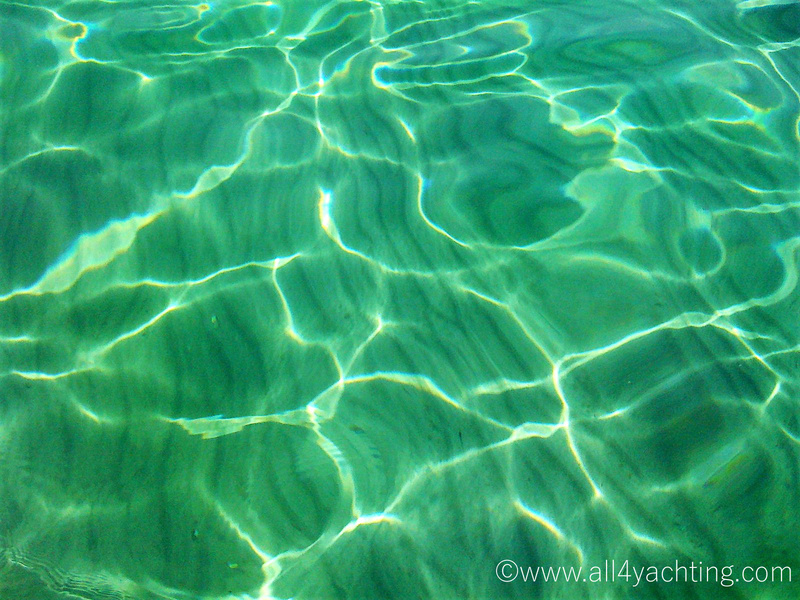 A sailing yacht moves smoothly and almost silently through the water, with an exhilarating response to the wind. 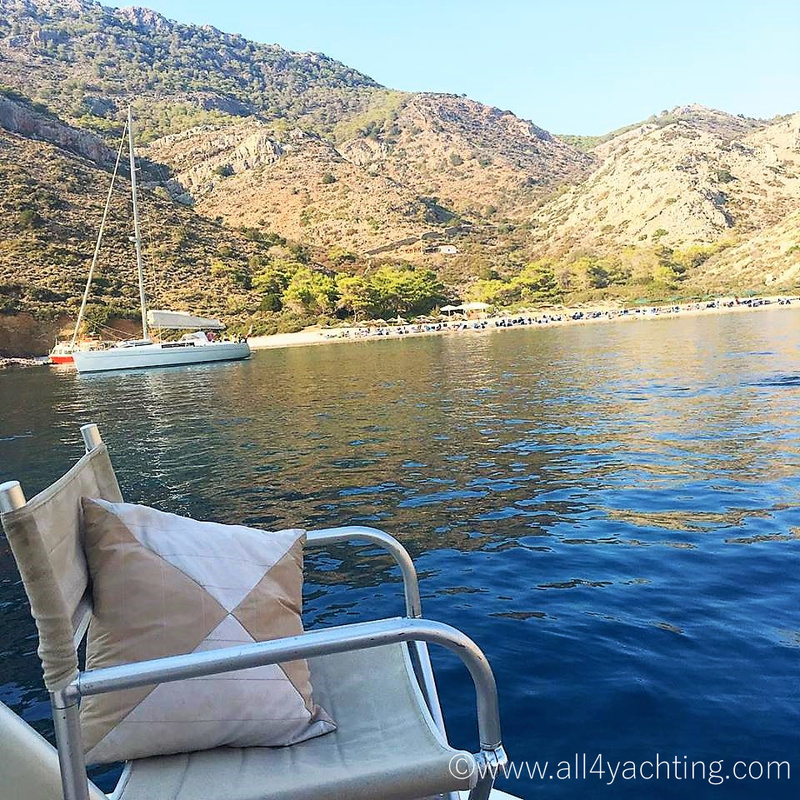 A motor sailer gives you the best of both worlds, with a more spacious interior, more open-air deck area and larger engines for cruising under power, than the sailing yachts. 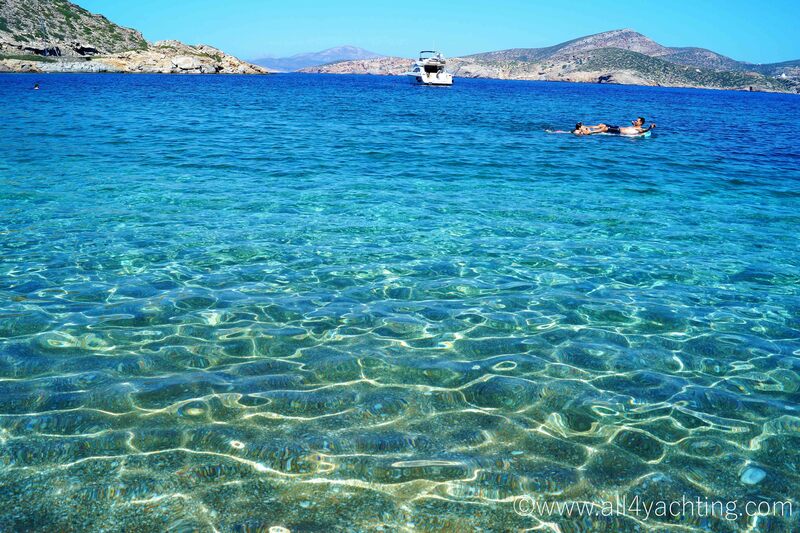 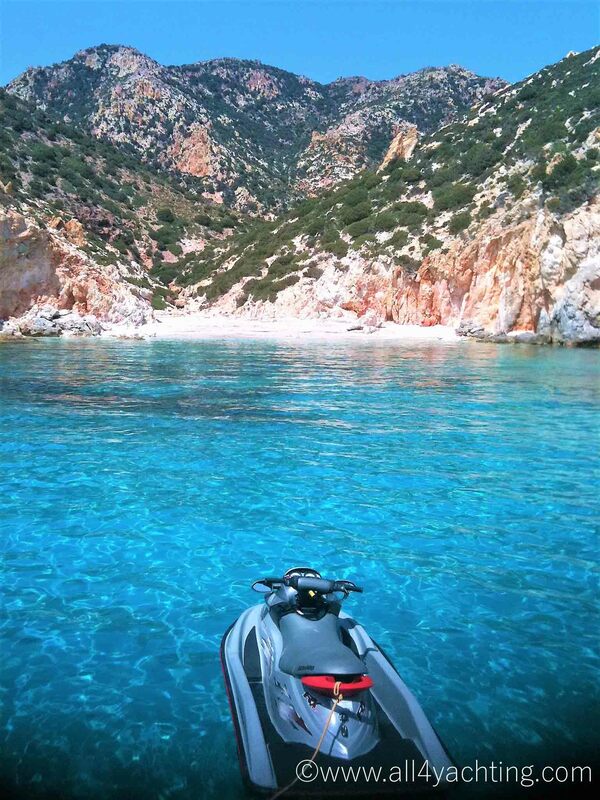 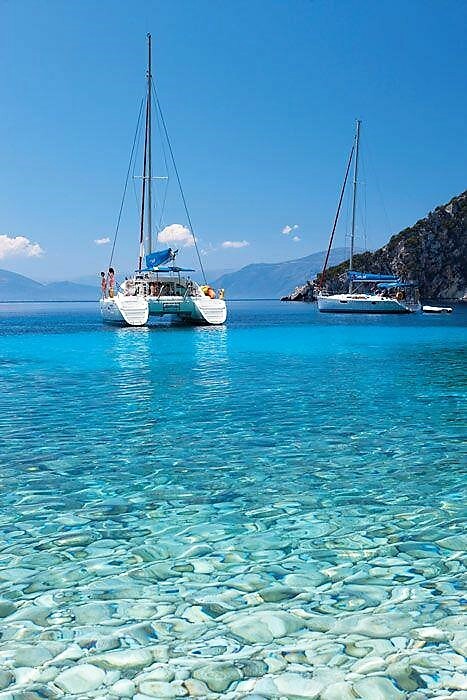 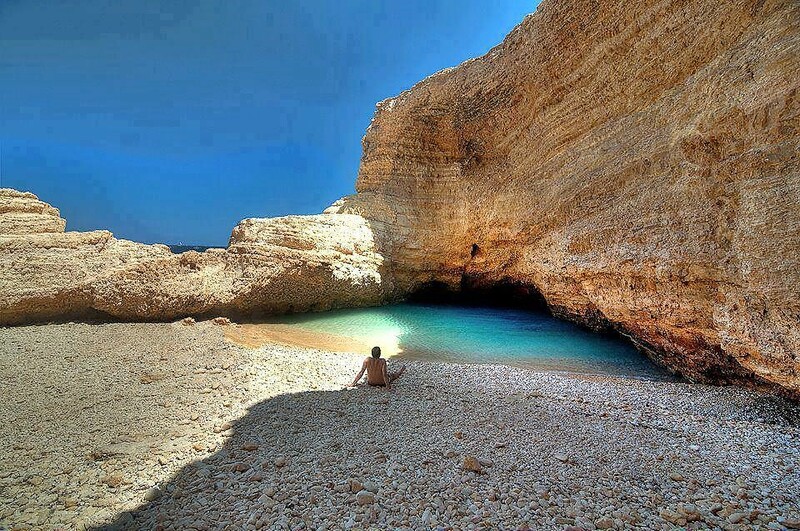 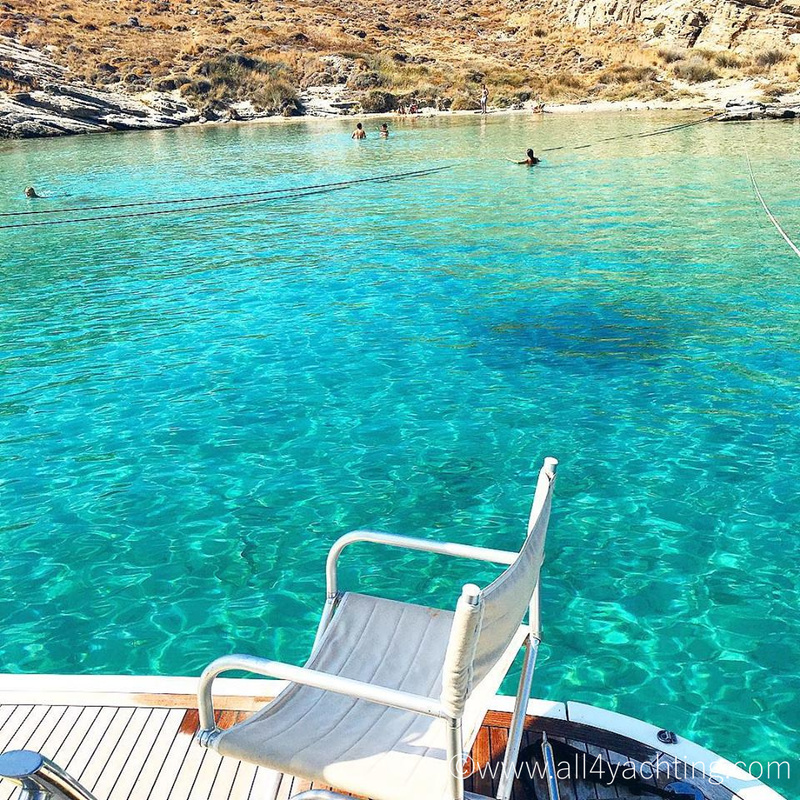 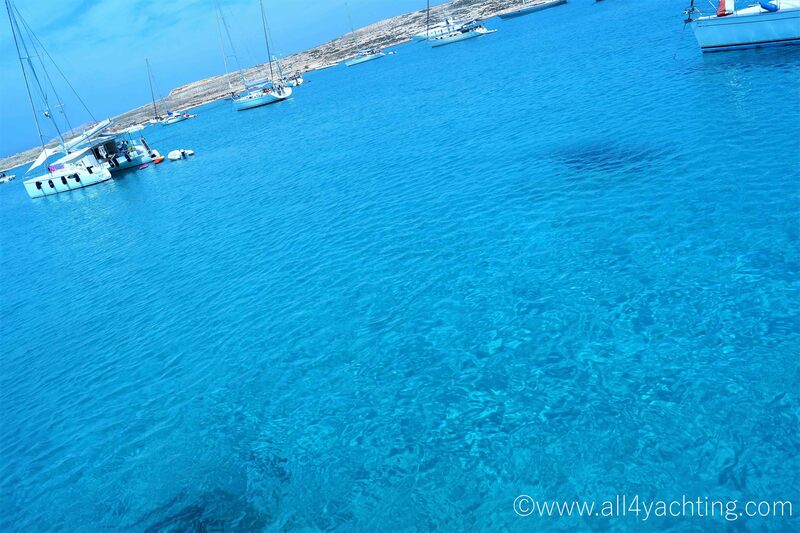 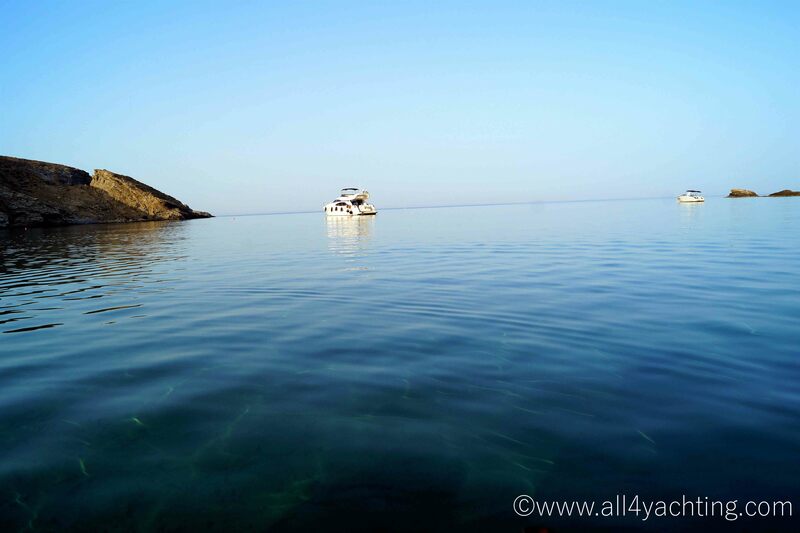 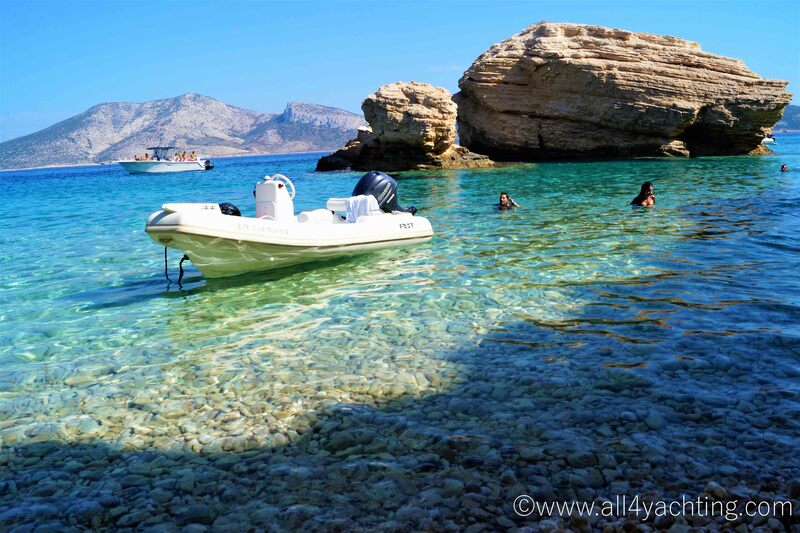 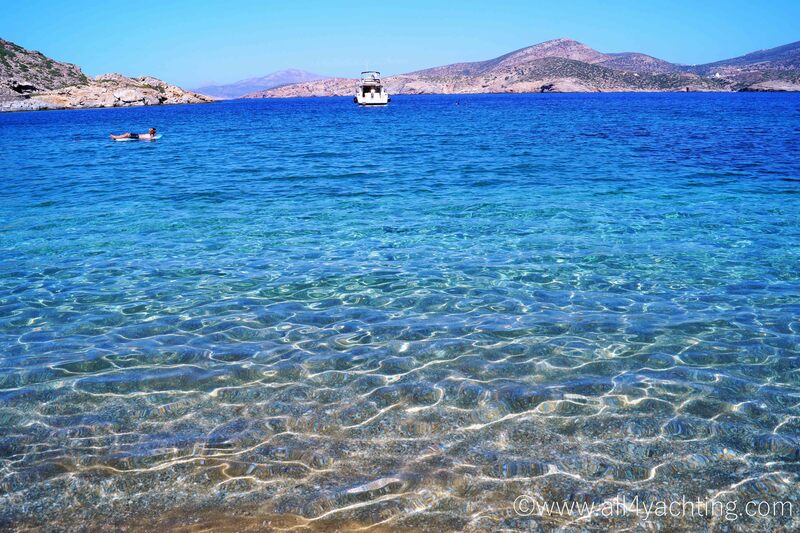 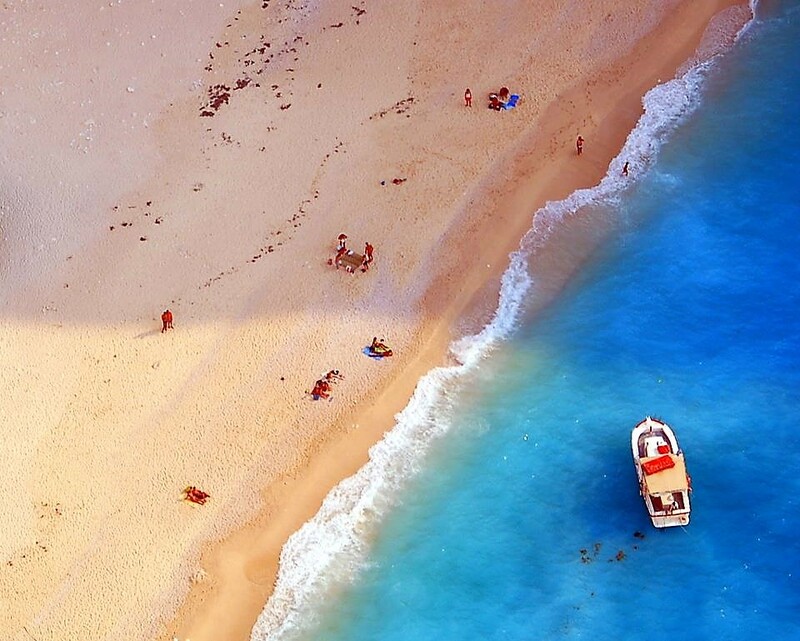 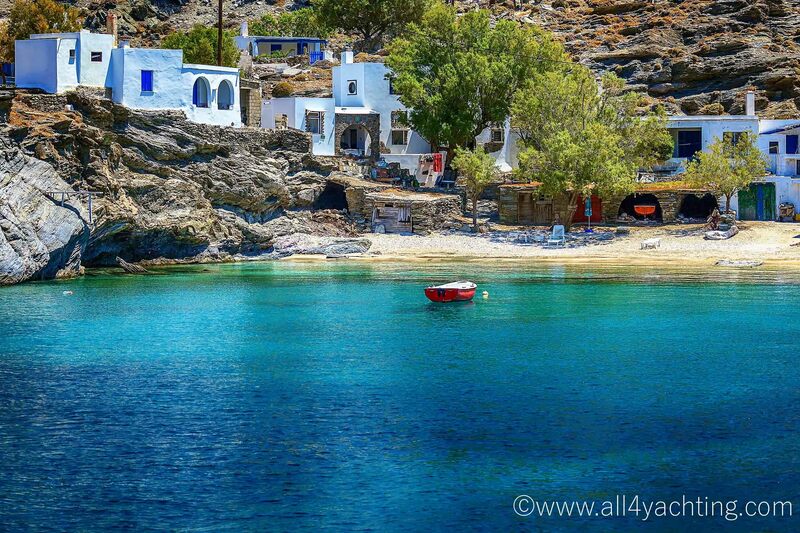 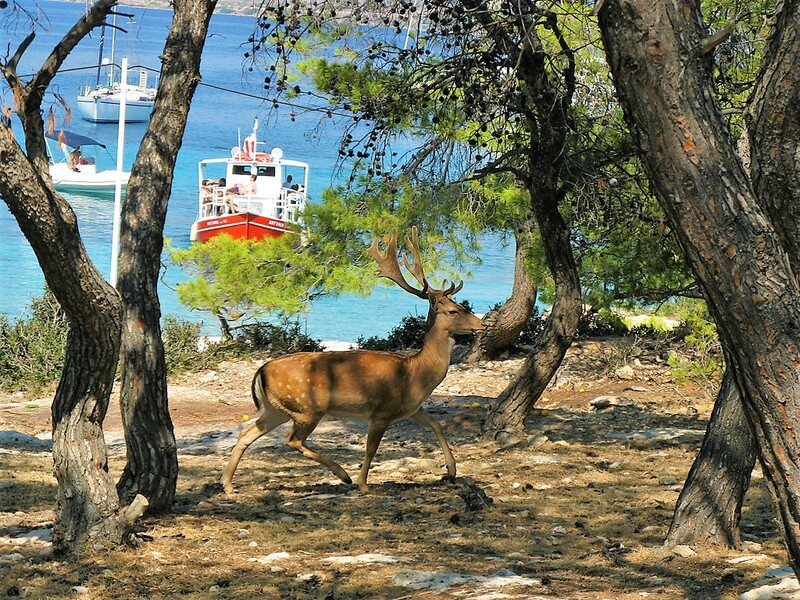 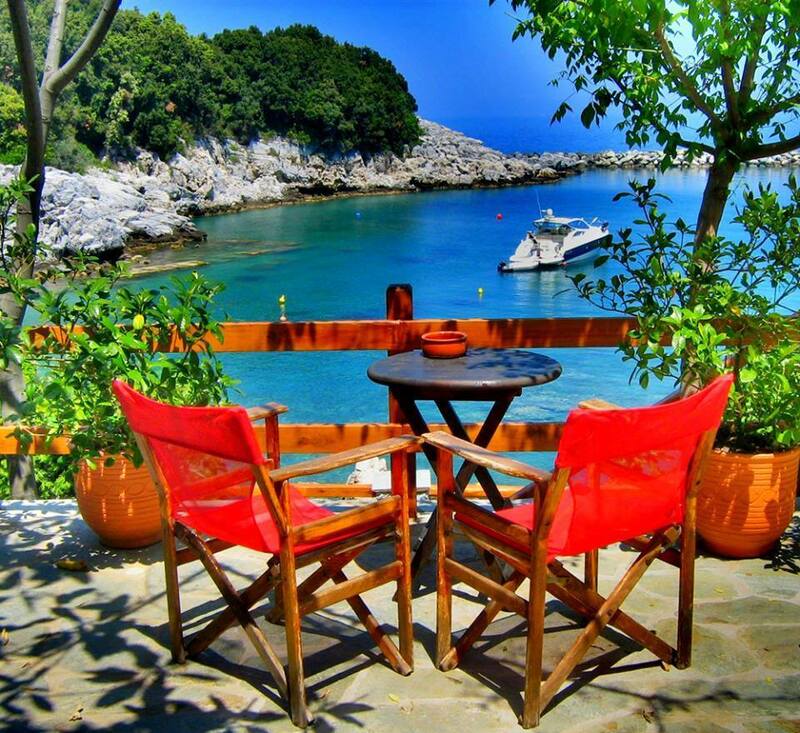 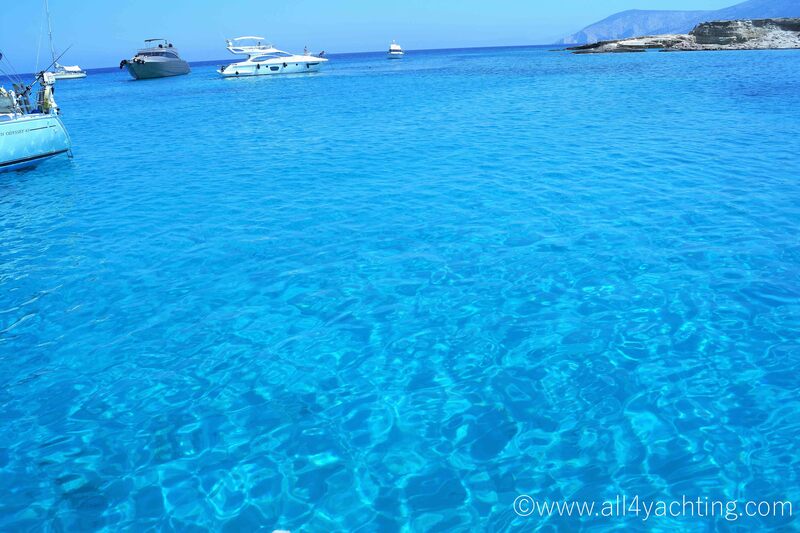 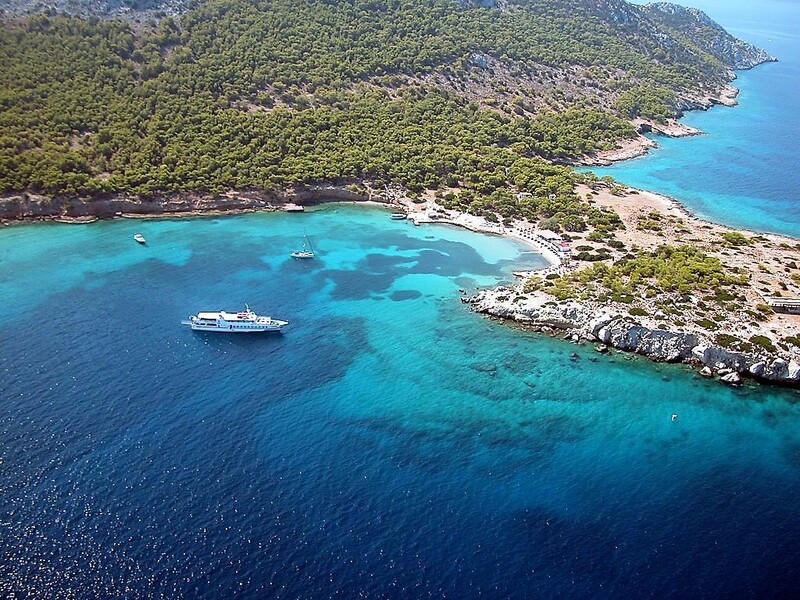 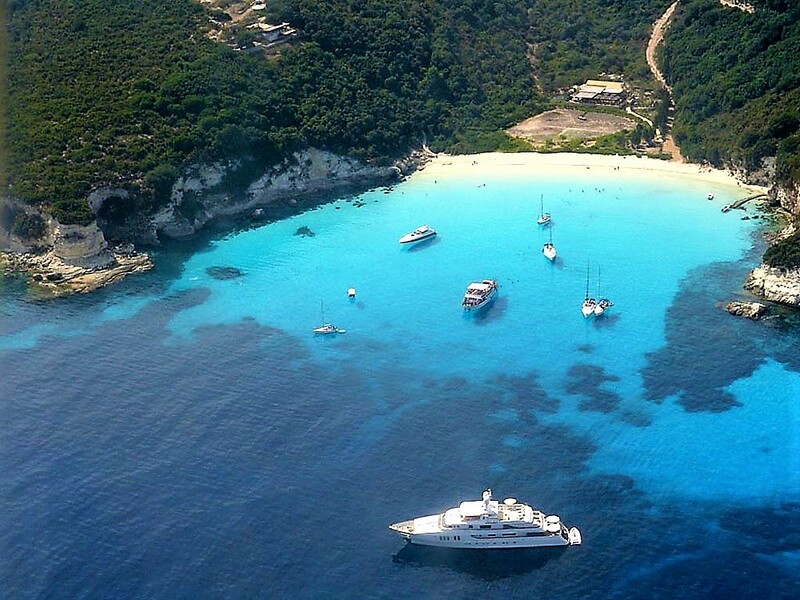 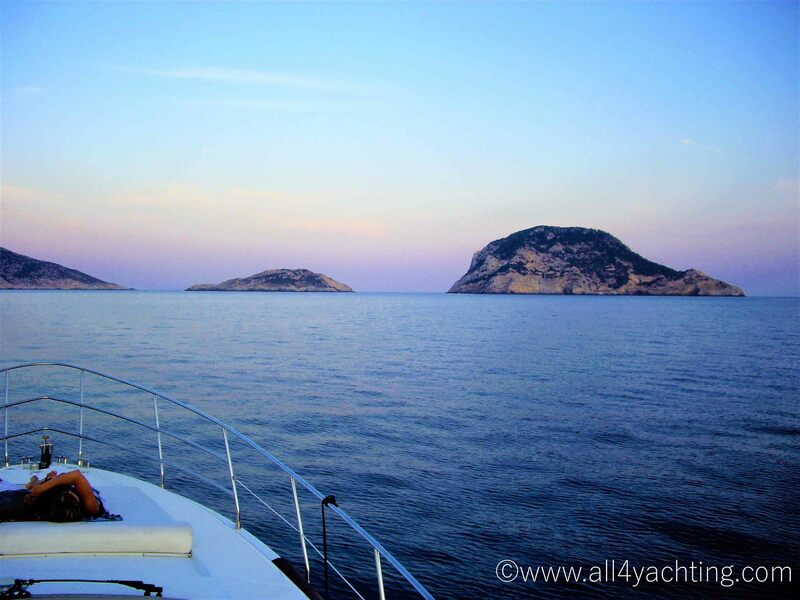 Choose your cruising ground - Greek Islands. 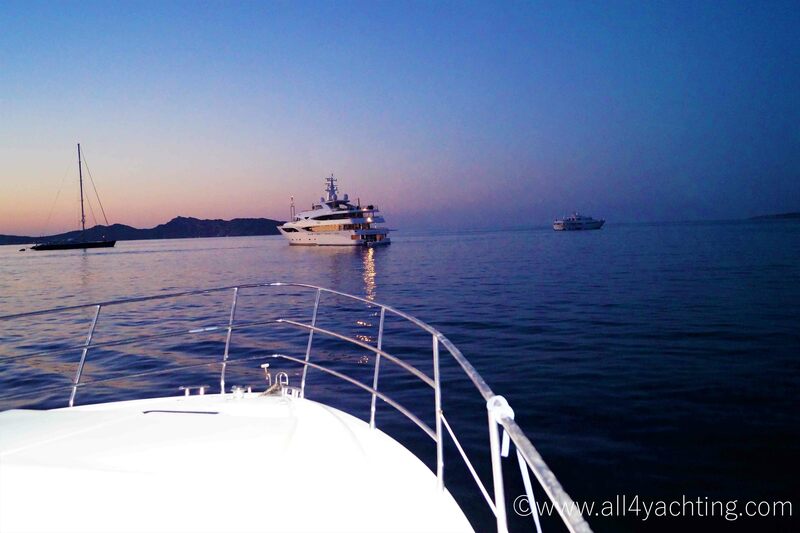 Considering availability and the number of guests you wish to invite, select a specific yacht in your chosen class. 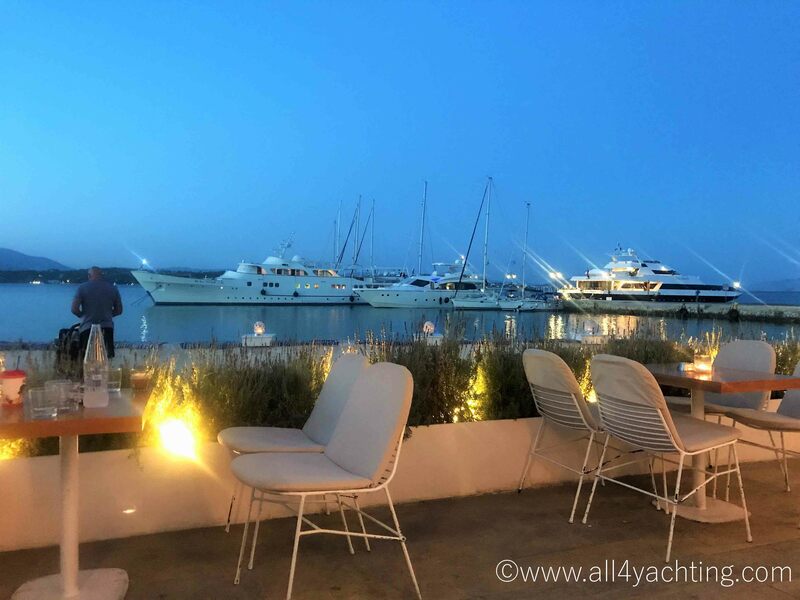 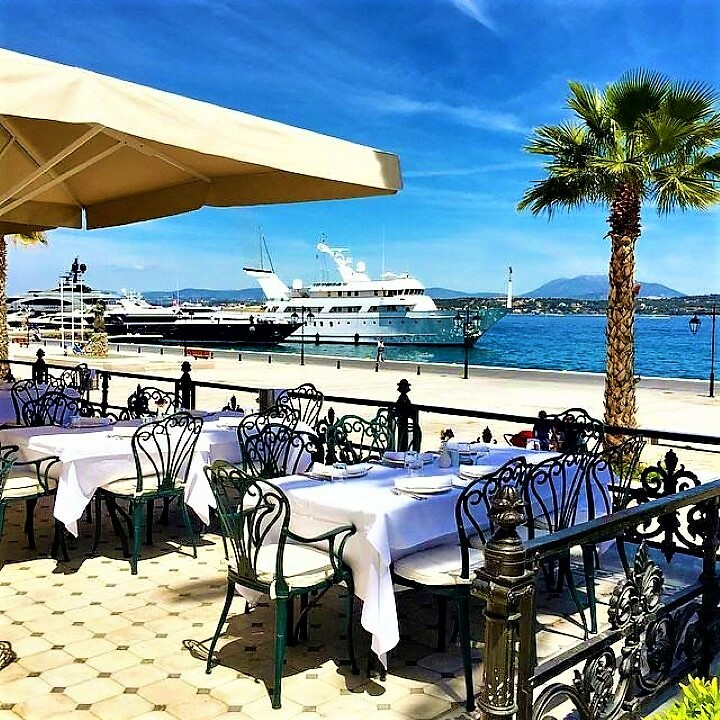 When you are ready to confirm the charter, a Charter Agreement (HYBA or MYBA) will be sent to you with a request for a deposit to secure the booking. 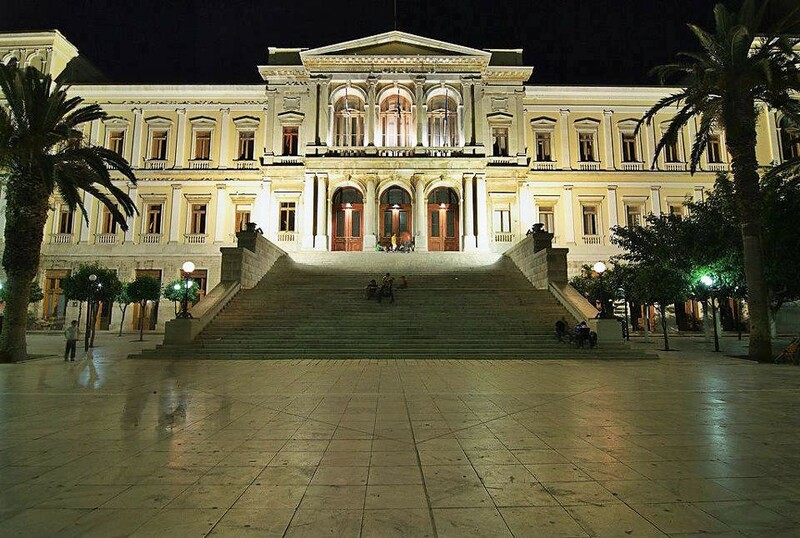 The Charter Agreement defines the terms and conditions, obligations and rights of each party. 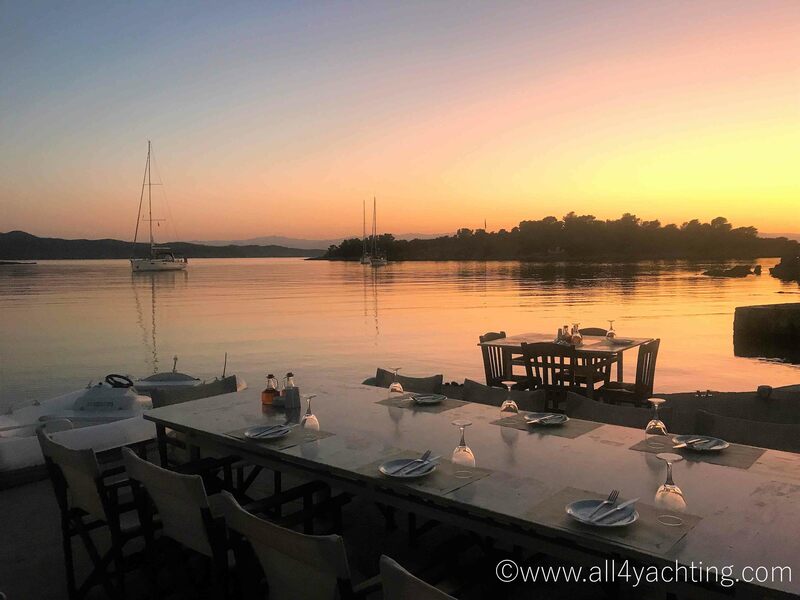 Before your charter you will be sent a detailed questionnaire about your preferences in food and drink and any special dietary requirements, your flight details, celebrations and anniversaries that will take place during your charter, your voyage itinerary, and any requests for other land services such as car rental, private jet transfers, hotel reservations, guided tours, etc. 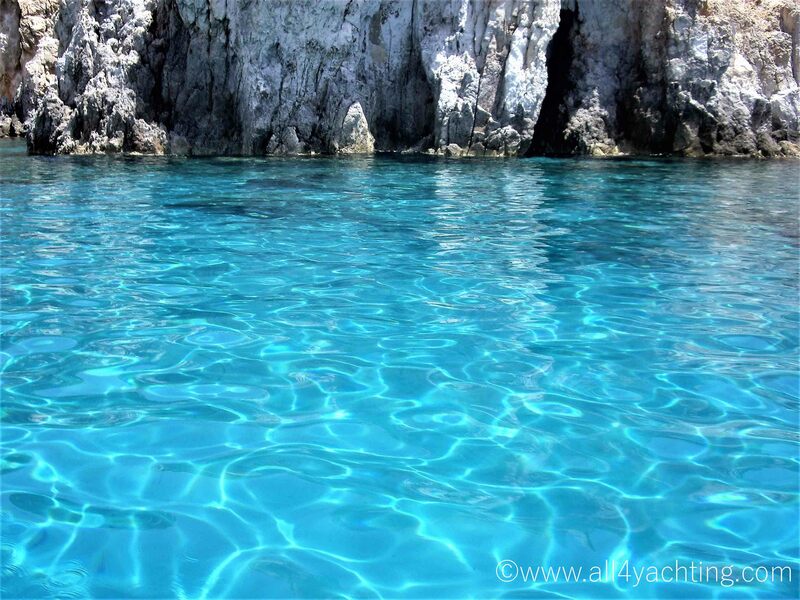 The charter fee includes the hire and insurance of the yacht and the allocation of qualified crew. 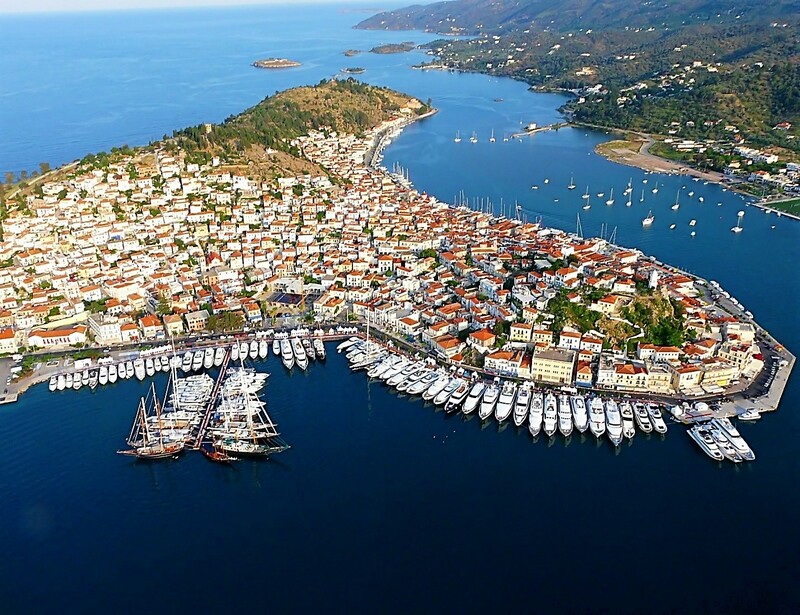 It does not include V.A.T., provisioning, fuel charges for the yacht and tenders, electronic communications, canal fees, harbour dues, local taxes and marina fees outside Greek waters, or private marinas within Greece. 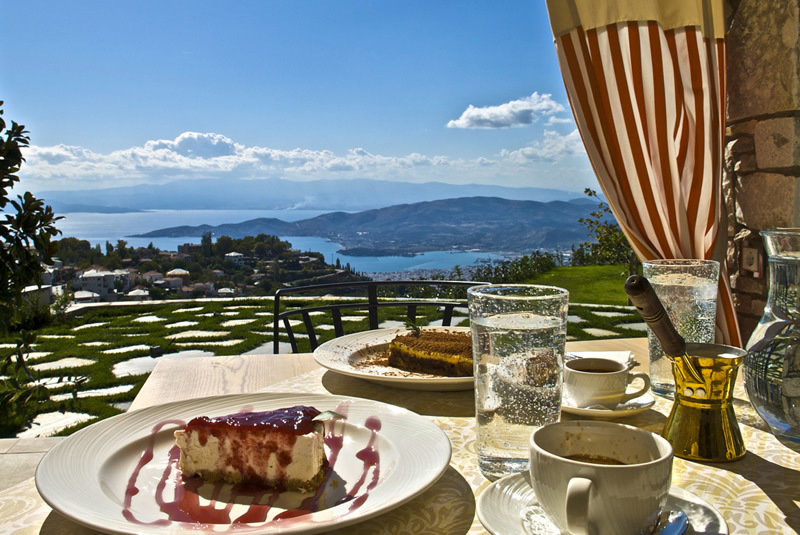 The Advance Provisioning Allowance (APA) is designed to cover these expenses. 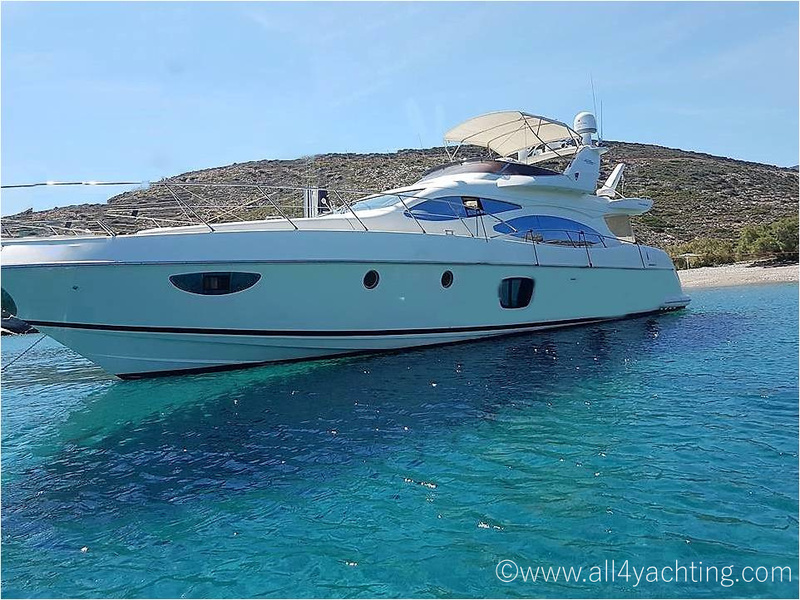 Depending on the number of guests, type of yacht and duration of charter, this is between 25% and 30% of the total charter fee. 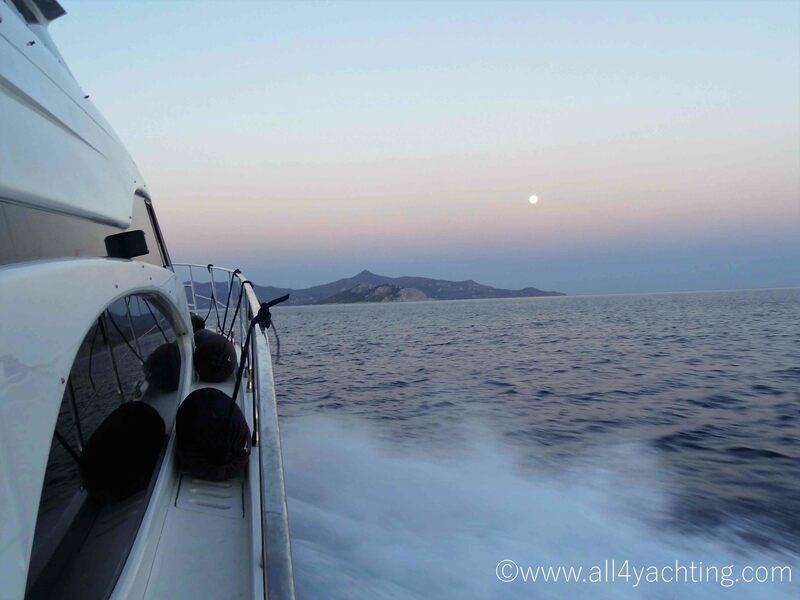 The captain will hold receipts for all expenses, and prepare accounts for final settlement at the end of the charter. 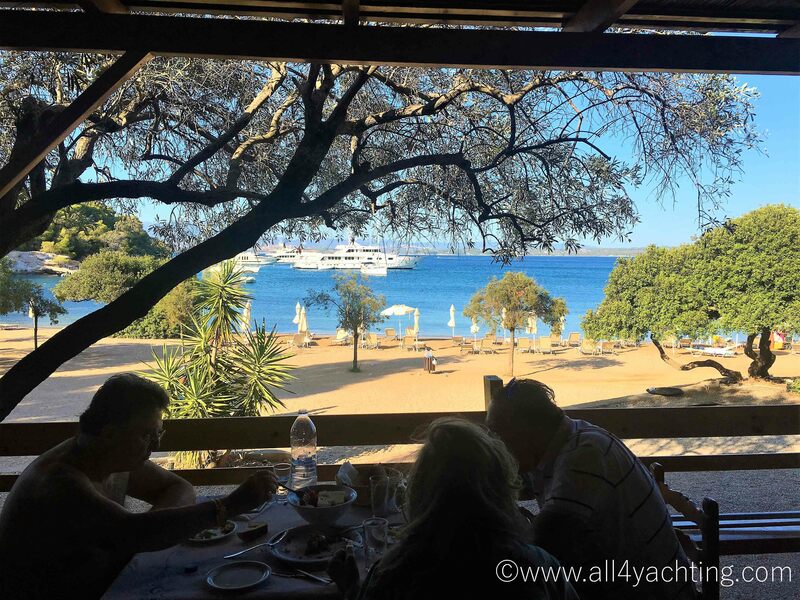 If embarkation and/or disembarkation takes place away from the yacht's home port, delivery/return fees and expenses will be charged. 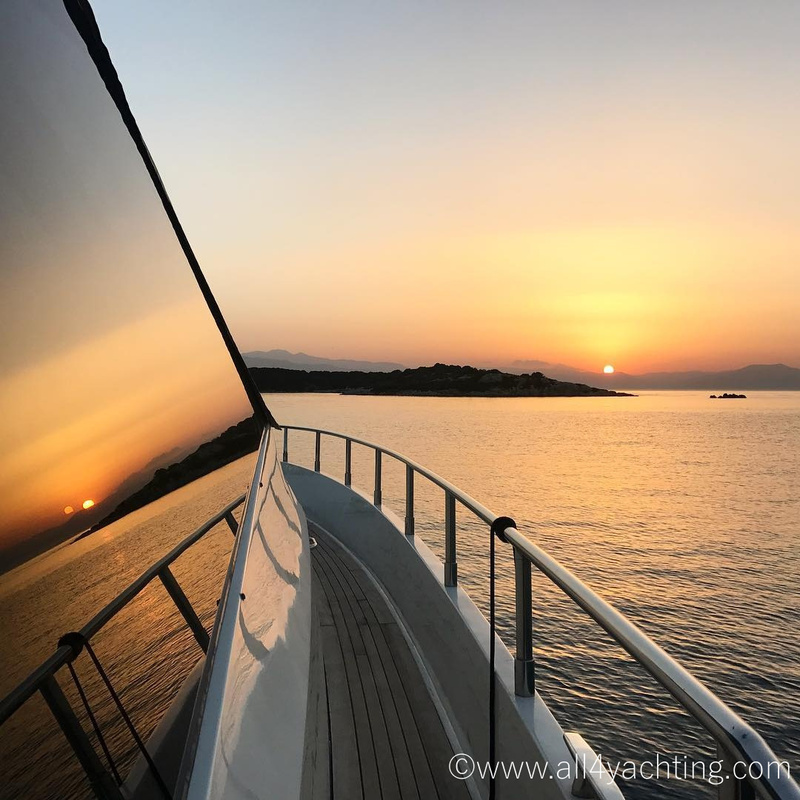 Crew gratuities are not obligatory, but are usually 5% to 15% of the total charter fee, upon the clients' complete discretion, depending on service and satisfaction.